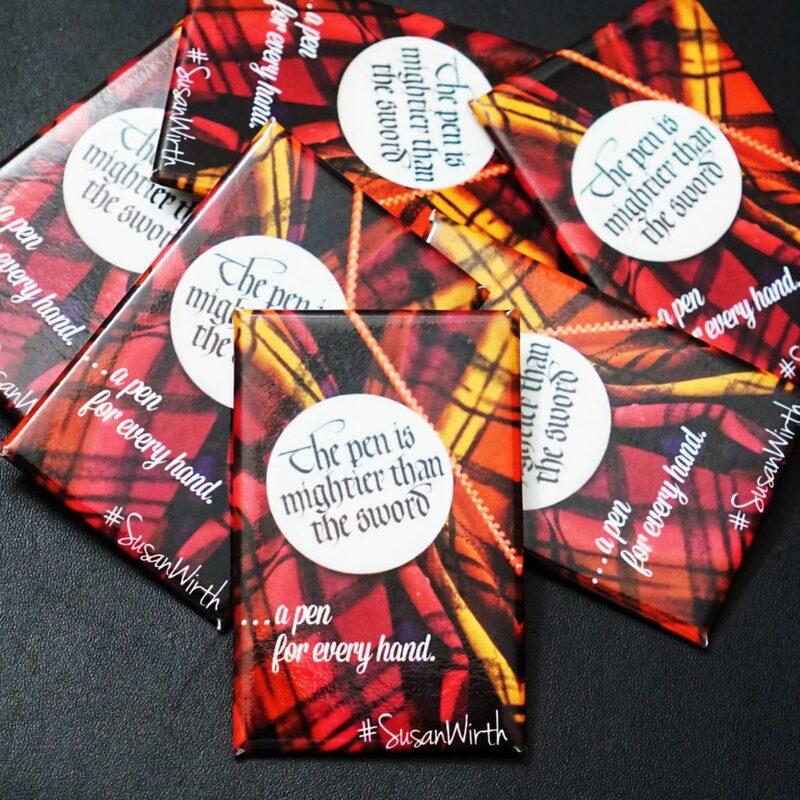 Hello pen friends and folk! 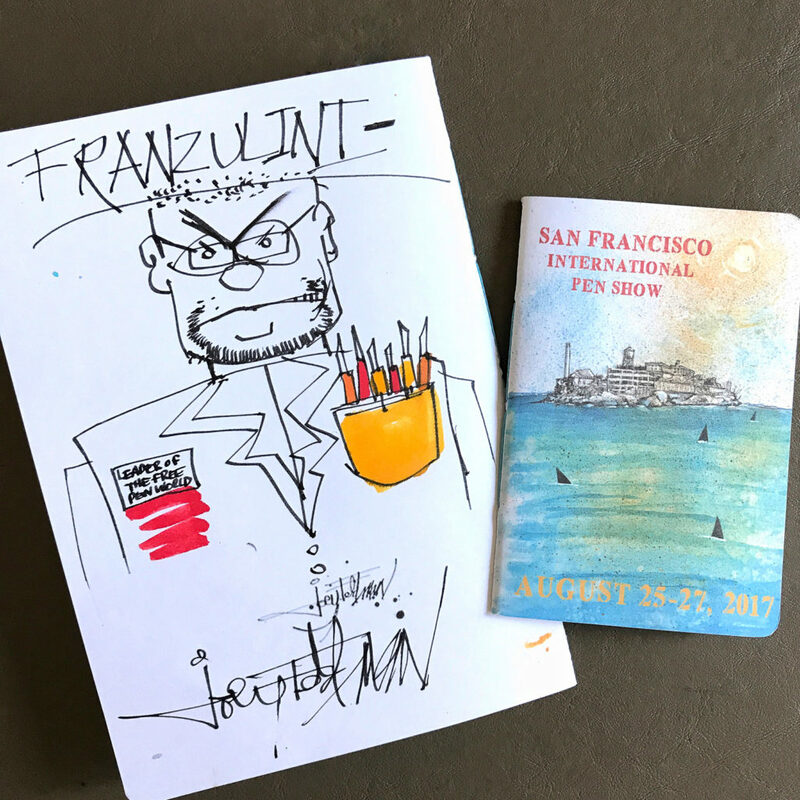 Franz here, and I’m writing a quick recap to highlight two great things that happened at the 2018 San Francisco Pen Show this past weekend of August 24 thru 26. That would be the Pay-It-Forward Project Table, and the Pen Dash Mixer hosted by Lisa Vanness. 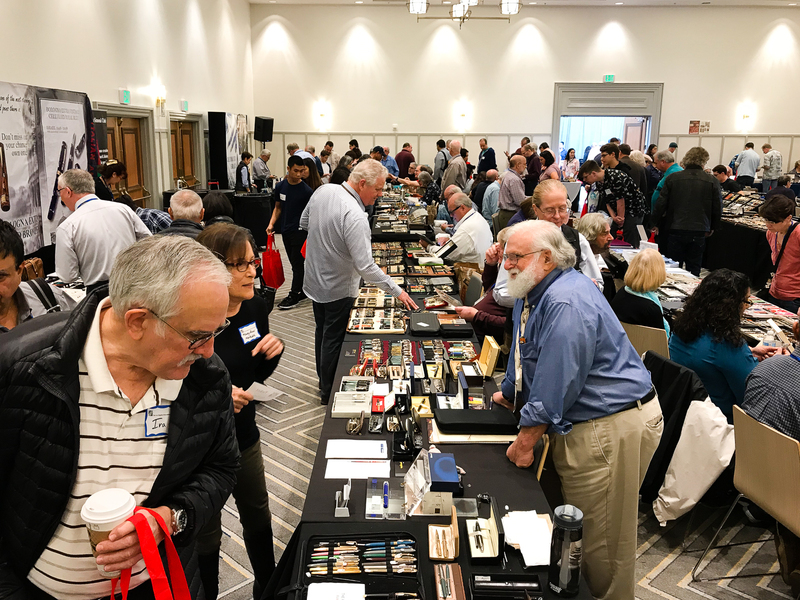 There were lots of events that happened at the show that I will definitely include in my lengthier annual SF Pen Show Report. But I really wanted to highlight these two before my pen show report comes out in the next couple of weeks. 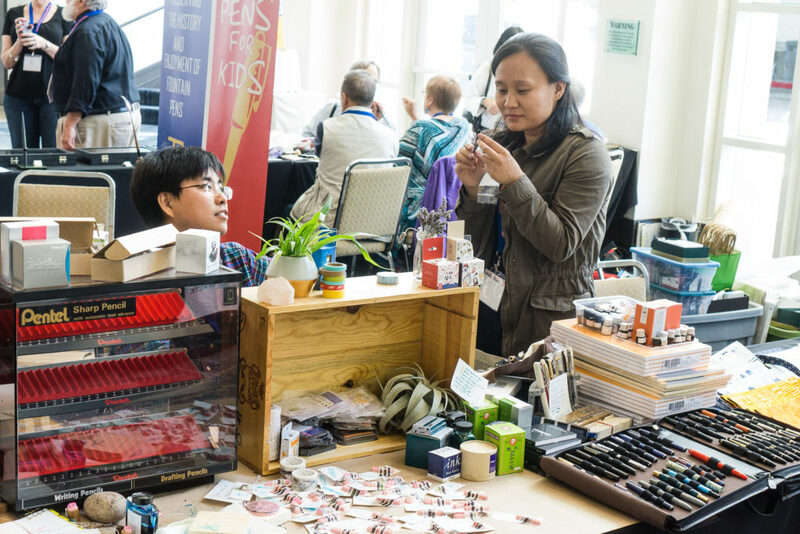 Before anything else, I would like to thank the San Francisco Pen Show organizers for allowing the Pay-It-Forward table, as well as the Pen Dash Mixer to happen at the show this year. 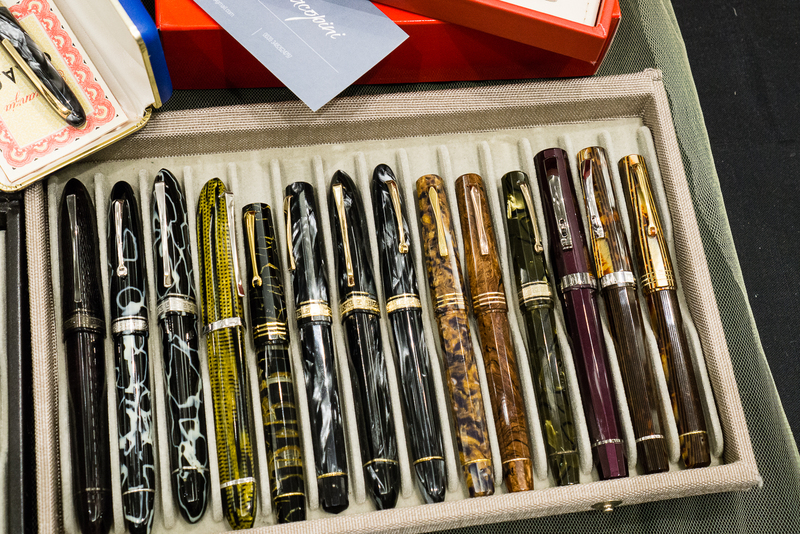 And also for continuing to have a bigger, and “funner” pen show each year! 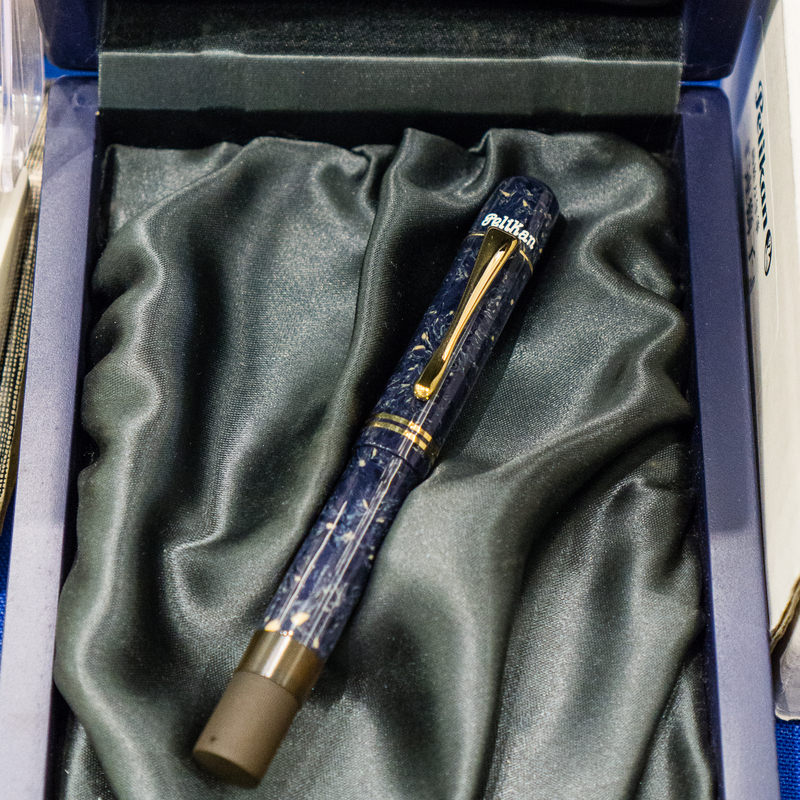 This was the second year that the Pay-It-Forward (PIF) table made an appearance at the SF Pen Show. Even if we were not able to do a blog post, or even a social media post asking for physical and monetary donations, a LOT of generous people have donated to the table this year. Actually, some friends who weren’t even at the show and some out-of-state messaged me for a shipping address and sent oodles and oodles of pens, ink samples, and other stationery items. To all of you who have donated, you know who you are. 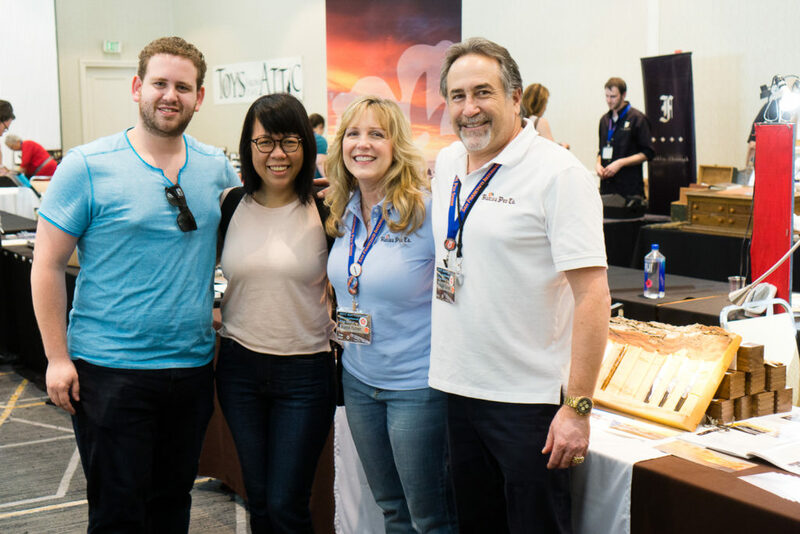 A VERY BIG THANK YOU from myself, the Pay-It-Forward Project team, and the San Francisco Pen Show!!! 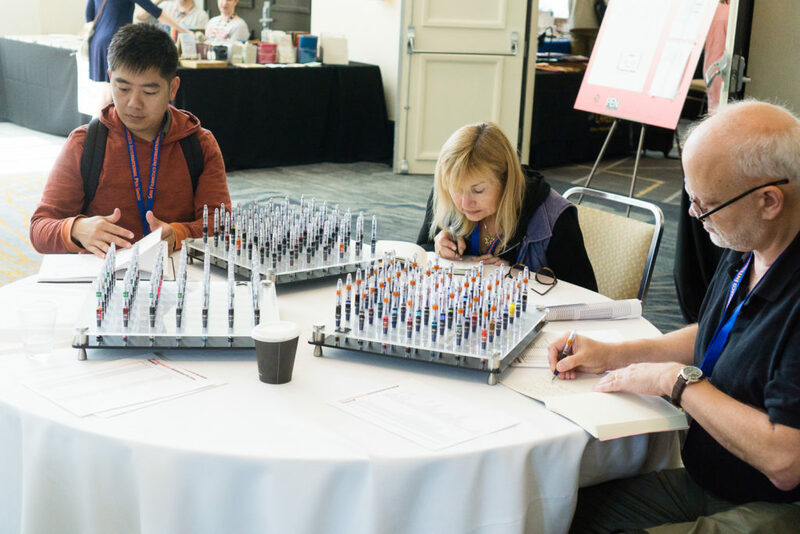 We are happy to report that we have given out 100 PIF Starter Kits (pen, ink sample, and paper) to beginners. 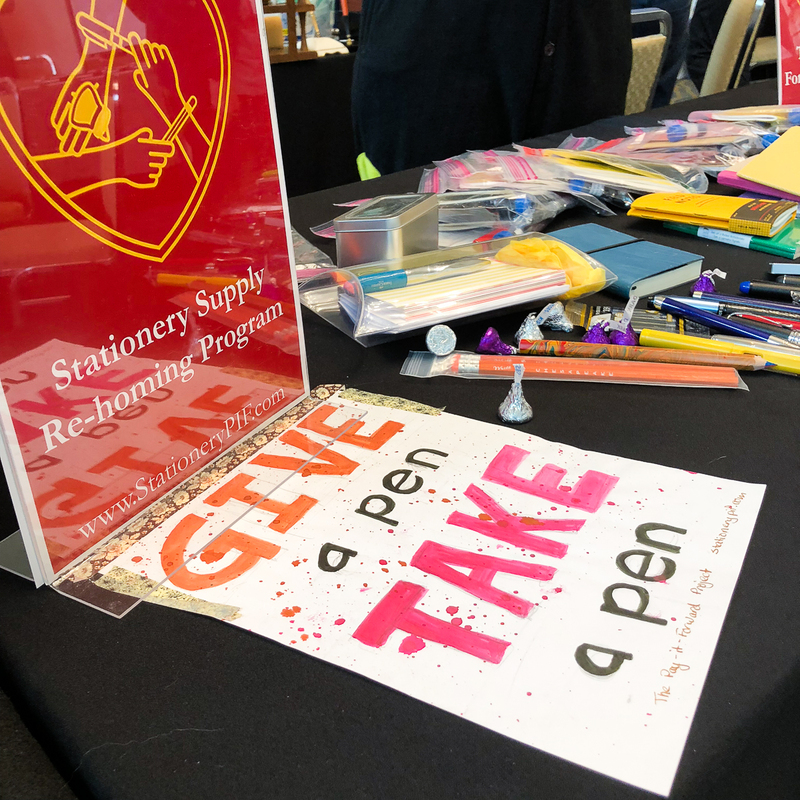 And more than 60 donated pens were given away via the Give a Pen, Take a Pen initiative. 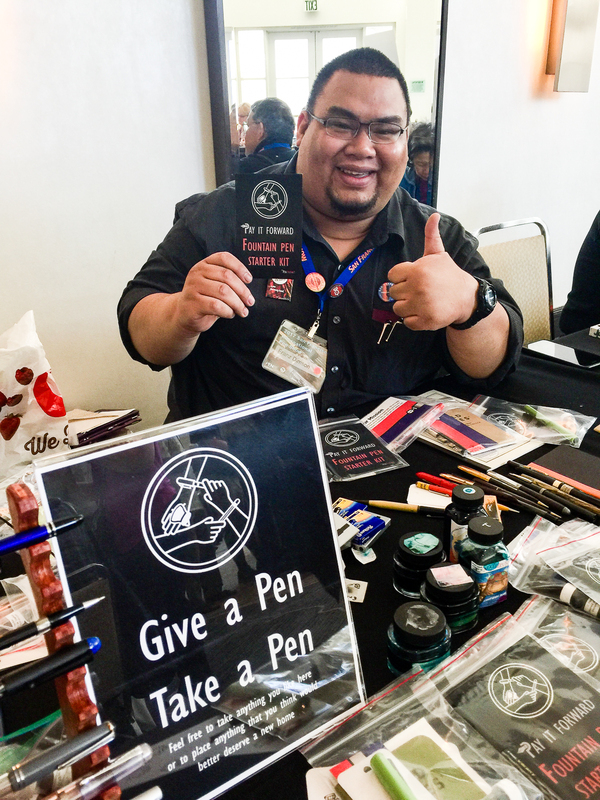 It is definitely heartwarming to see smiles of excited newbies when they realize that they can choose a pen for free and learn from our volunteers. Makes it all worth the effort to Pay It Forward. Now I’d be remiss if I did not mention this. 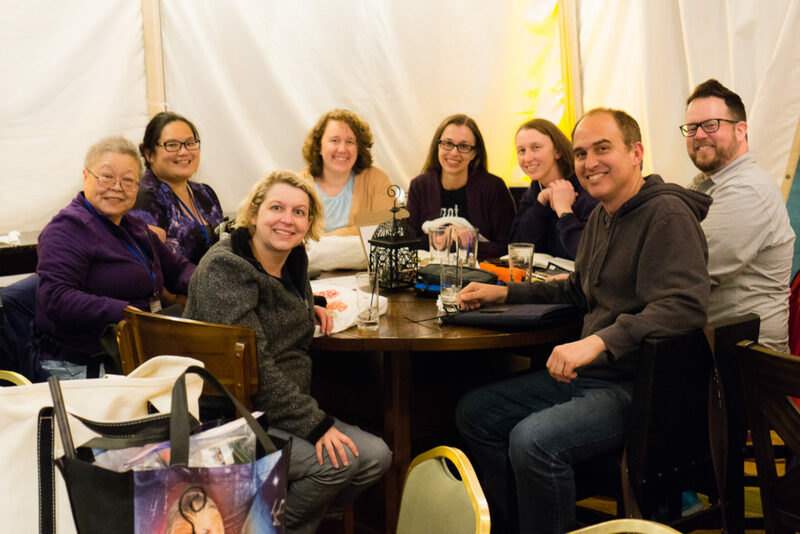 The PIF table was staffed by a number of volunteers this year and I would like to give a shout-out of thanks to all that helped out this year. Thank you Sarah M., Carrie H., Andy D., Pam T., Tommy S., and Jim K.! If I missed anyone else who volunteered, please accept my sincere apologies. 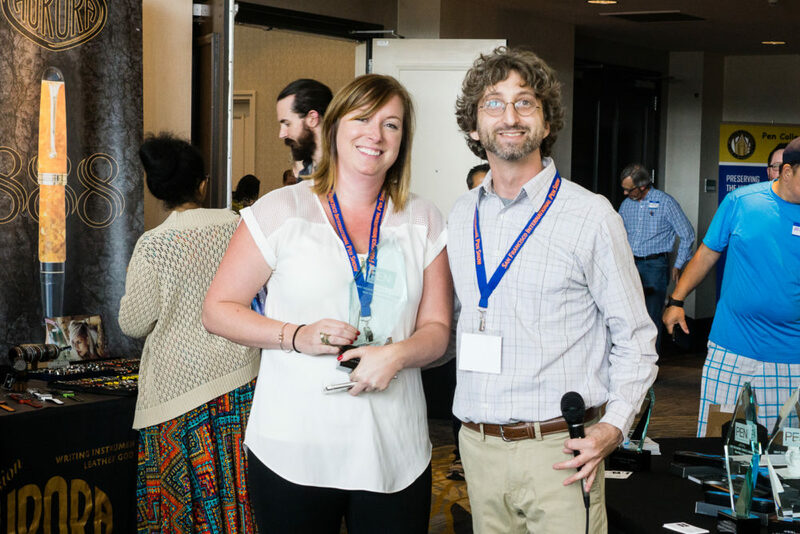 And last but not the least, a big thank you Kimberly L. for being my co-host of the PIF table this year. 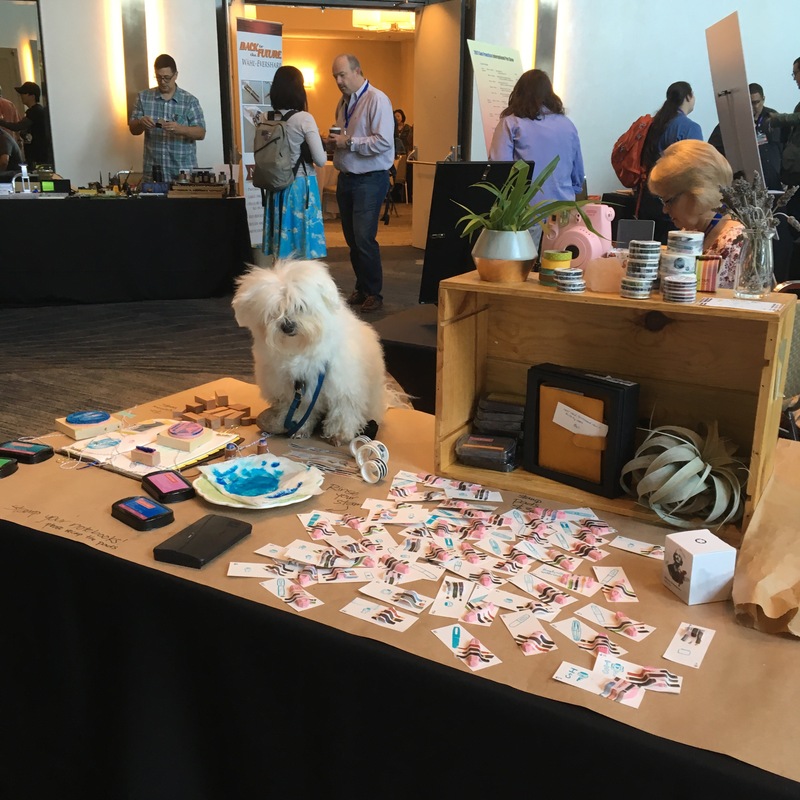 She did a lot of things to help prep for the PIF table at this show! And the PIF photos are by Kimberly as well. If you want to find out more information, or donate either items or funds, please check out www.stationerypif.com for details. 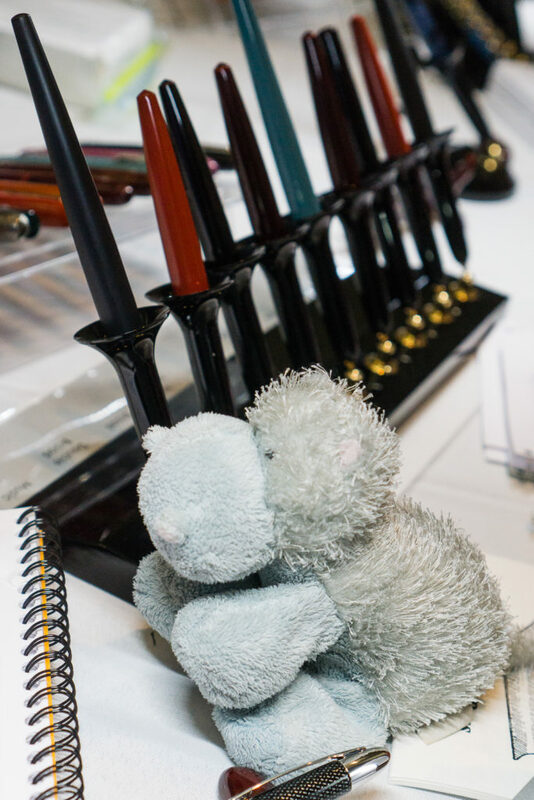 You can also check the schedule for the next pen show a PIF table might appear! Thank you for making this community of ours a fun and caring one! 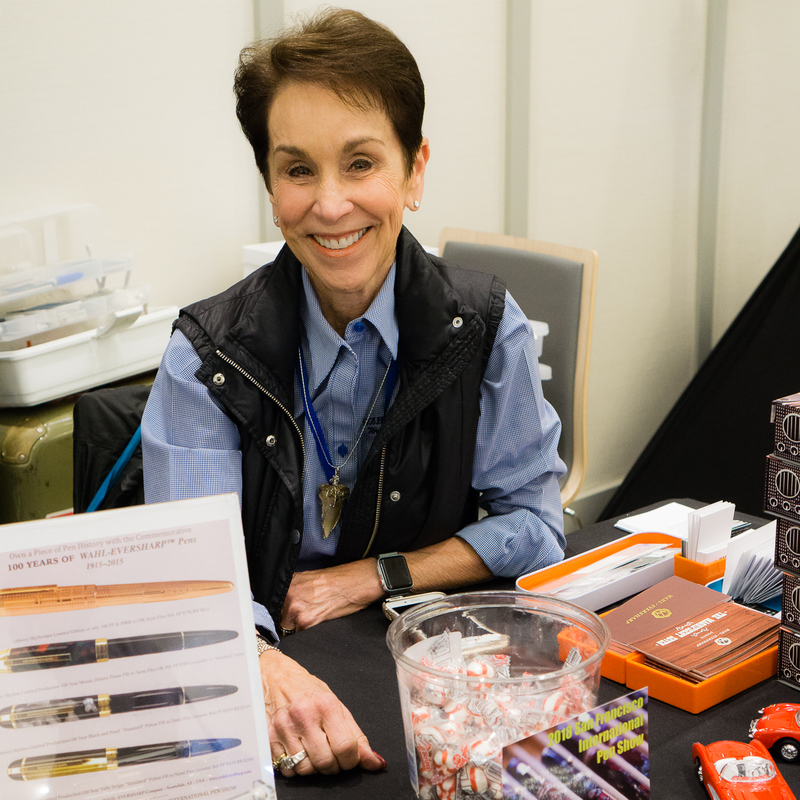 Last year’s SF Pen Show was the first time Lisa Vanness and company tried to have the Pen Dash and ever since then, they hosted it at different pen shows. 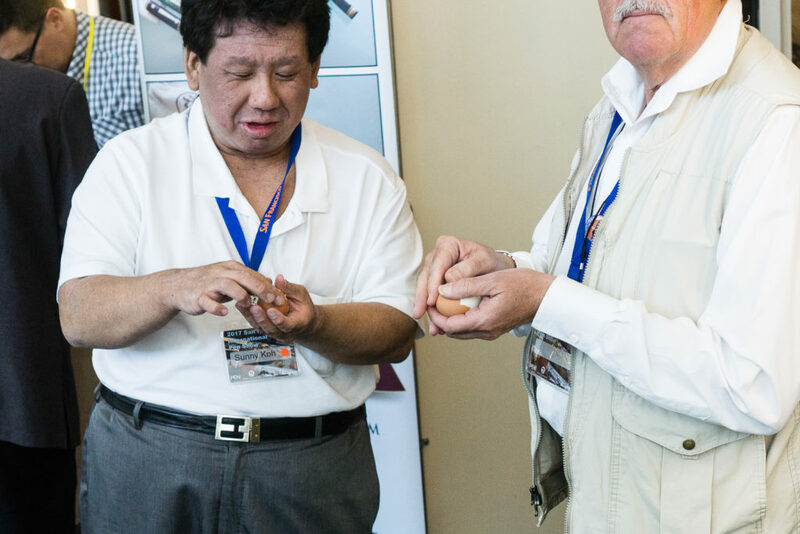 This year, we had to make sure that this event continued at The Fun Pen Show. 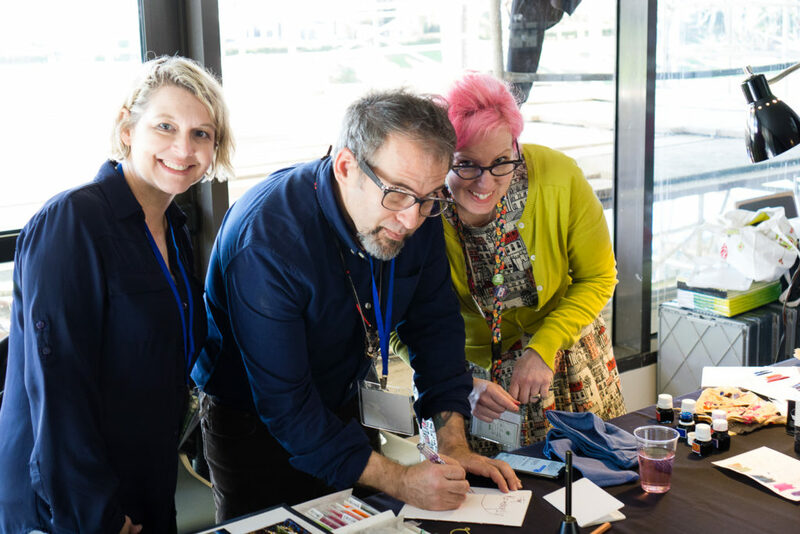 So the Pen Dash happened on Saturday at 5:30pm and it was a great success! Wait, what is a Pen Dash you may ask! 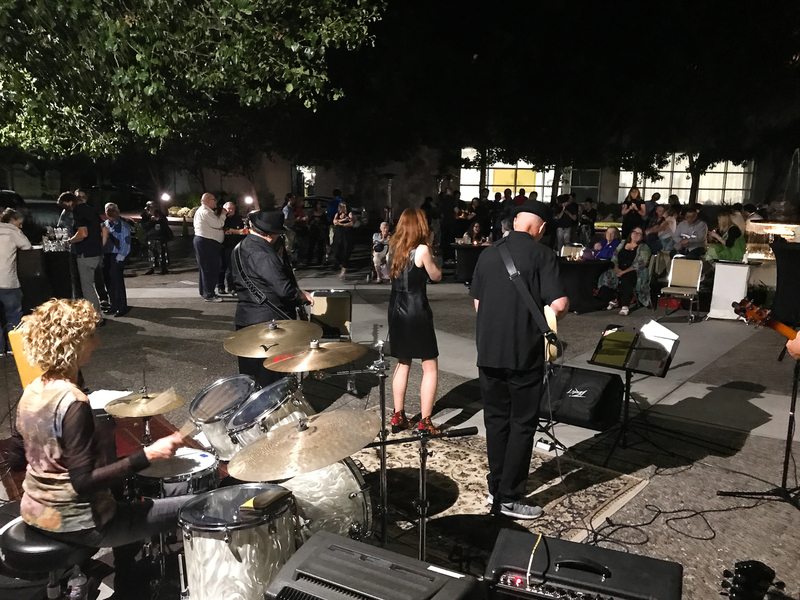 In a nutshell, it’s an effort to create a way for people in the community to interact with each other. But more importantly, to learn from selected table leaders or as I called them, Subject Matter Experts (SMEs). 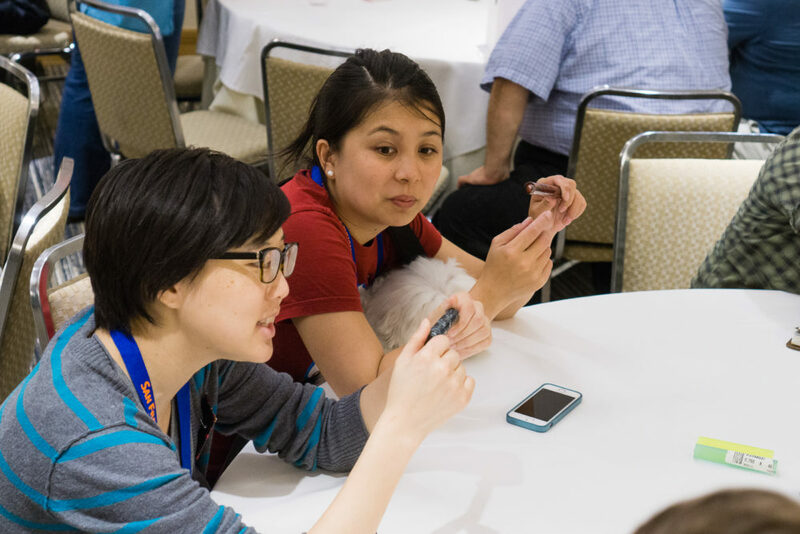 The participants will stay at the table and listen to the SMEs talk about their topic and then after a certain amount of time, the participants then change tables. 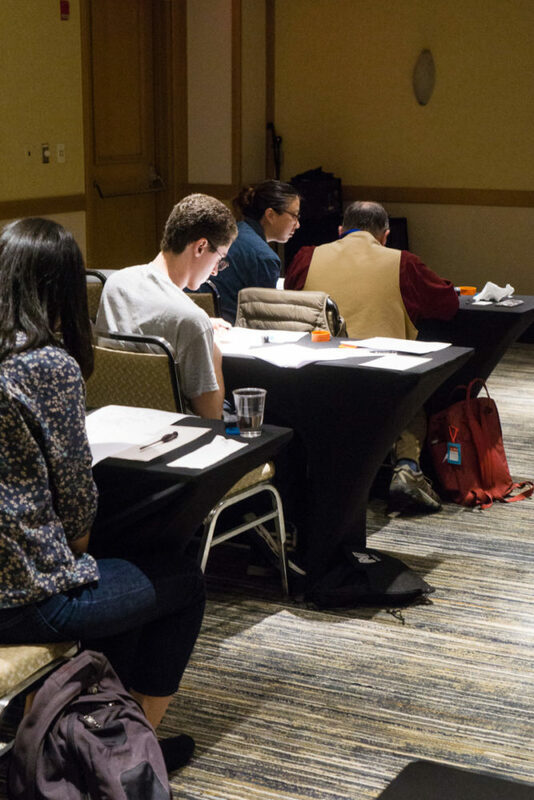 So it’s kind of Speed Dating except that there is no anxiety and lots of learning. We had 13 tables separated between 3 rooms and each table had a SME to talk about a certain topic. 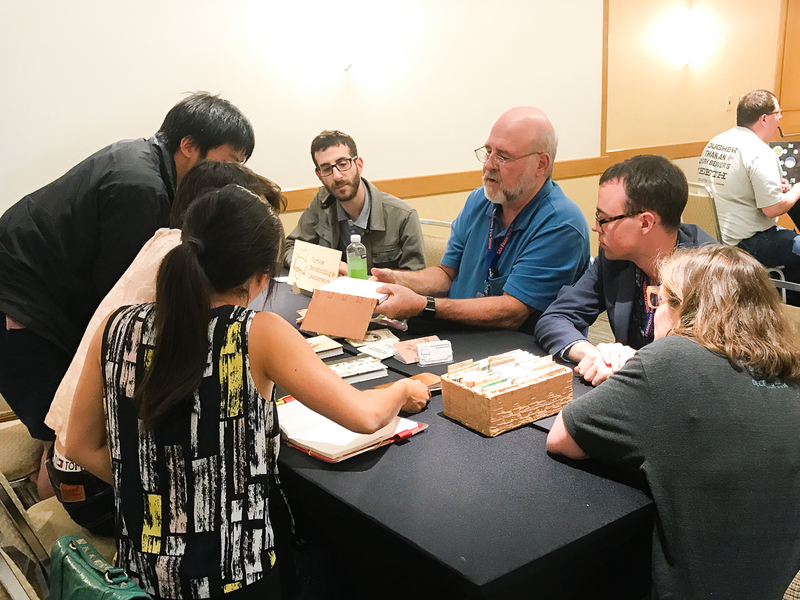 Topics ranged from vintage and modern pens, pen customization, Japanese urushi pens, paper types, bookbinding, nib styles, creating art pieces, etc. In a span of 10-15 minutes, the SMEs will talk about their topics and answer any questions. 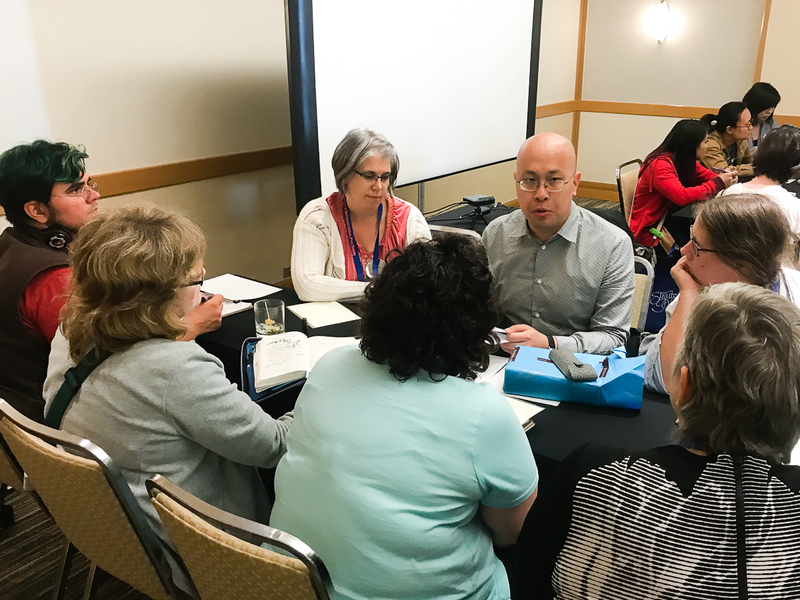 After each time frame, the participants switched to another table to learn from another SME. 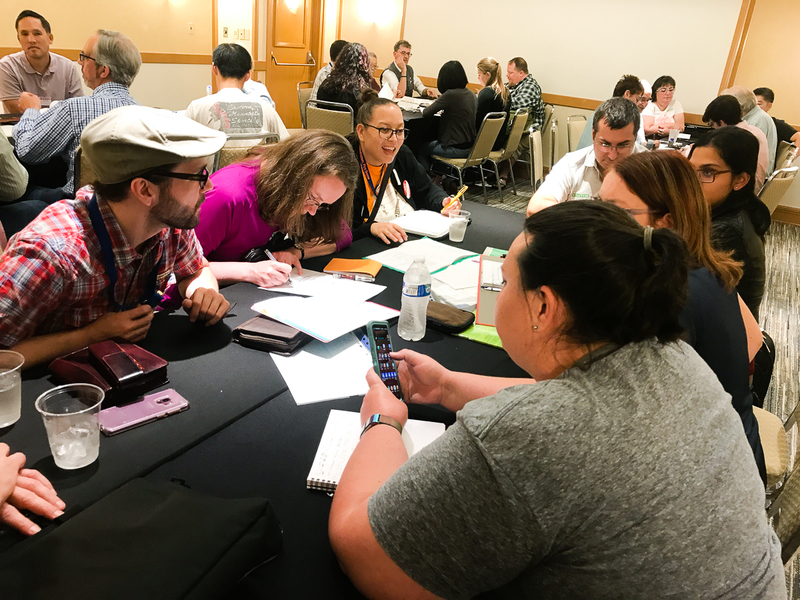 The participants stayed in their respective groups within the room so each person had an equal opportunity to learn from a leader. 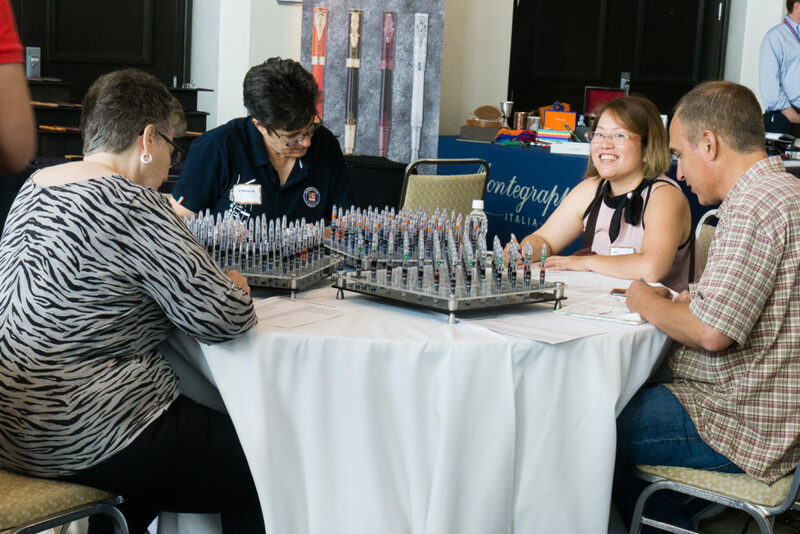 At the Pen Dash, we had a little over 100 participants at different ages and different levels of involvement in the stationery community. 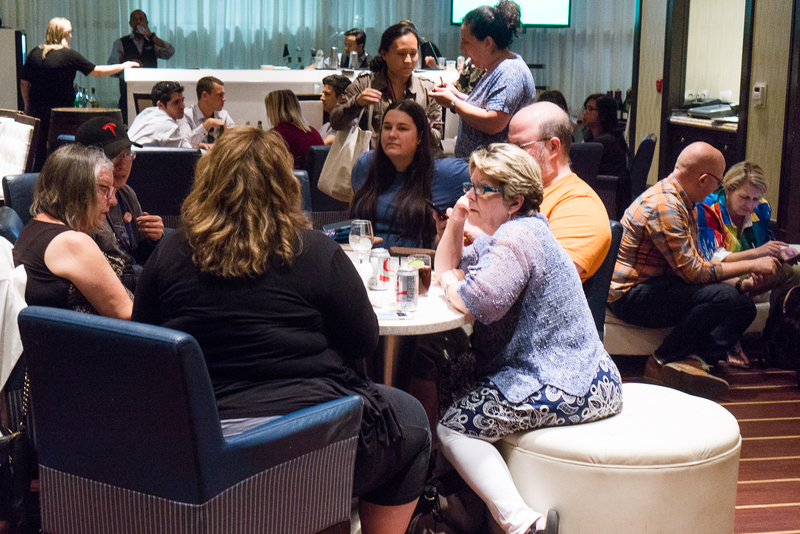 At the end of the mixer, Lisa took a chair and gave closing remarks in each room and some prizes were given away! Here’s a quick video showing some prize winners! 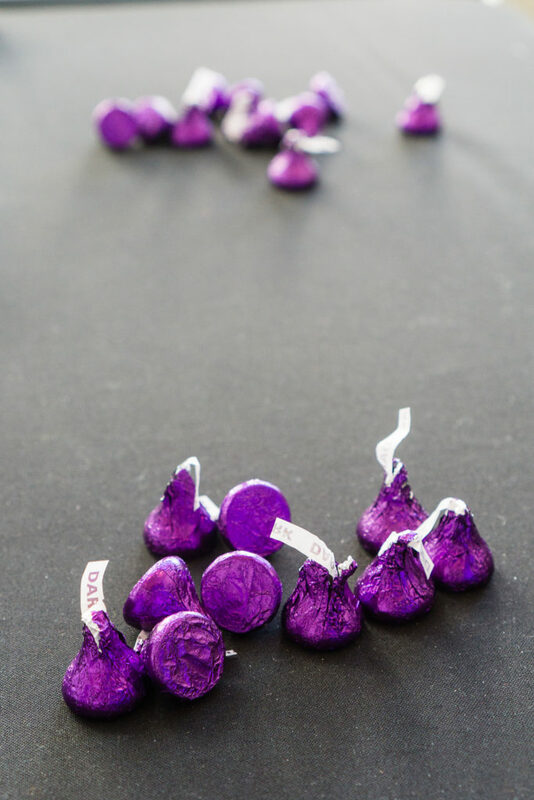 On behalf of Lisa Vanness and myself, Franz Dimson, we would like to thank Ana Reinert, Pam Tien, Claire Rice, and other Pen Posse volunteers for helping to make this Pen Dash a success! 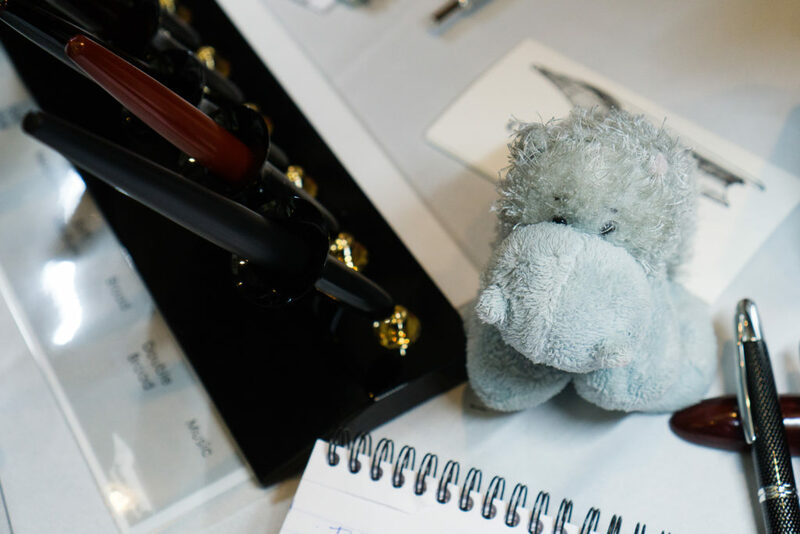 In an effort to stave off some of the post-pen show despair, Katherine has compiled pictures of some of the fluffy friends who graced us with their presence last weekend. 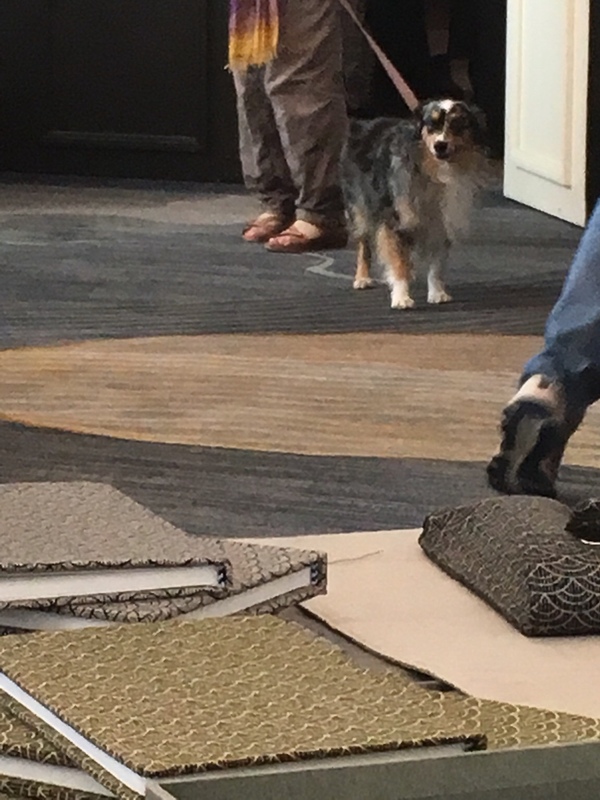 The hotel and show are dog friendly, and there were several this year! This is Oliver, shopping at Sarj’s table. Odin (right) making friends with a mystery dog that is similarly fluffy. 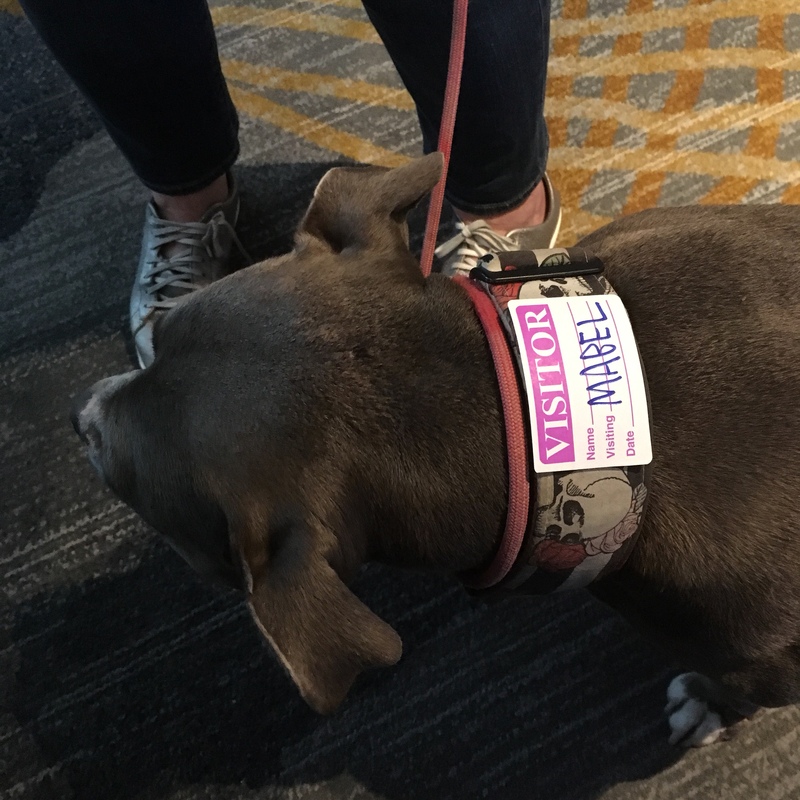 Mabel even got a name tag! This dog had a friend, but I only got one in the photo. As seen over the Musubi table. Ralph needed some help… and Moogle was there for him! 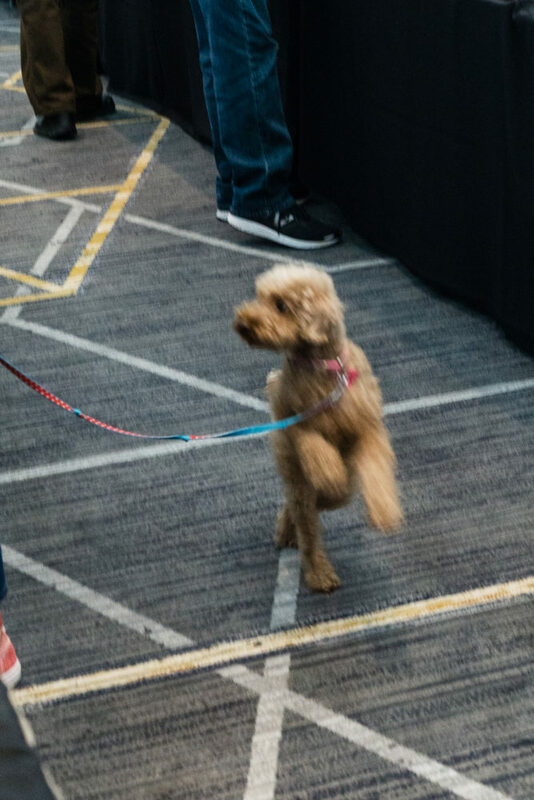 Did you make any fluffy friends at the SF Show this year? If you have any photos of your pup at the SF show and would like them added — let us know in the comments! Hello Friends! 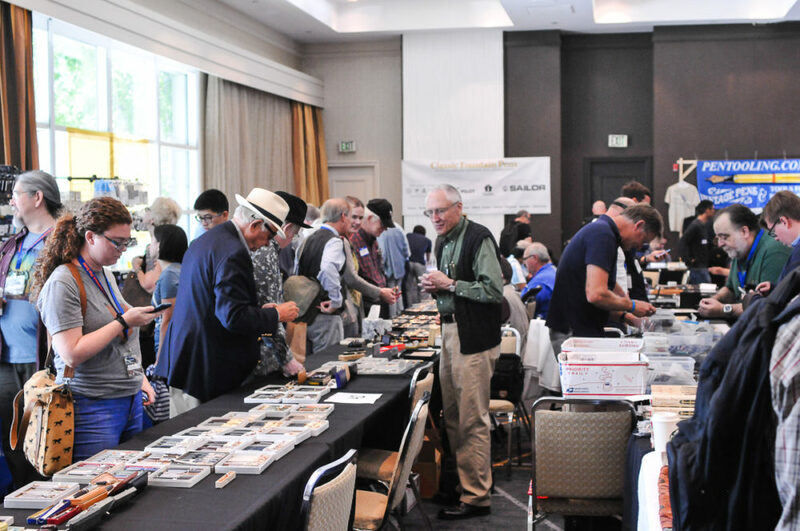 I was fortunate enough to be able to attend the 2018 Los Angeles International Pen Show that was held on February 15 thru 18. 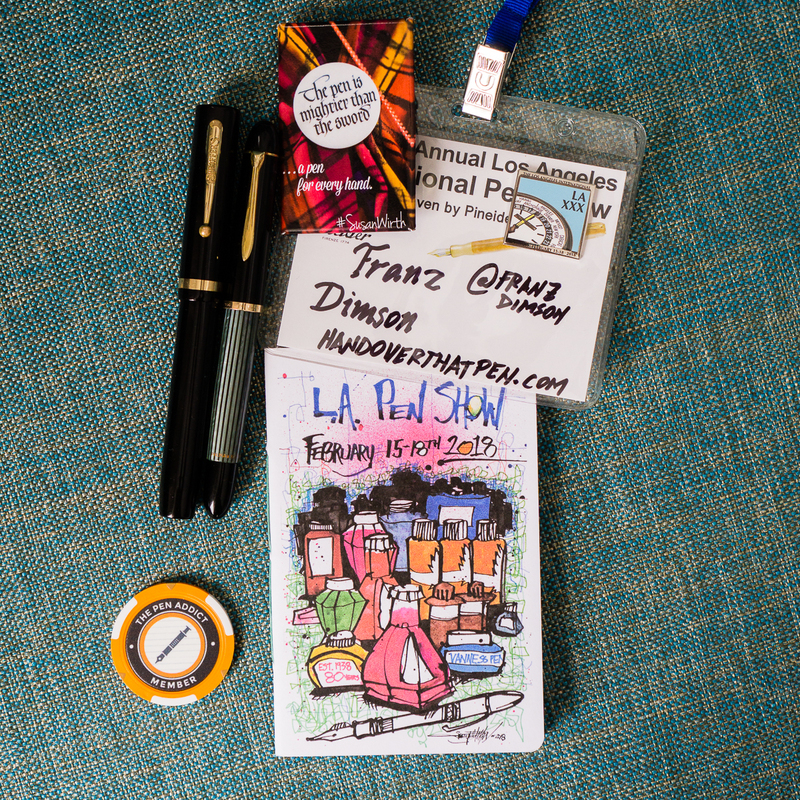 I actually try to make it to the LA pen show every year as kind of like a vacation for myself. 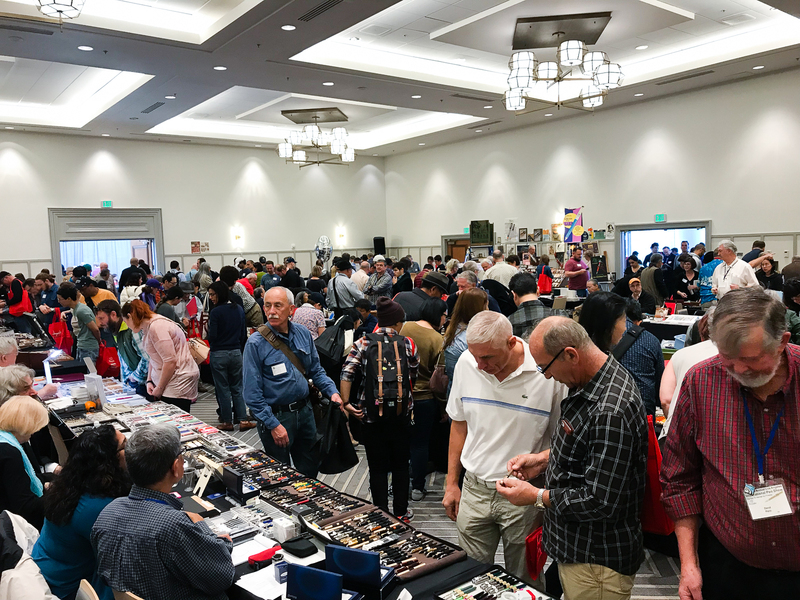 Things I look forward to at a pen show: hanging out with pen-minded people, perusing thousands upon thousands of different pens, possibly buying a pen (or two) that I can’t go home without, seeing and visiting with old friends, creating new friends, and just having a fun time! 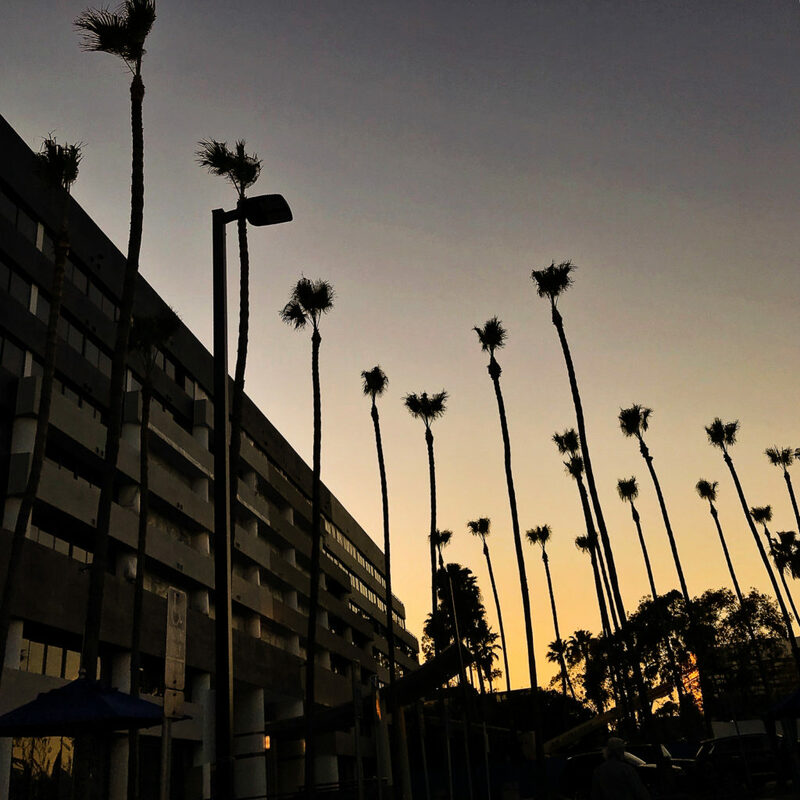 Sunset sky at the Manhattan Beach Marriott Hotel. I have arrived! 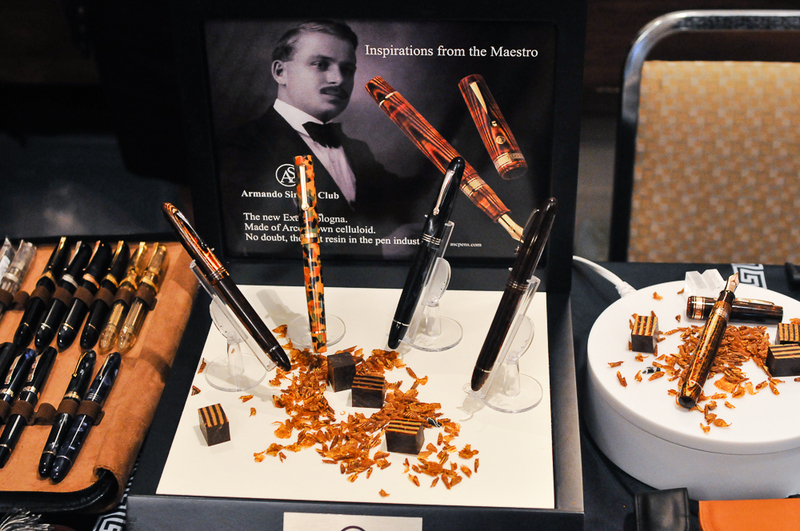 Each year, the LA pen show is held at the Manhattan Beach Marriott Hotel in Manhattan Beach, California. This year, they’re in a transition period and changing their name to Westdrift but is still under the Marriott brand. The hotel was still undergoing construction during the pen show. There’s more to be said about that part but I’d rather just focus on the show which was all fun for me! I arrived on Thursday afternoon just in time as the first day was wrapping up. I immediately checked in and went downstairs to the ballroom. Back at the hotel, we all congregated to the hotel’s outdoor bar aptly called, “The Tent”. 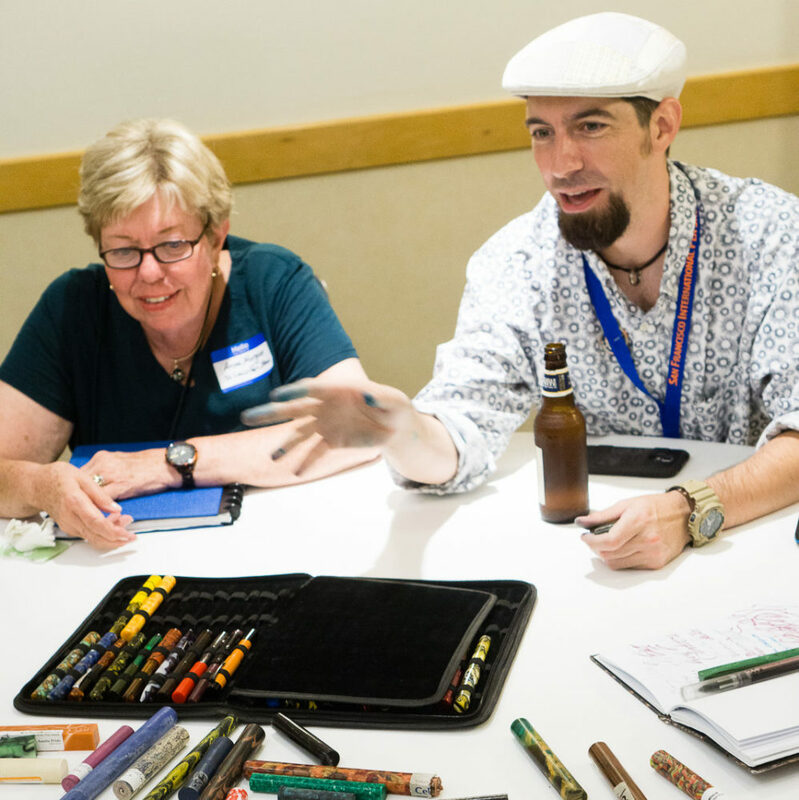 This is the time where pen people sit, relax, talk, and show off their pens. 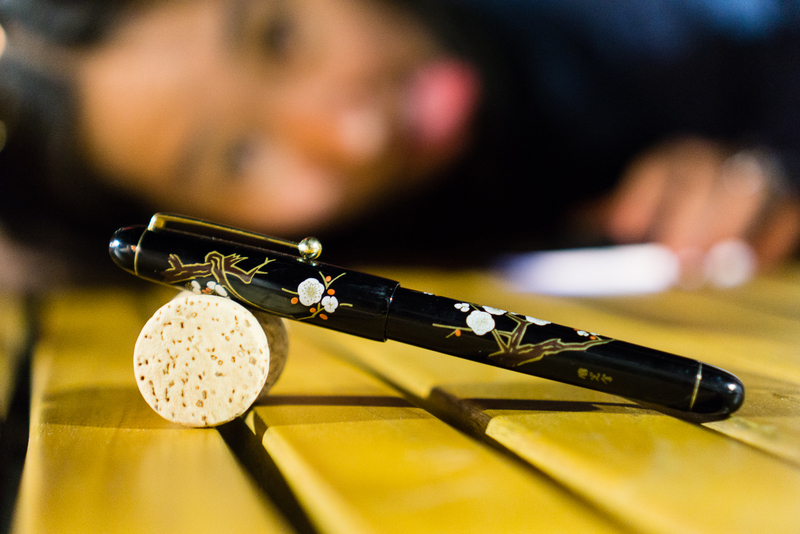 At the bar: A Pilot Hira Maki-e pen in Ume pattern in the foreground while being photobombed by Kimberly. 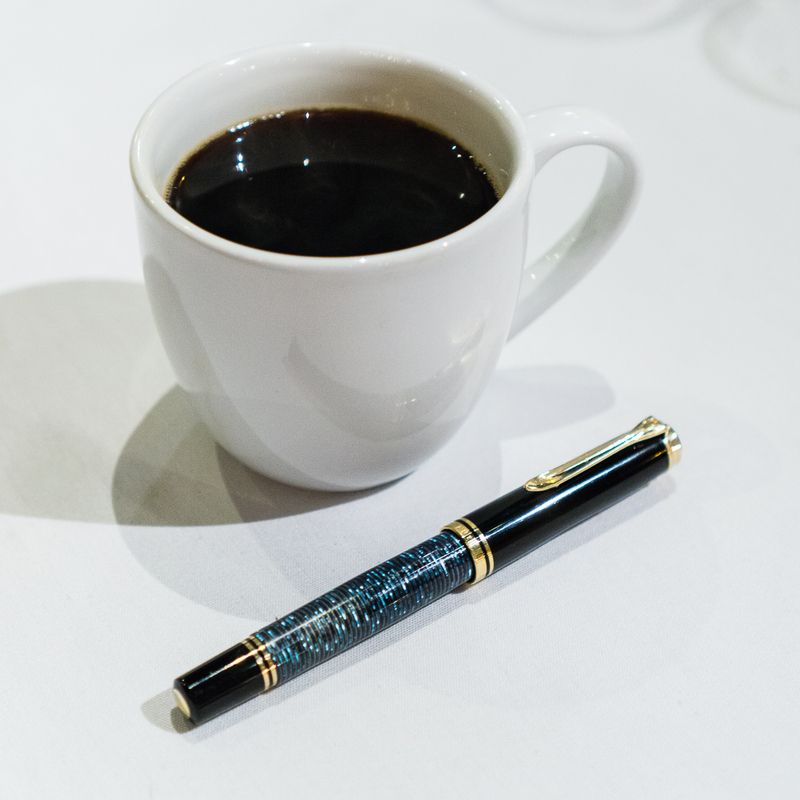 At the bar: An Aurora Optima 365 Azzurra pen. 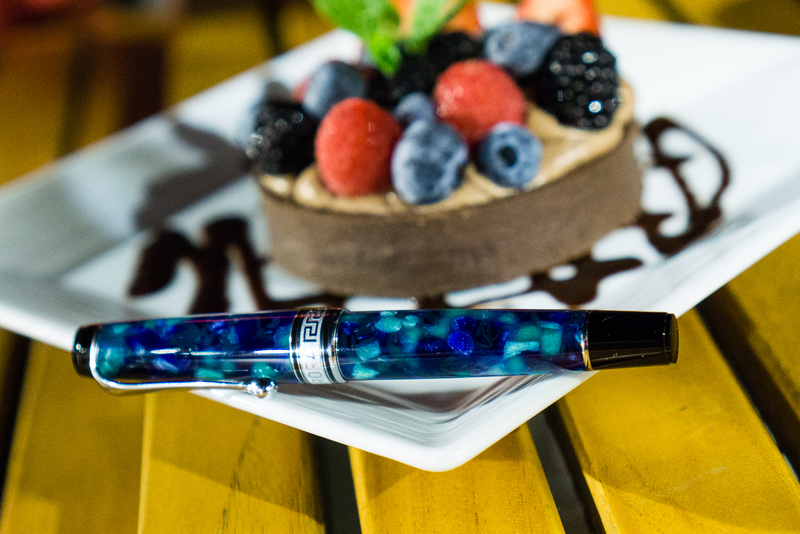 Playing with pens is sweet especially when you have dessert on hand. 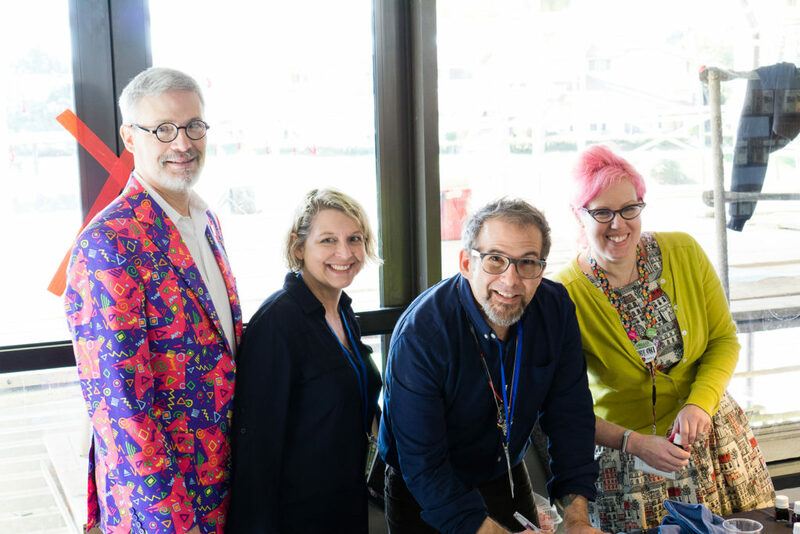 One of the pen bloggers (code name: Pink Hair) arrived at The Tent and generously let everyone try out the new Wancher Dream Pen. I must say that it is a substantial pen that filled my paws well. I then did a quick comparison in size with a Pelikan M1000. Thank you Agent Pink Hair! 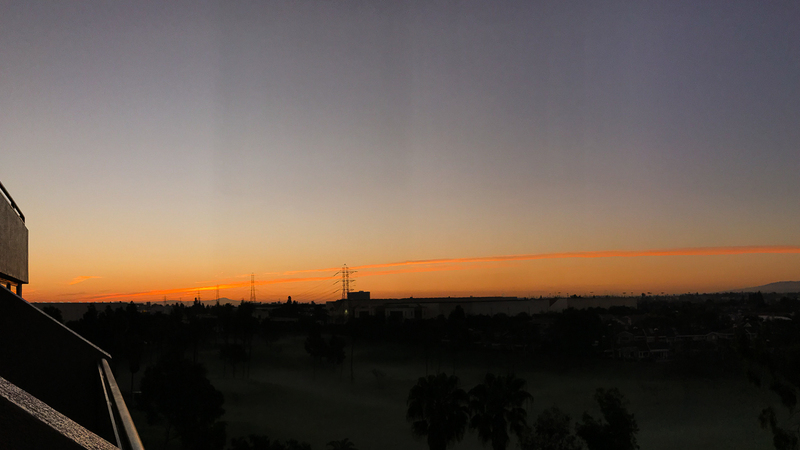 Good morning Los Angeles! It’s a beautiful day for a pen show! I woke up early-ish and got ready for the day. I went down around 8:30am and found that the show was already ongoing. Paid for my Trader Pass and I was on my way. 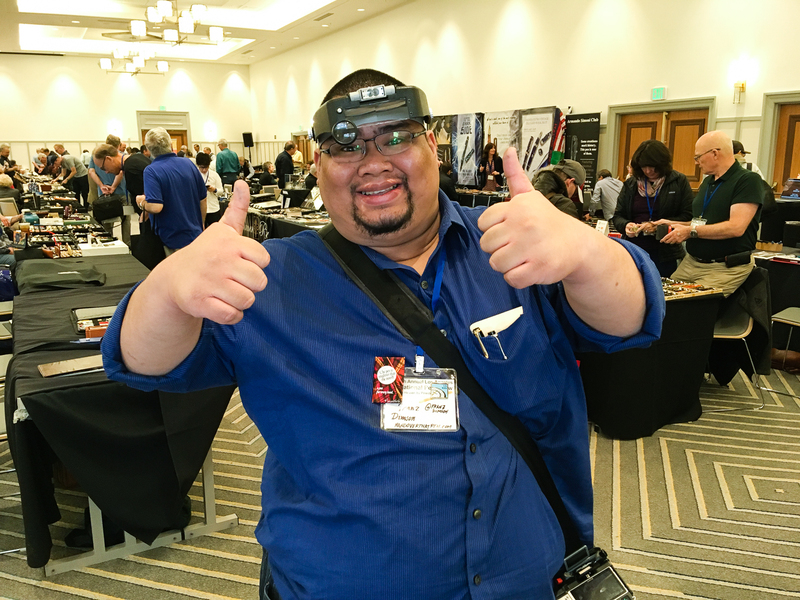 Walked around and visited to say hello to friends (vendors and attendees). 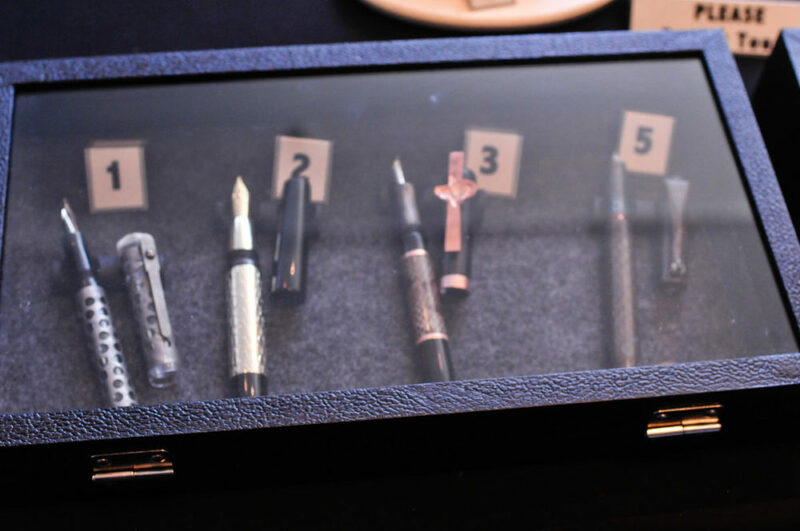 I found the Straits Pen table with some Pelikan pens as well their table’s security detail. 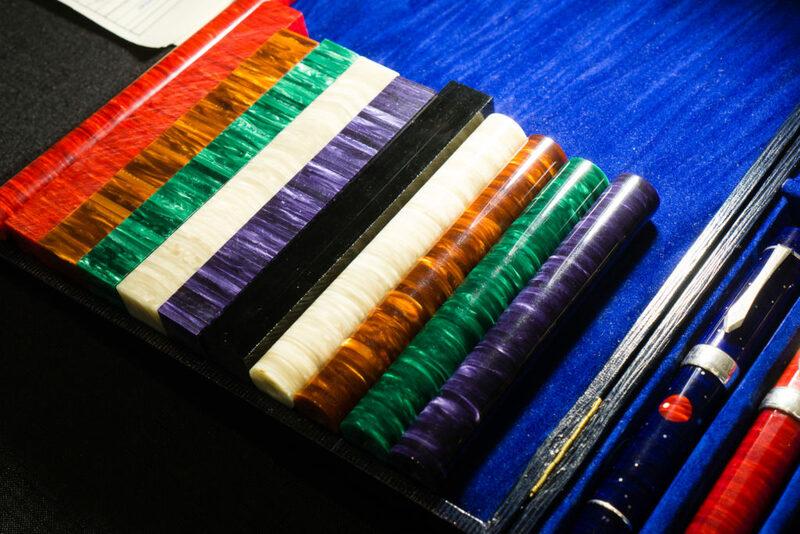 Pen Posse Yuan armed with an ebonite rod for those people with sticky fingers! 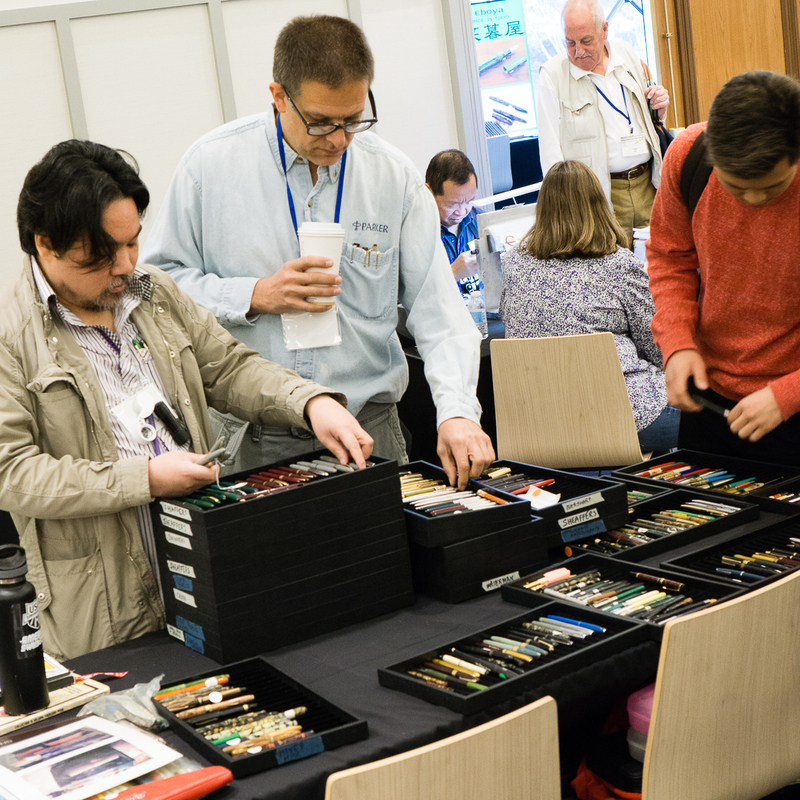 Walked around more and saw the Professional Nib Expert, Mike Masuyama at his table working early. I signed up to get some nibwork done as well. Because of how late I signed up (9:00am), I wasn’t sure if I’ll make the cut for the end of the day. That’s how in demand this gentleman is. Mike Masuyama’s first customer was ready and raring to get her nibs ground! 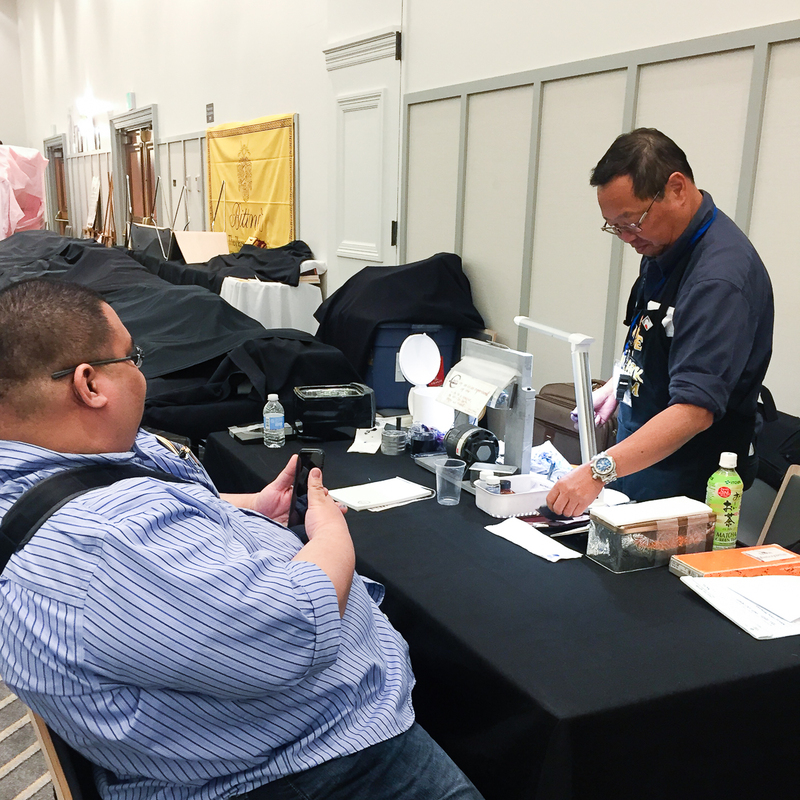 Mike Masuyama’s work station wherein he pretty much sits behind the whole pen show. This is THE place where he wields his magic and skills to make you happy to write with your pens. 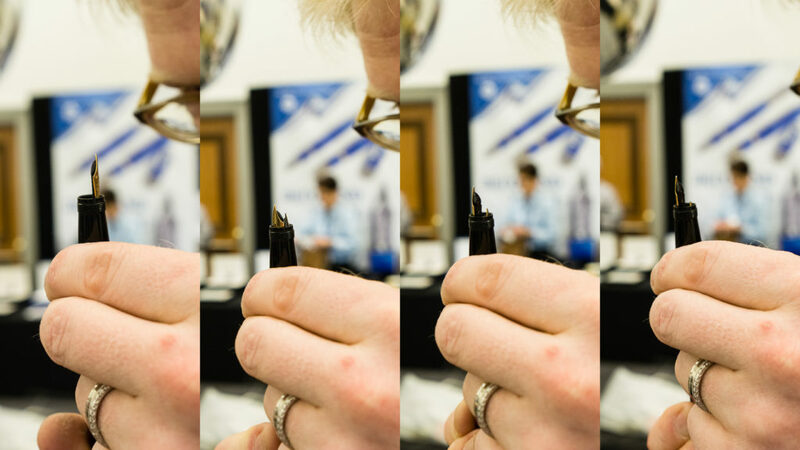 Since Friday morning wasn’t too busy yet, I got the chance to do a Live Instagram video and got to show some of the pen show’s light action on Friday morning. I then uploaded to YouTube for others to watch. I was reading and answering live comments (that you don’t see anymore) so pardon my incoherency at times. Enjoy! 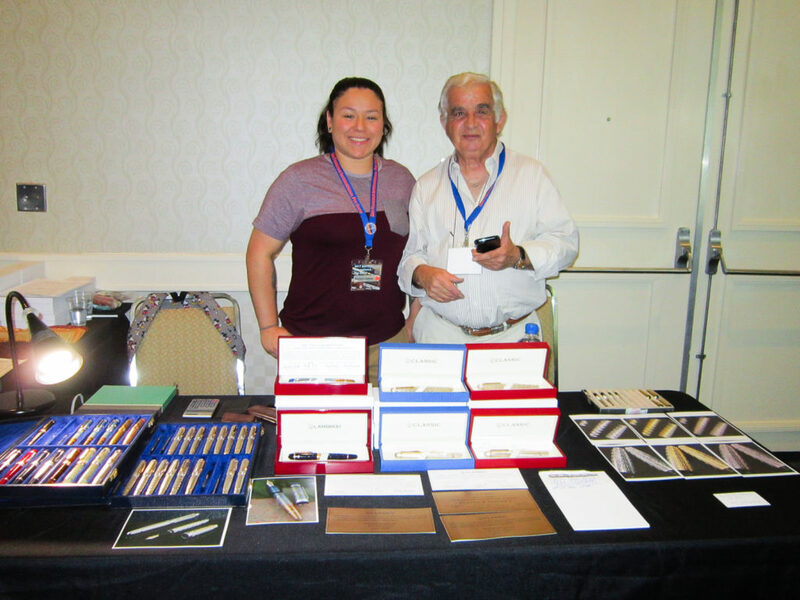 One of the pen dealers who I just met this year at the show was Letizia Iacopini from Italy. 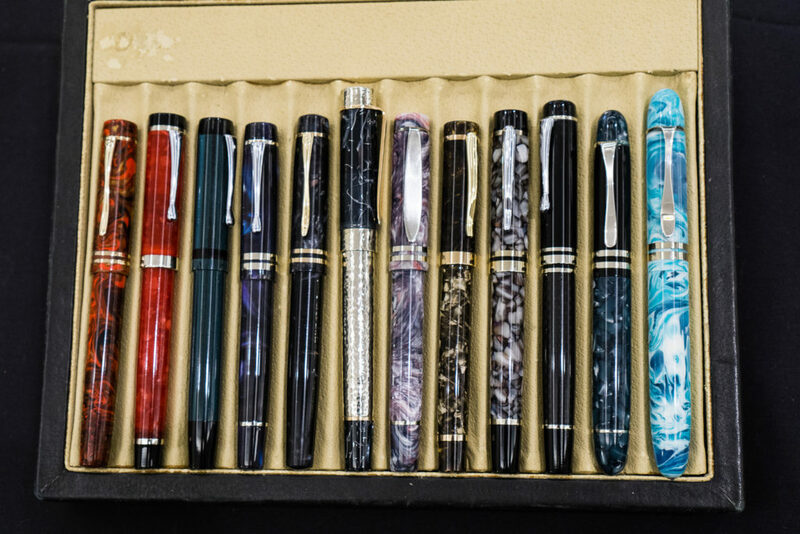 I have always heard of her name in the community and how she is an expert of Italian and other pens. 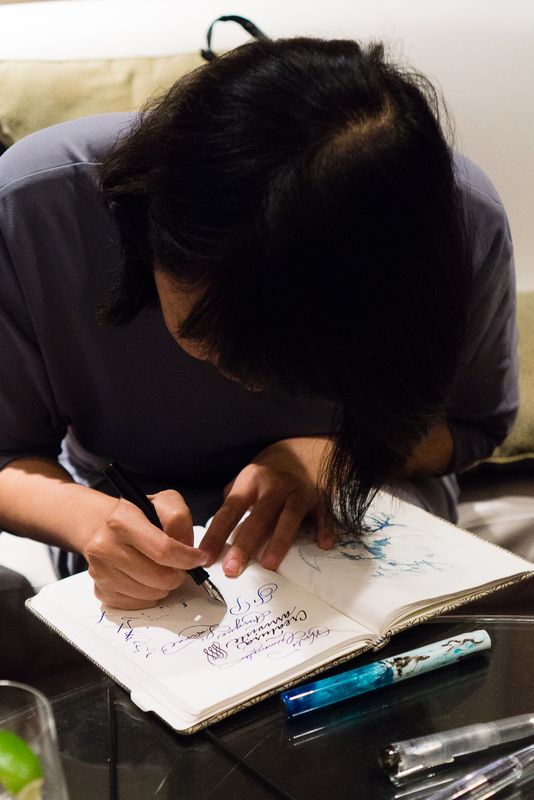 She is also an author of several fountain pen books. Her most recent book was, “Parker in Italia: 1900-1960”. 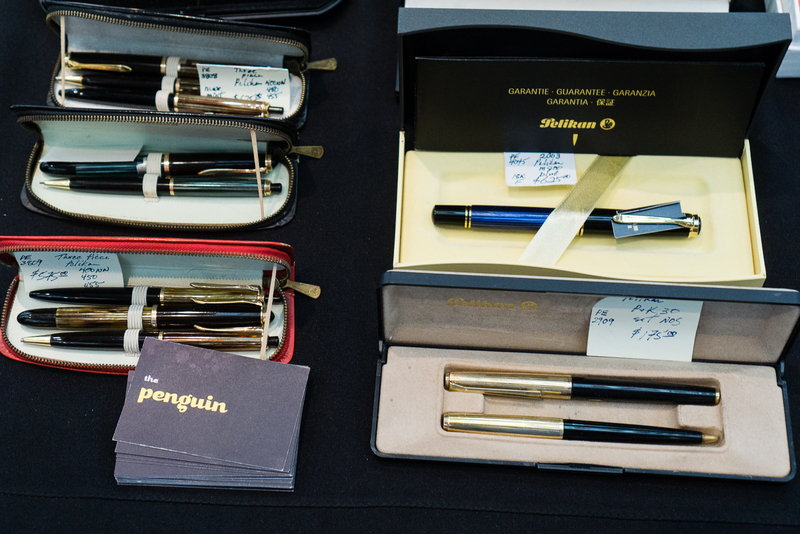 Her table at the show had exquisite pens from the vintage and modern era. Majority of her pens were Italian. Own a Ferrari? 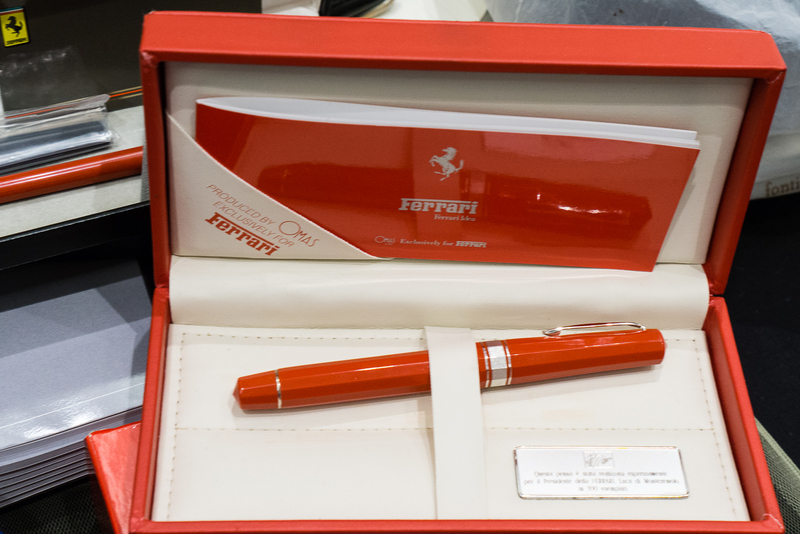 Why not get a Ferrari Omas pen as well? One of my favorites in Letizia’s table. 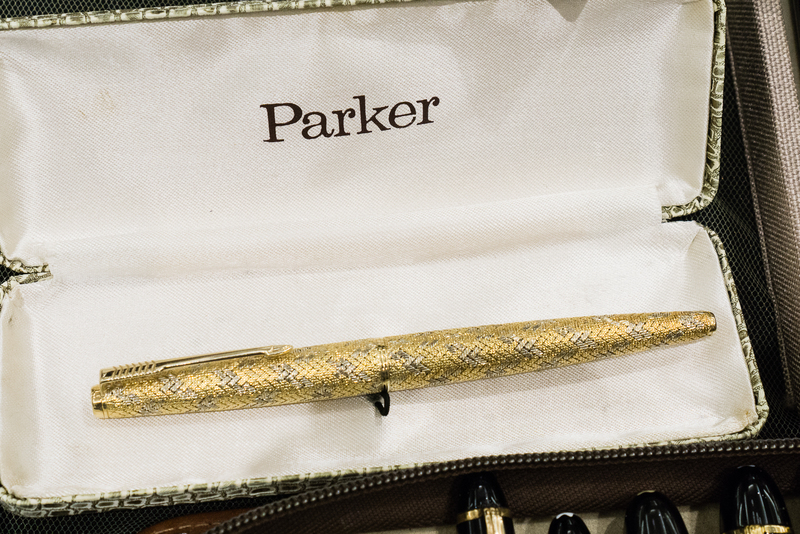 A Parker 45 with Italian solid 18k gold basket weave overlay. I mean, WOW. Then I turn around and walk 3 steps towards the table of Dayne Nix. He always brings in great vintage pens from different regions. 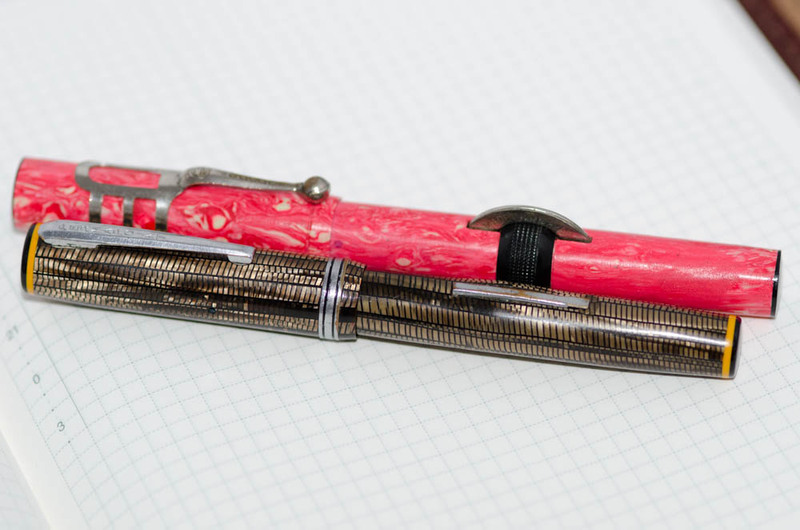 As a side note, I met Dayne at the 2012 SF Pen Show and it was from him that I bought my first flex pen, a Parker Televisor and I still have it. 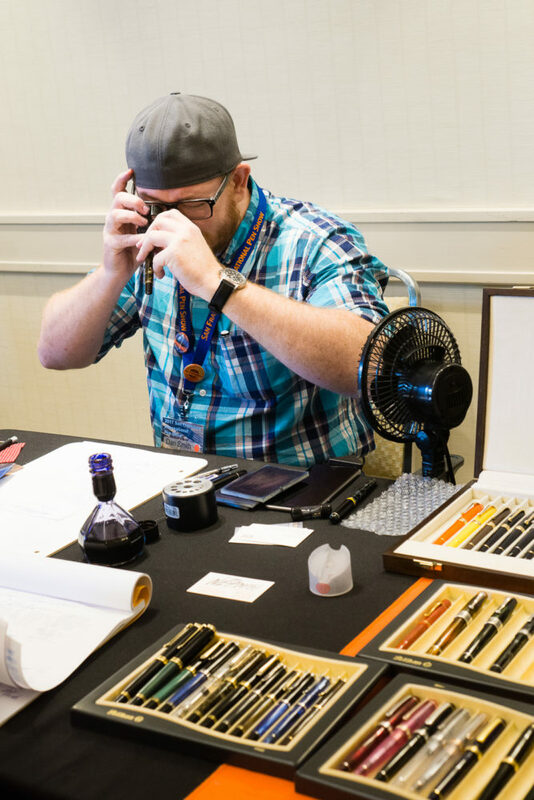 Anyway, Dayne’s table display is fascinating especially his array of Conway Stewart Dinkie pens as well as his demonstration of how a rare Zerollo Dunhill Two Pen worked. Brian and I were fascinated with the Zerollo/Dunhill Two Pen. I took a few action shots and these four showed the pen’s action very well. 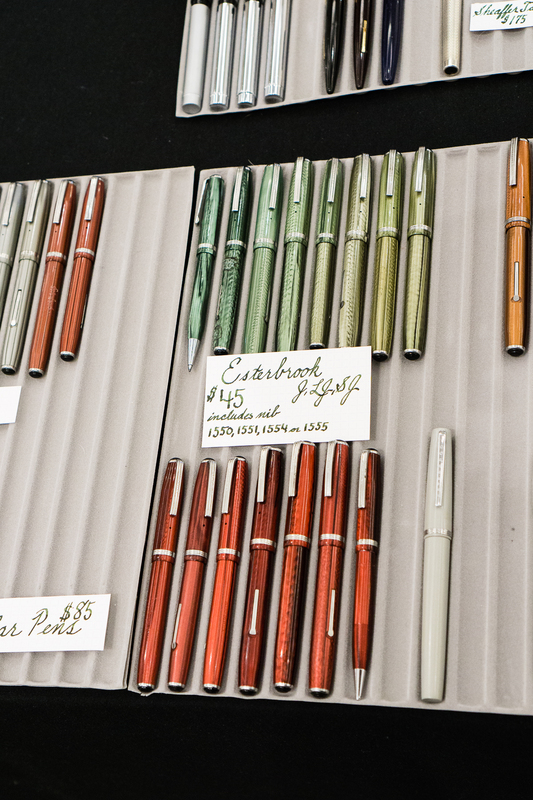 At the Armando Simoni Club (ASC) table, a couple large pens caught my eye. I then walked out of the ballroom to check out the Vanness Pens team in the hallway and look at who I found! Mike Vanness and his awesome suit! He always wears colorful clothing. 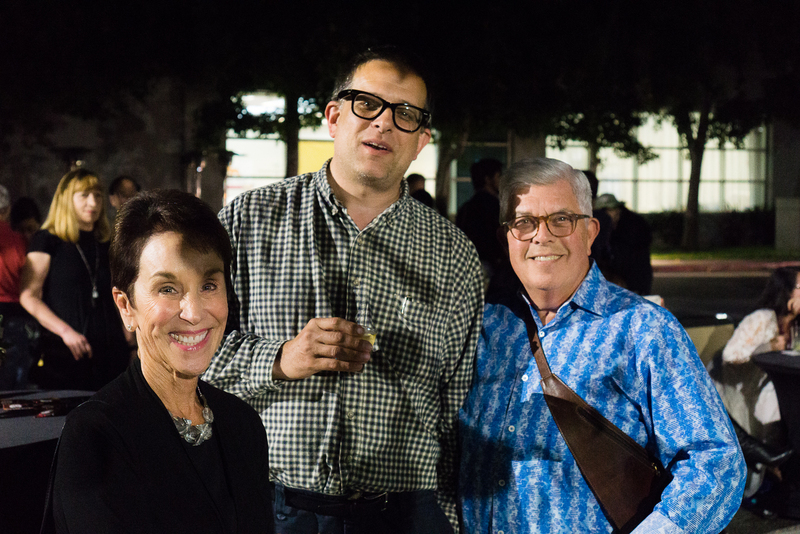 In the corner were Lisa Vanness, Joey Feldman, and Ana Reinert. Joey was creating artwork for people who bought journals at the show. Mike joined in for the Vanness team photo sans Brad who was still traveling. 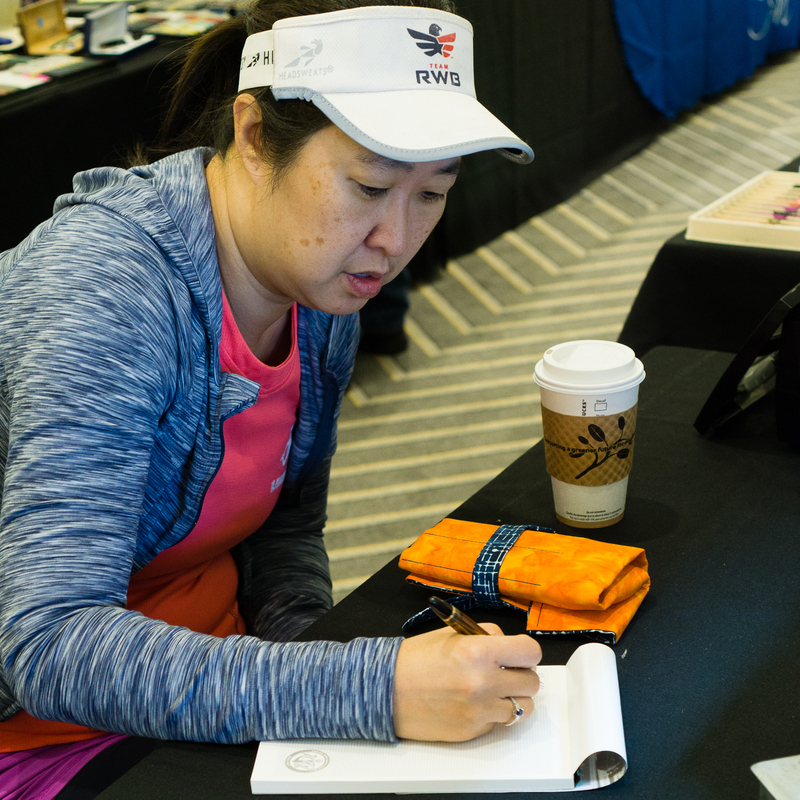 Vanness always brings in tons of paper, pens, and lots of ink! Akkerman, Lamy, Colorverse, etc. FOOD TRIP: It was almost 11:00am and a few of the pen posse peeps congregated to go out for lunch. 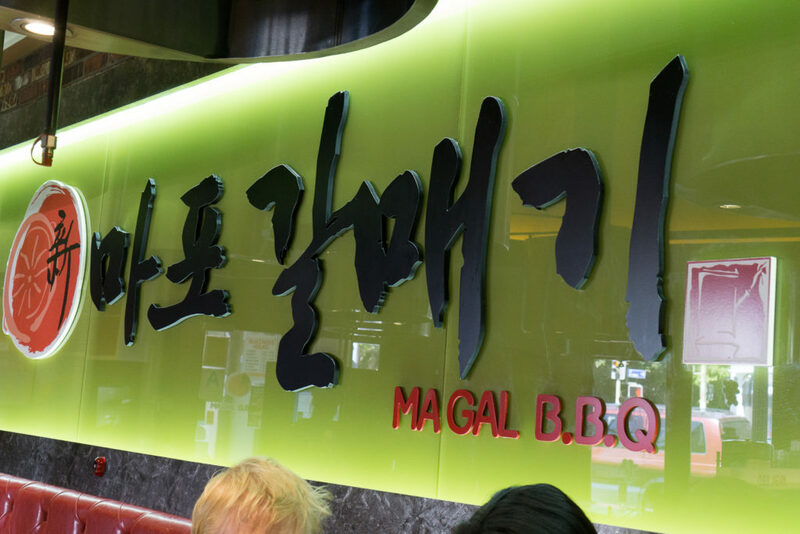 A quick-ish drive to Korea town for Magal B.B.Q.! 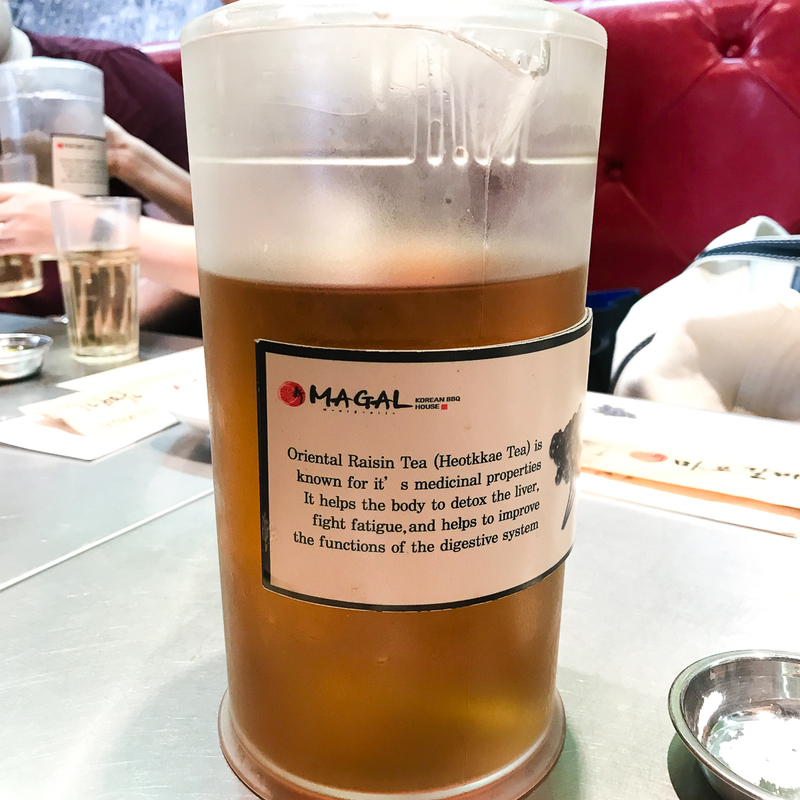 It’s become a tradition for us mainly because of the magic tea they serve. After lunch, we went back to the hotel for more pen show! 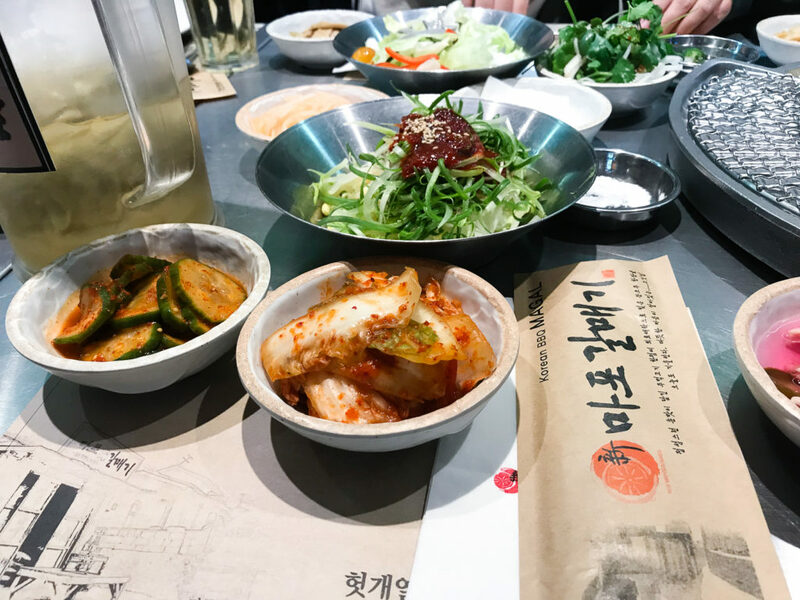 It was actually energizing to step out of the show for a relaxed lunch. I need to do that more often. 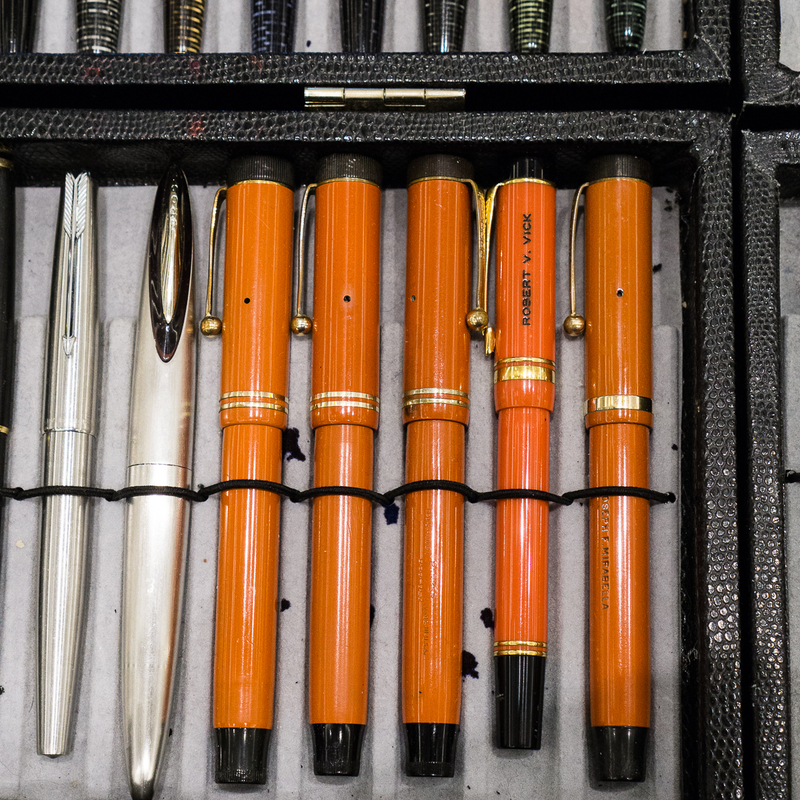 I stumbled upon the Kenro table with all the Aurora pens on display. 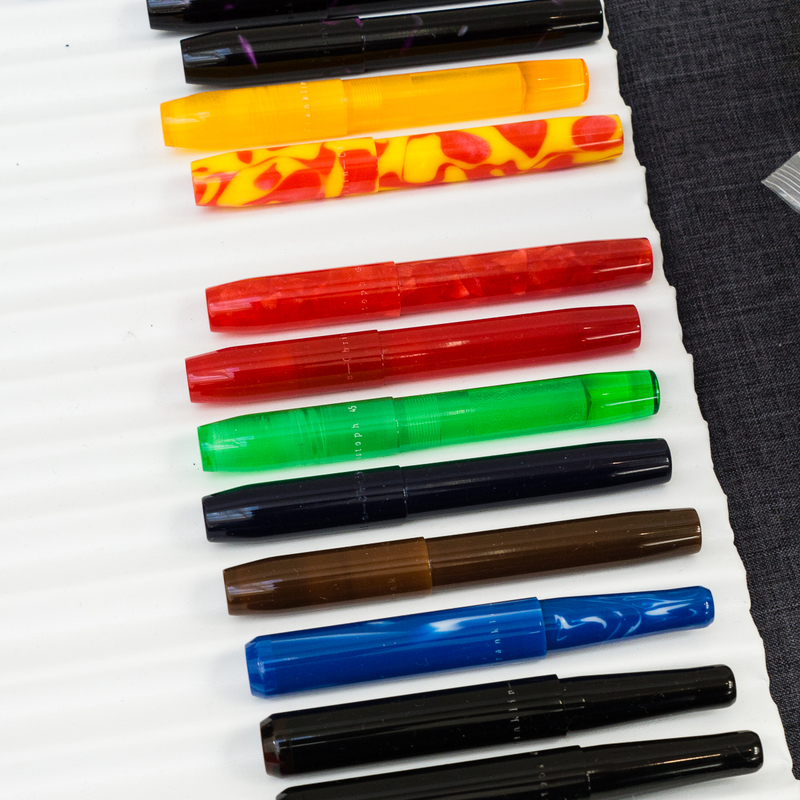 The new lineup for Aurora Optima Flex limited edition pens. This time they have rhodium trim instead of the gold ones on the 88 lineup last year. 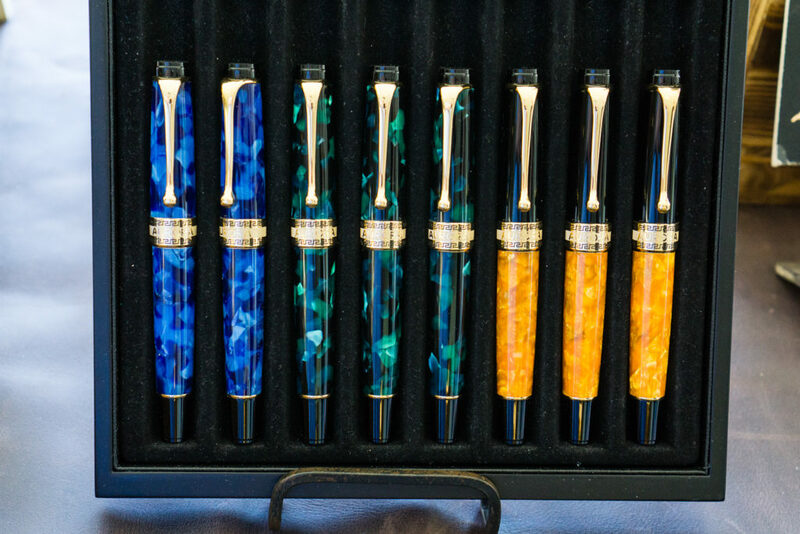 Aurora Optima pens. Blue Auroloide, Green Auroloide. And dio mio! Look at that Sole Mio! The Aurora 88 Marte is showing off its beauty as it basks in the Sun. Here’s a Pelikan basking in the sun as well. 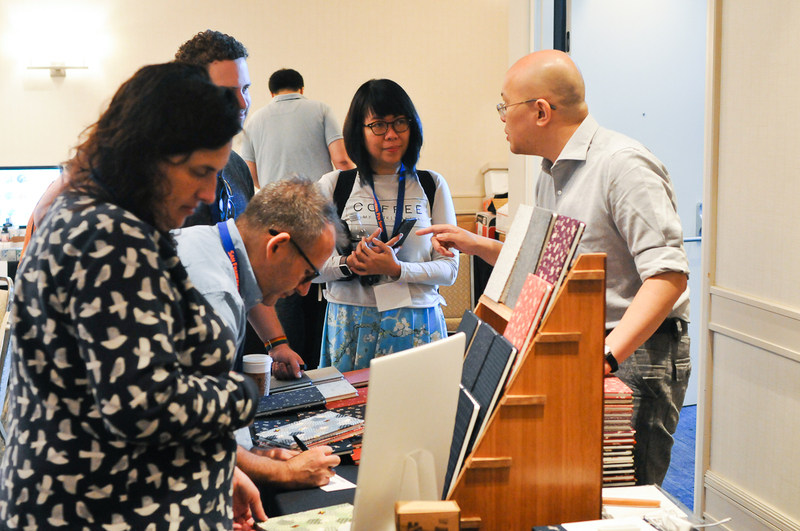 I then went back to the Vanness Pens table to buy some of their special edition LA Pen Show journals by Curnow Bookbinding with artwork by Joey Feldman. Joey was still there and he drew my Pen Show Persona on the back of the A5 journal I bought. This guy is phenomenal and do you notice what he named my sneakers as? Pelikan M800 FTW! Thanks Joey! Afterwards, I went up to my room to unload my purchases and rest for a while. 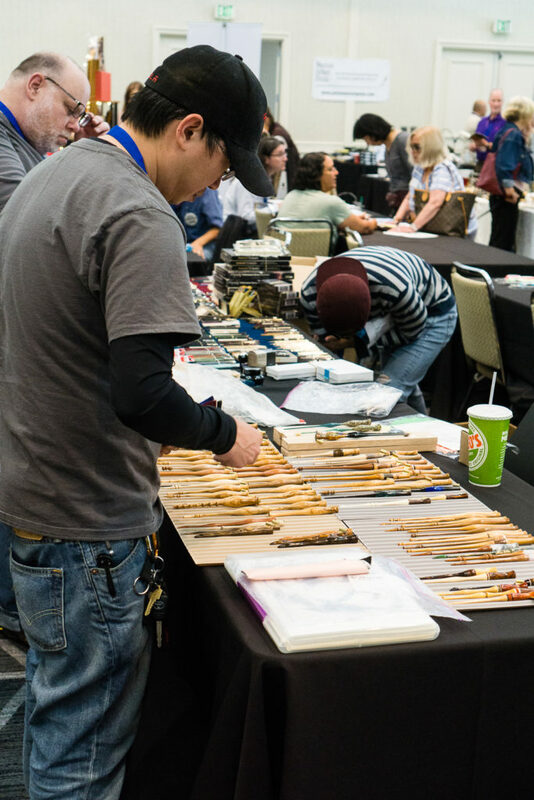 As I went back down, I checked on the progress at Mike Masuyama’s table. As it happens, the “last” person Mike was gonna help was a vendor and did not have the pen with him at the moment and I was the lucky person next on the list. Ricky got to take a picture of me as Masuyamasan was tuning my M800 nib. Thanks Ricky! Post Show Dinner: Every year, the SF Bay Pen Posse as well as friends from the SoCal contingent hold a dinner at the Tin Roof Bistro and Joi E. graciously organizes this with the restaurant. As seen on the menu, we call it, “Pen Posse: TRB Edition”. Thank you very much once again Joi! 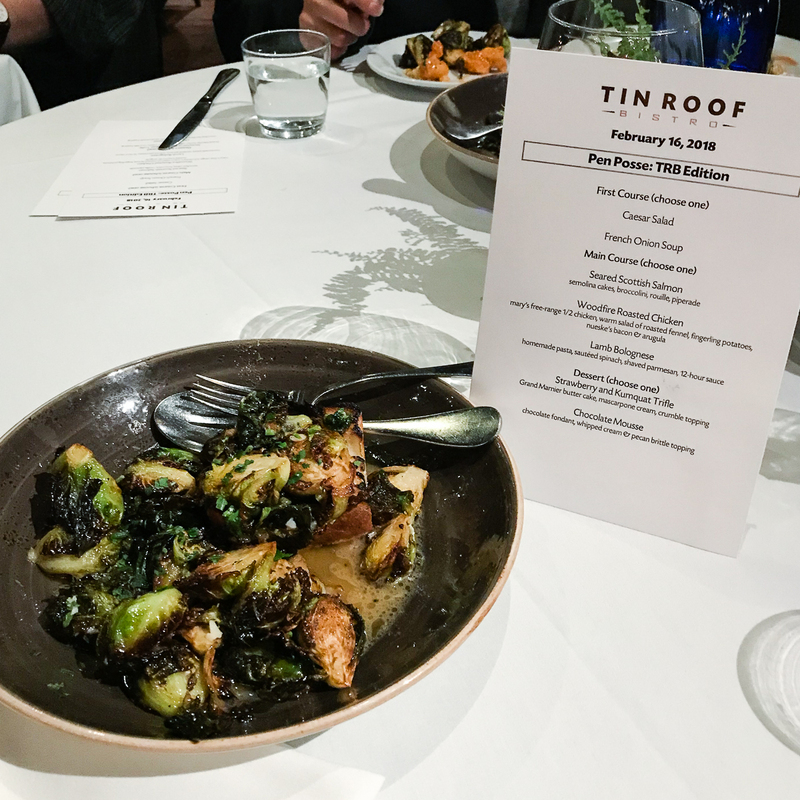 For this meal, it’s all about the Brussel Sprouts! 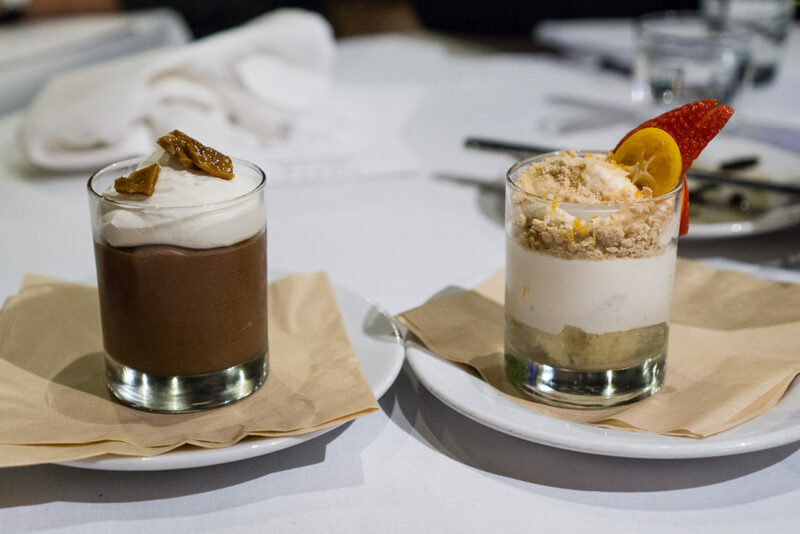 If you’ve had them at Tin Roof Bistro, you know this to be true. Back at the hotel, it’s Pen Shows After Dark time! 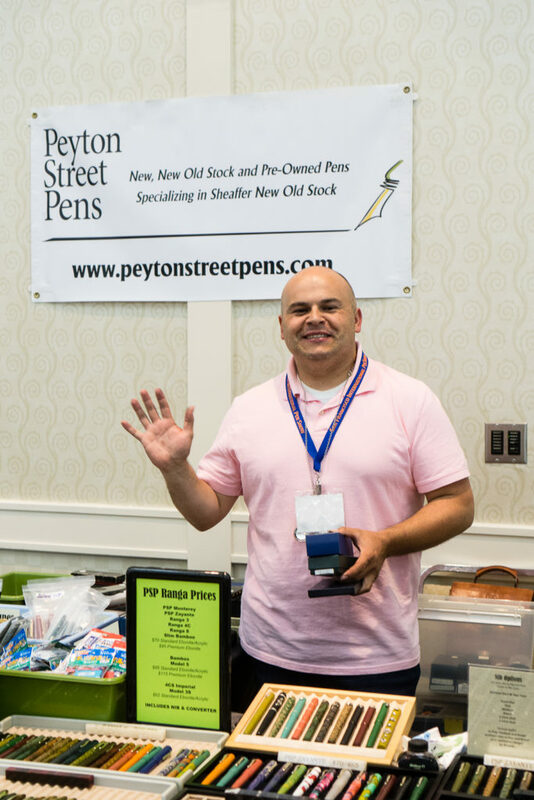 Pen Show Persona: Thanks to Sharon for taking this pic and thanks to Mike P. for the head gear! 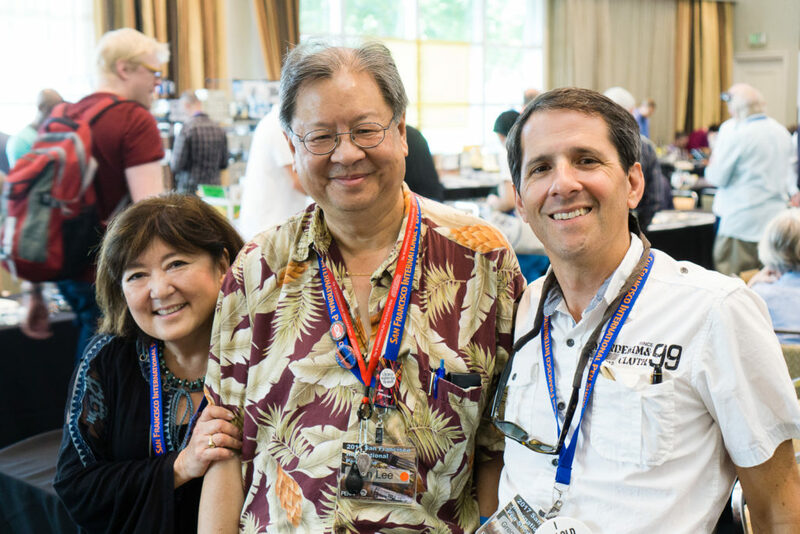 After signing up again at Mike Masuyama’s table, I did my walk around and found myself at Paul Erano’s table. Paul is the Grand Poobah of the secret-not-so-secret Black Pen Society. 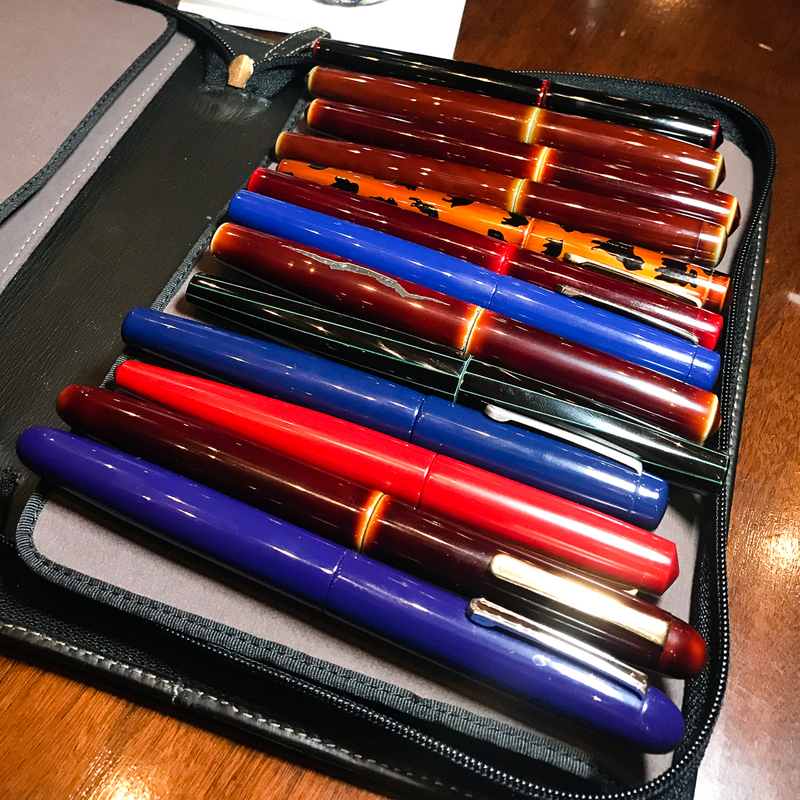 Paul Erano: Parker 65, Cross Verve, vintage Parker Duofold pens, and a modern Parker Duofold International in between them. 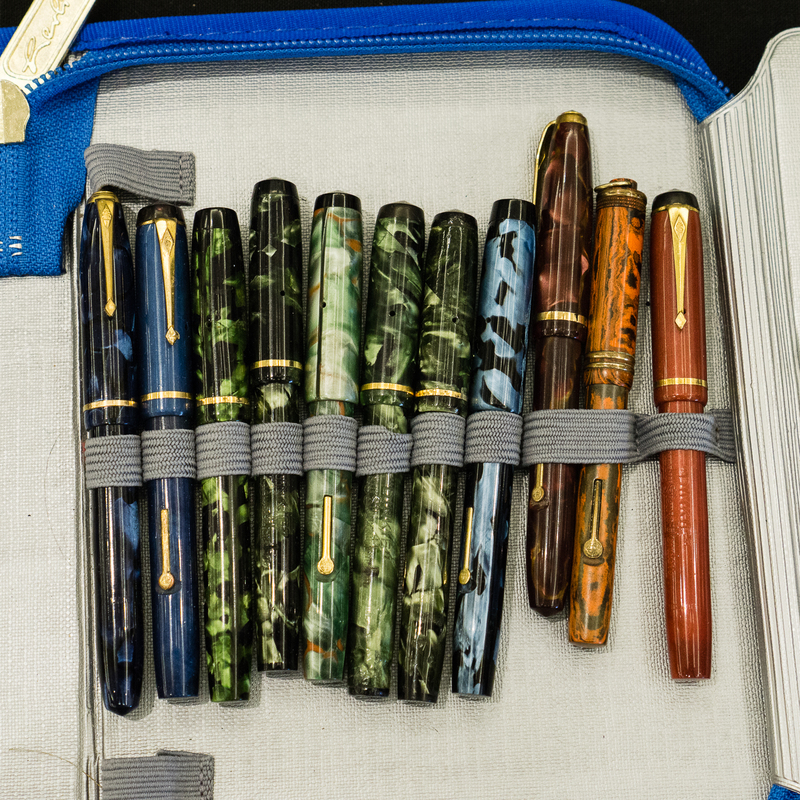 Paul Erano: An array of more pens. This year, I was fortunate to meet Jesi Coles at the show. She is one of the hosts of the B.Y.O.B. Pen Club Podcast and she also sells pens at shows or on her website. She is known for being a proprietor of vintage Esterbrook pens. 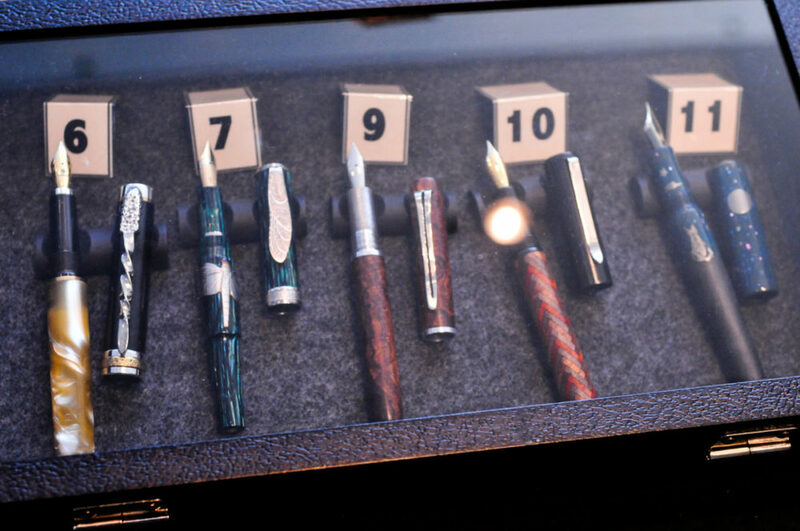 Jesi brought a nib tester display so people can try out the different nib types and sizes that Esterbrook had. This was pretty cool! 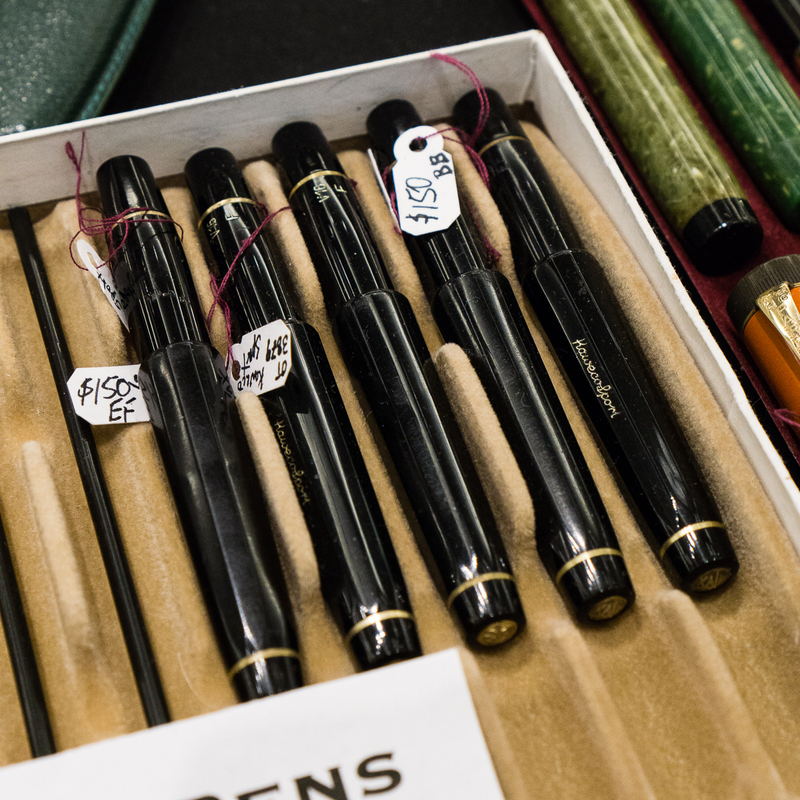 Visited the Peyton Street Pens table and found some vintage Pilot Pens from the 1950s. Sent my friend photos and a message if interested, and boom! 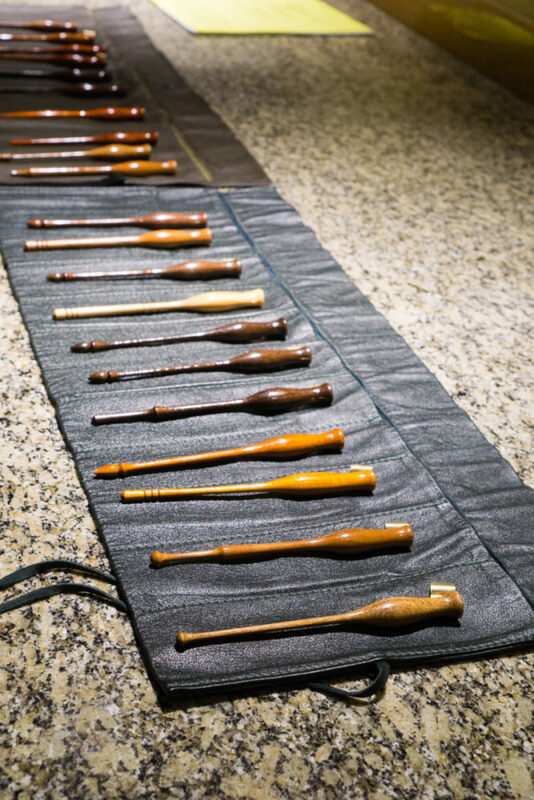 Pen show muling… done. OPM points! 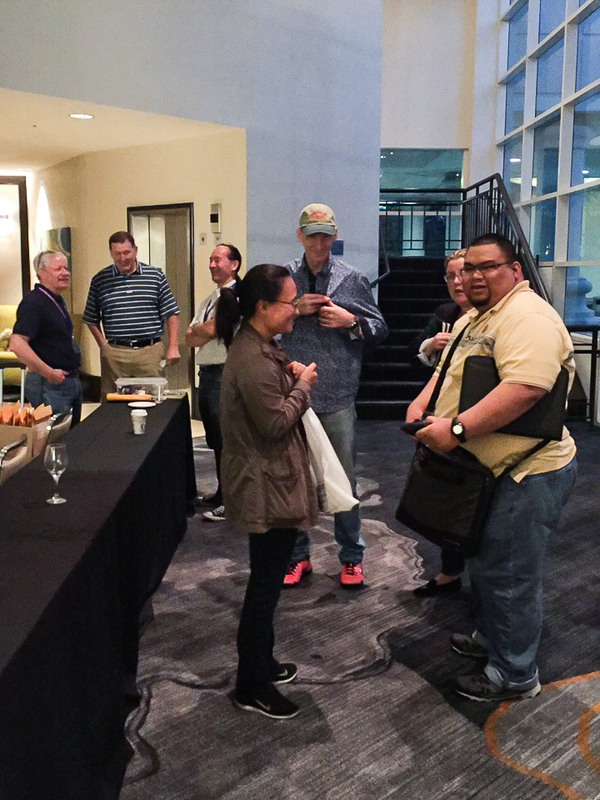 Afterwards, I went up to the hotel’s mezzanine level to attend two seminars. This was my first time to sit in a seminar in LA. The first seminar was about writing books on pens by Mr. Andreas Lambrou. 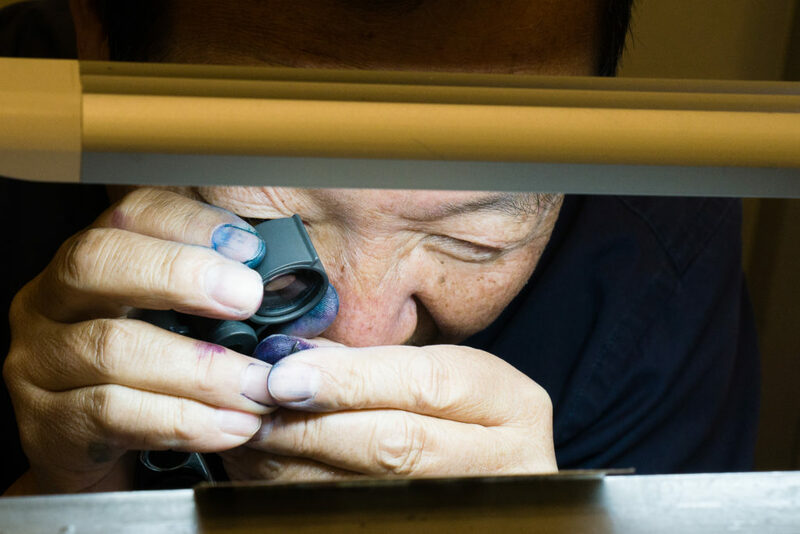 He described his process when he was starting to write his Fountain Pens of Japan book as well as the Fountain Pens of the World. I was so into his topic that I forgot to take a photo. 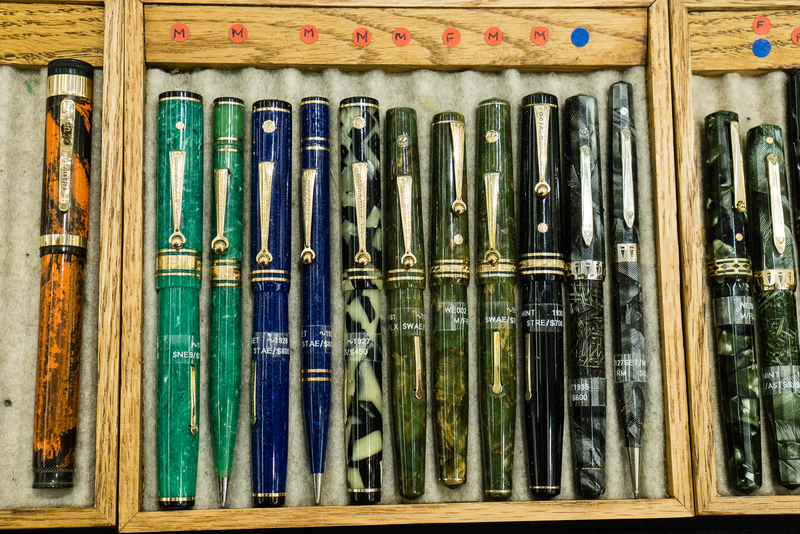 The second seminar was about fantastic nibs by Mr. John Mottishaw. 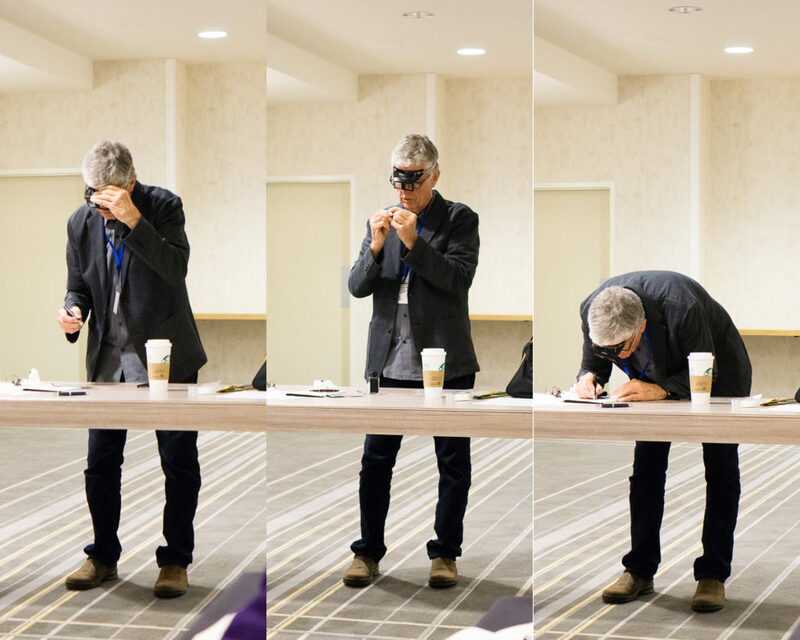 He was demonstrating how to tweak nibs to make it write a little better. 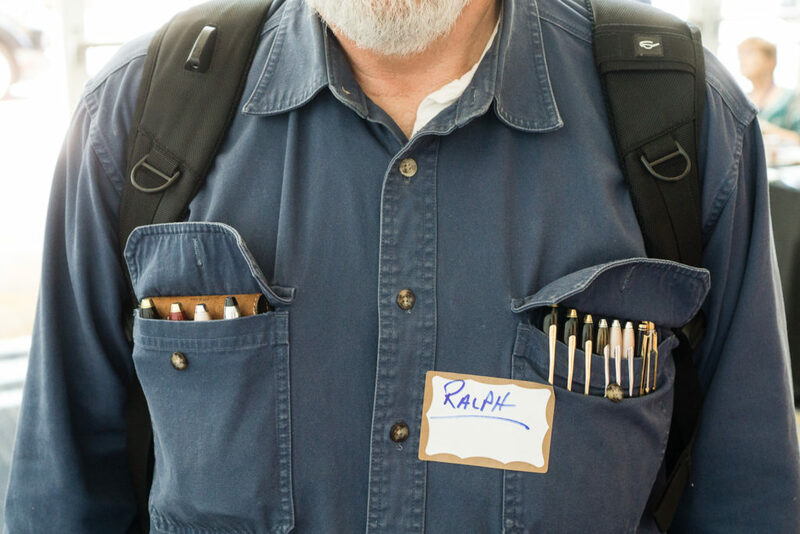 He asked people to bring up pens that didn’t write quite right and showed them simple tricks to make it better. After the seminars, we stepped out for brunch at the Shake Shack across the street from the hotel. First time to have their food and it was good! 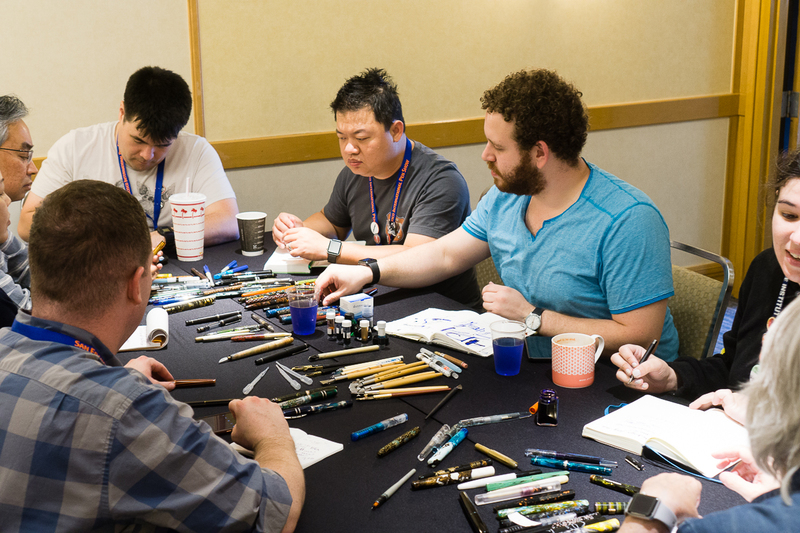 After brunch, it’s back to the show and I got to stop at the Artus Pens table and chat with Maxim. 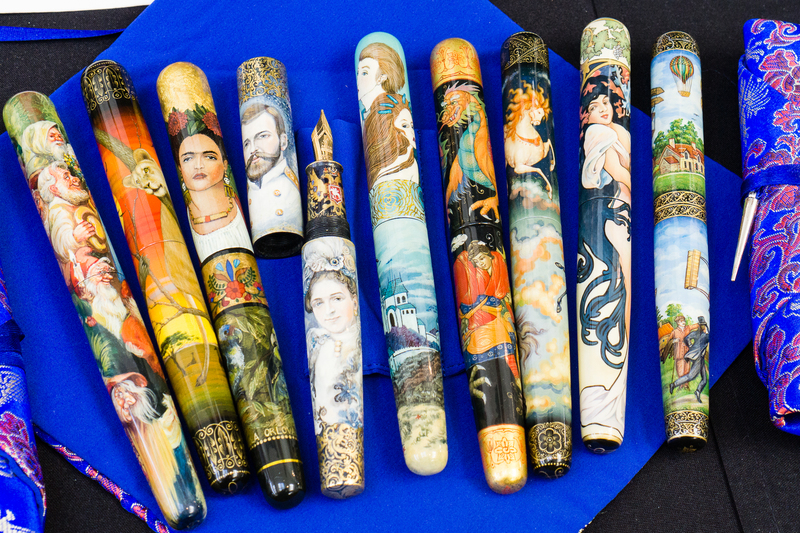 Artus Pen always has beautiful art pens painted by Russian artists. Their lacquer work is phenomenal and the artwork is just stunning. 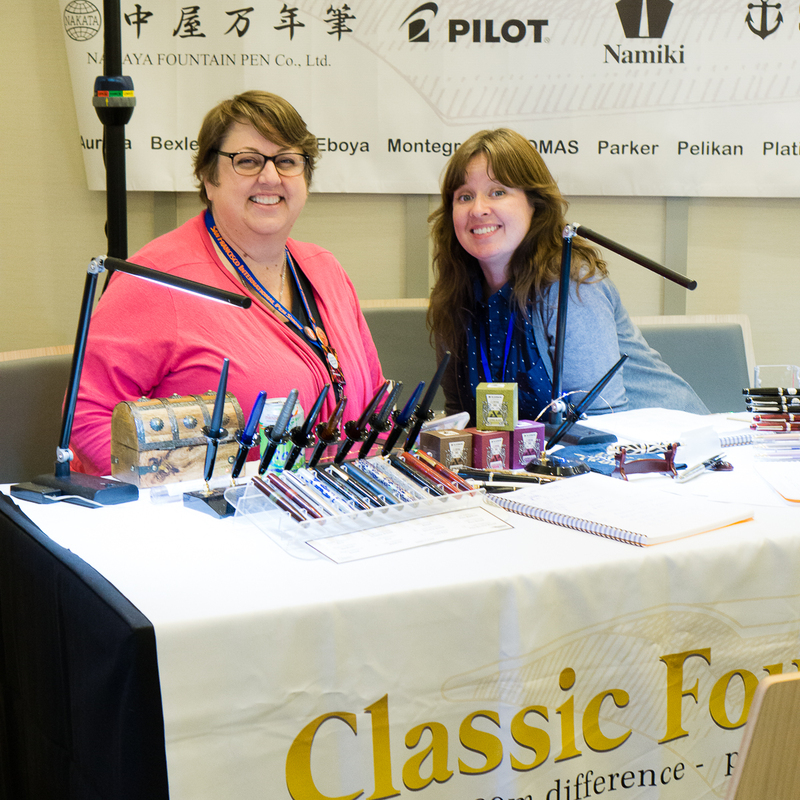 One of the usually busy tables at a pen show is the Franklin-Christoph team. I barely got to see them yesterday because of people being at their table so I took advantage of a slower moment on Saturday. 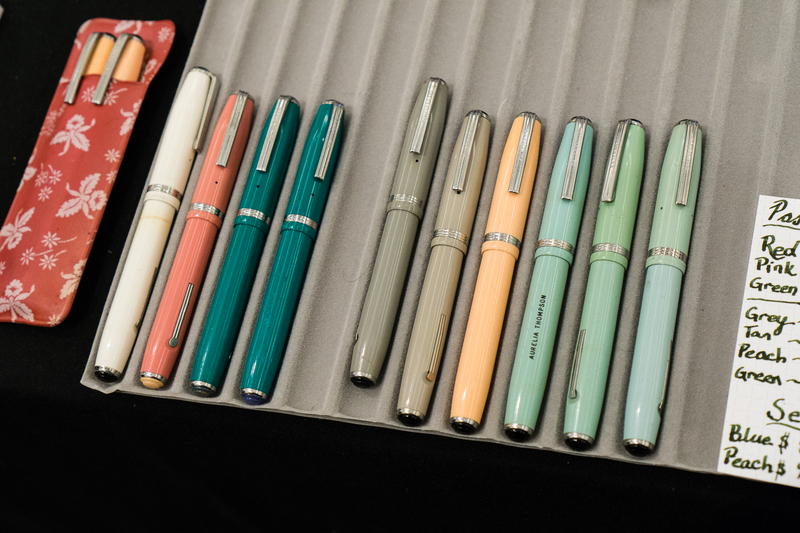 I got to peruse their show prototype pens and saw a “few” that I liked. 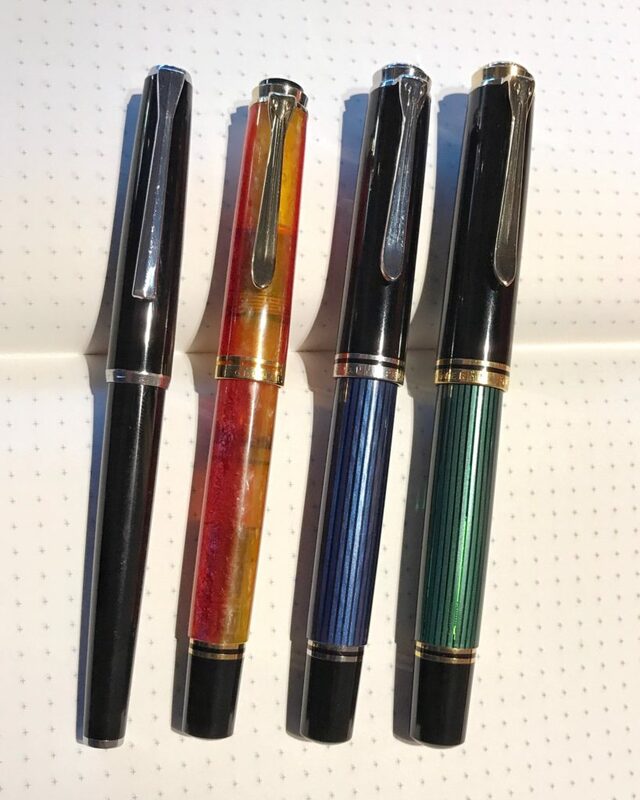 Vintage Pelikan 100, 100N, etc. 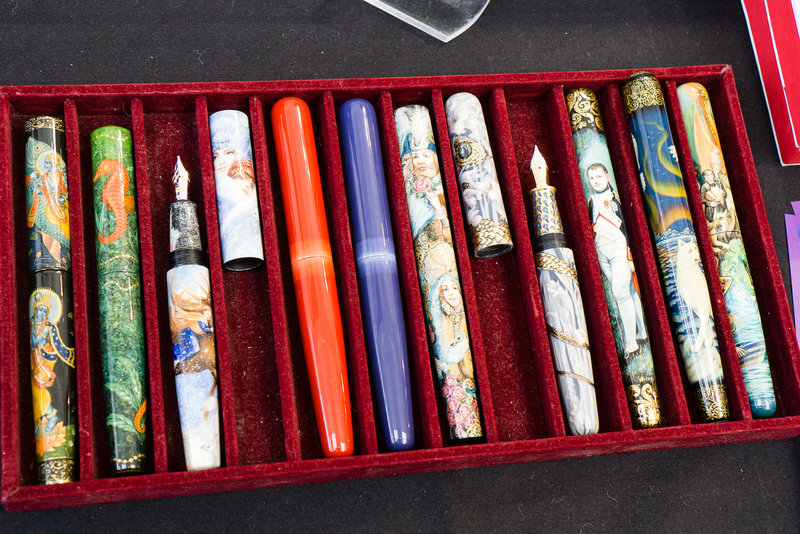 I saw Eric Sands of Atelier Lusso who was also at last year’s SF Pen Show. 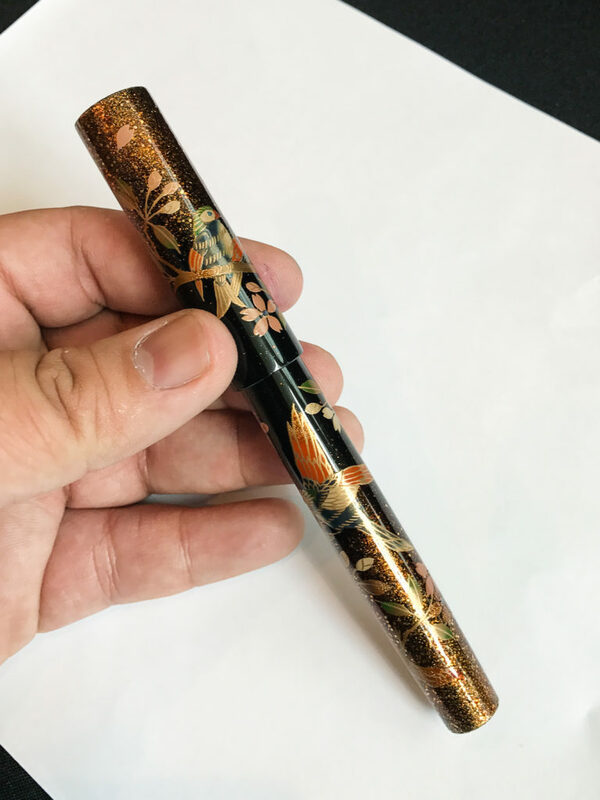 He is a pen maker and he does great work as well. The clips on most of his pens were fashioned by Eric himself. 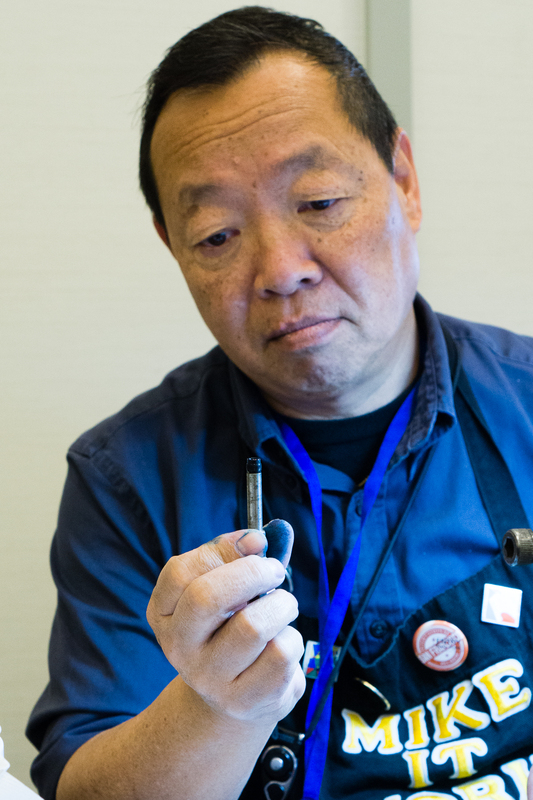 Back at Mike Masuyama’s table, Mike called me over and I had him do an italic grind on one nib as well as tune a vintage Pilot pen. A friend of mine was listed before my turn but had to leave the show so he entrusted me with 2 of his pens for Mike to work on. 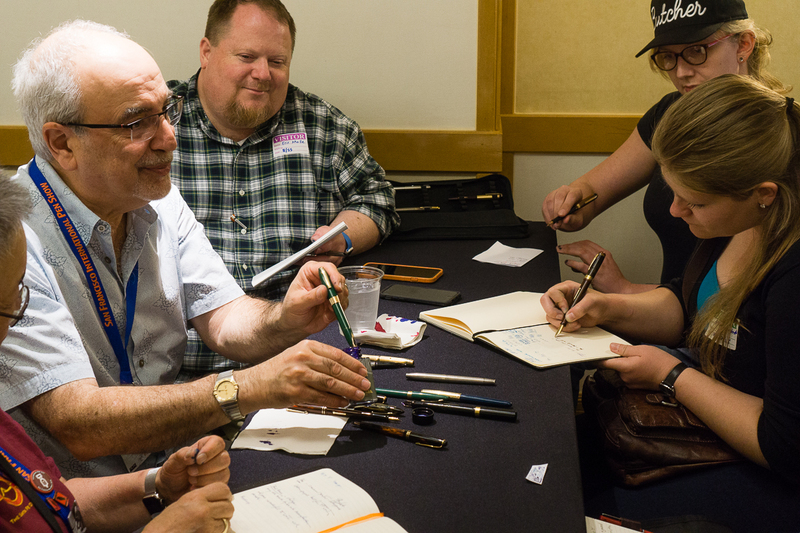 I spent a little over an hour sitting and chatting with Mike and other pen friends who walk by. 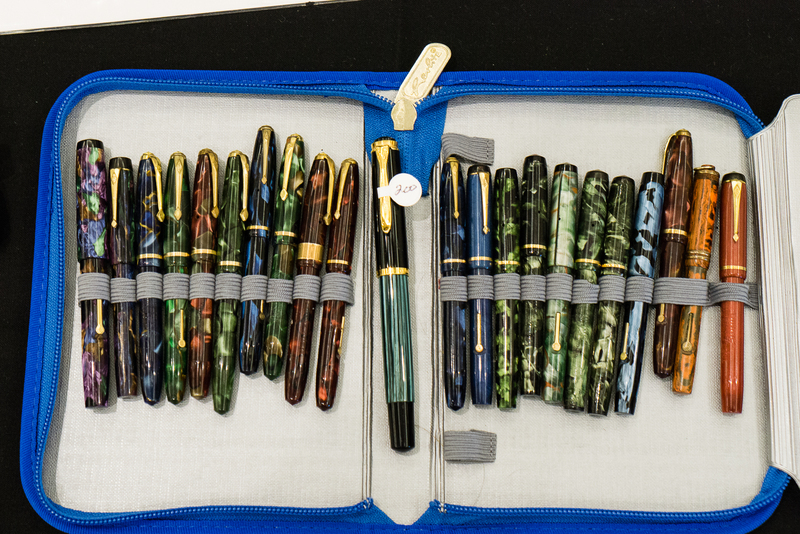 This is one of the best ways to spend a Saturday afternoon at the pen show. After sitting with Mike, I walked around once again and just enjoyed the rest of the afternoon. We went to dinner just outside the hotel and came back to “The Tent” for more hanging out. A friend of mine showed me her newly purchased Franklin-Christoph Model 65. We were admiring different pens with my LED light panel then something happened. 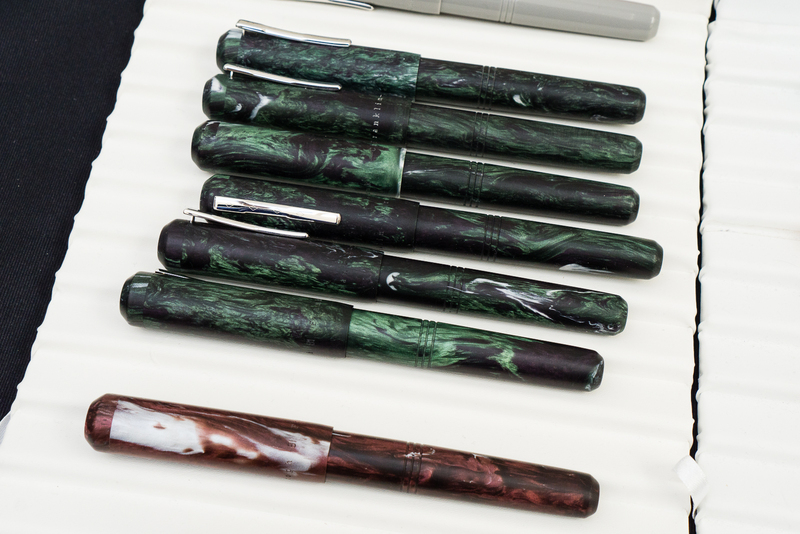 A certain brand of urushi lacquered pens kept on appearing under the light and we decided to take a family photo. 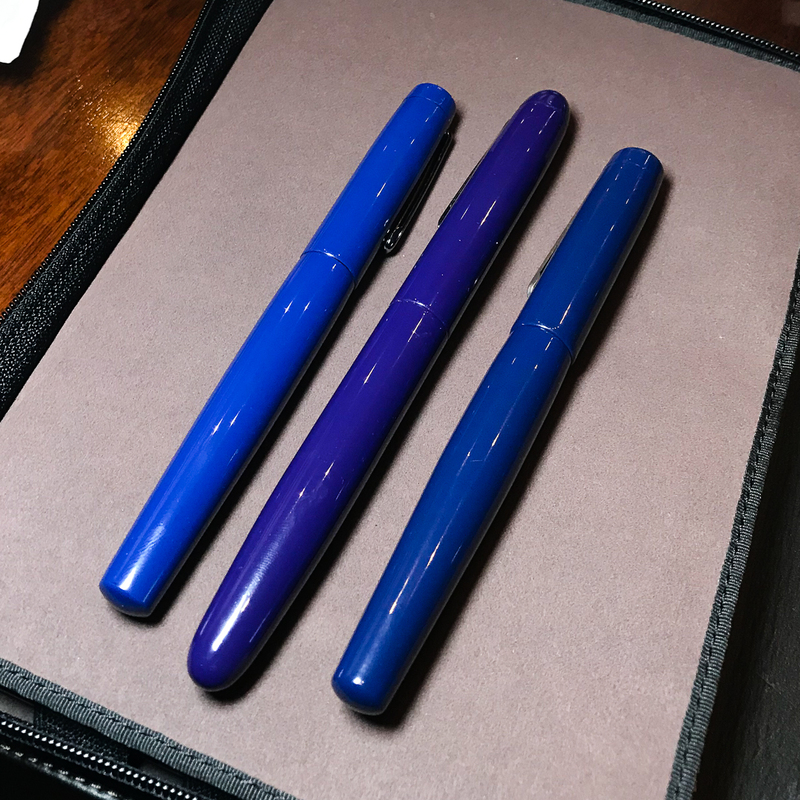 Kikyo (Blue) Urushi on 2 Neo-Standards and a Long. 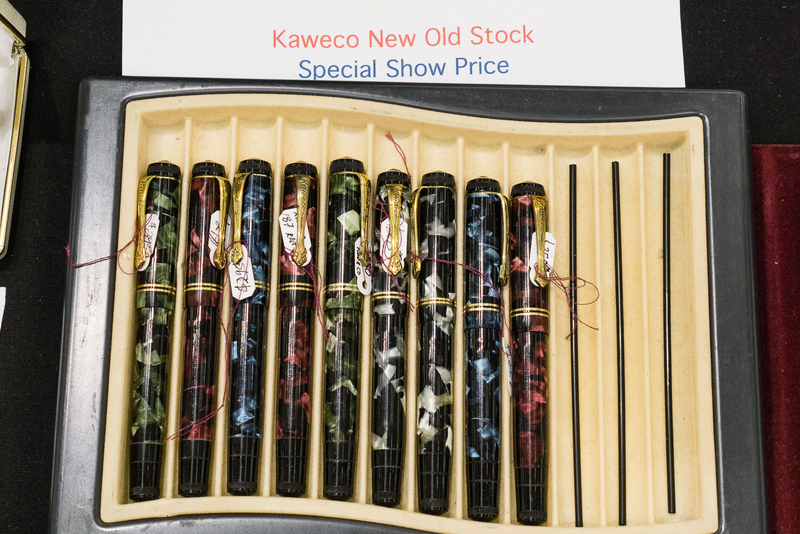 We were discussing how the kikyo finish was different among the 3 pens. Pretty interesting! Called it a night and went to bed. Sunday is the busiest day and I am helping out at a table so I had to get some rest. The show opens to the general public by 10:00am so the Trader Pass holders had 2 hours of last minute shopping before the crowd gets in. I took advantage to take a few photos before I had to work at a table so here are some photos as I walked around. 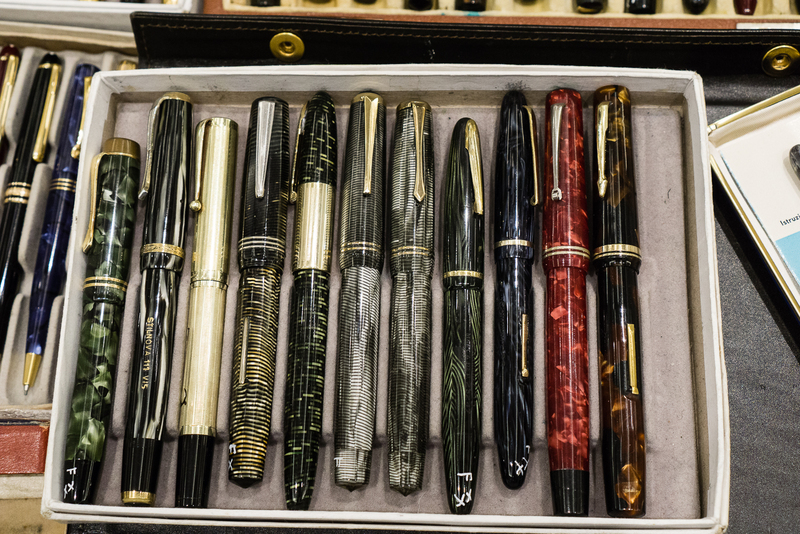 The Classic Fountain Pens table. These ladies took care of all the customers over the weekend. 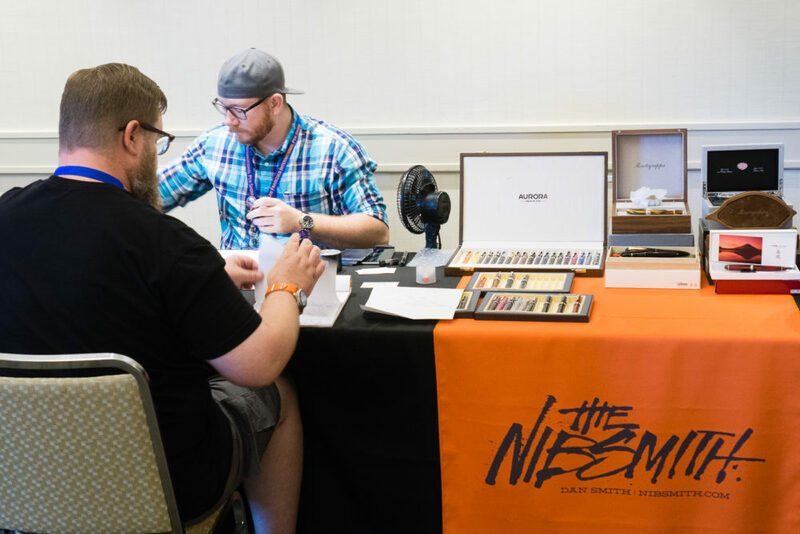 They answered questions about the pens as well as nib grinds. Thank you! The PENguin Rick Propas‘ table had a lot of pens for sale and these were a few pens that caught my fancy. He is also a “fountain” of knowledge about pens and is always willing to share it. 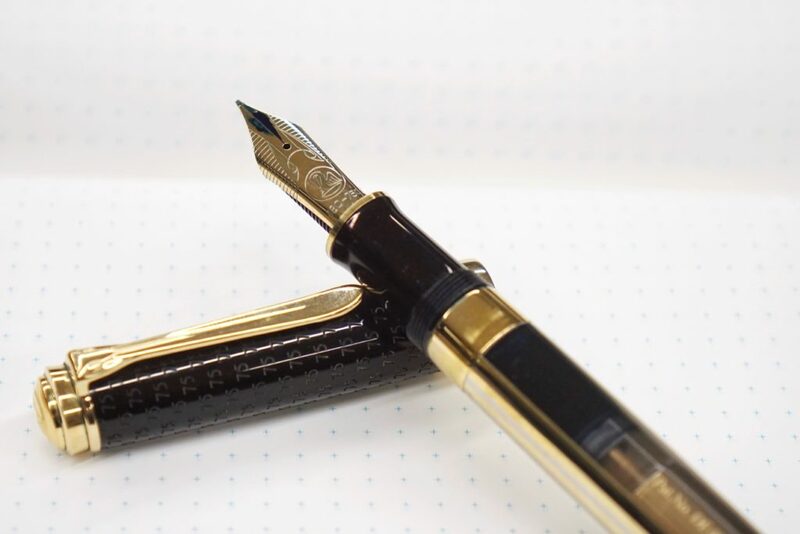 Vintage Pelikan 140 for $140. 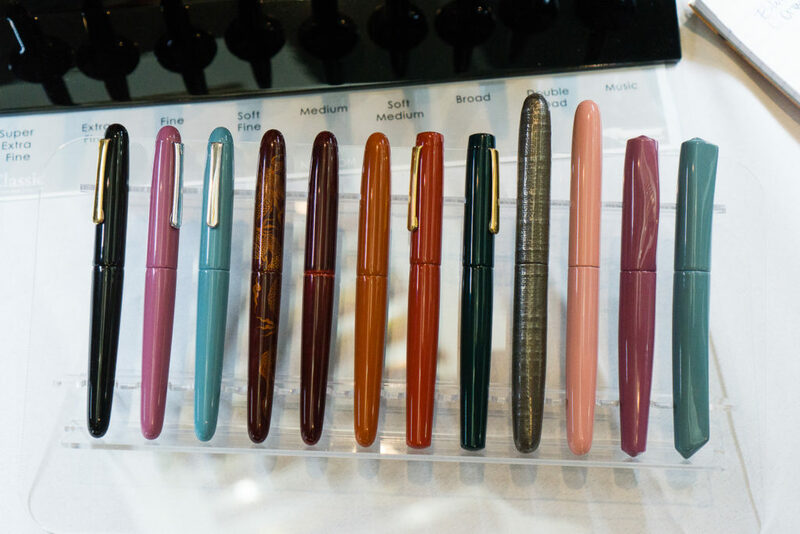 These are perfect starter pens for people who want to go vintage and experience a Pelkan pen with vintage gold nibs. 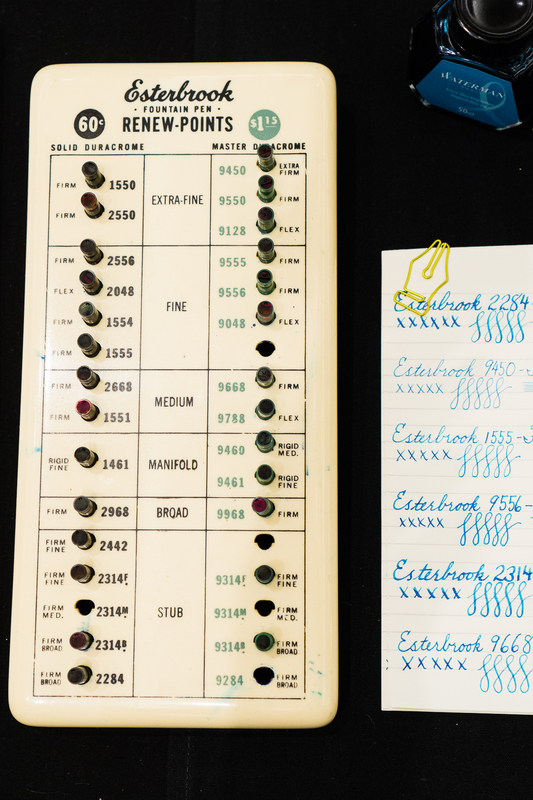 The box on the right were the 120 pens that usually sport a steel nib. 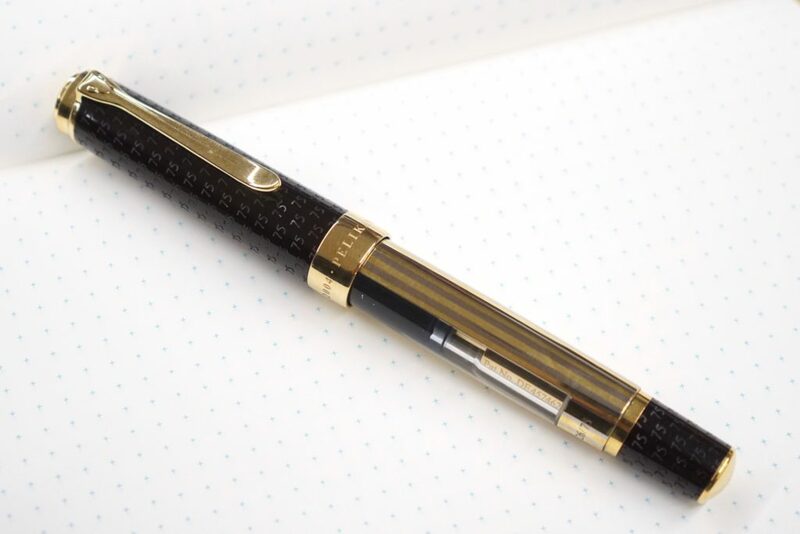 One of the more sought-after Pelikan pens is this M620 San Francisco from the City Series. 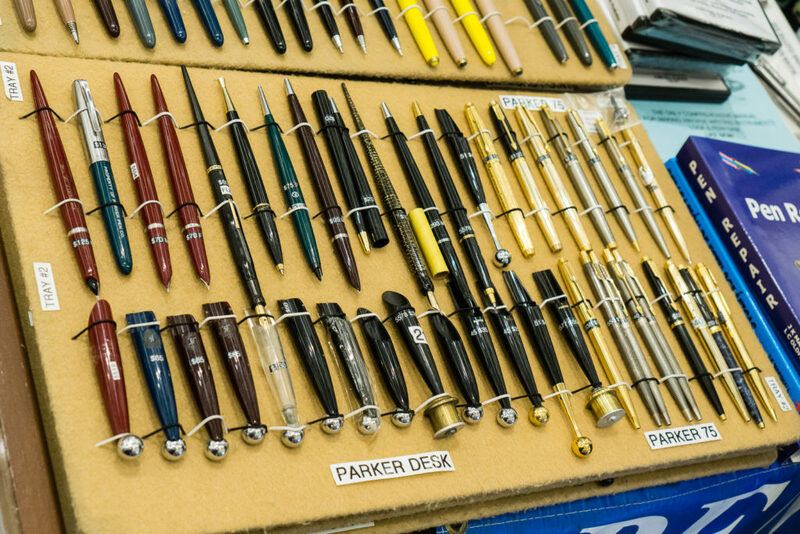 Rick also had a lot of vintage Parker pens for sale. I wish I had funds to just buy all of these. 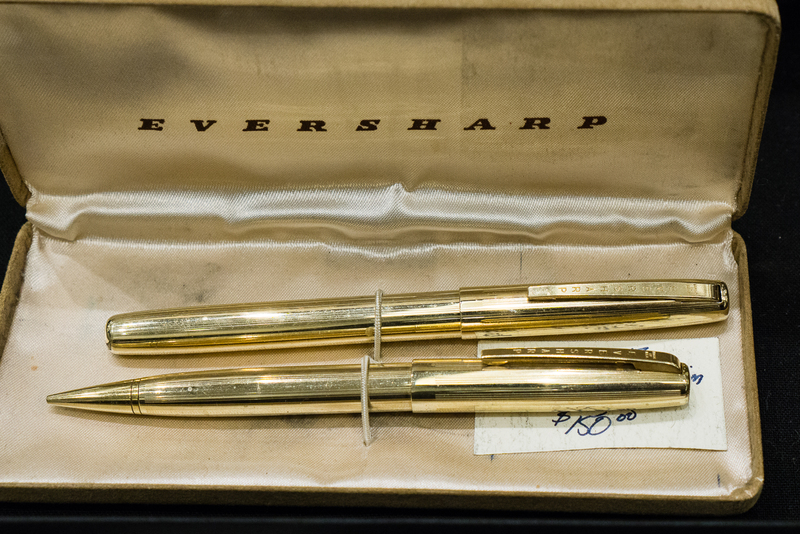 A nice gold-filled Eversharp Ventura set. 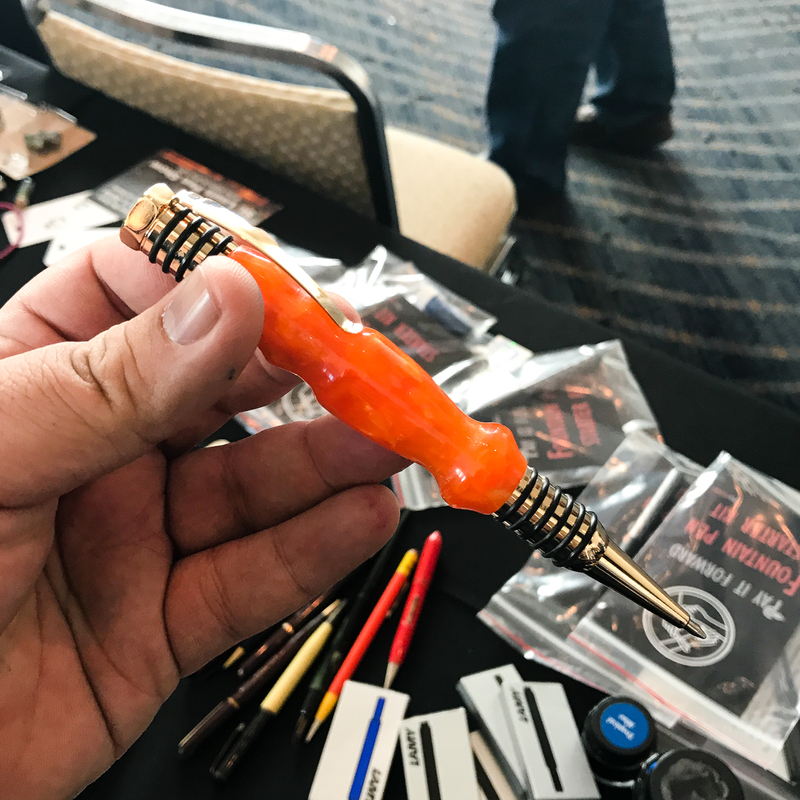 Pen shows have knives too! Judi was ready with her sweet smile and to give away sweet candies! 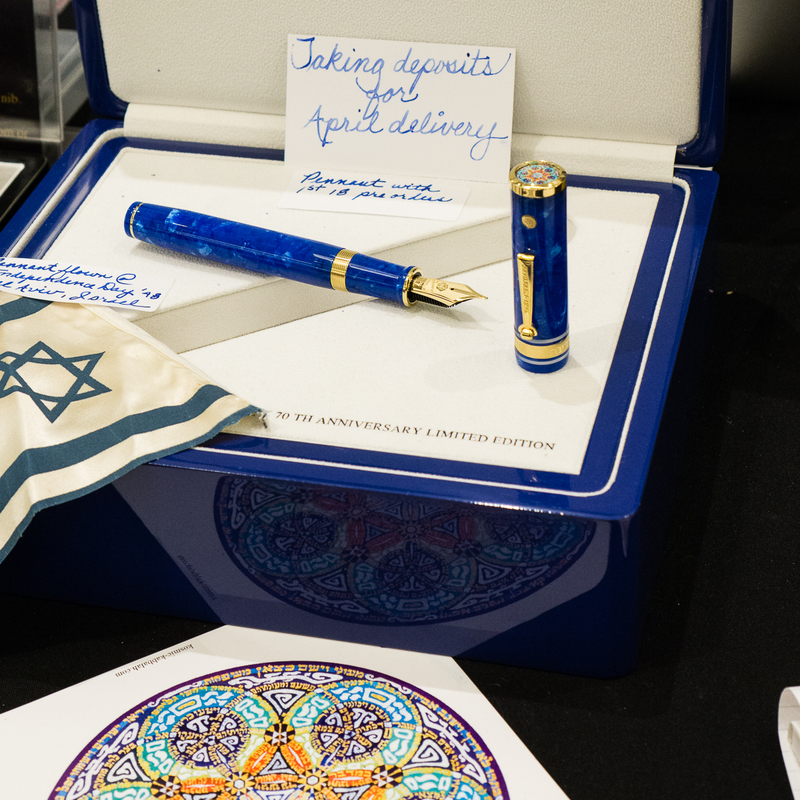 Wahl-Eversharp Decoband Israel. That blue material is fantastic! Frank and Sam Fiorella. Two of my most favorite people. 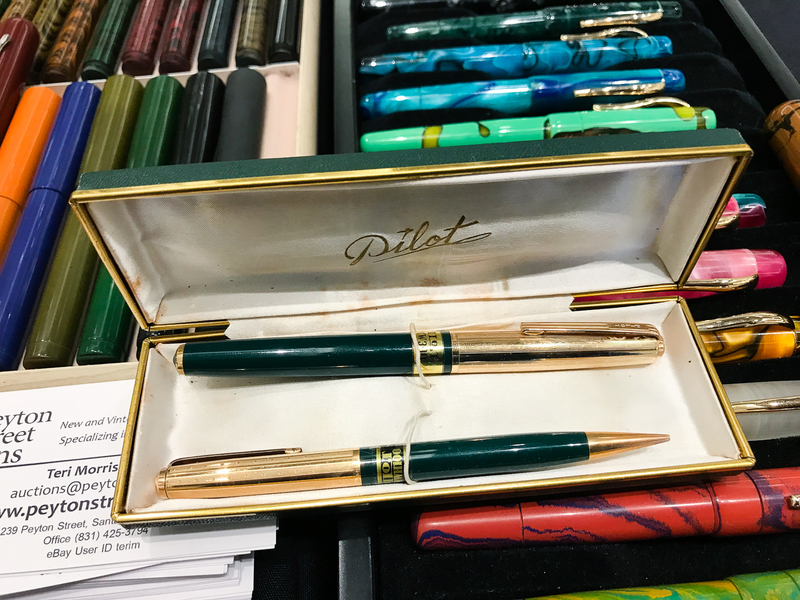 Bill Weakley’s table had beautiful discontinued Pelikan pens for sale. 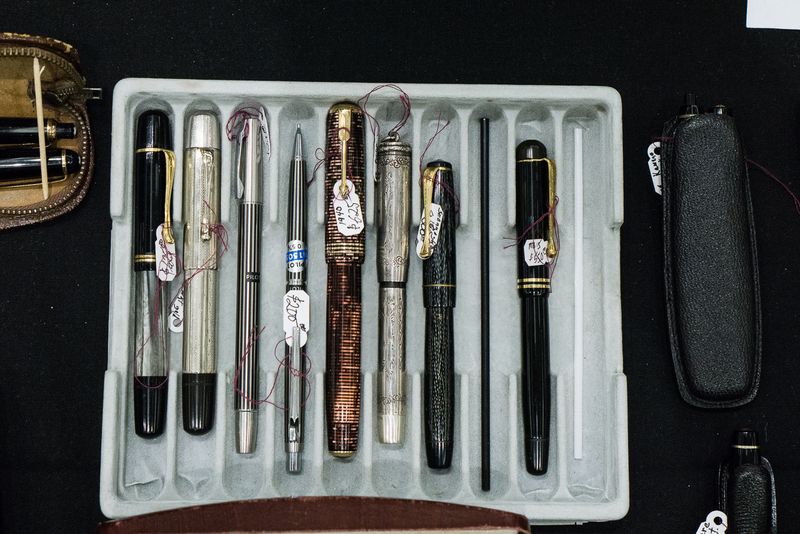 The Andersons always brings paper, pen cases, pens, and inks to the shows. 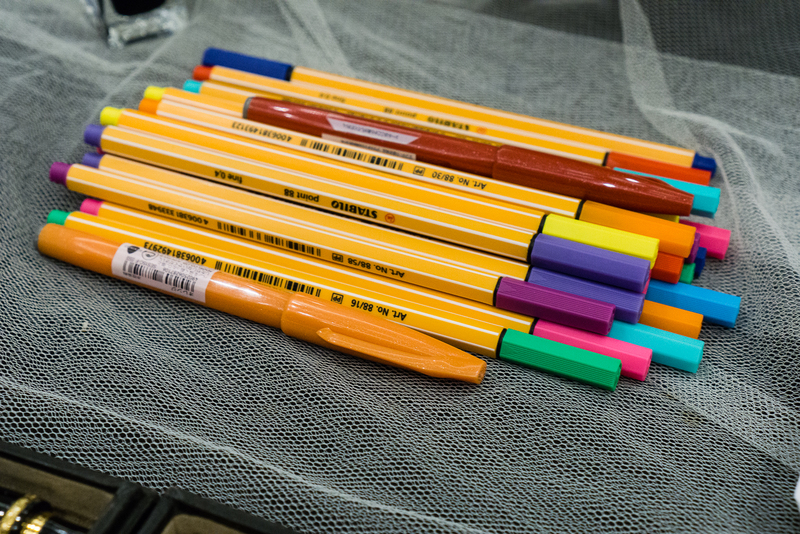 Not just fountain pens… Stabilo markers found at Carla M.’s table for kids attending the show. Ray Walters from the United Kingdom was at the show as well. Alright, 10:00am arrives and the crowd is let in. I didn’t get to take photos of the line this year but it was pretty long as usual. 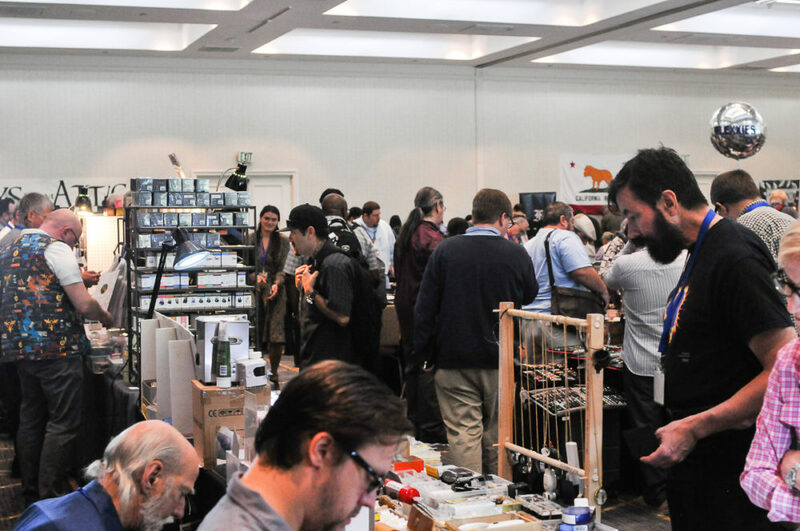 Having one public day at a pen show honestly causes the big rush. Sometimes people wish that public was allowed to get in on Saturday as well. Will that change? Maybe. Not sure. I hope so. Anyway, here are my shots of the ballroom while I was helping out at a table around 10:30 so the full force of people haven’t really cleared the line yet. Around 1:00pm, the crowd let up a bit and I got a chance to walk around and do a live Instagram video once again. Enjoy! 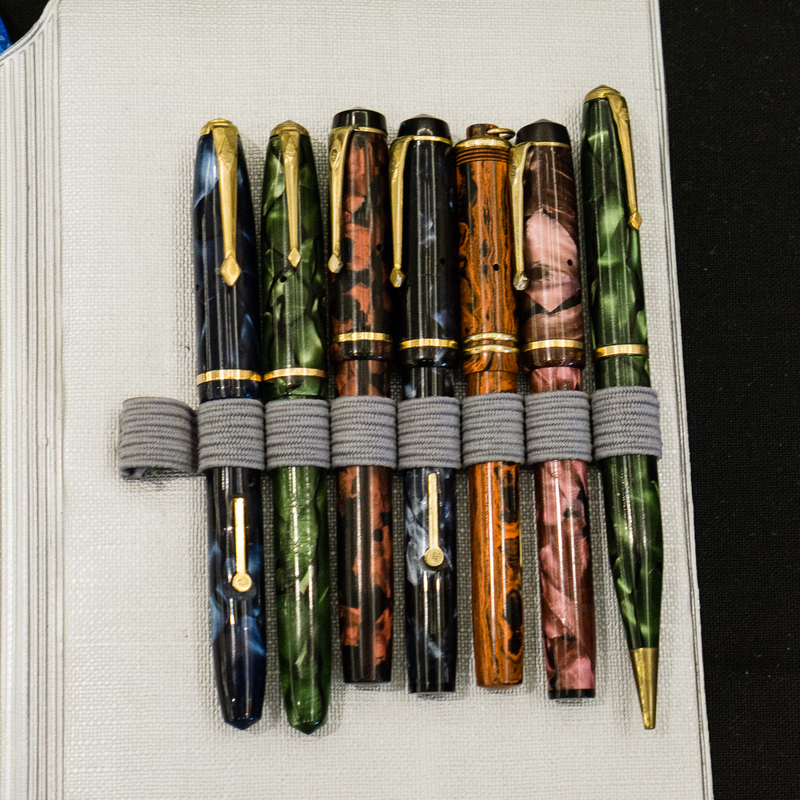 And with that, 5:00pm arrived and the 2018 LA Pen Show was over. Helped a couple vendors pack up, and went to dinner to end a tiring but fun weekend. As I’ve said before, pen shows for me have evolved into a social event and honestly is what I treasure more than what pens I bought. To all my friends, it was great to see you as always and to all the new people I’ve met, Instagram people I’ve finally met in real life, hope to see you all more often as well. Until next year! Thank you for your time in reading my report! Part of my pen show haul: Sheaffer Flat-top, Pelikan 300, and LA Pen Show journal from Vanness Pens. I also got my Pen Addict “MemberChip” given by Brad Dowdy. Gotta represent Susie Wirth too! 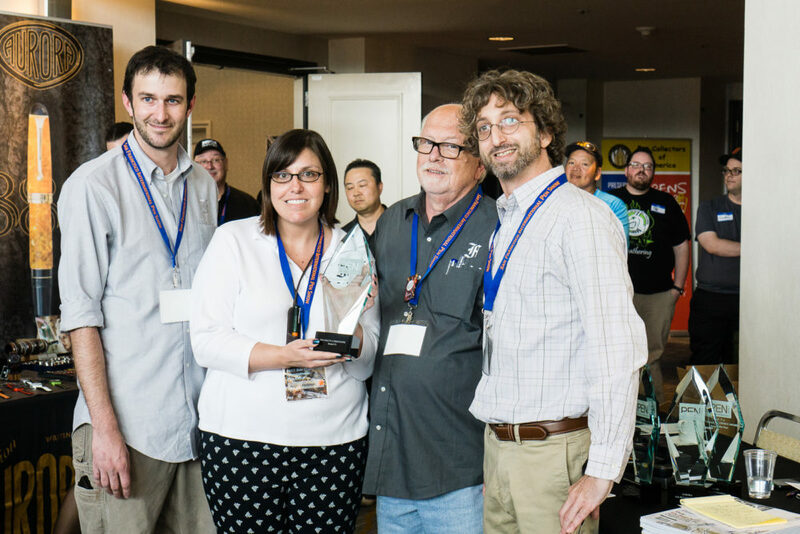 2017 Fountain Pen Day Giveaway Winners! Woohoo! 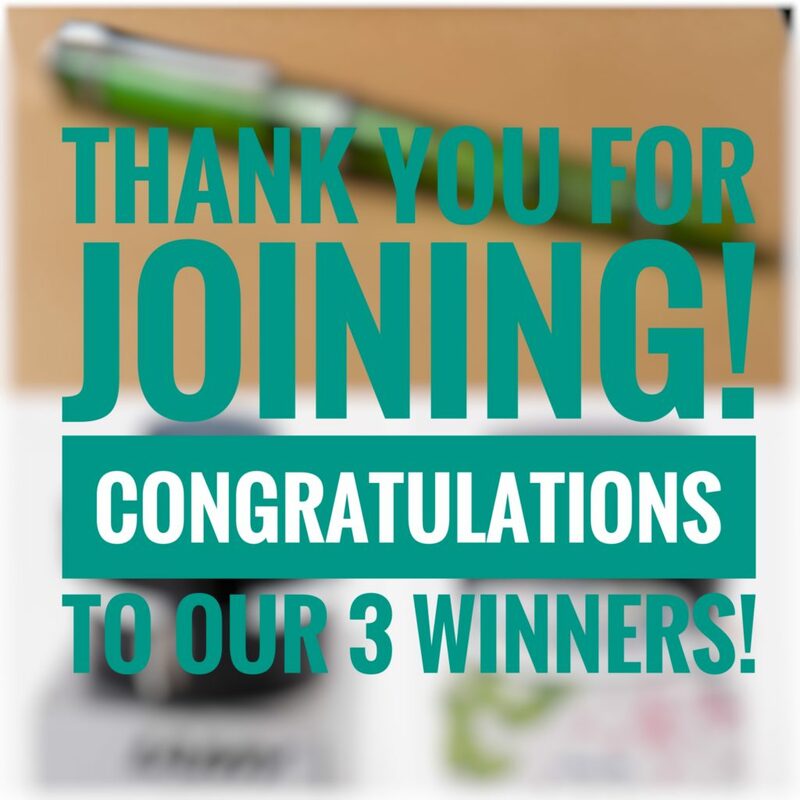 Congratulations to our 3 winners of the FPD Giveaway we held on November 3, 2017. The giveaway was open for anyone to join either via commenting on the blog post, or via Instagram. We had 184 entries and 3 were randomly chosen between the three of us. Thank you all very much for joining in and being a part of the awesome community! Congratulations again! Always have fun with your pens and inks! Until the next giveaway. 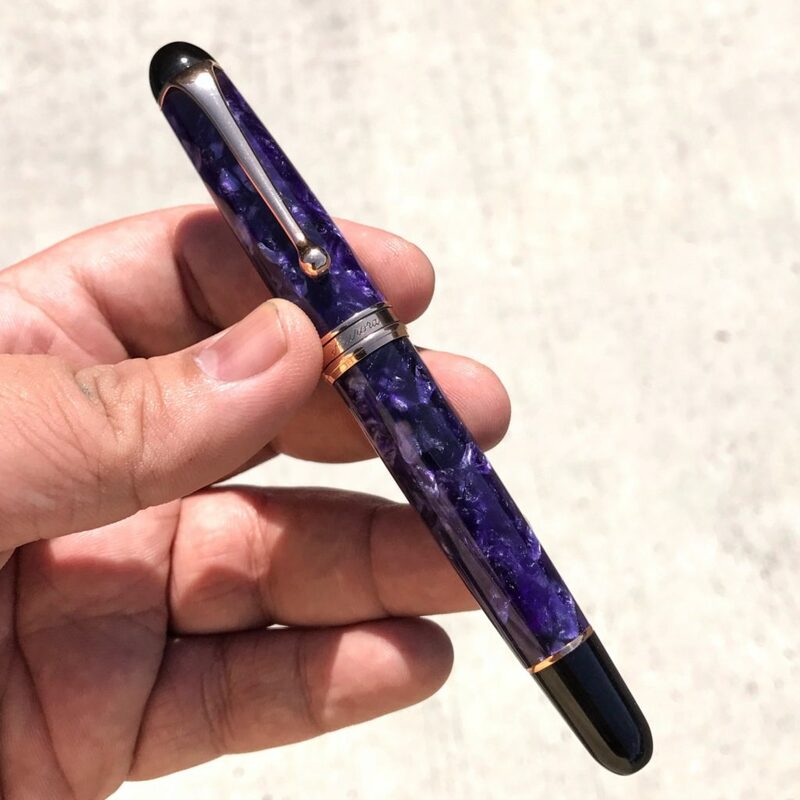 2017 Fountain Pen Day Giveaway! 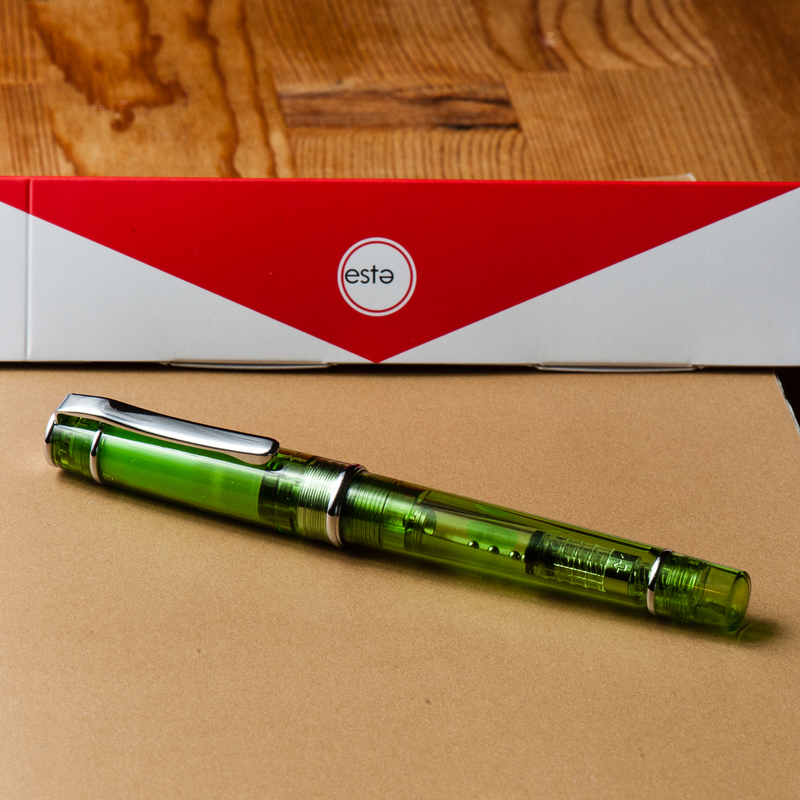 It’s that time of the year again — Fountain Pen Day! 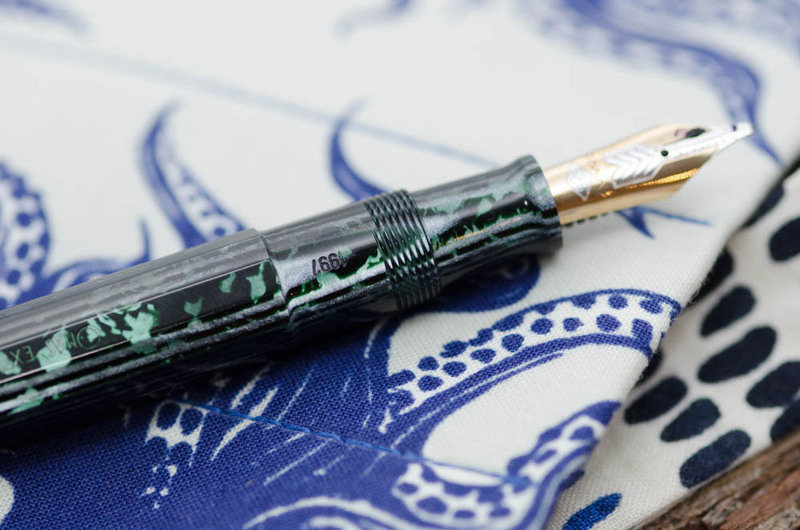 While we absolutely believe that every day is fountain pen day, the first Friday of November is quite special because we get to celebrate our favorite writing instrument throughout the world in unison. This is also a day or a weekend wherein different deals and discounts are offered by our favorite retailers. Check out the Sponsors tab of the FPD website for more info on these deals. More importantly, Fountain Pen Day is also a great time to share the joys of writing with a fountain pen to family, and friends! The giveaway is open from now, 11/03/2017 until 11/10/2017 11:59pm Pacific time. One entry per person please. The giveaway is open internationally, but we aren’t responsible for any taxes, customs fees or duties that may be applied, and will be shipping without tracking due to cost. 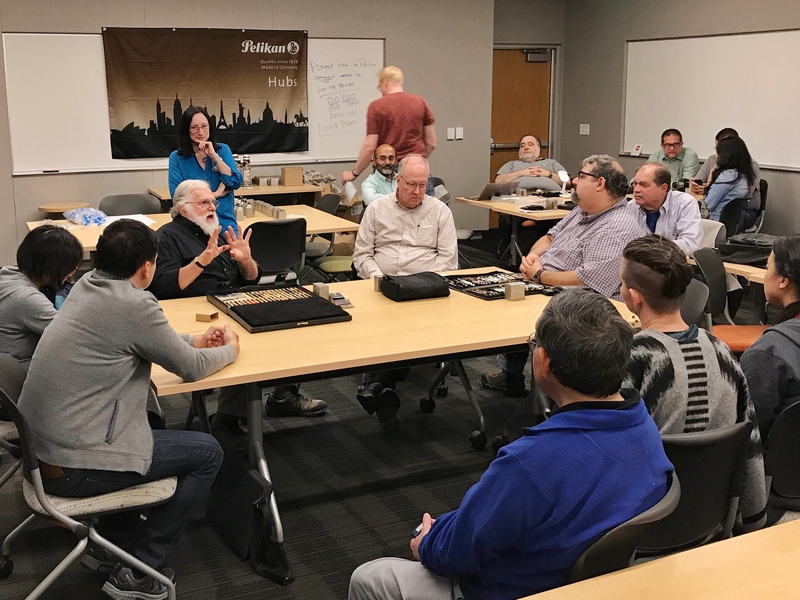 On Friday September 22, 2017, the Pelikan Hub for Palo Alto was held at the Lathrop Library in Stanford University. The Hub was organized by co-Hubmasters Lawrence C. and Glenn T. and it was definitely well organized. Thank you very much for a terrific event gentlemen! Hubmaster Lawrence speaking at the beginning. The person to his left was Hubmaster Glenn. 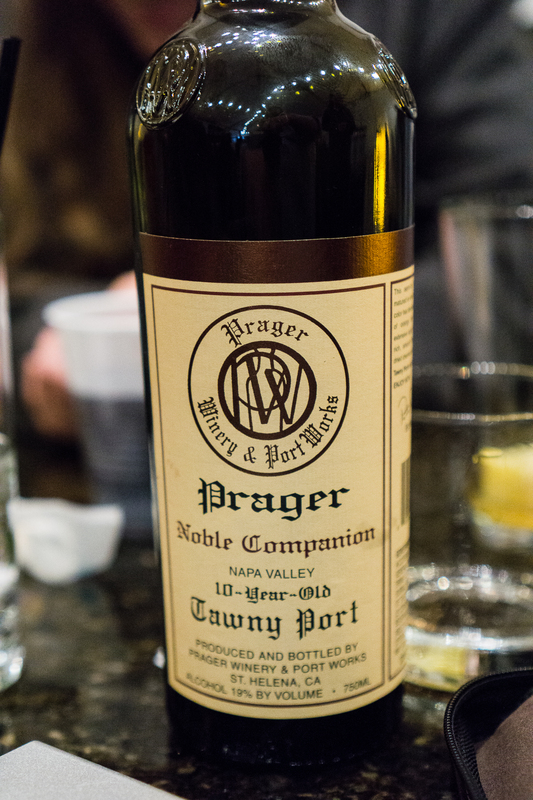 Our group had a mixture of members of the San Francisco Bay Pen Posse, and also members of the Stanford Pen Club. 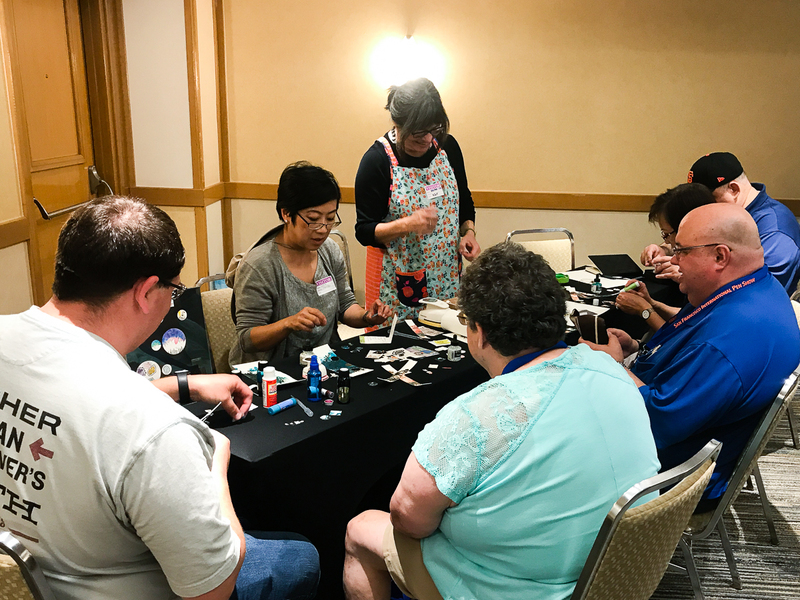 It was a nice gathering and I was happy to meet new people interested in the hobby. 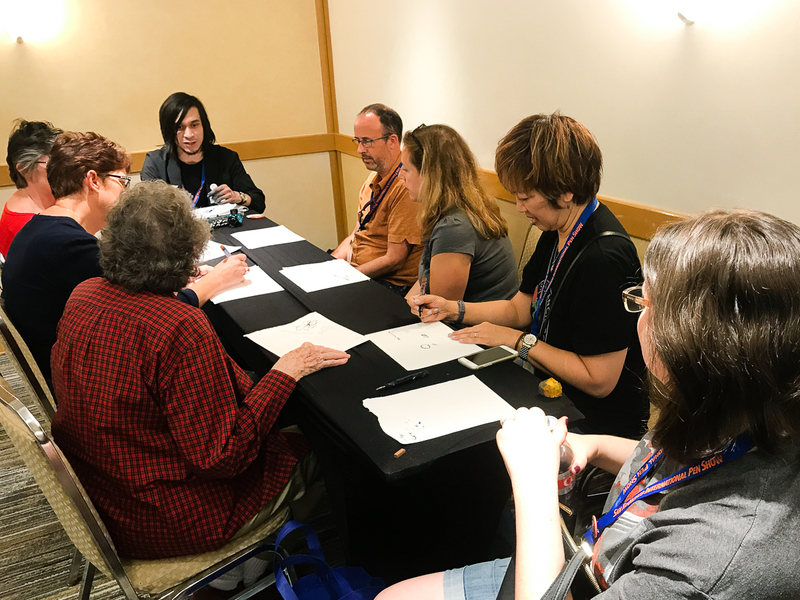 As we introduced ourselves around the room, I found that there were people into pens for about a month and up to about 40 years so it was an eclectic group and a lot of people shared their experiences and knowledge. 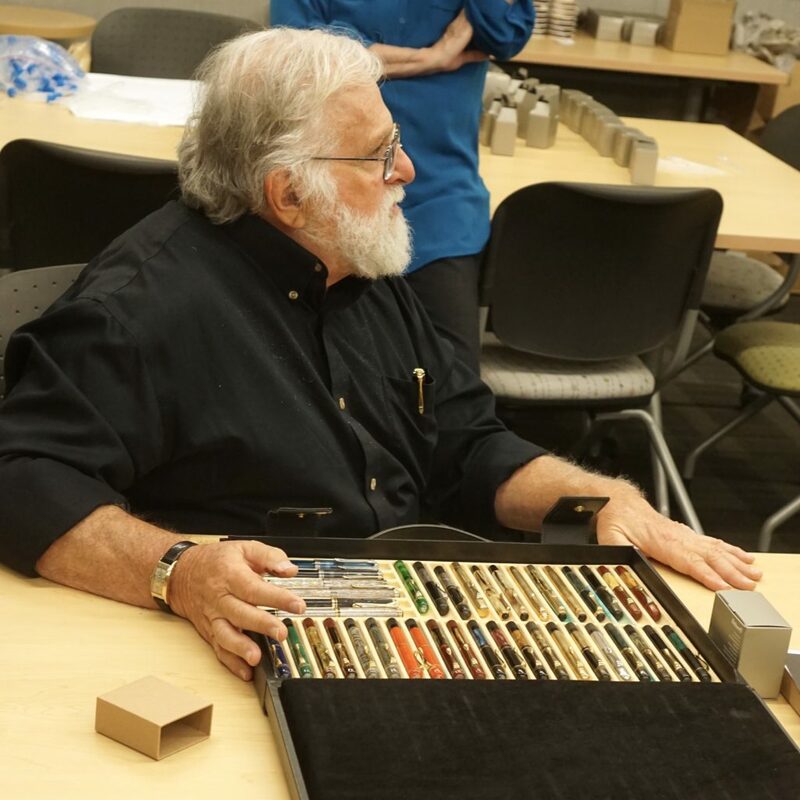 Speaking of knowledge, we were very lucky to have Pelikan pen expert, Rick Propas aka The PENguin, a part of our hub. 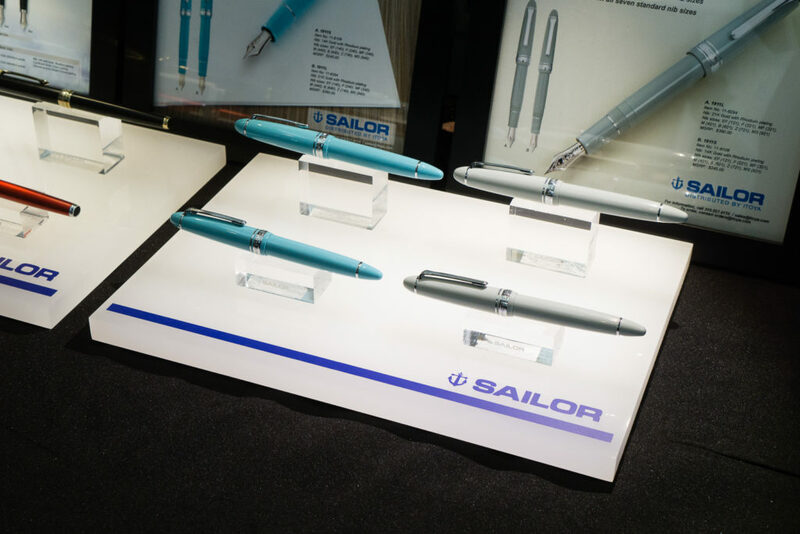 He had talked about the history of the Pelikan pen company, the first model Pelikan 100, and the evolution of the Pelikan pen models. 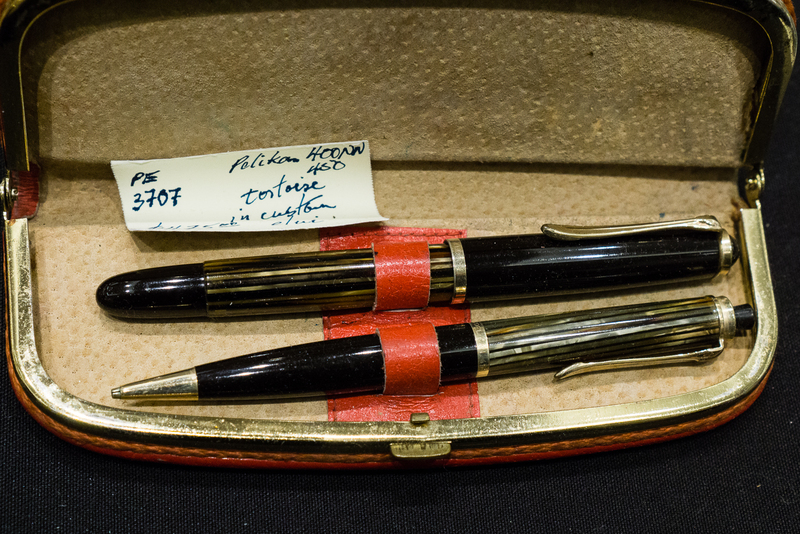 He showed a few rare, or one-off pens that are in his collection. I broadcasted an Instagram Live video and also uploaded to my YouTube account. 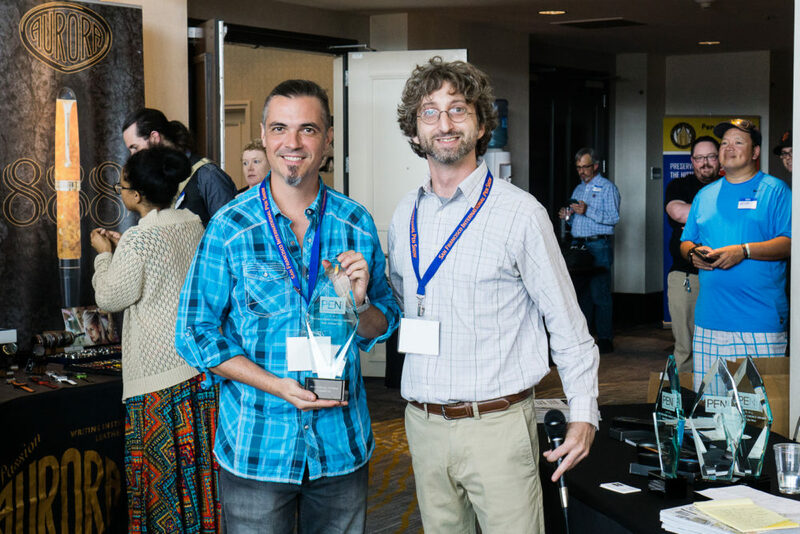 Rick imparted a lot of information and I am very thankful he had taken the time to do so. 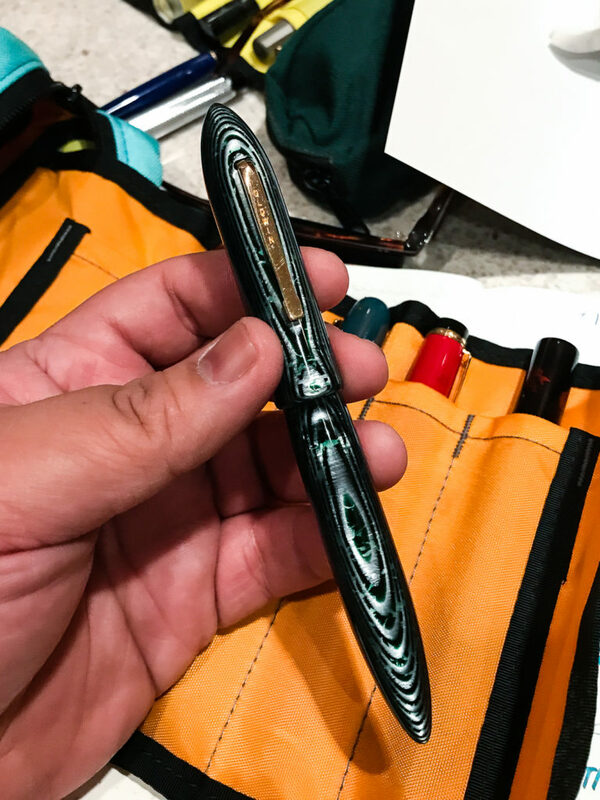 Rick showed his grail pen, the Pelikan 75th Anniversary. 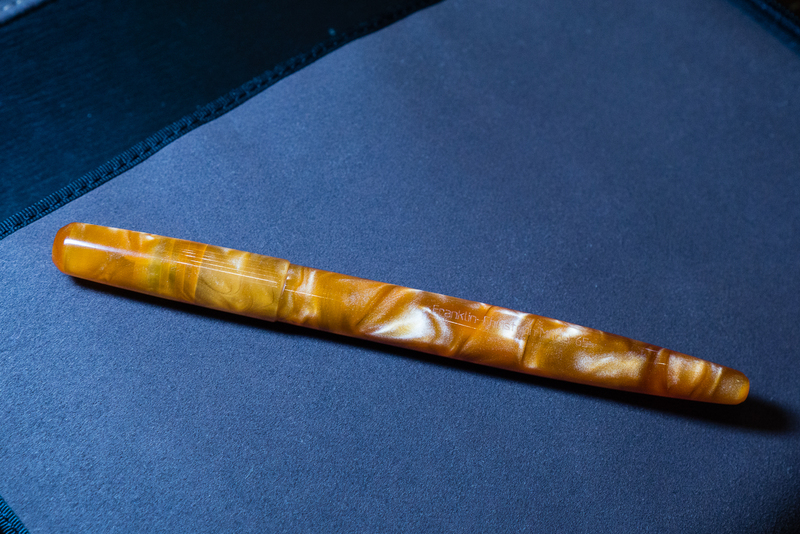 I got a chance to photograph this fabulous pen that evening. 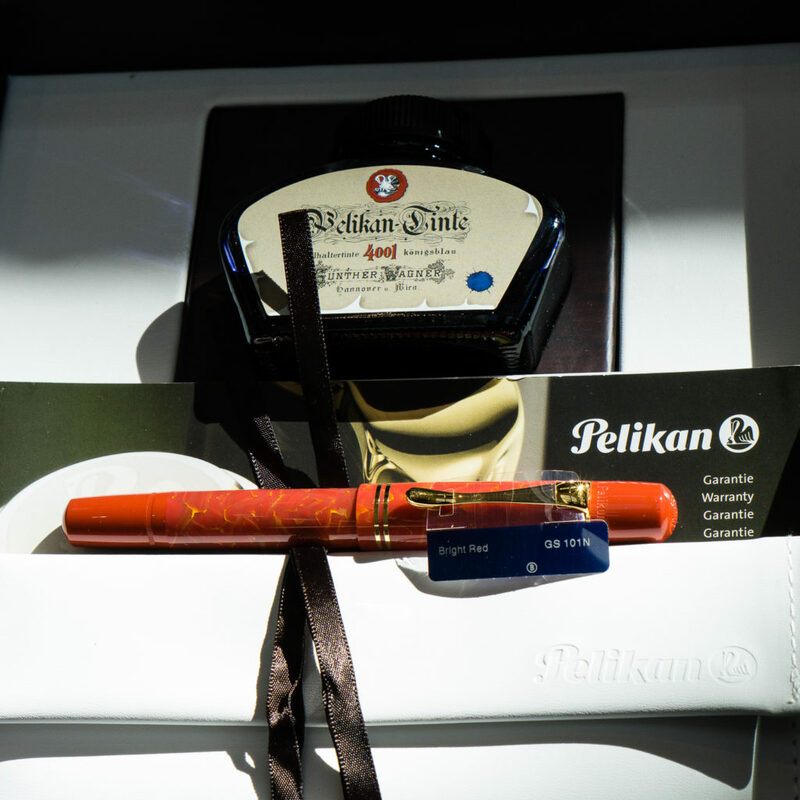 Show and Tell: Pelikan 75th Anniversary. Those yellow stripes are very different and distinct. 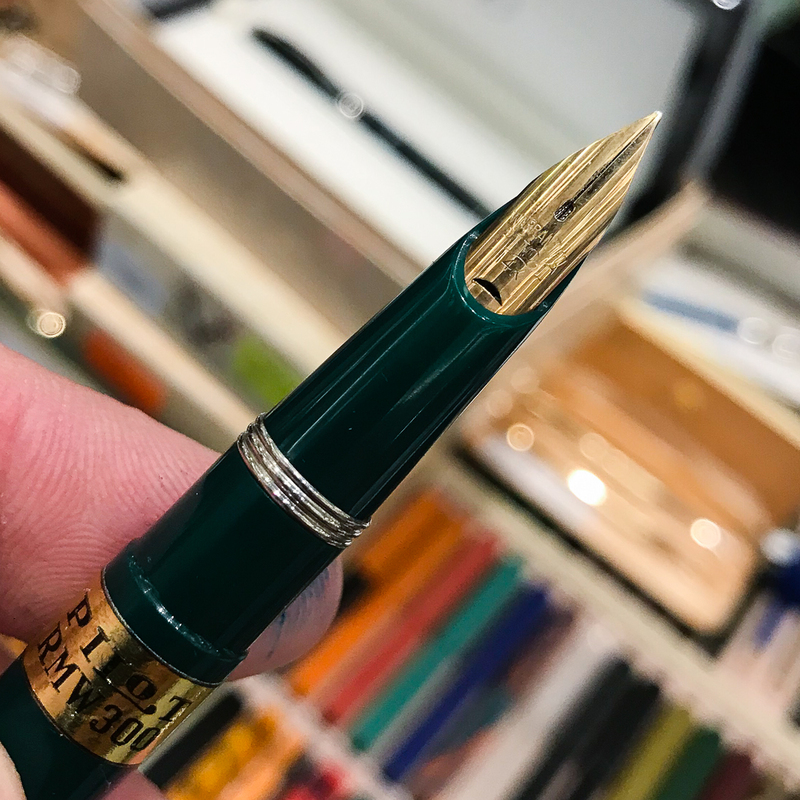 Show and Tell: The nib of the Pelikan 75th Anniversary is very unique. 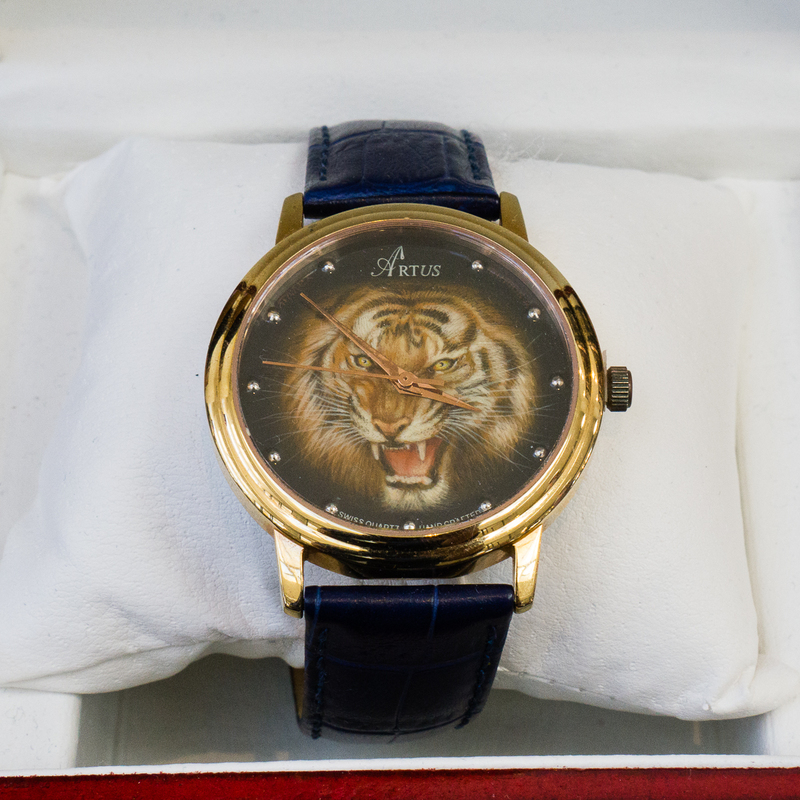 The “75” engraving was fantastic as well. 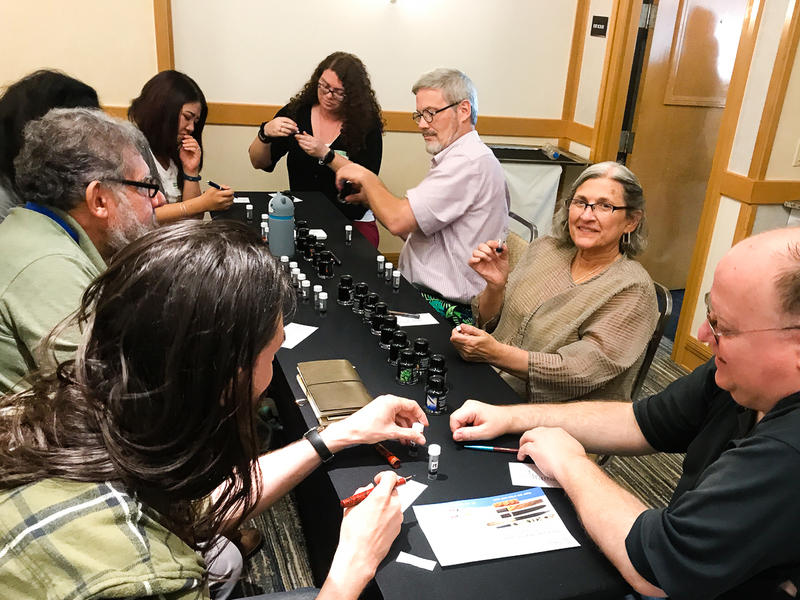 Lawrence and Glenn were given Edelstein ink bottles by Pelikan and they made it available for participants to take ink sample vials of. Here’s some of the bottles emptied out. 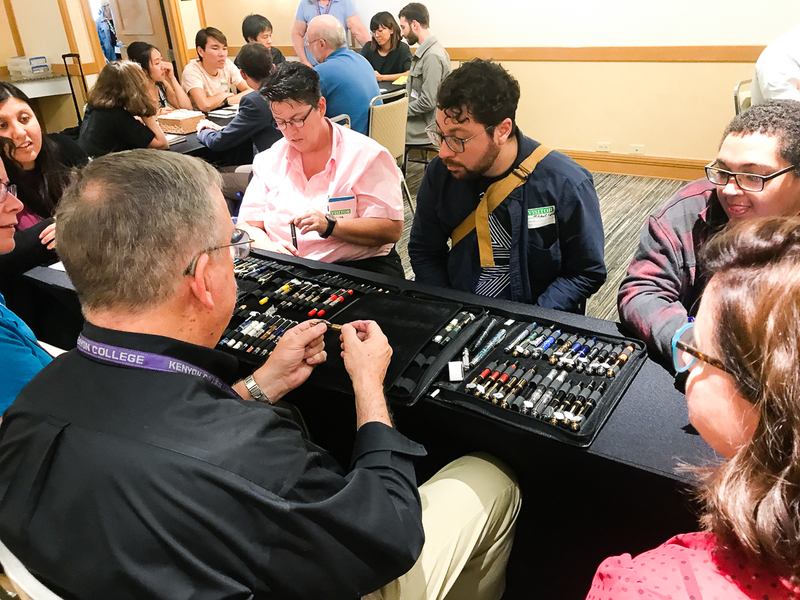 A big thank you to Pelikan for once again hosting the Pelikan Hubs around the world and providing an avenue for people to meet and learn about fountain pens and Pelikan pens! 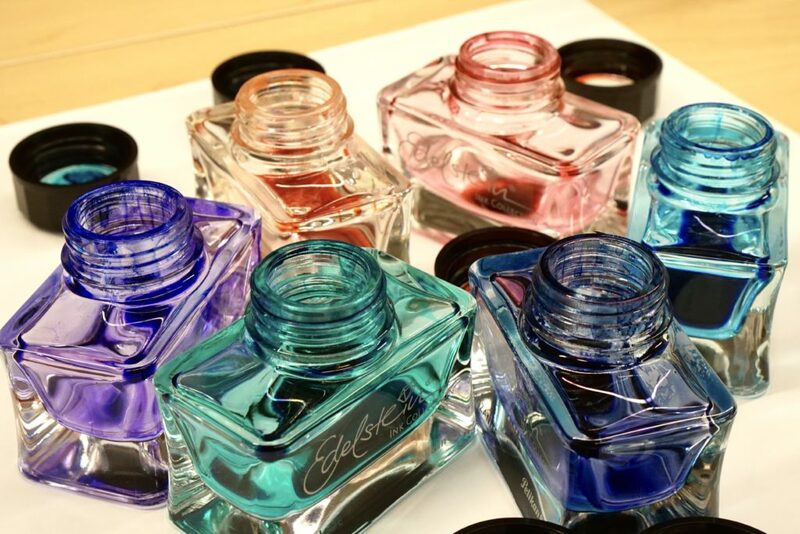 Also, we appreciate the generous gift of the Pelikan Edelstein Smoky Quartz ink bottle for each registered participant. I love this ink! 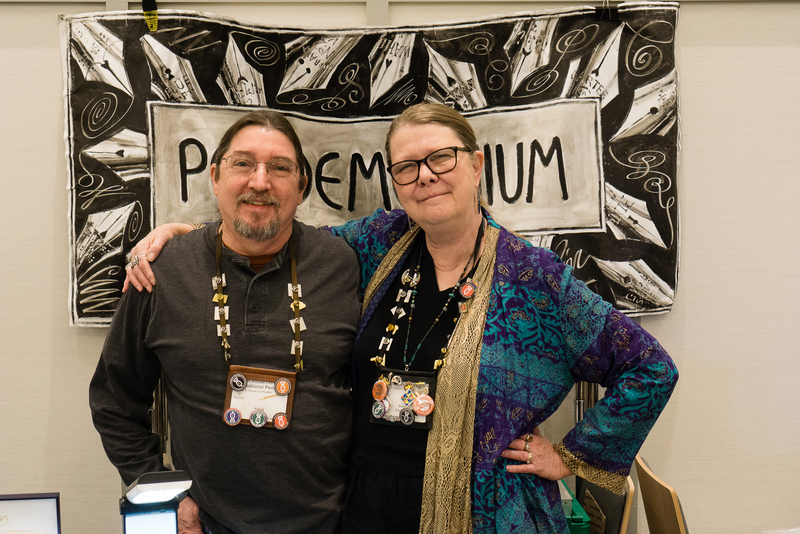 I have been attending the Pelikan Hubs since it started in 2014 and hope that this annual event continues to occur successfully. See you next year! Hello friends! 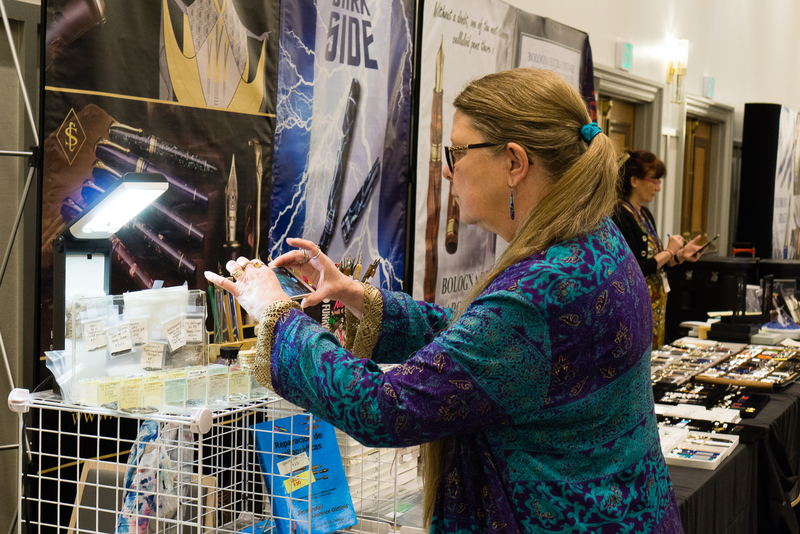 Thank you for hanging in there and I hope that you’re enjoying my detailing of the San Francisco pen show. 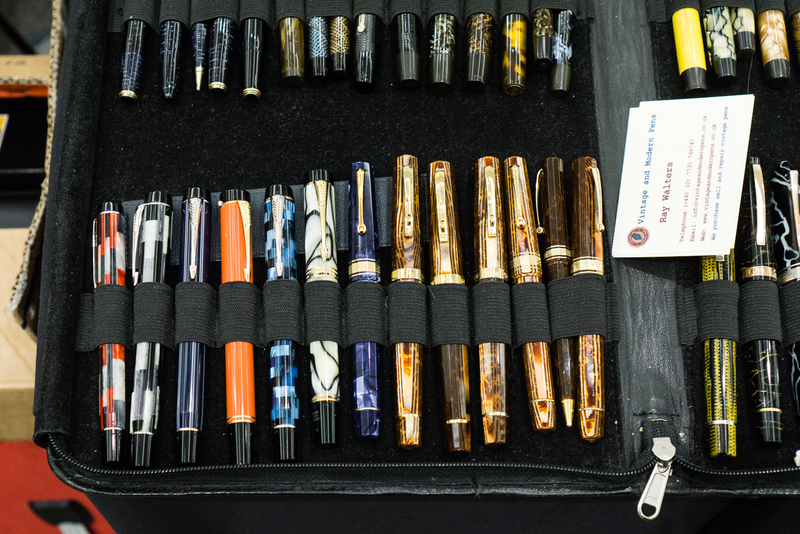 This is the continuation of my SF Pen Show Report – Part 1. This carries on to the events on Saturday afternoon and evening. And ends on Sunday’s last day of the show. Enjoy! 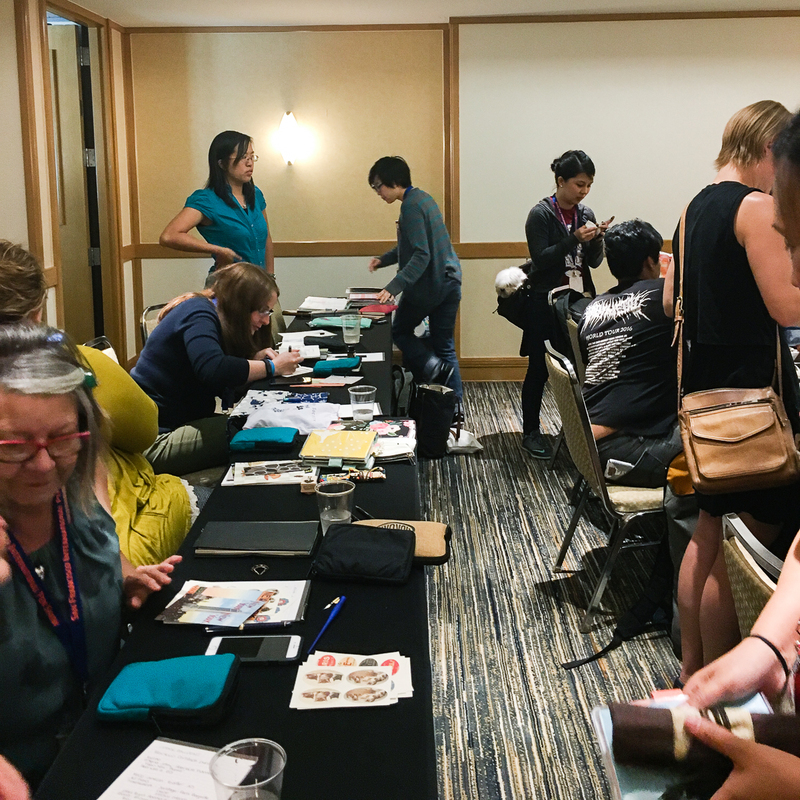 Around 1:00pm, Pam, Katherine, and Christina had once again hosted a planner meetup and had discussions with others on what they do to decorate, organize, and utilize their planners. 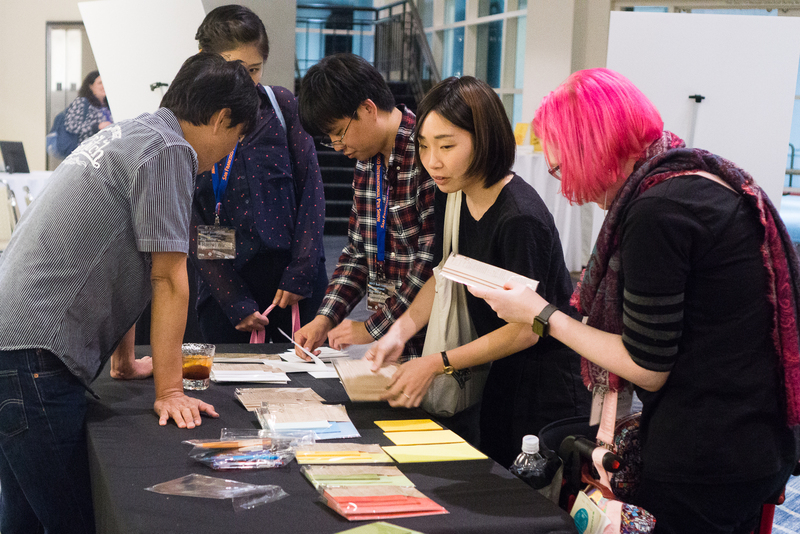 There were some exchanges of stickers, washi tapes, and notebooks as well. Photos courtesy of Christina. 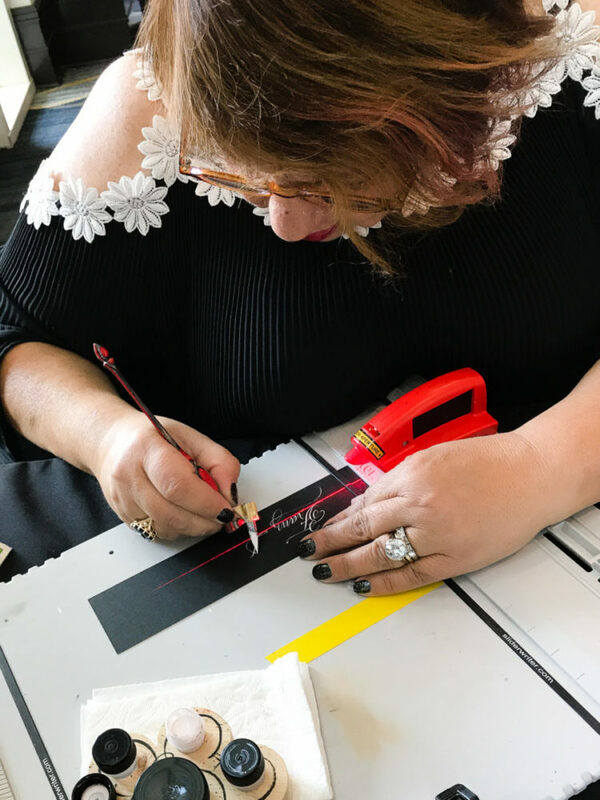 One of the vendors that were considered a big hit at the show was Atelier Musubi who traveled all the way from Singapore. 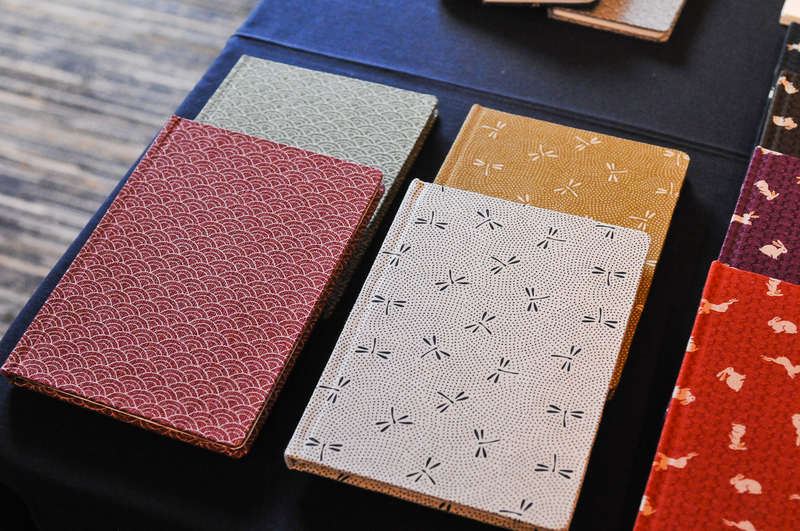 Their beautiful journals are cloth bound, contains Tomoe River paper, and are handmade in Singapore. 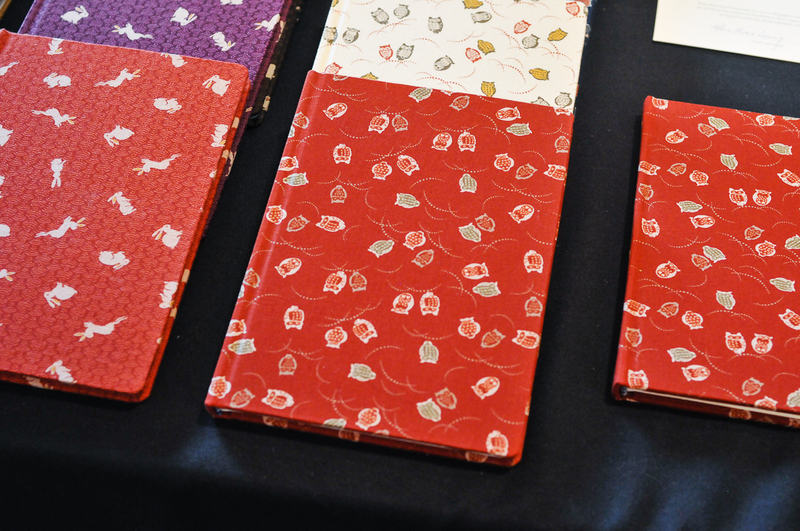 In addition, these journals are handmade by a person living with a physical disability. 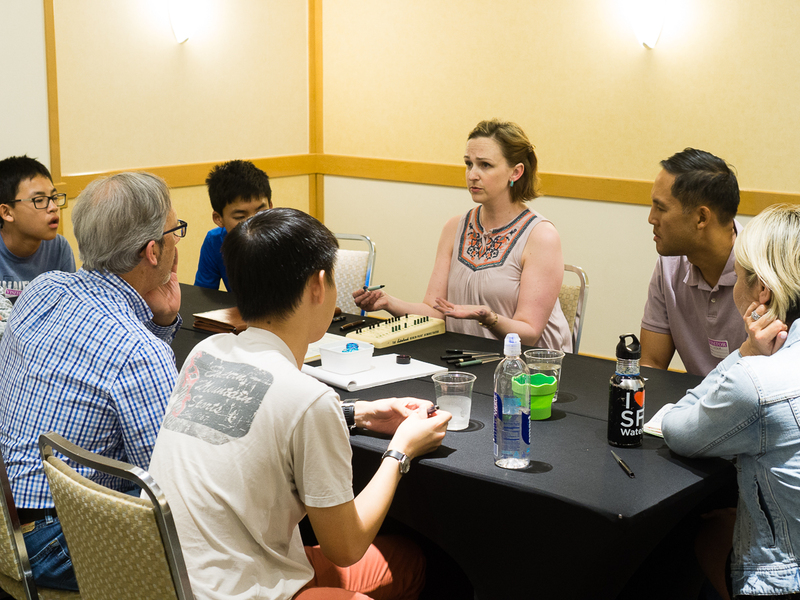 Here’s Atelier Musubi’s table located in the Grand Salon and was visited by some artists that you may possibly know. 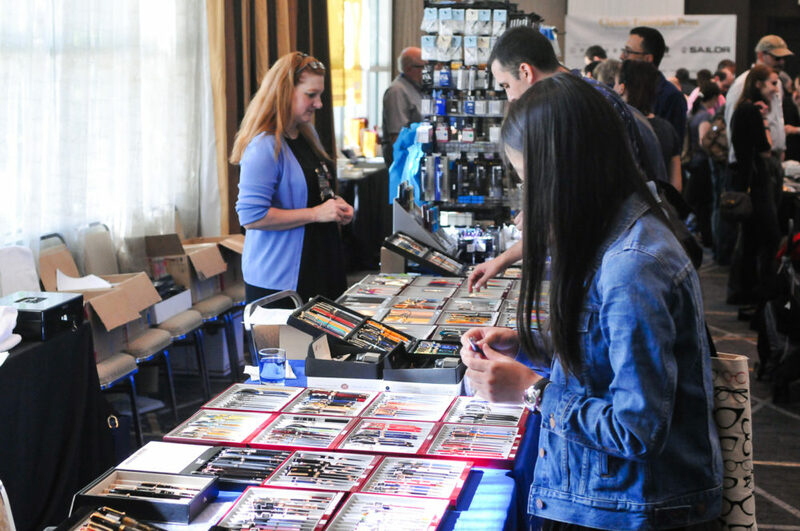 Within the same room, the table of the SF Pen Show principal sponsor, Wahl-Eversharp was there and were selling a lot of their Skyline pen models. 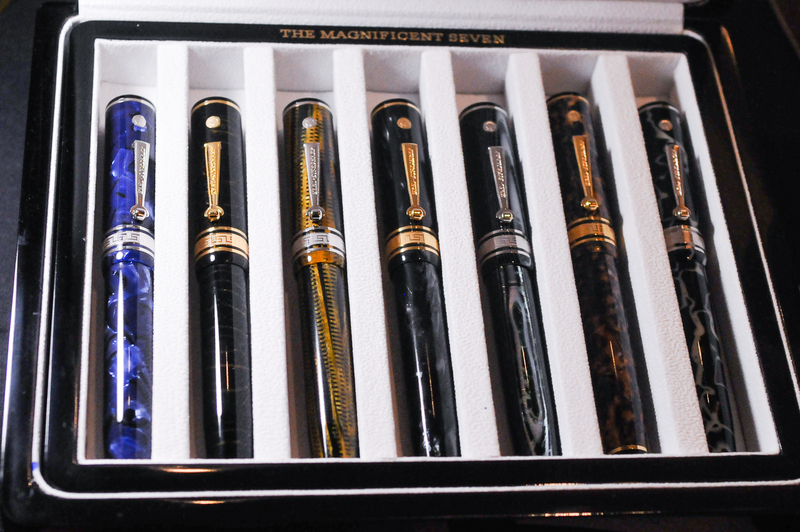 Also displayed were the Magnificent Seven Decoband pens. 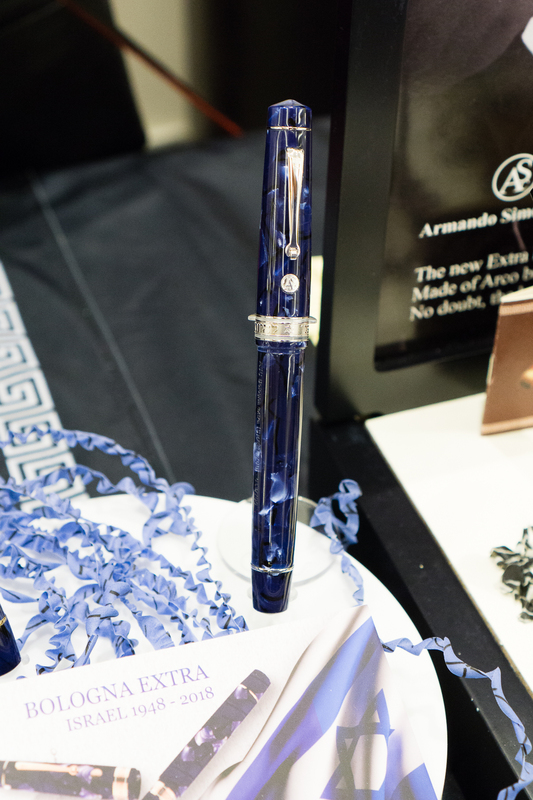 A first for the SF Pen Show, Pen World magazine presented a few of the Reader’s Choice Awards at the show. 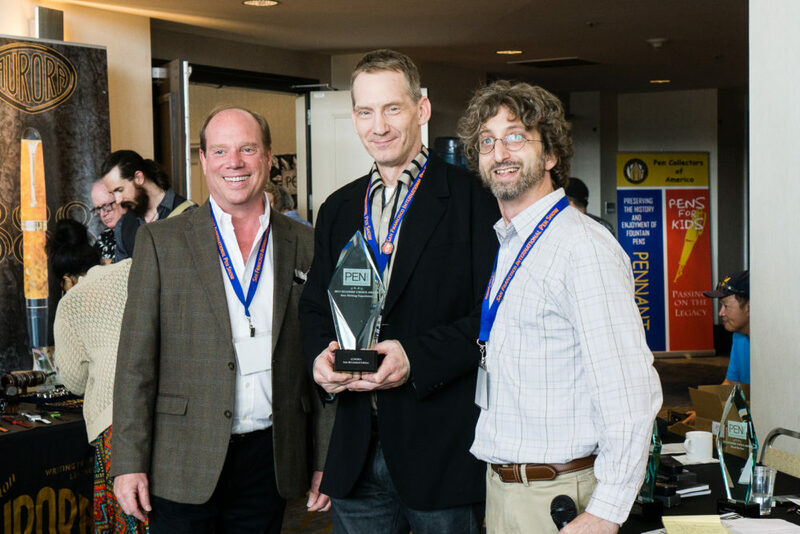 Editor-in-Chief Nicky Pessaroff presented the winners their awards below. Congratulations to all! 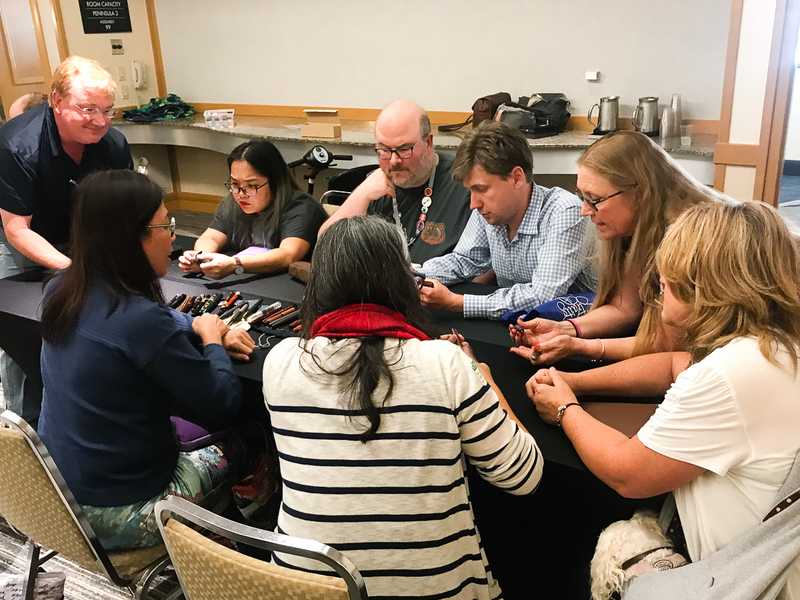 This year at the SF Pen Show, the Pen Addict Brad Dowdy, and Lisa Vanness of Vanness Pens tried a different type of meetup. 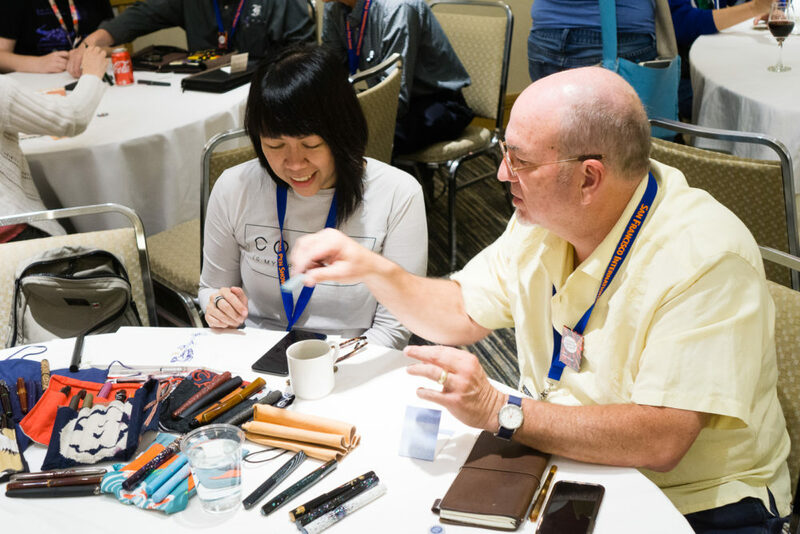 In most meetups, people sit down, show their pens, get to know each other, and learn from each other. 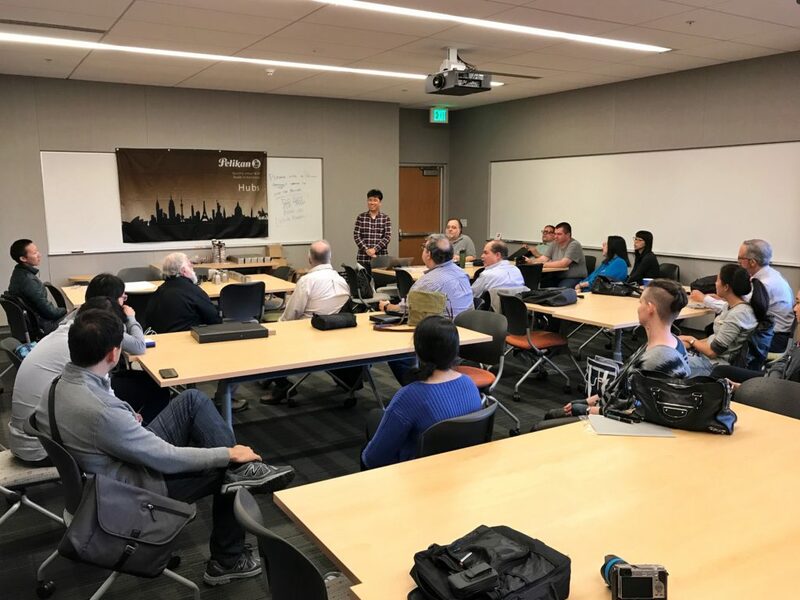 The Pen Dash is somewhat of the same concept except for the fact that every ten minutes the participants will have to stand up and proceed to another table with a different host or as what I referred to them as subject matter experts (SME). Brad made a write up of it on The Pen Addict. I was able to do an Instagram Live Video and post it to my personal YouTube. Please forgive my blunder in the video and know that the first room DID follow directions to move tables. I just thought they were signaled to move right then. Ah, the hitches of live television. Haha! Here are photos I got to take before going live on Instagram. Shawn Newton of Newton Pens. He brought along his pens and some rods he’s working on. Pam, and Katherine – HOTP Crew. I see Moogle as well! Leigh Reyes, and Michael H. Leigh was showing her collection of pens she acquired from all over. Joey Feldman making art at the Pen Dash. Photo courtesy of Kimberly L.
First, a sip of water, deep breath, and go. 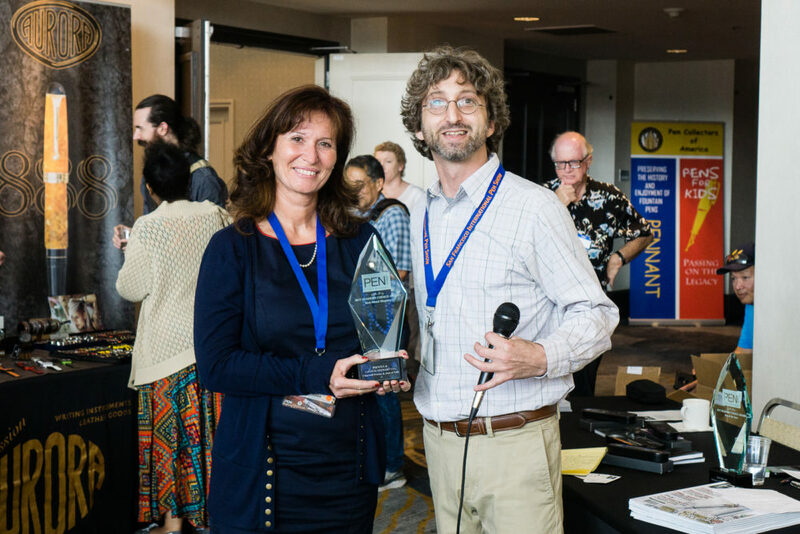 As most of the pen community knows, the passing of Susan “Susie” Wirth earlier this year had left a great big hole in the pen show world. Anyone who knew her knows that it’s not a pen show without her. In 2012, she was one of the first five people I personally met in the pen world. This was way before I became part of the SF Bay Pen Posse. 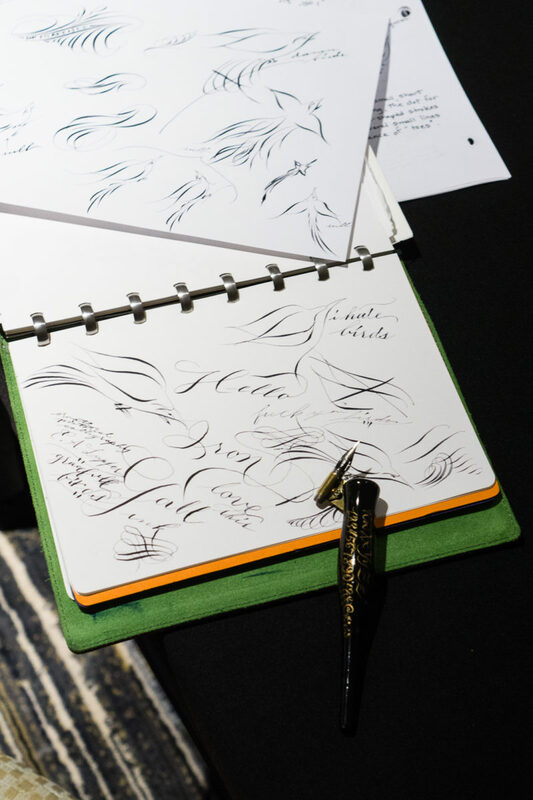 My friend Rebecca Joyce got the chance to film Susie at the 2017 LA Pen Show. If you’re interested, here’s that very informative video. 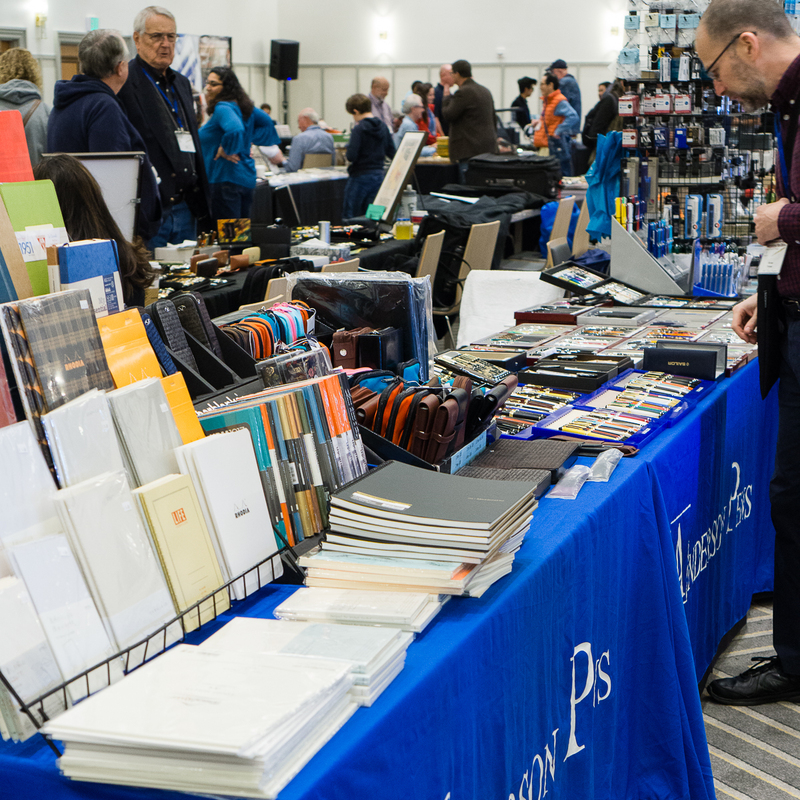 From the 2016 SF Pen Show: Deborah Basel, Susan Wirth, and John Martinson. Three of the first five people I met in the pen world. 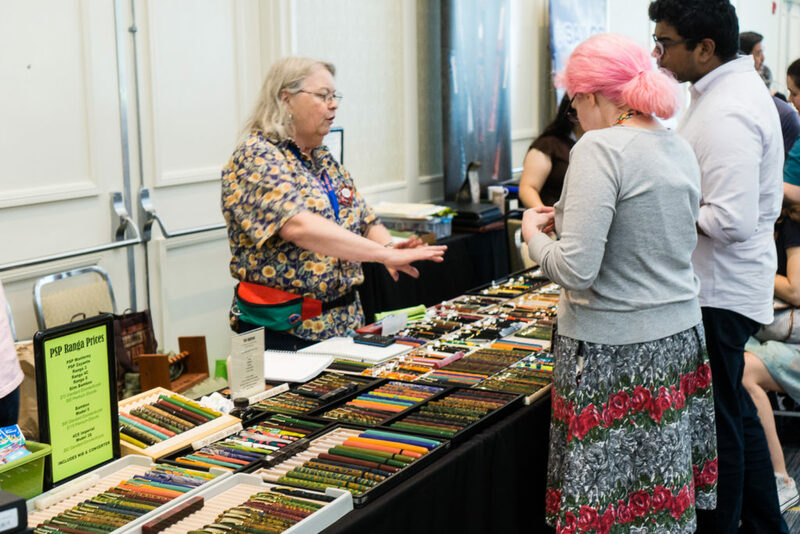 This was my first pen show to not see Susie’s table, to not see her face, to not smile and giggle as I saw her inky fingers, and to not hear her distinct voice. It felt weird to me and I’m sure to other people as well. A week before the pen show, I decided to do something to honor Susie. 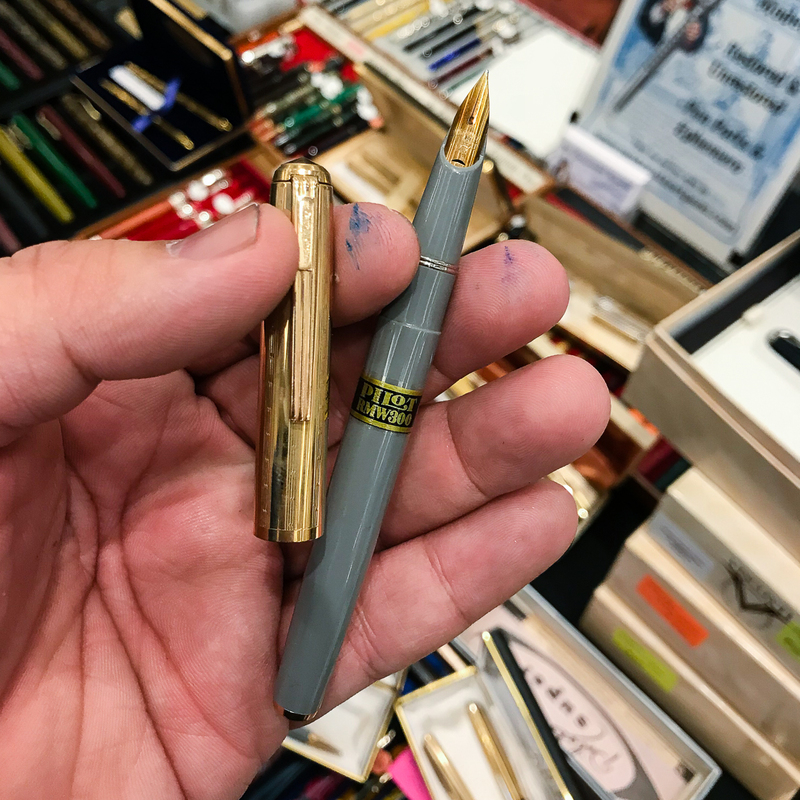 I figured, what’s a small inexpensive thing that people appreciate at pen shows? Buttons! 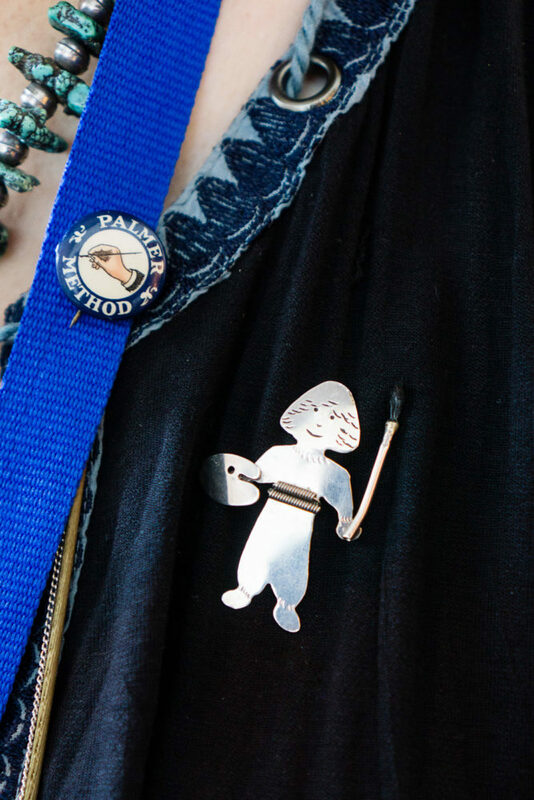 So I edited the picture I took of Susie’s identifiable shawl while she was wearing it and made it into a button. Saturday morning, I gave out these buttons to honor her. I told everyone, “This is her day!”. I’m sure everyone agreed. 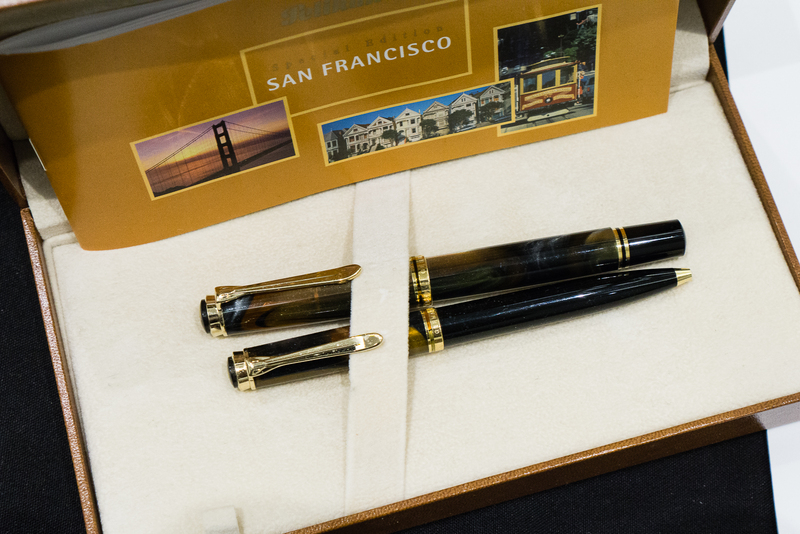 I am thankful that the SF Pen Show Organizers allocated some time during Saturday evening to honor Susie. I am also thankful to see John Martinson at this show. 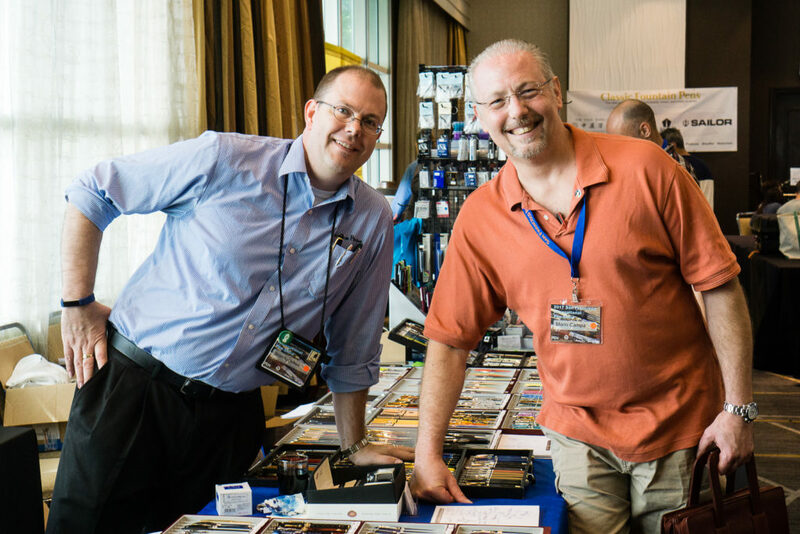 He worked with Susie at every pen show and has become a good friend to me. John brought some of Susie’s pens to show people and he also brought out Susie’s banner. I loved seeing it once again. The iconic Susie banner. I first saw this in 2012. 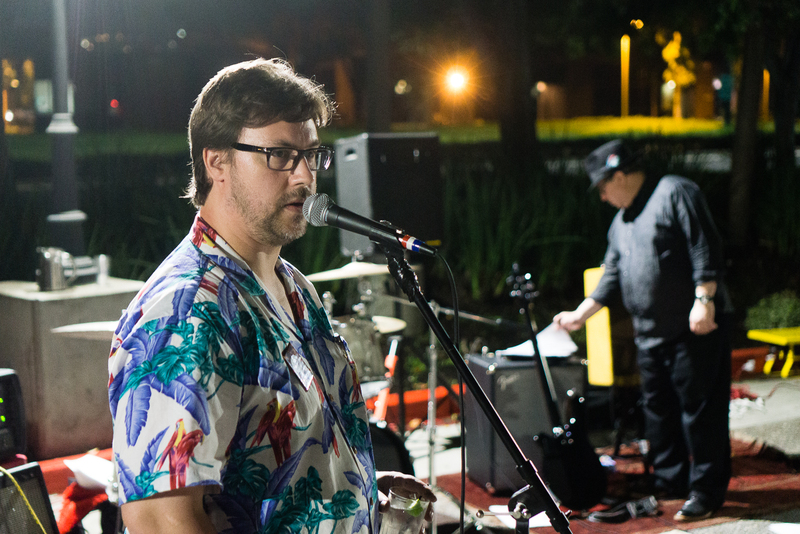 During the memorial, John M. spoke about Susie. 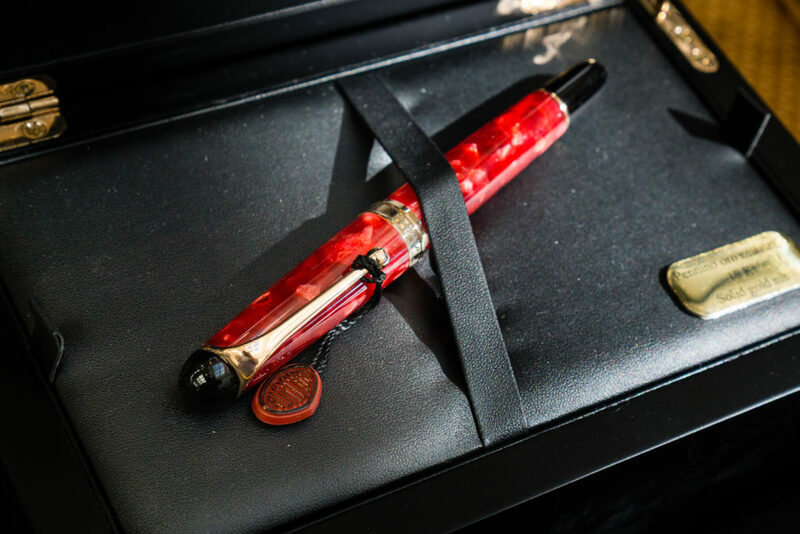 He ended by saying that the best way to honor her memory is to share the love of pens, to write more letters, and share what an italic nib can do for one’s writing. Thanks John! You were definitely missed Susie. 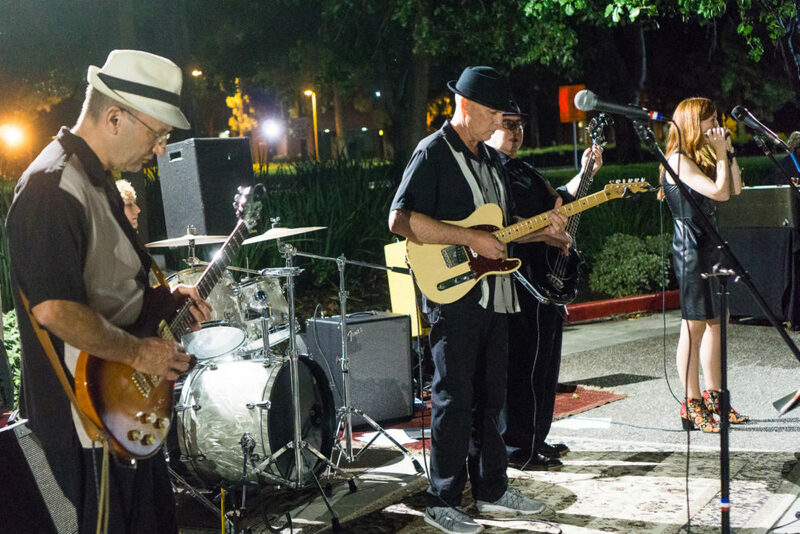 Each year, the show organizers gets a band and play a concert after the show. 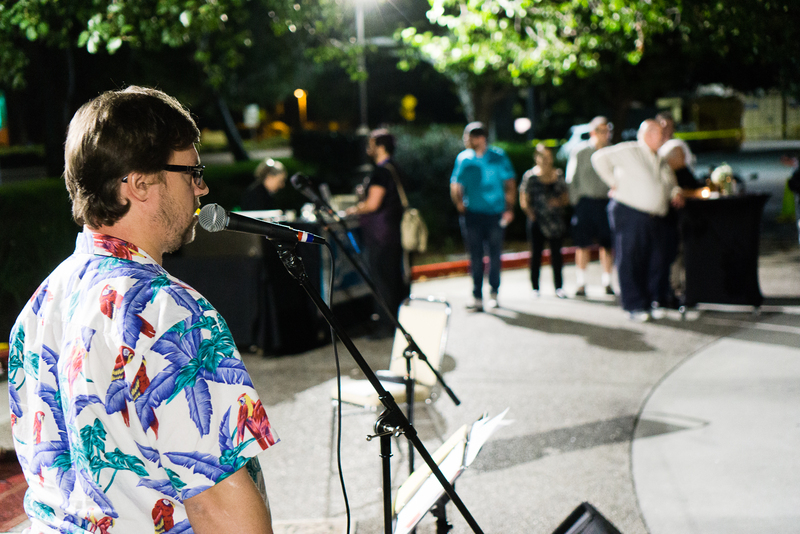 This year, due to the hotel renovations, the concert was held outside by the fountain. 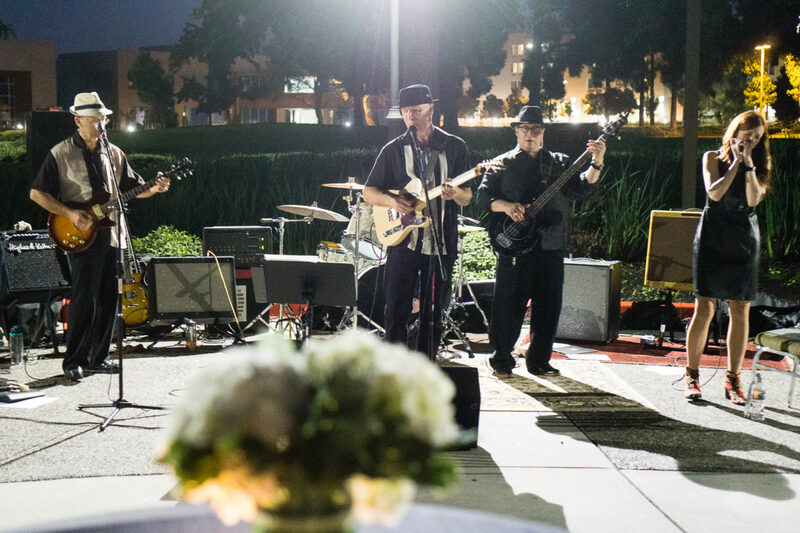 The band was different this year but their music, and song selection was still awesome. 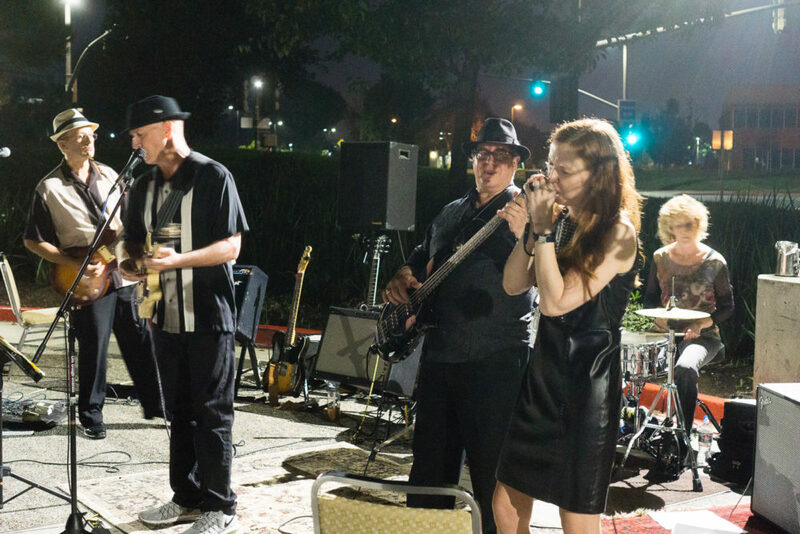 The band’s name is Groove Situation and their FaceBook page is here. 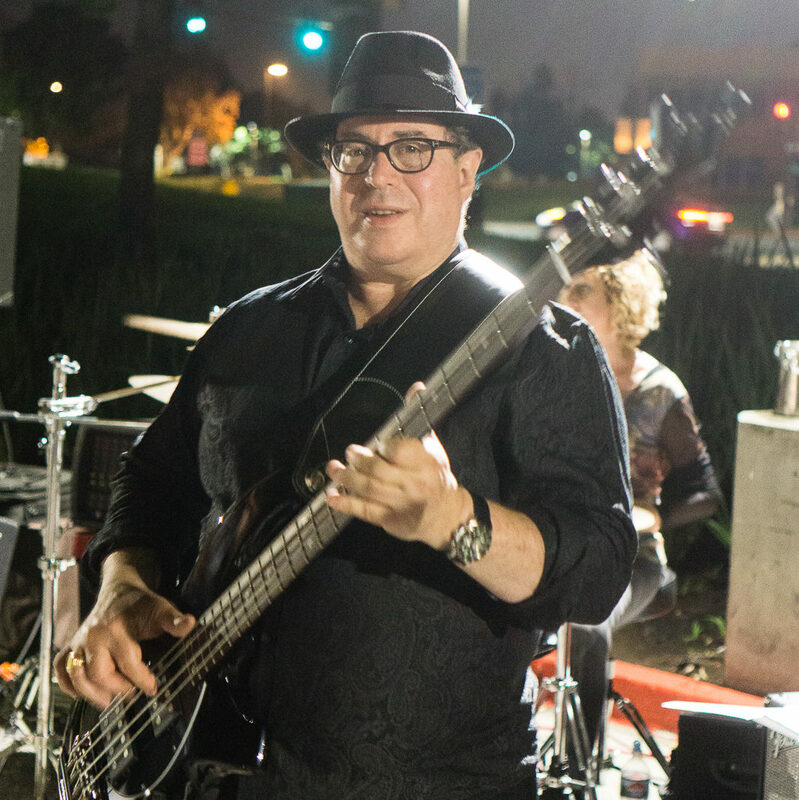 What’s pretty cool is that their bassist is Pen Posse’s very own, Jon R.
Pen Posse and The Bassist: Jon R.
Overall, the turnout for the pen show concert was great and a fun time was had. Inside the hotel, my friend Bruce Eimon introduced Taizo Yamamoto and his paper products. They are launching “Paper Tasting” (paper samplers) and they laid it out on an empty show table. Their website is http://yamamotopaper.com/index.html. 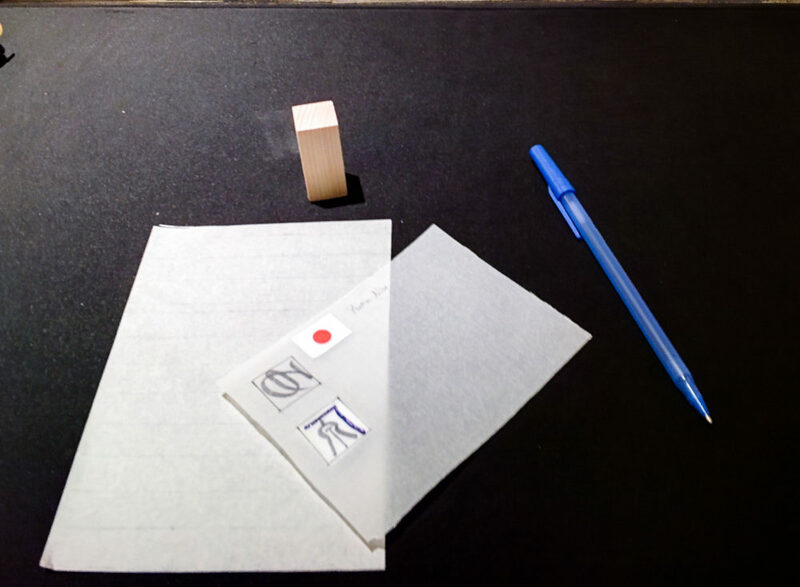 Some of the Paper Tasting from Yamamoto Paper. A couple pen posse peeps were checking it out. Saturday evening went on and we all just hung around and had great conversations. 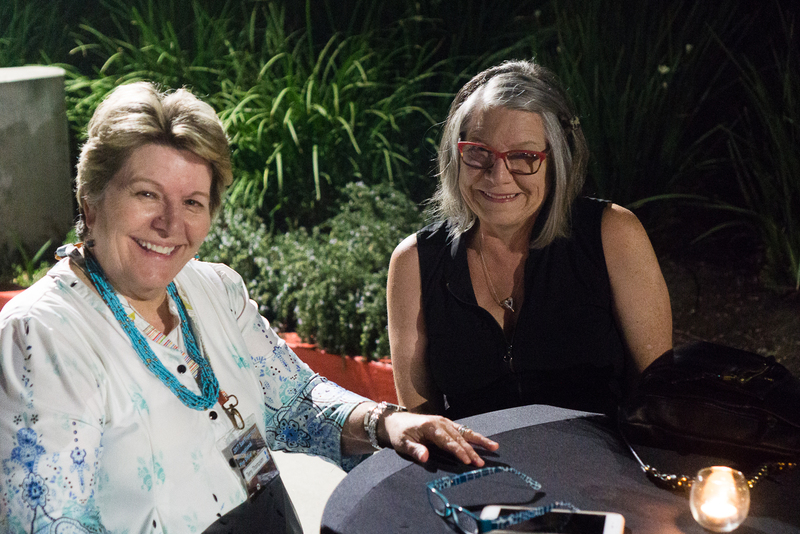 The evenings of pen shows are opportunities to reconnect, interact, and meet new friends. I eventually went home to rest up for another pen show day. Wow, the weekend is almost over and this is the day I feel happy and sad. Shall we say, verklempt? Not gonna lie, the past few days were tiring especially with the amount of sleep (or lack of) I’ve had. But Pen Show Time Zone prevailed and got ready for another fun filled day. I once again arrived around 7:00am to assist the 8:00am class attendees (Sorry Nik! 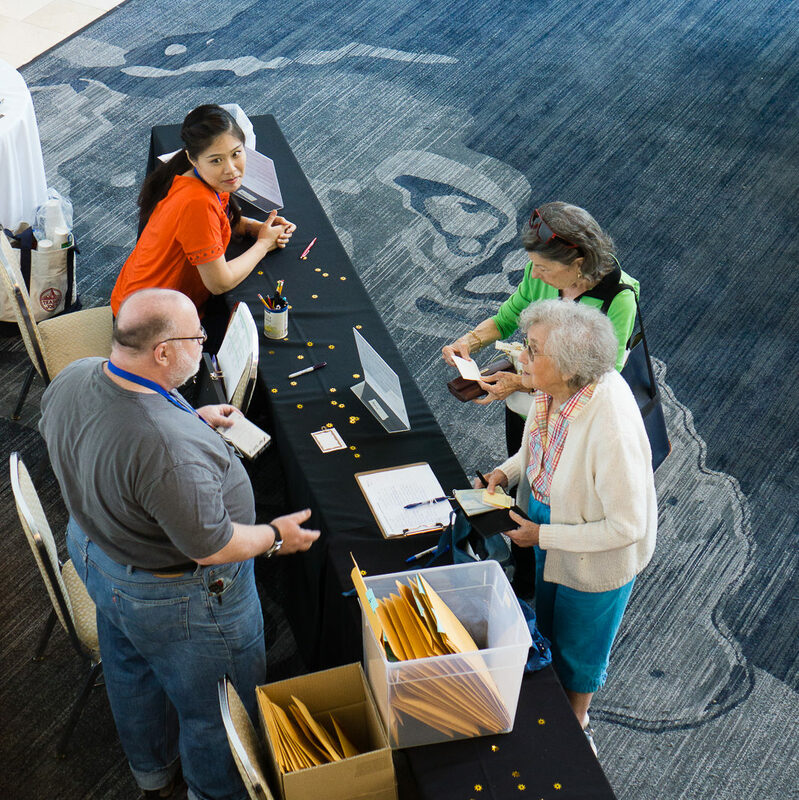 ), as well as assist the registration desk. Duty calls! As a reward, I got my name on Masuyama-san’s list as well. Masuyama-san line: Sunday Edition. Do you see familiar faces from Saturday? 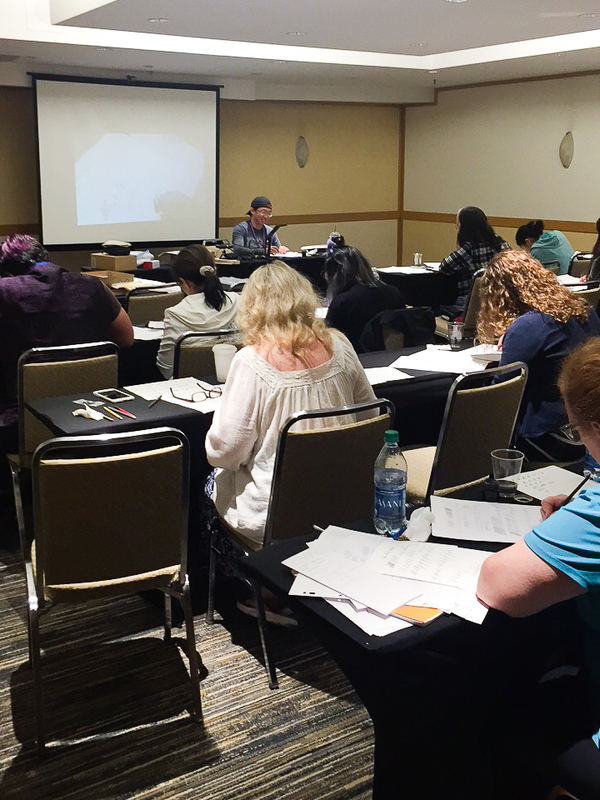 On Sunday, the show had another combination of paid classes, and free seminars. 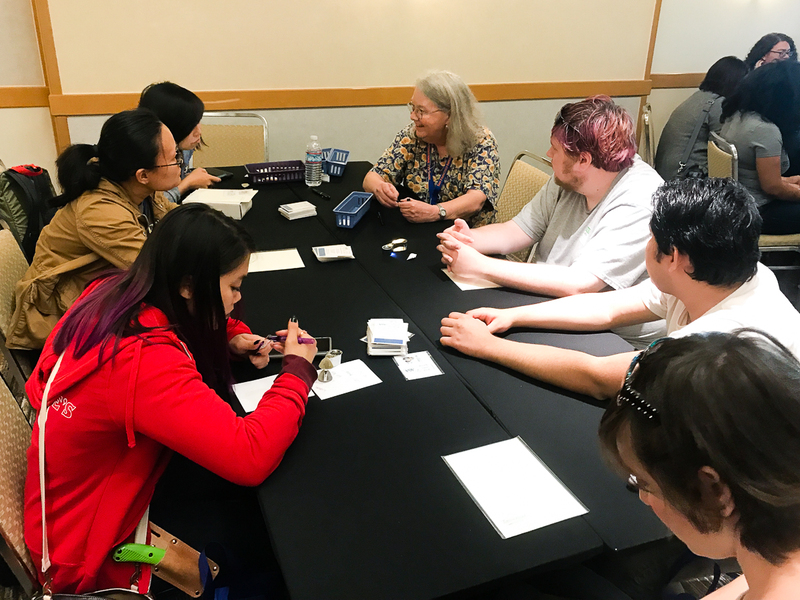 Rui Saito at her table on Friday. Photo by Gary Naka. 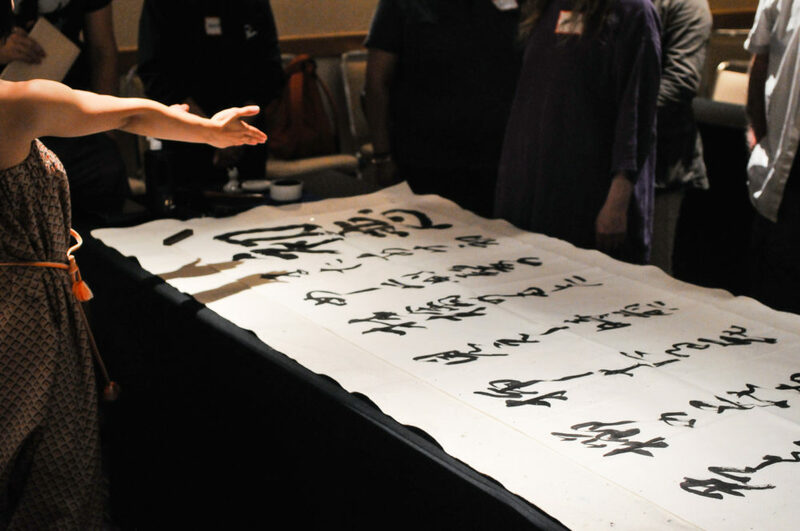 Shodo Demonstration. Photo by Ricky Chau. Here’s are some photos I got to take during the day. 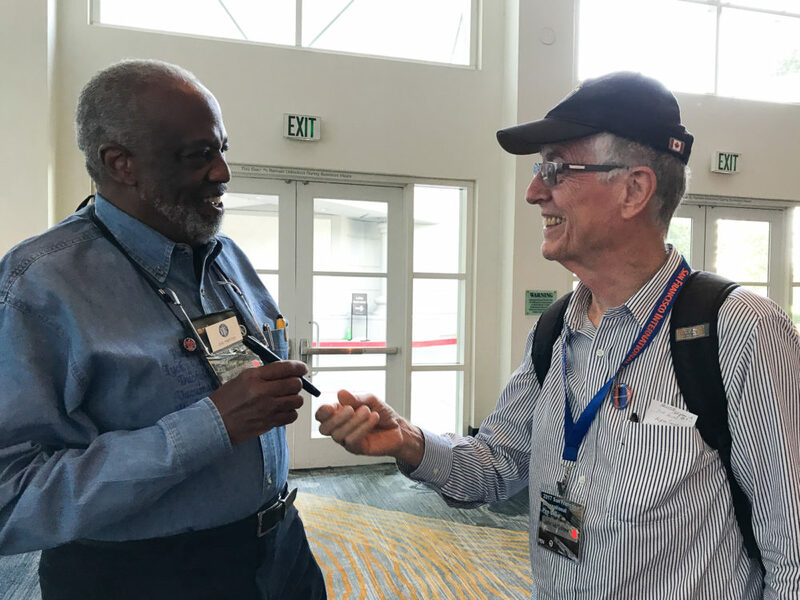 John Mottishaw arrived in the morning and Joel Hamilton caught him at the registration desk. The Nibsmith, Dan Smith was always busy with a customer. Pen Posse: Roz, Yuan, Pam, and Katherine. 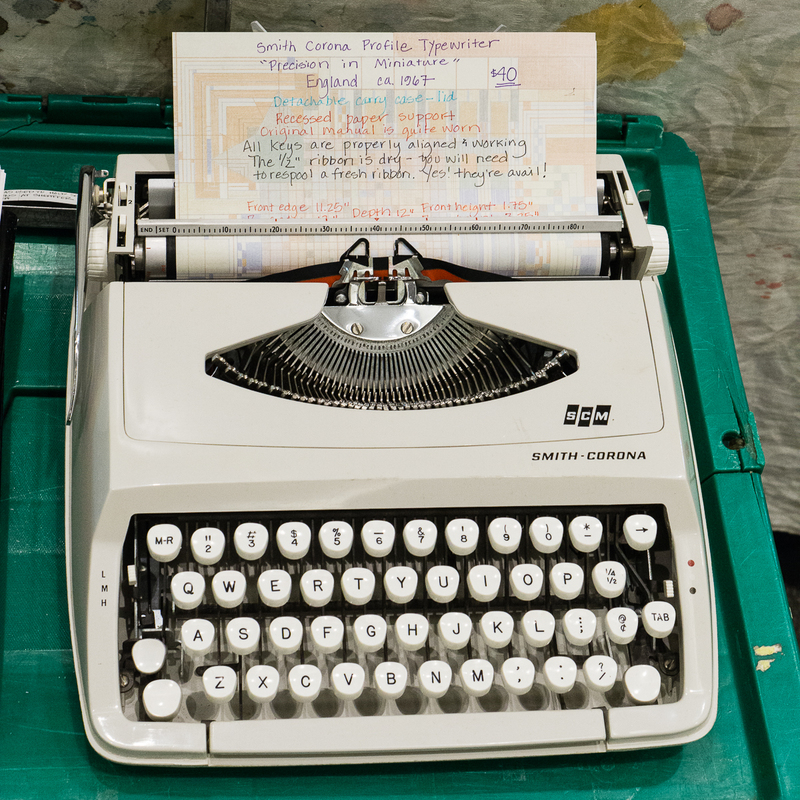 They were still stamping notebooks and selling stamps as well. 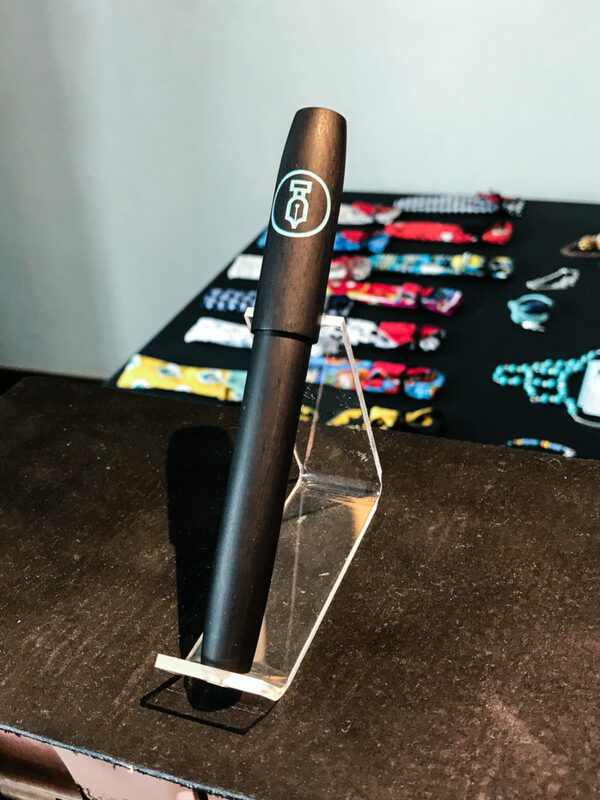 Over at Ryan Krusac’s table, the prototype of the limited/special edition Legend Pen he collaborated with Cary of Fountain Pen Day was on display. It’s beautiful for sure! 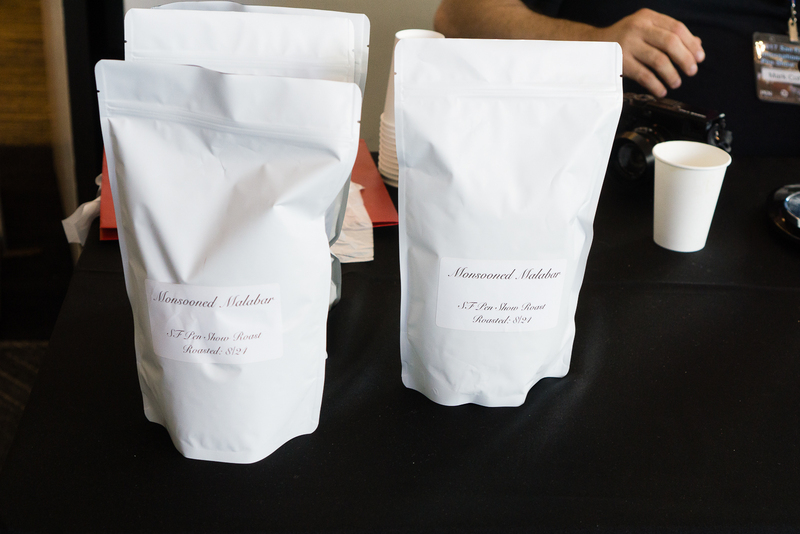 And the proceeds of this collaboration will be donated to Shawn Newton’s scholarship fund. The pen looks small with Carys hand on it. Here’s a bit of a penvangelism story. Jon, my co-worker, brought his kids to the pen show and I took the liberty of giving them a tour. 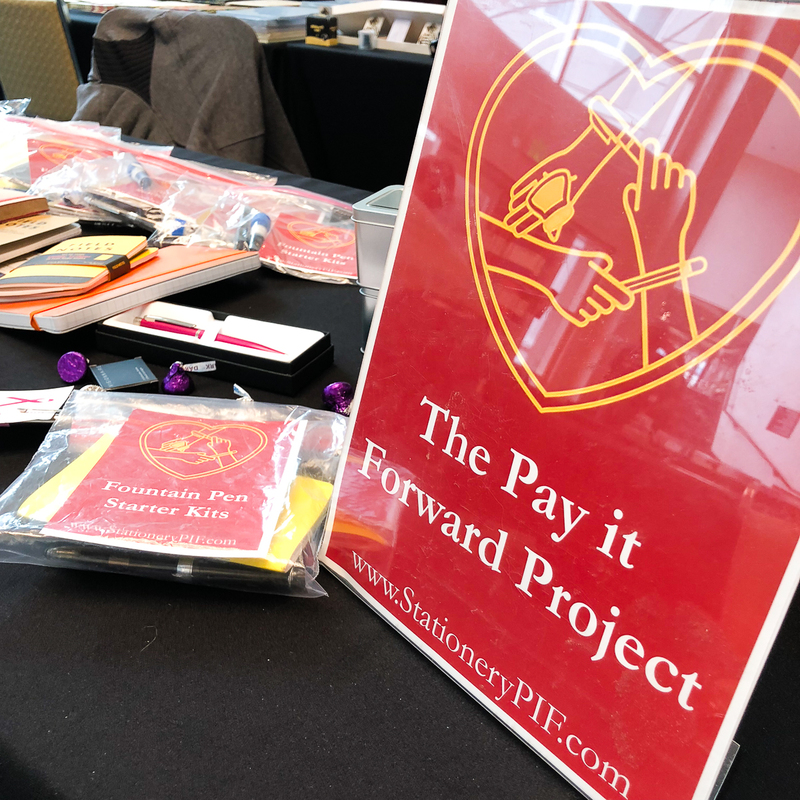 Of course the first stop was the Pay-It-Forward table and the kids got their starter kits. One of Jon’s kids wanted a pink ink to match the pink pen and we eventually found J. Herbin Rose Cyclamen from a table of a pen posse member. =) We continued the tour around the ballroom and we eventually sat down and showed them how to fill a pen with ink, how a pen works, etc. 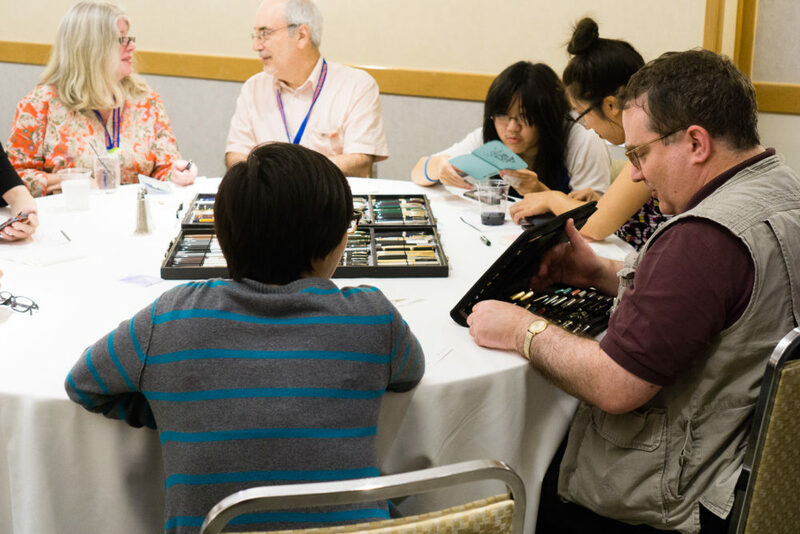 It’s inspiring to see teenagers wanting to learn how to use fountain pens. 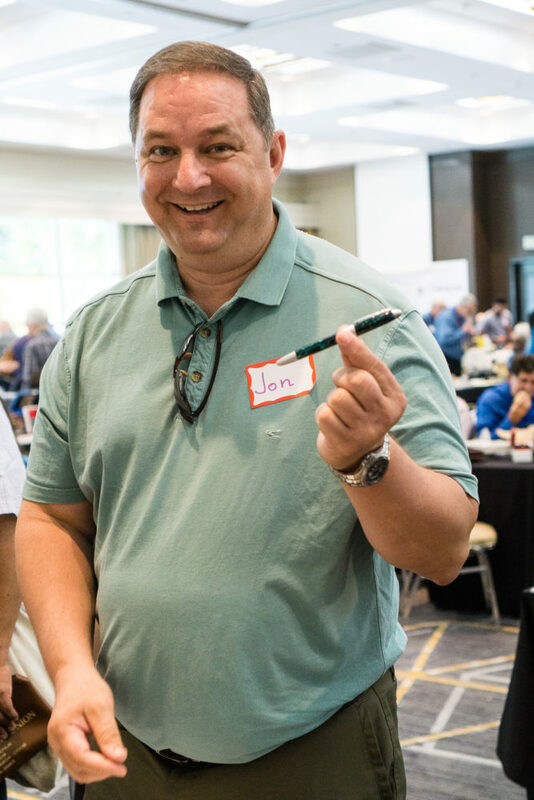 A bit of background, Jon got into fountain pens when he started to work with a pen addict (me) and he really wanted to come to the show and find a pen he’d like. 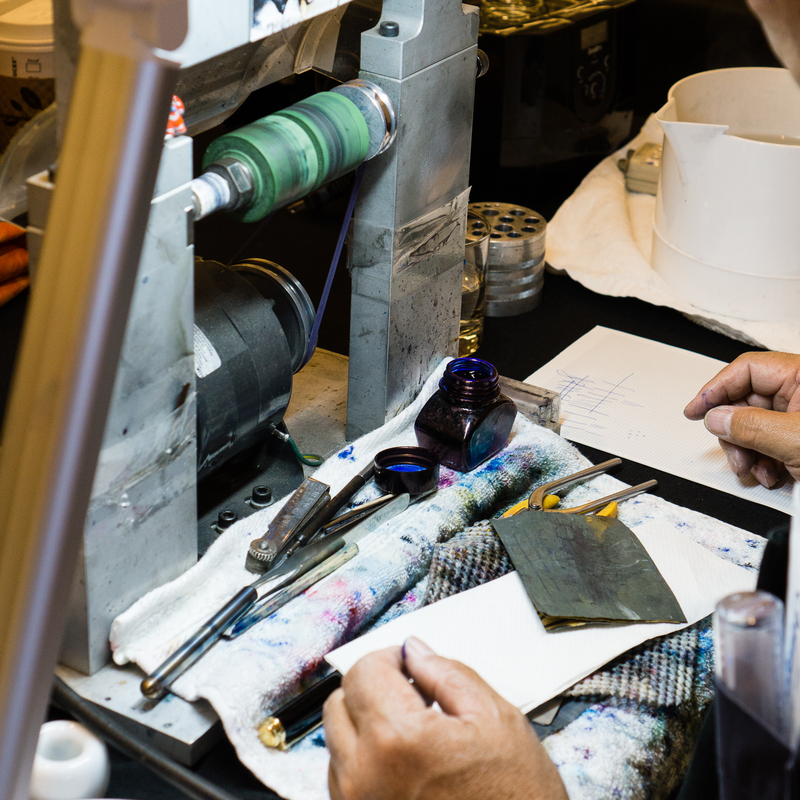 We found a green pen with a 14k gold nib over at Peyton Street Pens with the help of Nivardo. Needless to say, Jon and the kids were happy. And he bought the pen! That smile though! As the show comes to a close, I got to walk around the ballroom a little bit and take some pictures again. 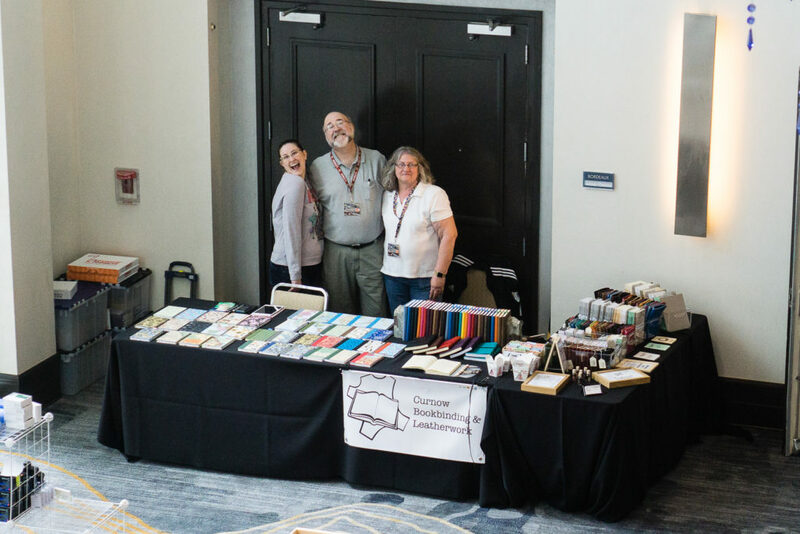 Dan and Leigh visiting Karol and Hugh over at the Kanilea Pen Co. table. It was Kanilea’s first time at the SF show and it was great to see them. 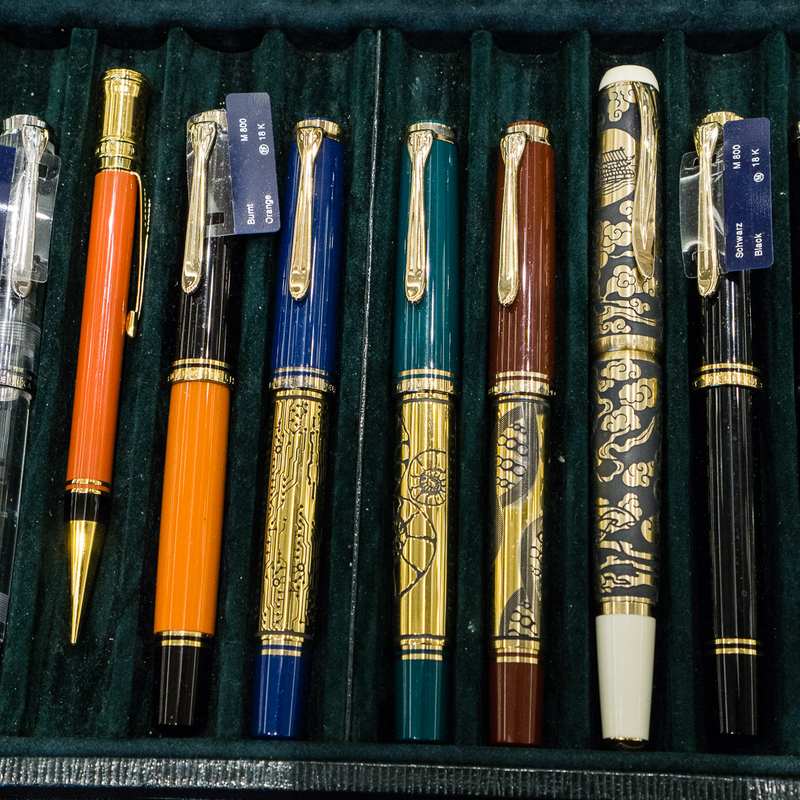 My final purchase at the show was at the Vanness Pens table. Replenished my supply of Akkerman 05 Shocking Blue, and Bungubox Sapphire. Also picked up these special edition Curnow notebooks with Joey Feldman’s artwork in the cover. 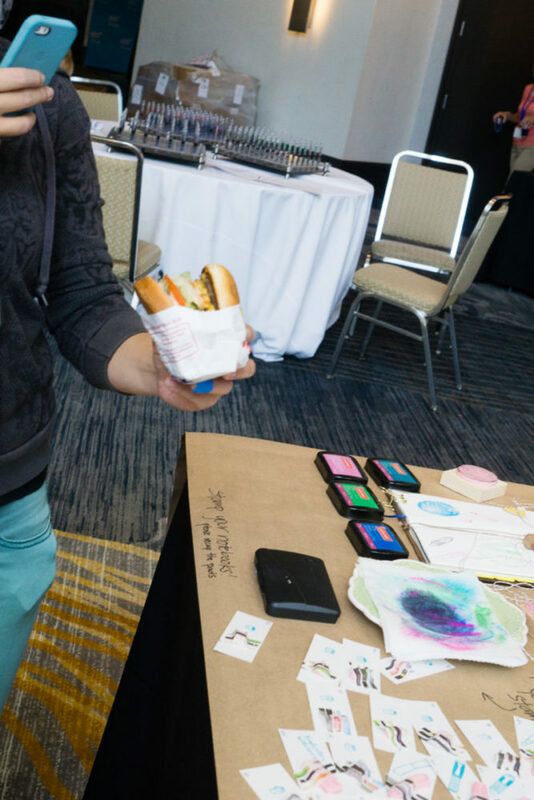 During the weekend, Joey was doing individual art sketches behind the notebooks when people bought them. He actually did this special piece for me (of me) on Saturday and I just picked it up on Sunday. 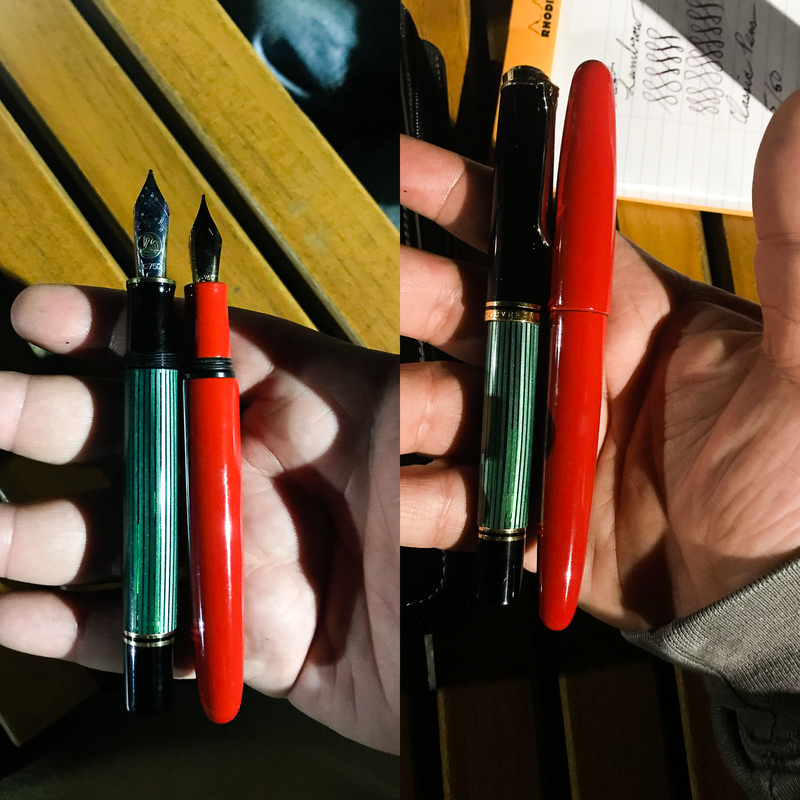 My Mother and I took a pen vendor friend out to dinner which has become a tradition now. 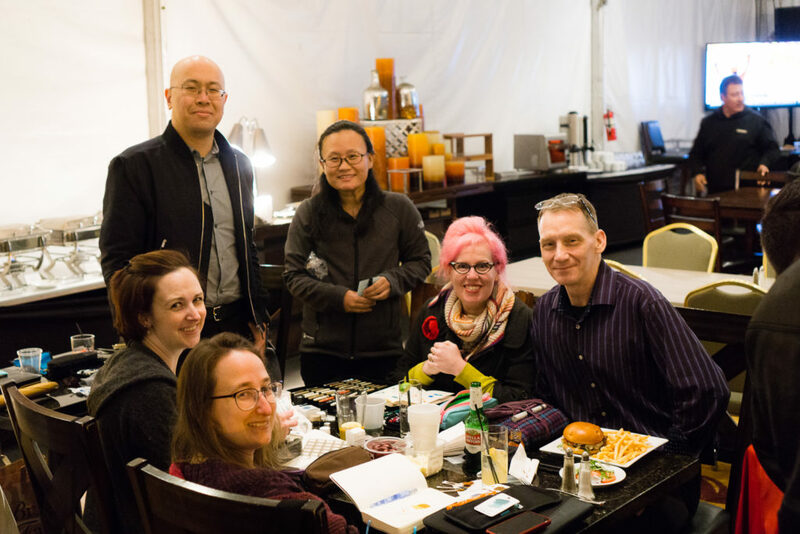 Afterwards, we went back to the hotel and found other pen friends coming back from dinner as well. We hung out at the bar for a bit. Needless to say, I was tired but I was very happy. The photo below was the last one I took before I gave in to the fatigue and finally went home. 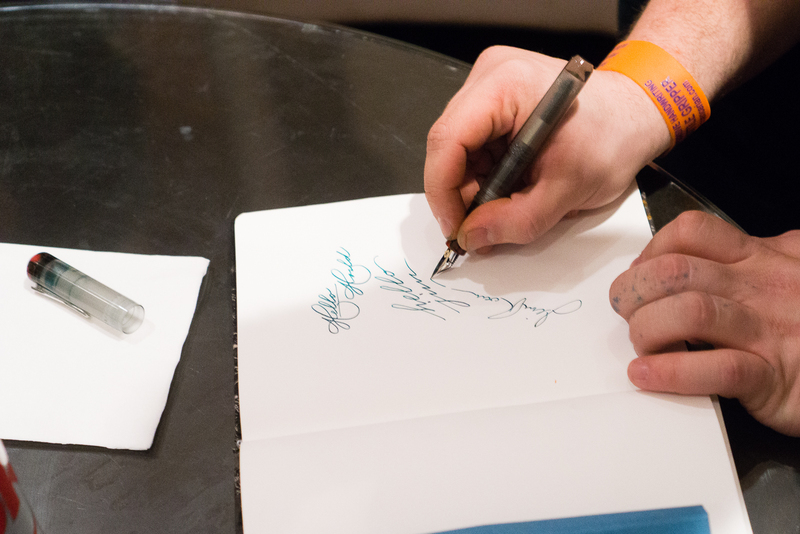 The San Francisco Pen Show has come and gone and I’m very thankful I was able to attend and be part of it. 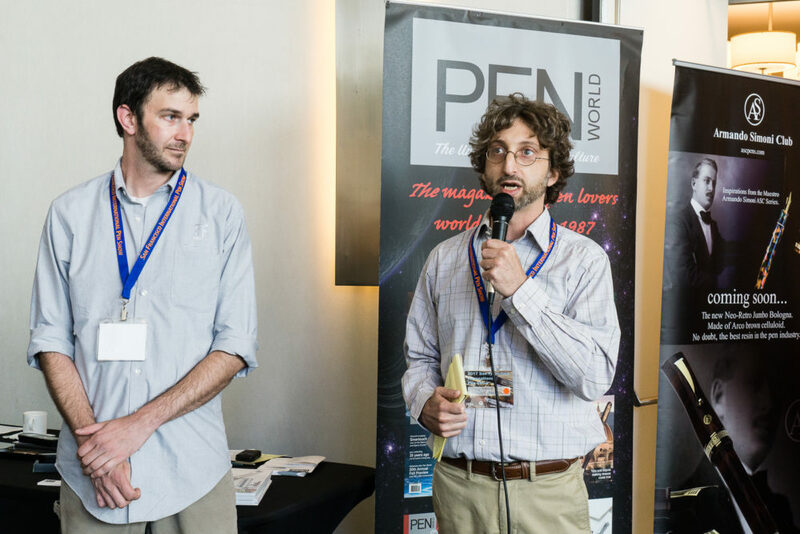 Pen shows for me have evolved quite a lot and it has now become a true social event that I look forward to attend. 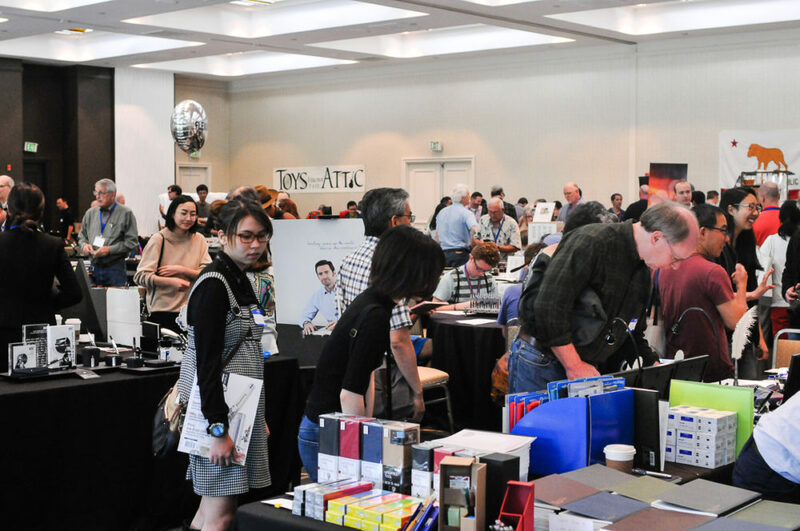 Whether it be SF, LA, Atlanta, or others, what makes pen shows is the people I meet, or visit with. I mean, pen people are so kind, generous, and cool. Who wouldn’t want to hang out with those kinds of people? There were a lot more stories that you can’t just place in a report and I treasure a lot of them. And to you my dear readers, thank you for sticking around for this lengthy report. And again, I hope you enjoyed it. For those who attended the show, comment what your favorite part of the show was and what you bought. For those who weren’t there, let me know if you have questions as well! Wait, wha?! 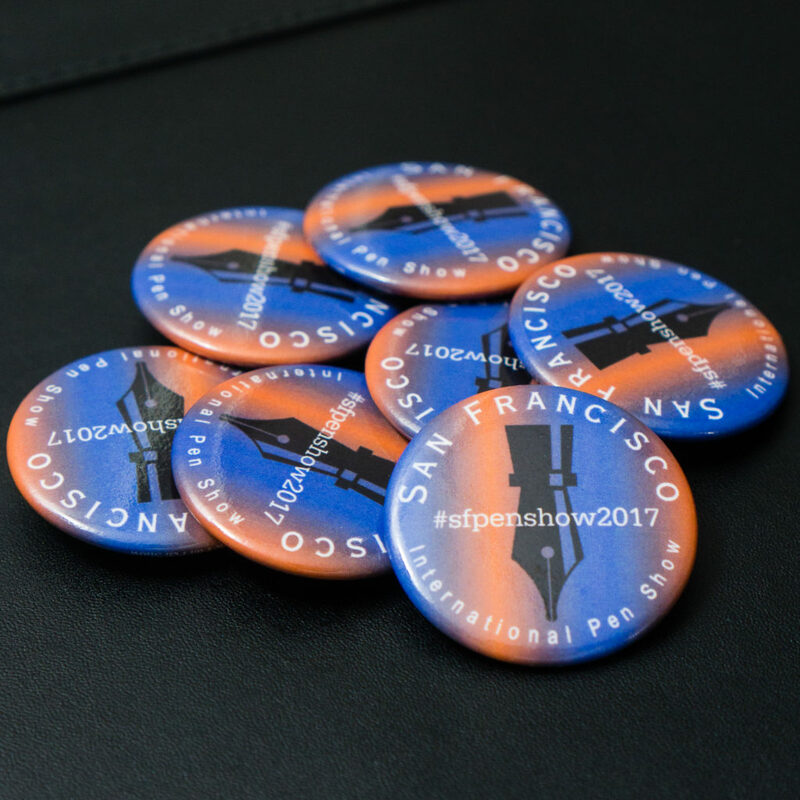 The 2017 San Francisco Pen Show is over?! I guess time flies when you are having fun! 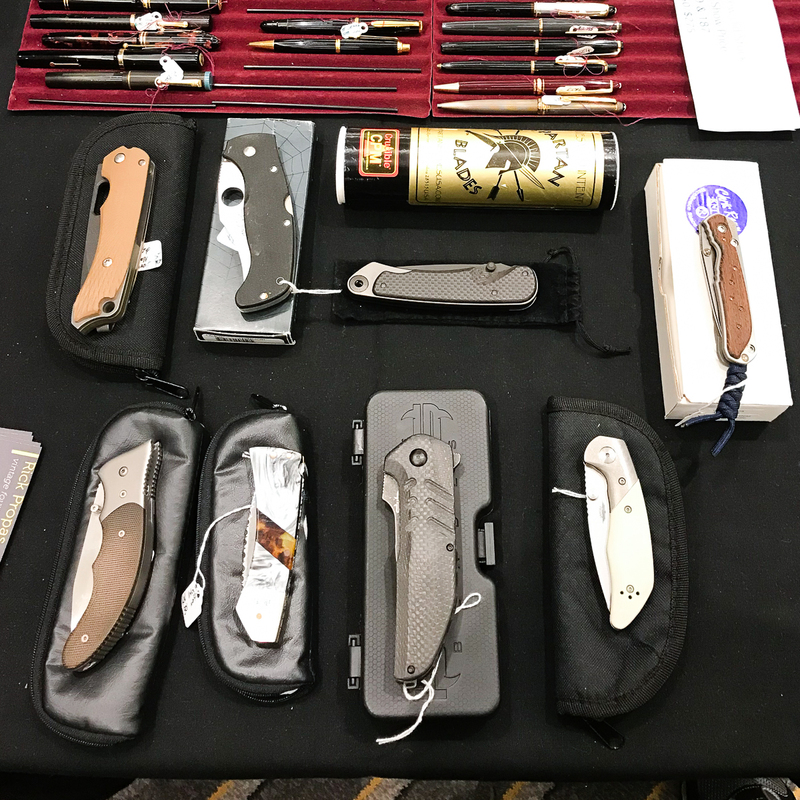 Time for another pen show report! 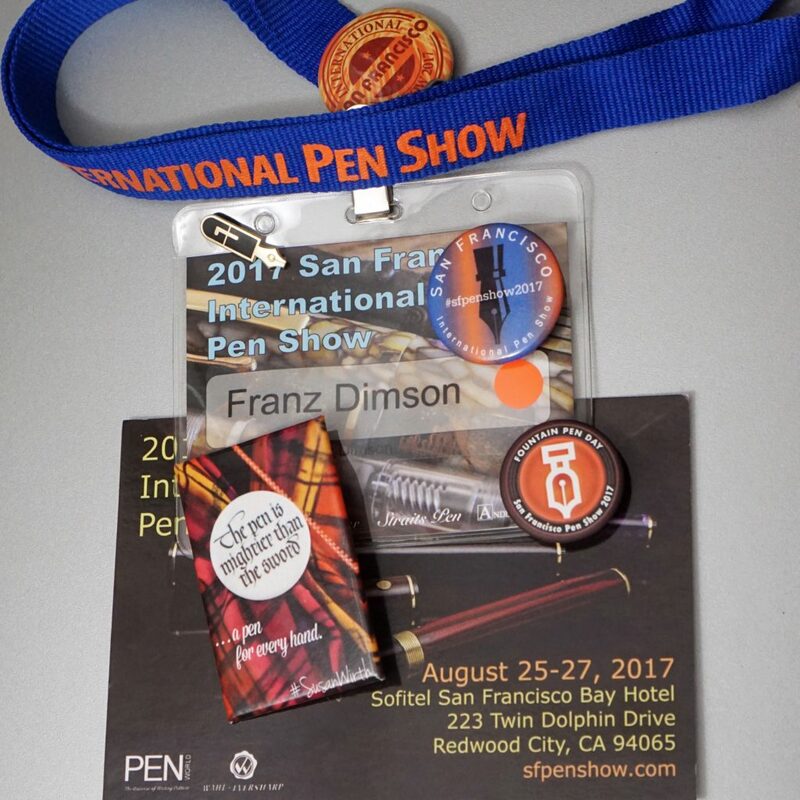 This will be another long read just like my 2016 SF Pen Show report so I dare not call it a “recap”. 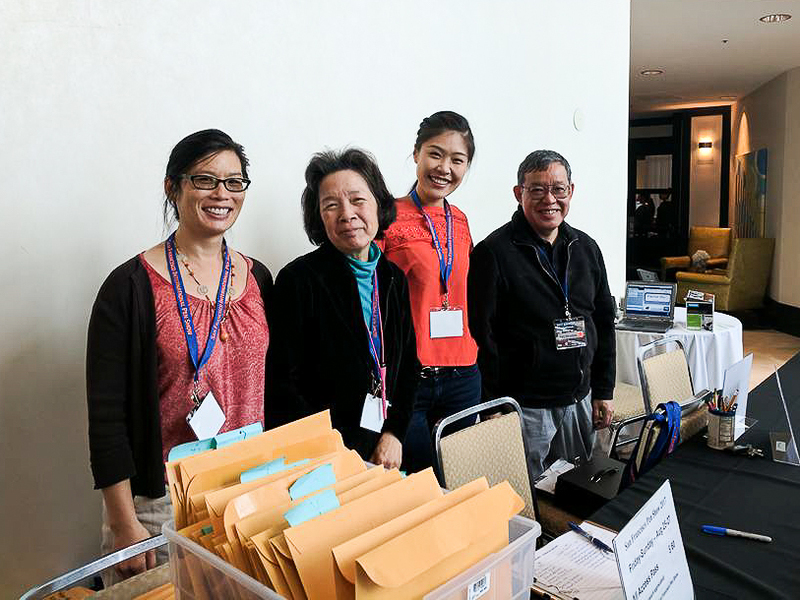 This year, I have become much busier working the show as the volun-told Class Registrar, assisting at the Registration Desk, and also being behind my registered table hosting the Pay-It-Forward table. So being busier means less time walking around the show and less photos taken by me. I’ve asked a few friends if I may use their show photos and they have obliged oh so kindly. Thank you! Oh wait, for those who only want the short version? Okay, well, it lives up to their tag line, “THE FUN PEN SHOW”. And the post is done. j/k! So go ahead and grab a snack to hold you over if you wish. 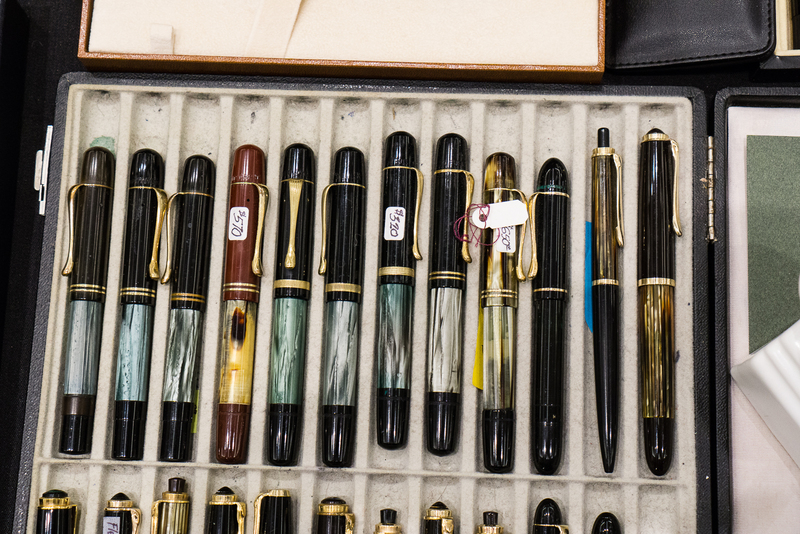 This may be the lengthiest pen show report you’ve ever read. Quite lengthy that I had to divide it into two parts. 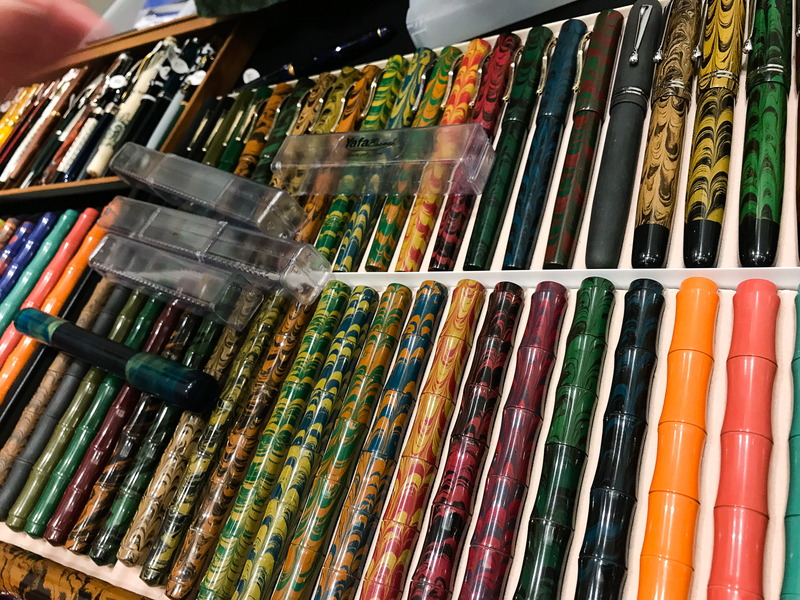 I tried to be thorough and provide you the unique multiple perspective that I experience at this pen show. I hope you enjoy it! 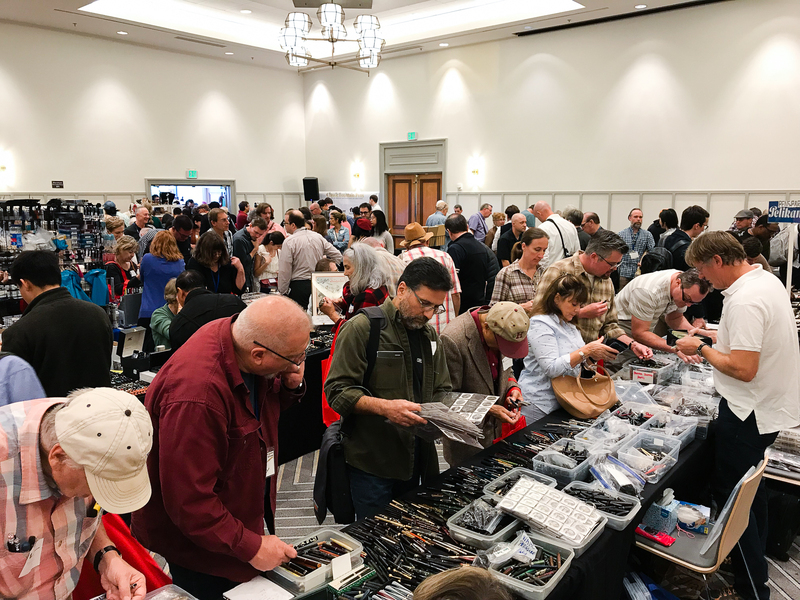 The Pen Show doesn’t really start until Friday but Thursday is typically the day when vendors, and attendees who travel from out of town arrive at the hotel. 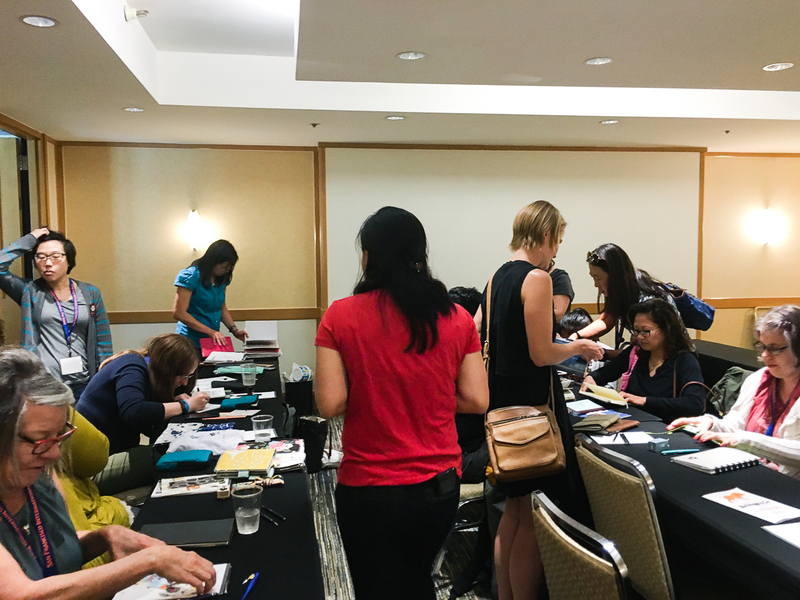 Thursday afternoon is a time for vendors to claim their badges, paperwork, AND table assignments. Some vendors with multiple tables and large displays start setting up so there would be less work to do on Friday morning. 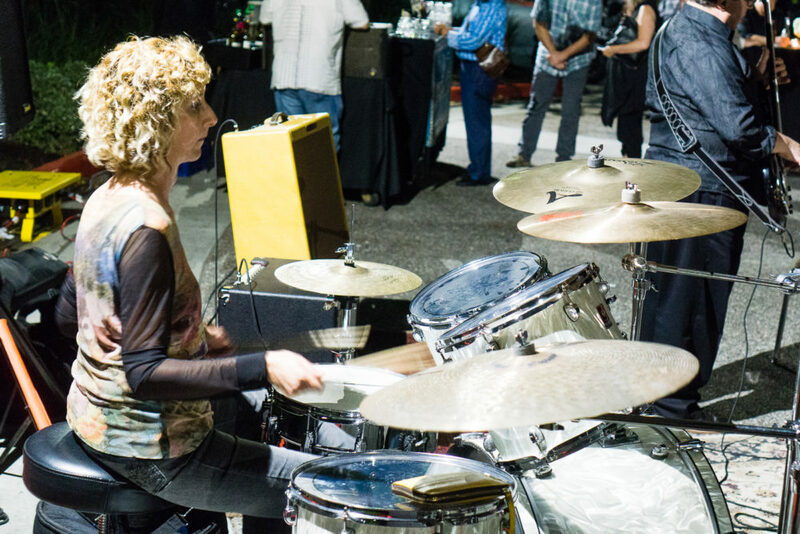 The show organizers also host food and drinks in the evening for the vendors. Just like last year, they served burger sliders as well as grilled cheese with tomato soup. Yum! 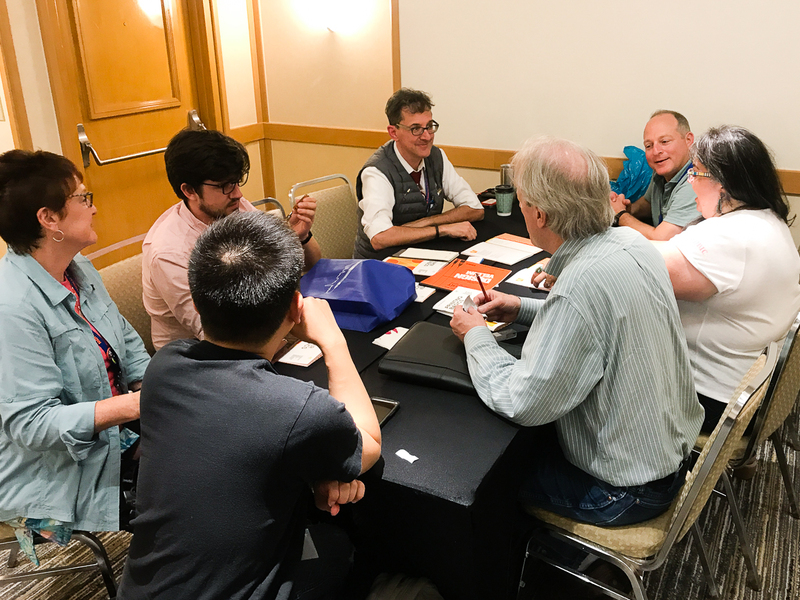 I arrived around 7:00pm to take care of some class logistics for the next day, as well as meet up with pen friends from all over. Some Pen Posse friends decided to have a late dinner and we trekked to the city of Millbrae for our favorite place, Peter’s Cafe. I think this may become a yearly tradition for Thursday night. 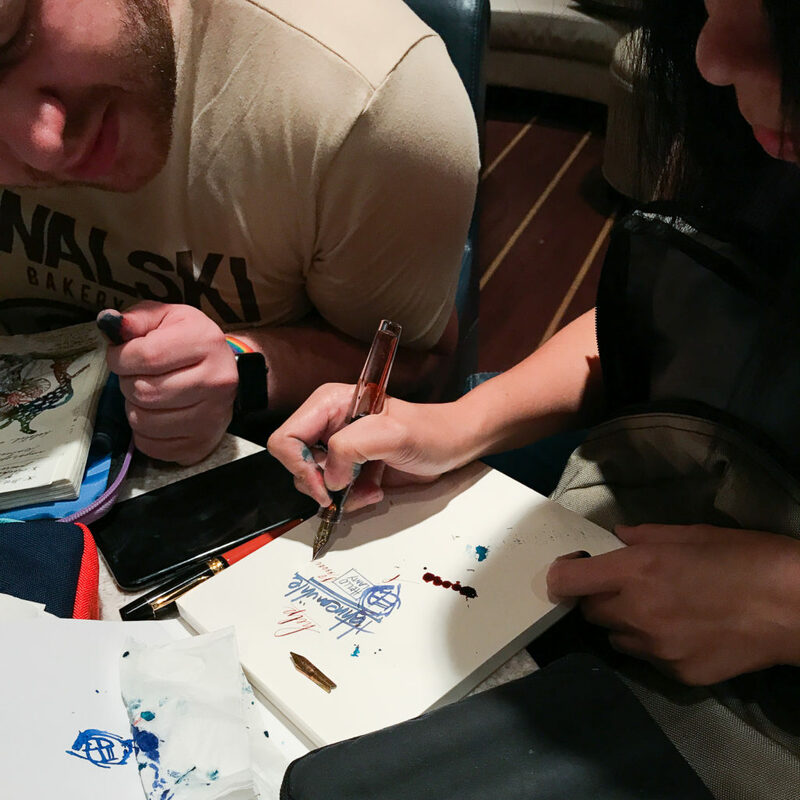 Afterwards, I hung out at the bar with a couple friends and got to check out some cool pens from different people. I also finally got to meet Leigh Reyes who arrived the same day all the way from the Philippines. A couple months ago when I knew Leigh was planning to attend the show, I reached out to her and “made” her do a free seminar which was on Sunday. Show and Tell: A friend’s Oldwin in the Arco Verde material. That is nice! 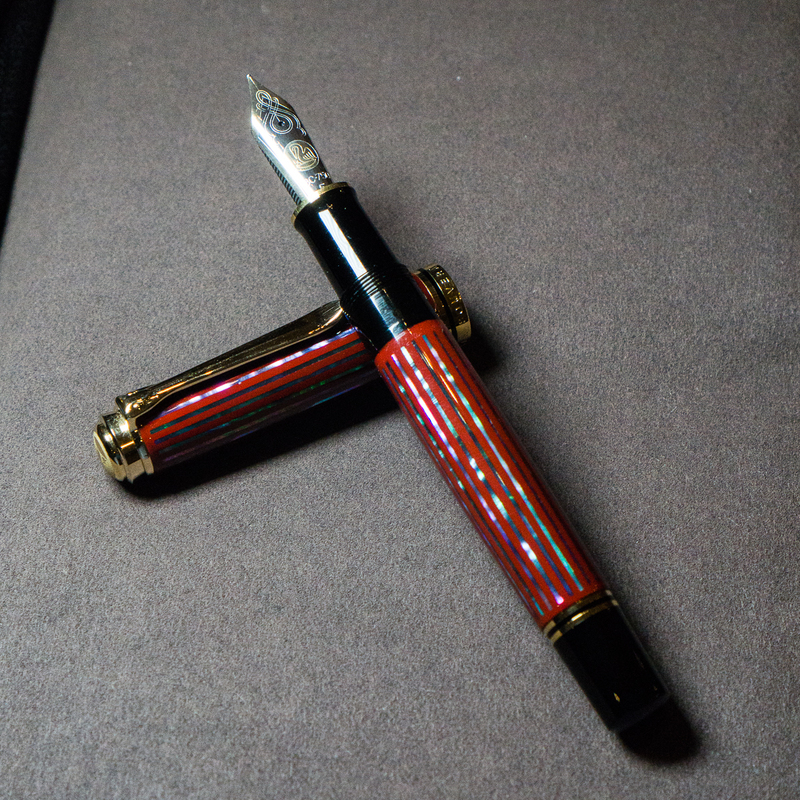 Show and Tell: A friend’s Pelikan M1000 with an urushi lacquer by Bokumondoh that he got in Japan. 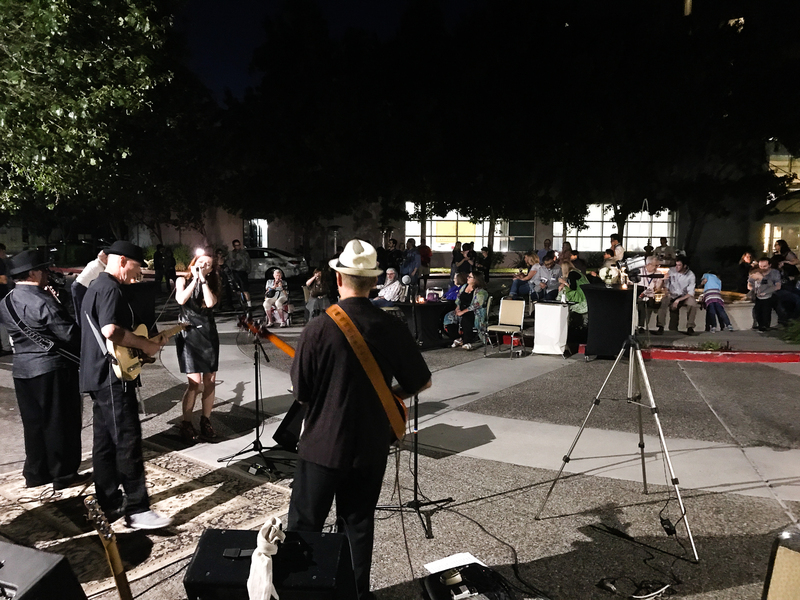 Friday, August 25 – Show Time! 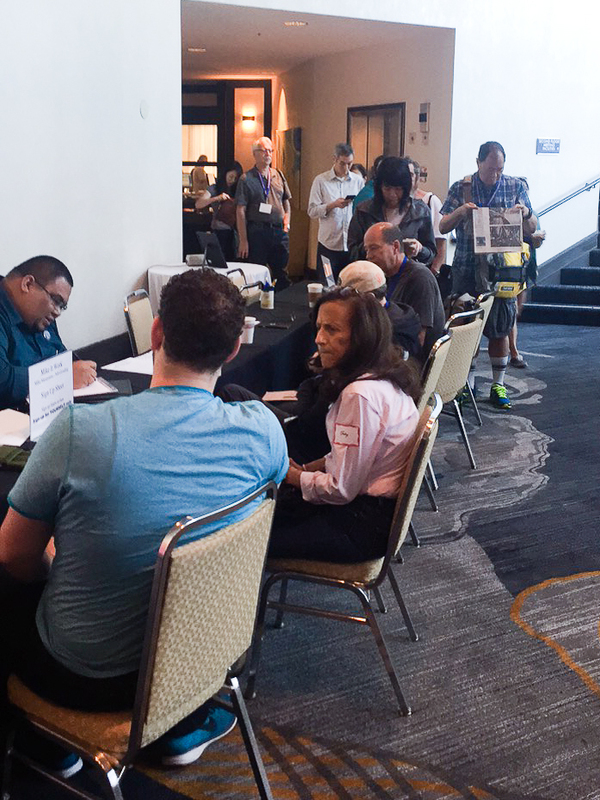 On the first day, the ballroom opens to vendors to setup at 7:00am, and the All-Access Pass Holders are let in at 8:00am. The General Public was admitted at 1:00pm later that day. Right before 8:00am, people are waiting. Photo courtesy of Ricky Chau. While at the registration desk, I get to see what people bought. This Pen Posse member came up to me and showed me his “First Blood” purchase from Stylo-Art. Around 11:00am, I finally got to walk around a little bit at the show, took a few photographs, and visited with friends. 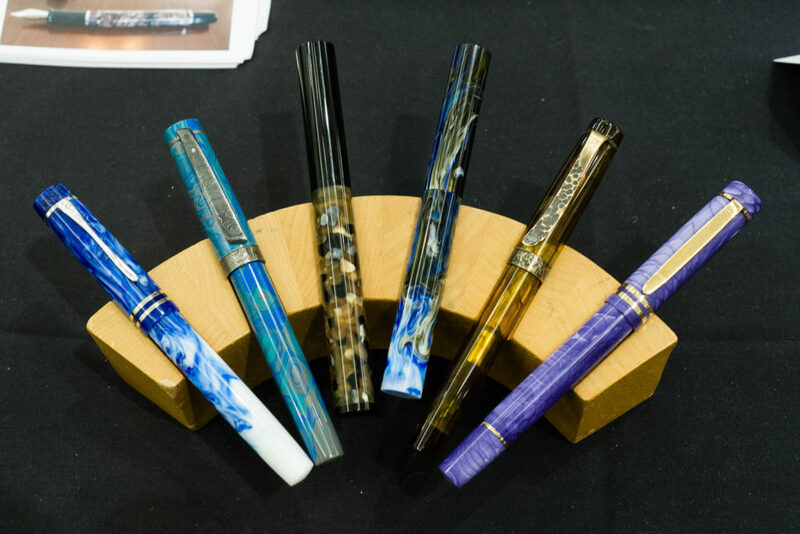 Steve Curnow and his family are back at their usual spot at the SF Pen Show. 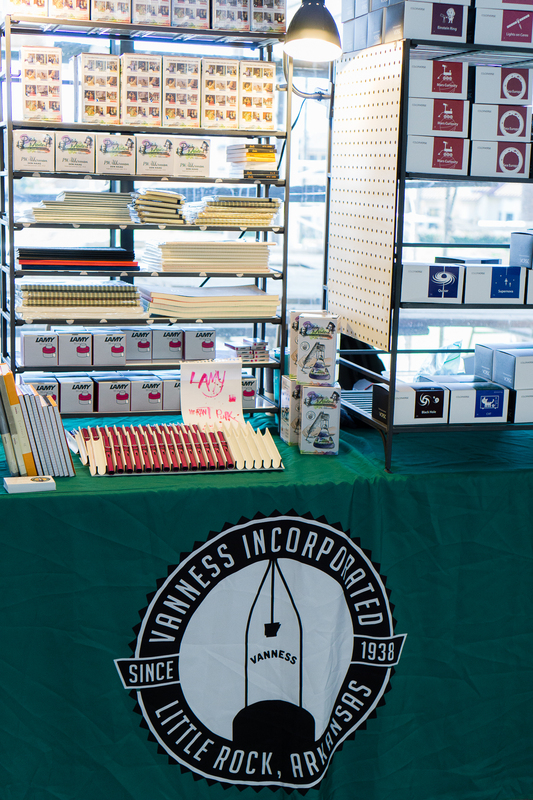 They have quality paper goods and a very good spread as you can see. 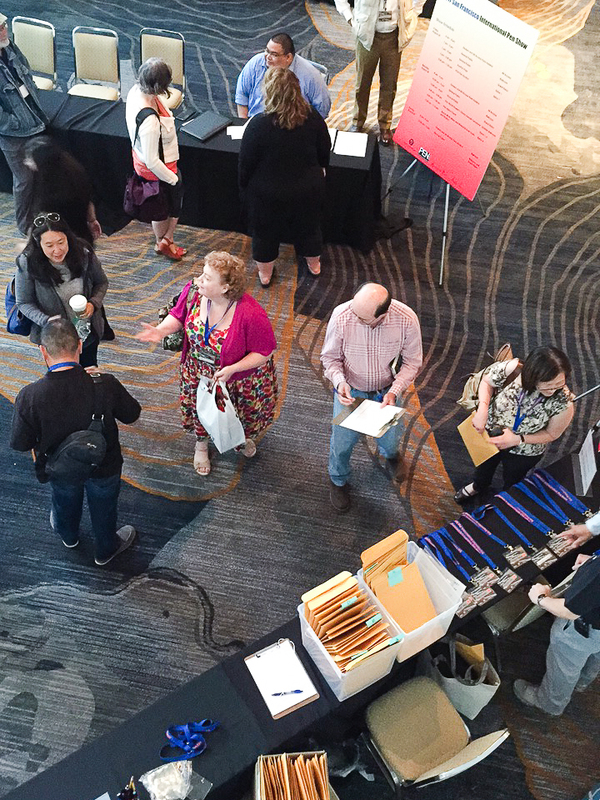 The show’s registration desk from above. 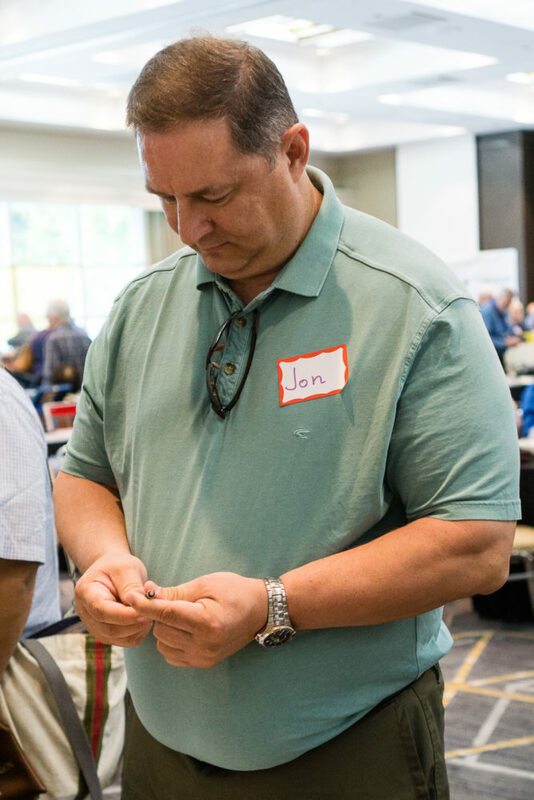 As you walk past the registration desk, Greg Weddig is back at the show and selling vintage pens as well as his Valley Oak Iron Gall Dip Pen ink. 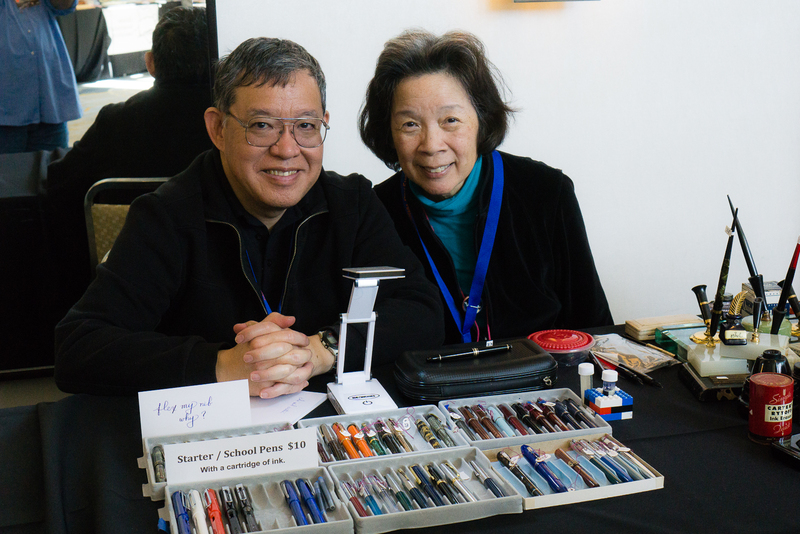 Sharing the table with Greg is Gary Naka who was also selling restored vintage pens. Kenro Industries is back as well. 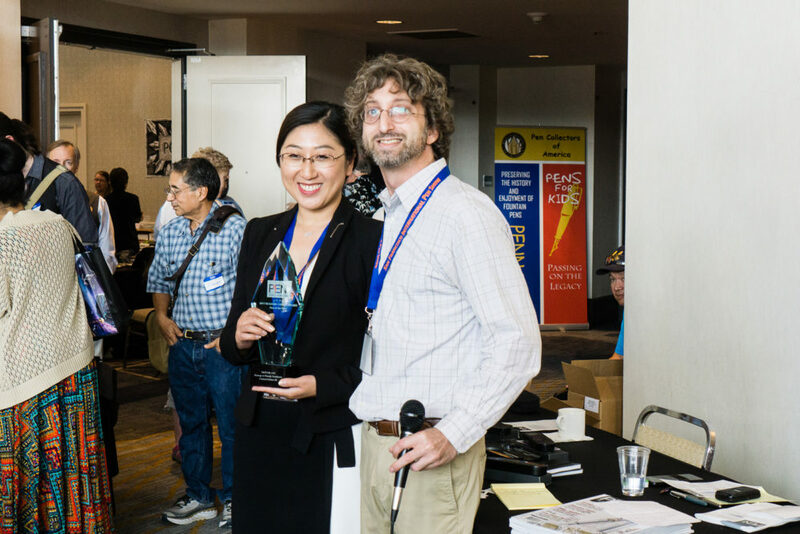 This year they were represented by Neil L., and Cary Y. (Fountain Pen Day). 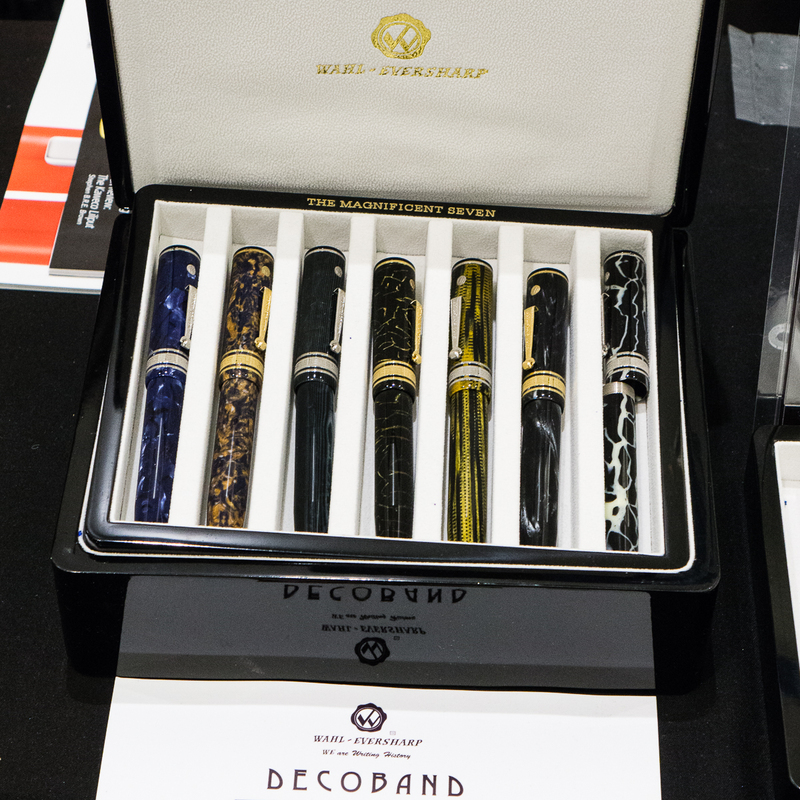 Kenro is the US distributor for Montegrappa, and Aurora pens. 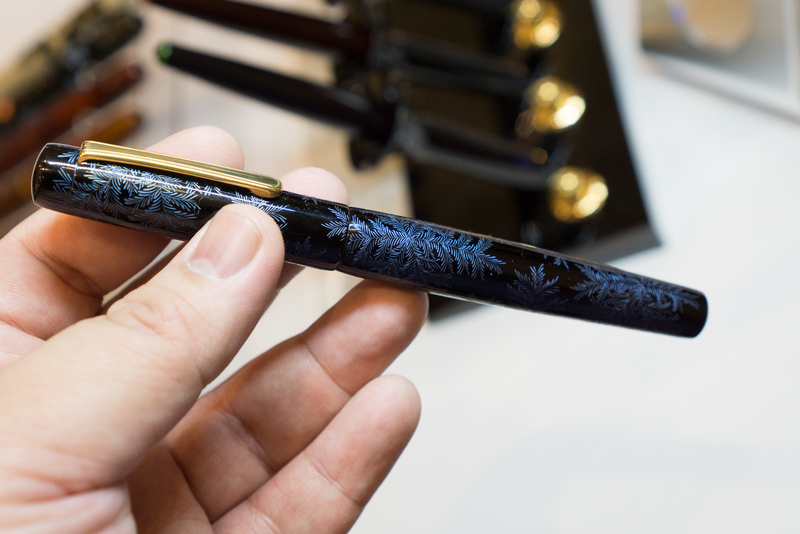 They showcased the Montegrappa Game of Thrones pens, the Aurora 88 Flex pens, and a lot more. Still within the foyer, our very own Katherine split a table with other pen posse peeps and was selling her hand carved stamps of pens, and ink bottles. 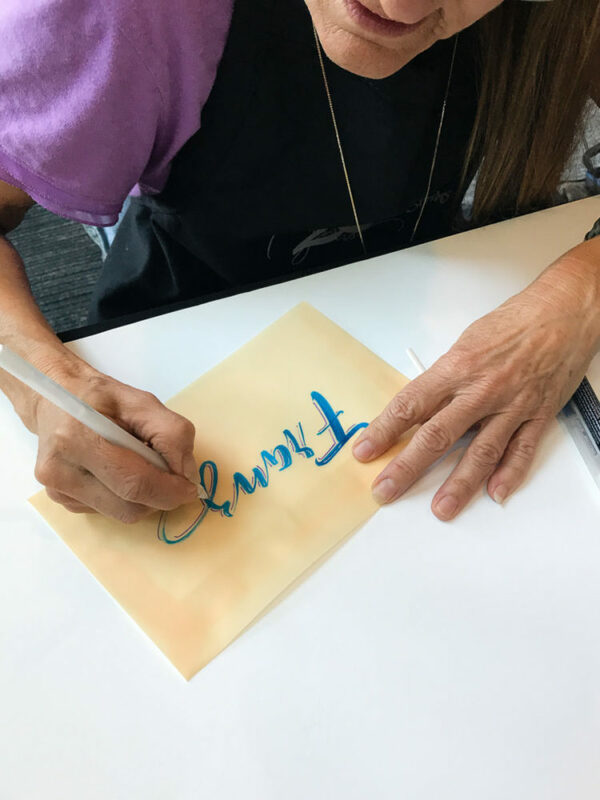 She also created a Hand Over That Pen 2017 SF Pen Show stamp for friends to mark on their journals. 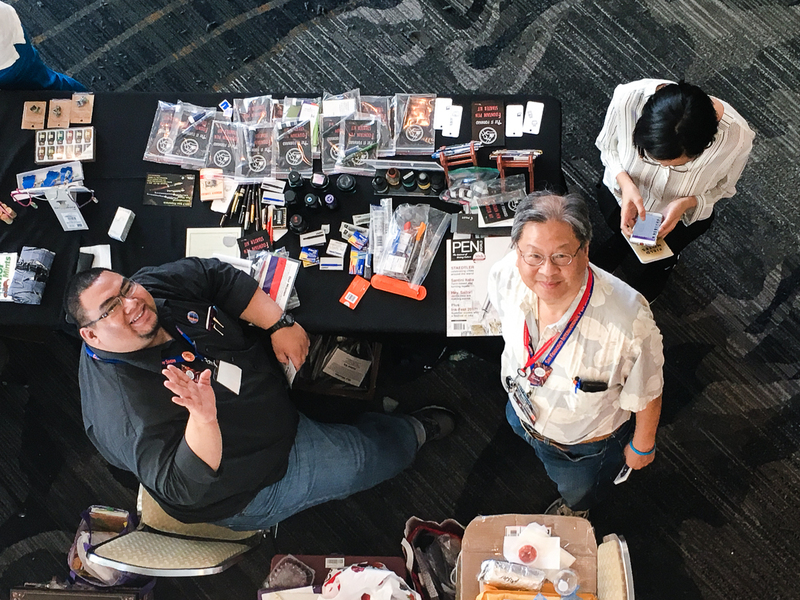 To complete the table, here’s Lawrence and Yuan who were selling pens, inks, washi tapes, etc. 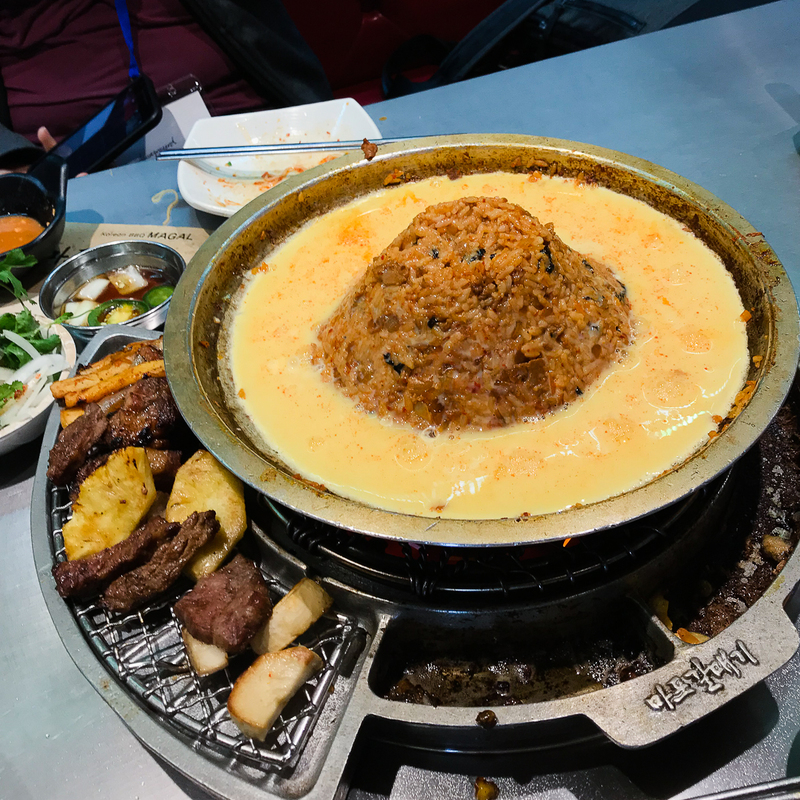 Right beside was Claire R. (@writteninrice) who occasionally is a guest reviewer on our blog. 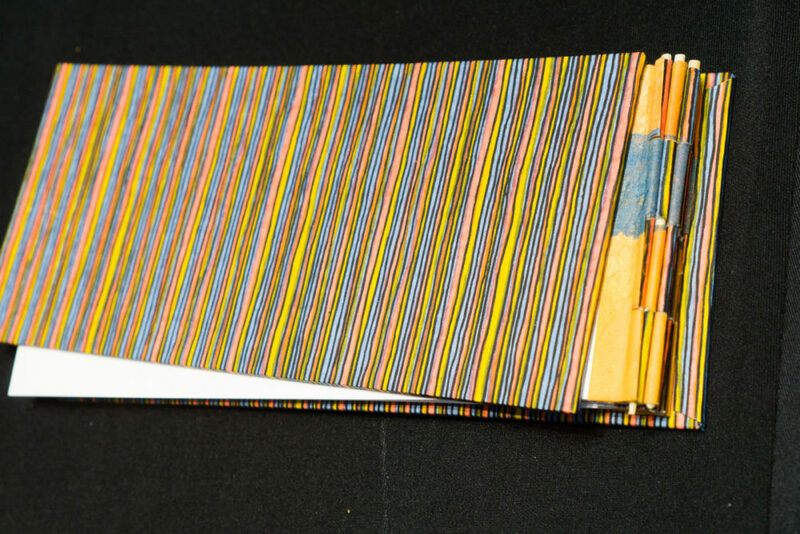 She sells great quality pen wraps and she loves prime numbers. Her current wrap design holds 7 pens very securely. 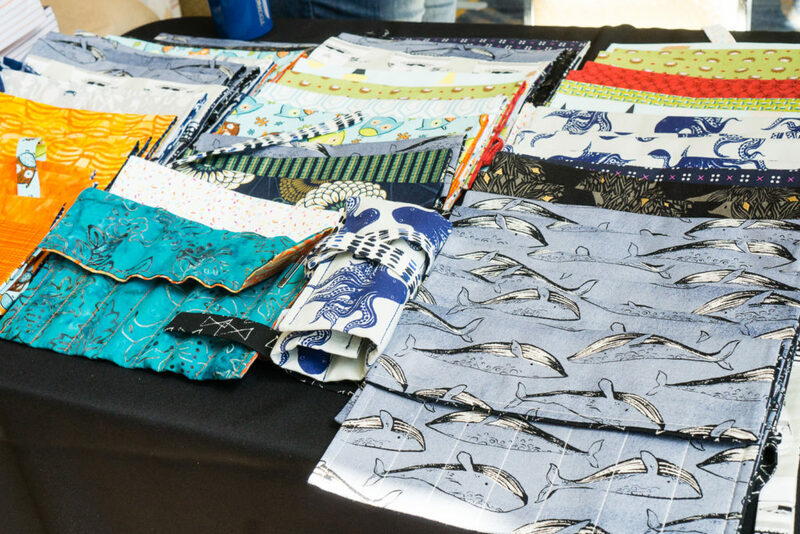 Her fabric combinations are just so cool! 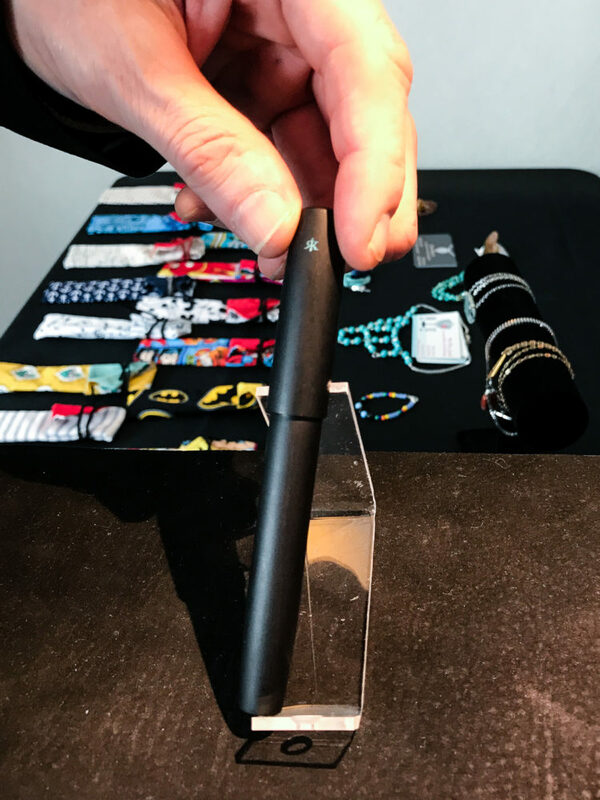 A very unique feature of the San Francisco Pen Show are the Ink Testing Stations (ITS) set up for show attendees to enjoy. 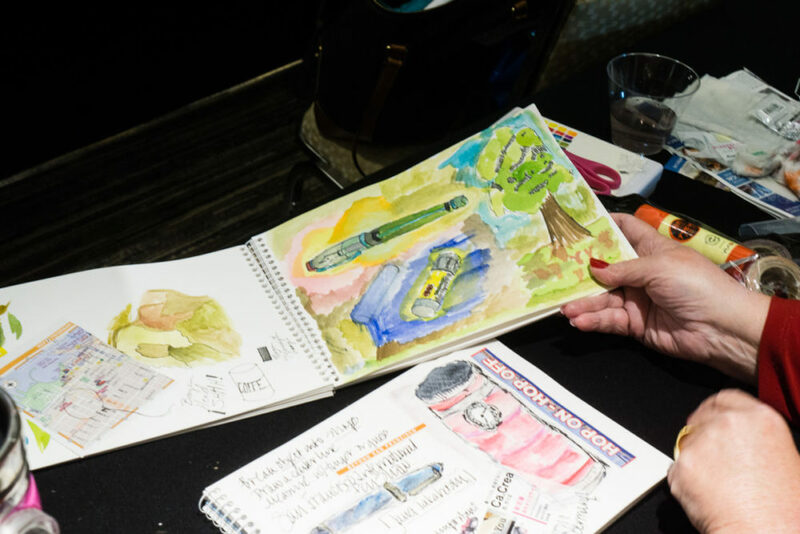 This year, round tables were scattered around the show for attendees to sit down and test the different ink brands, and colors. 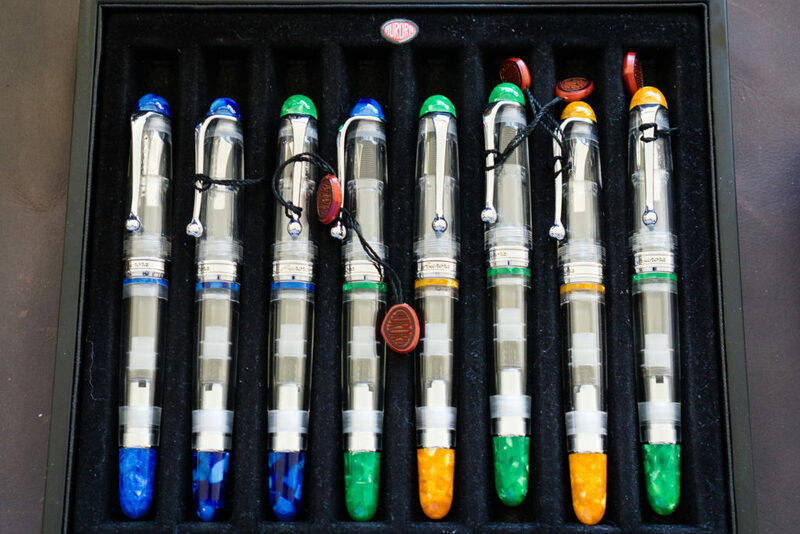 The pens used for the ITS were Dollar 717i. For 2017, there was a total of 783 inks available for testing. 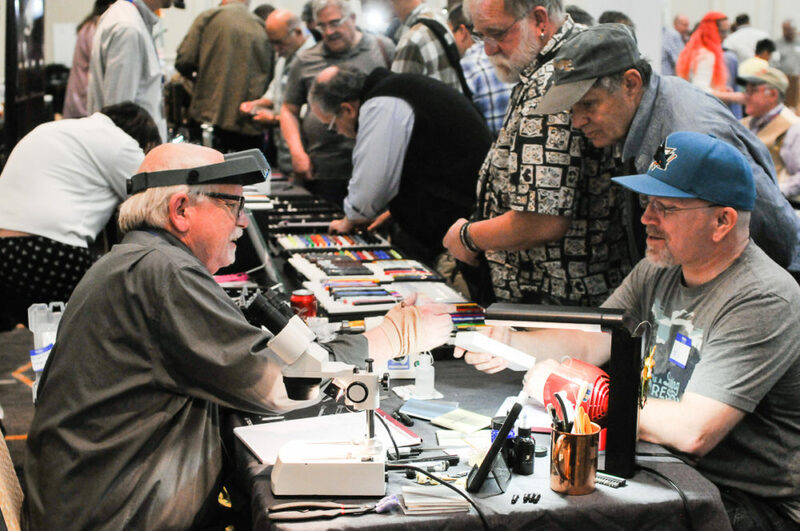 The ink lists for the past 3 years can be found on the SF Pen Show Ink Testing section of the show website. Months before the show, the Pen Posse with the direction of Ink Boss Christina, all 783 pens were cleaned, labeled, organized, and inked up for the show. 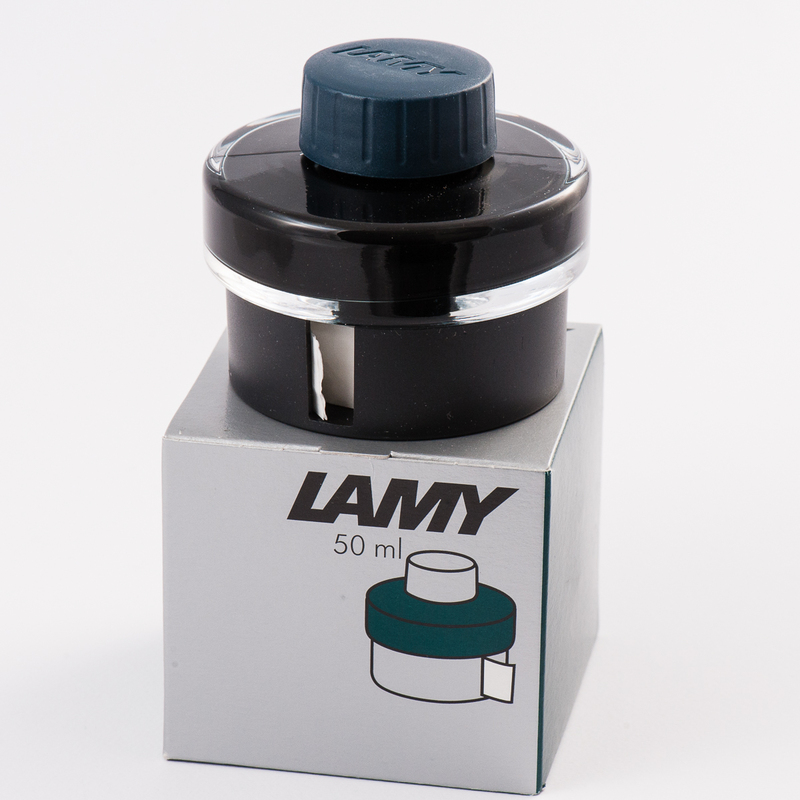 We had different companies donate inks for the Ink Testing Stations. 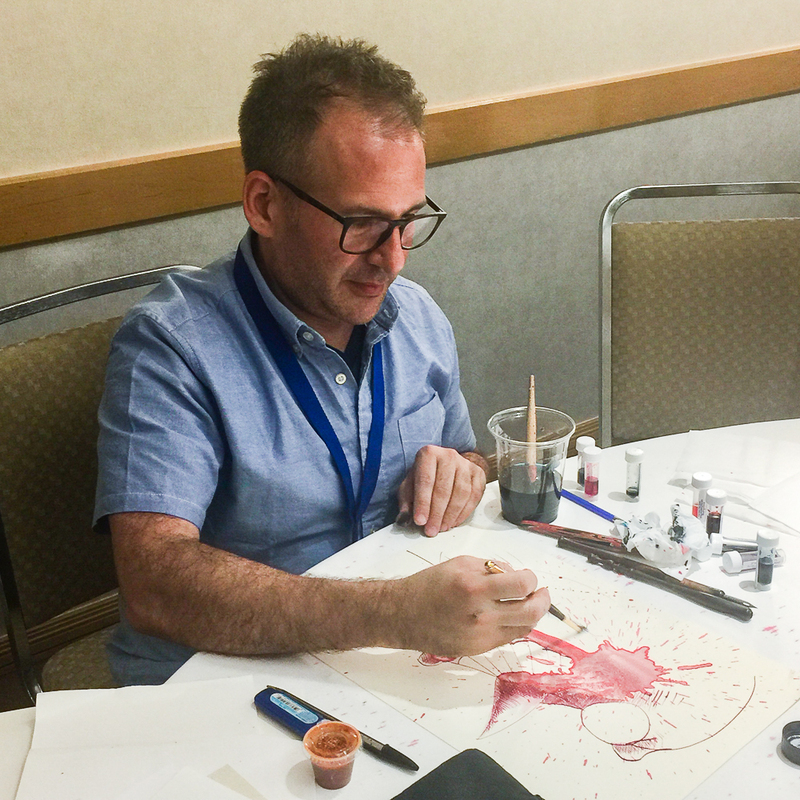 Luxury Brands donated their inks, Franklin-Christoph gave us their inks as well, Robert Oster donated 60 bottles of their inks, and Vanness Pens donated Organics Studio inks. Thank you very much for your generosity! 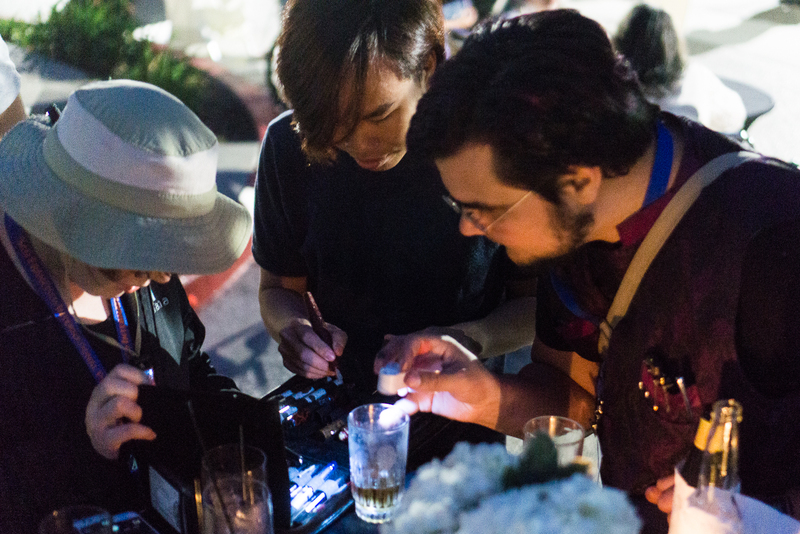 Right before the ballroom was an Ink Testing Station table. This table always had people sitting down. To my knowledge, one person successfully wrote and tested all 783 inks during the weekend! At the show, Patrick represented the Robert Oster company from Australia. 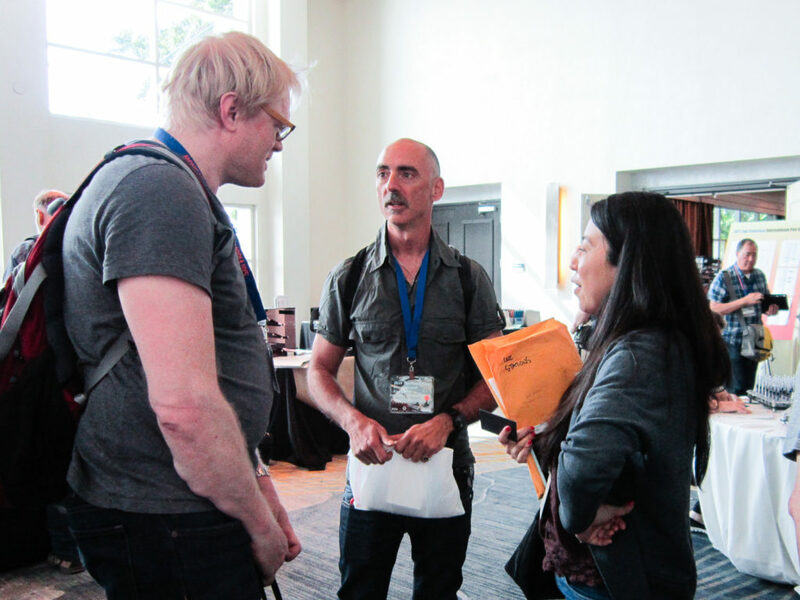 Here’s Patrick speaking with Brian and Christina of the Pen Posse. 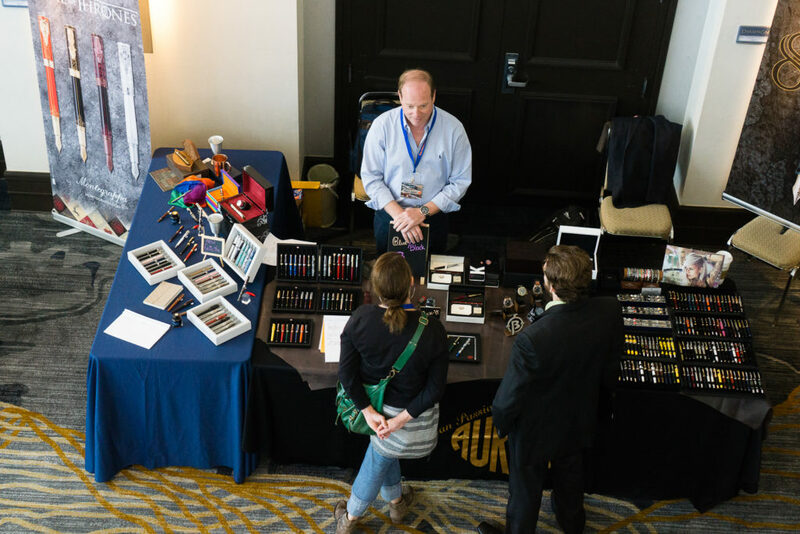 Walking into the ballroom, you will find Andy Lambrou of Lambrou Pens (formerly Classic Pens) and his associate, Monica, to your left. 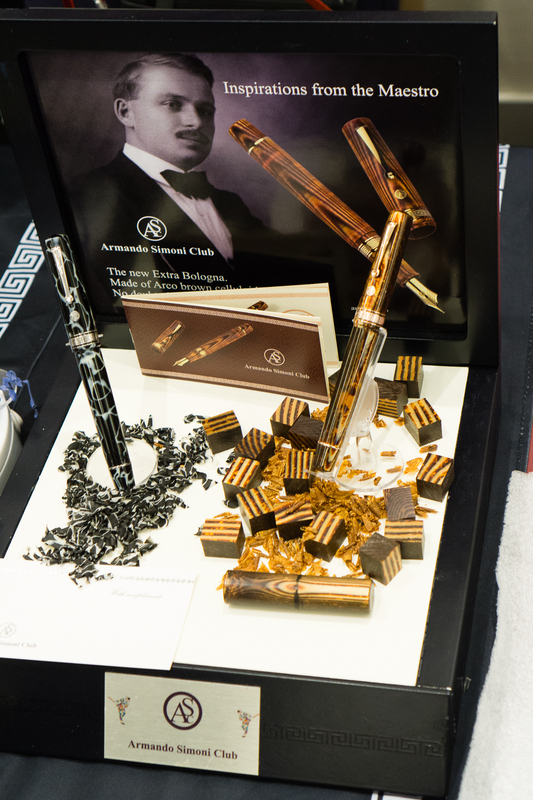 He has been attending the San Francisco pen show since 2014 and brings exquisite pens. 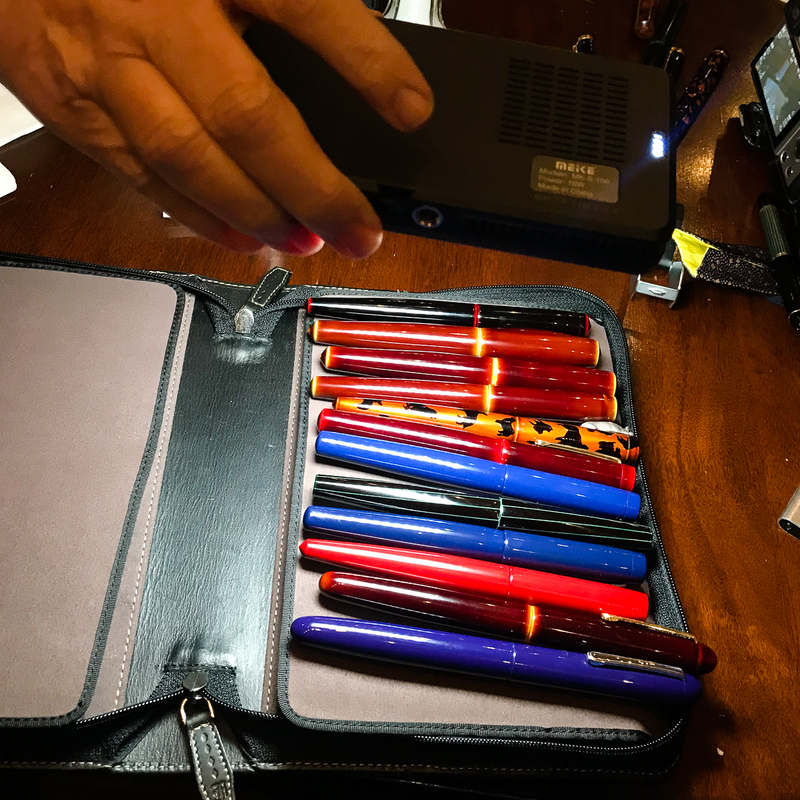 This year, he brought a case full of Classic Pens CP-8, Lambrou Pens LB-6, and a few of the LB4 Tahiti pens. Walking over to the left was Itoya’s table. 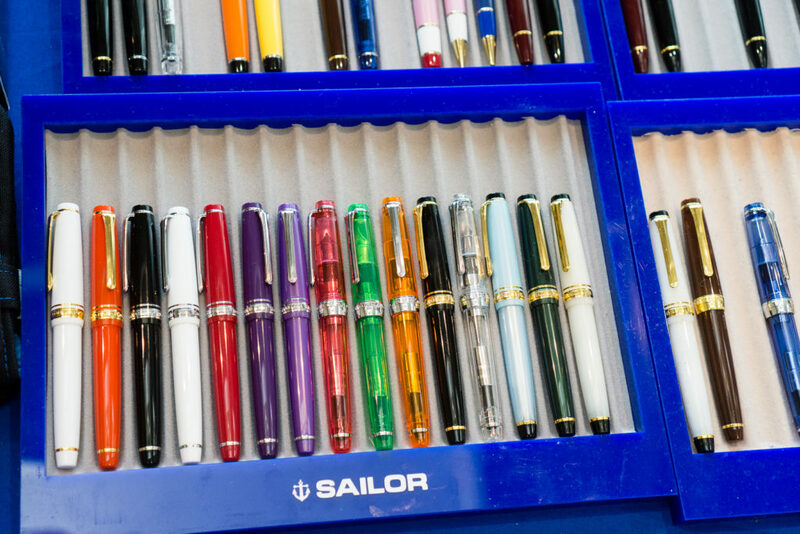 Itoya is the US Distributor of Sailor pens as well as Taccia pens. 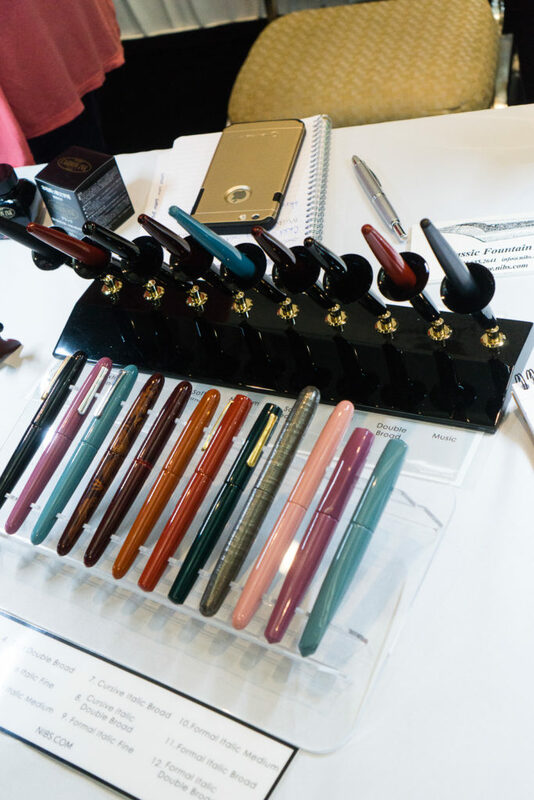 It was Itoya’s first time at the SF pen show and they brought a nice display of their Pro Gear pens inked up with their different inks. A little further in to the ballroom was The PENguin’s table. 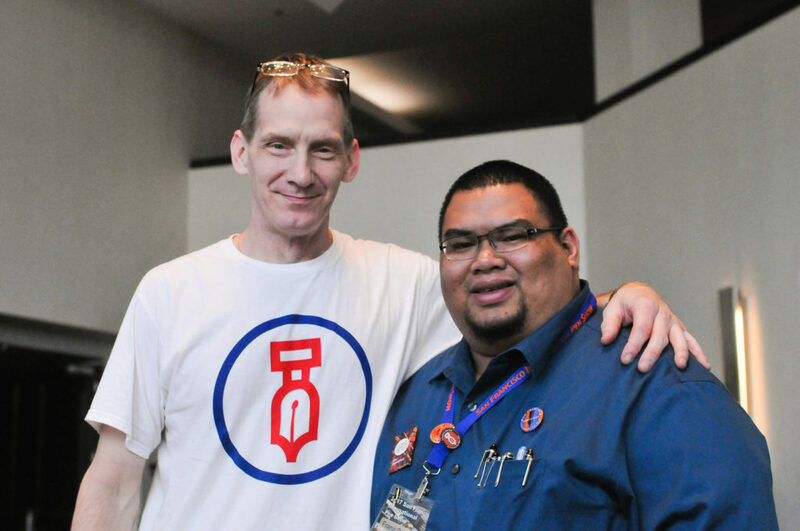 That’s Mr. Rick Propas who is a very well-known expert of German pens especially Pelikan pens. I always try my best to visit with him and say hello. 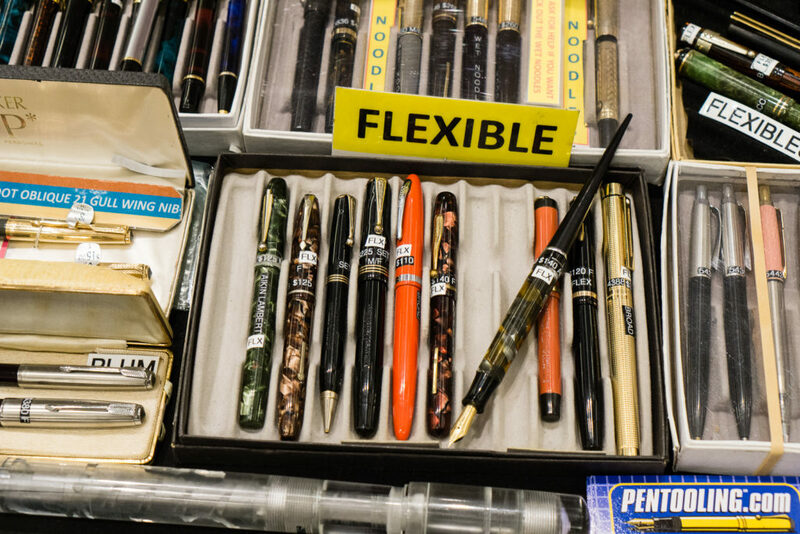 Also, to take a look at his pens for sale. 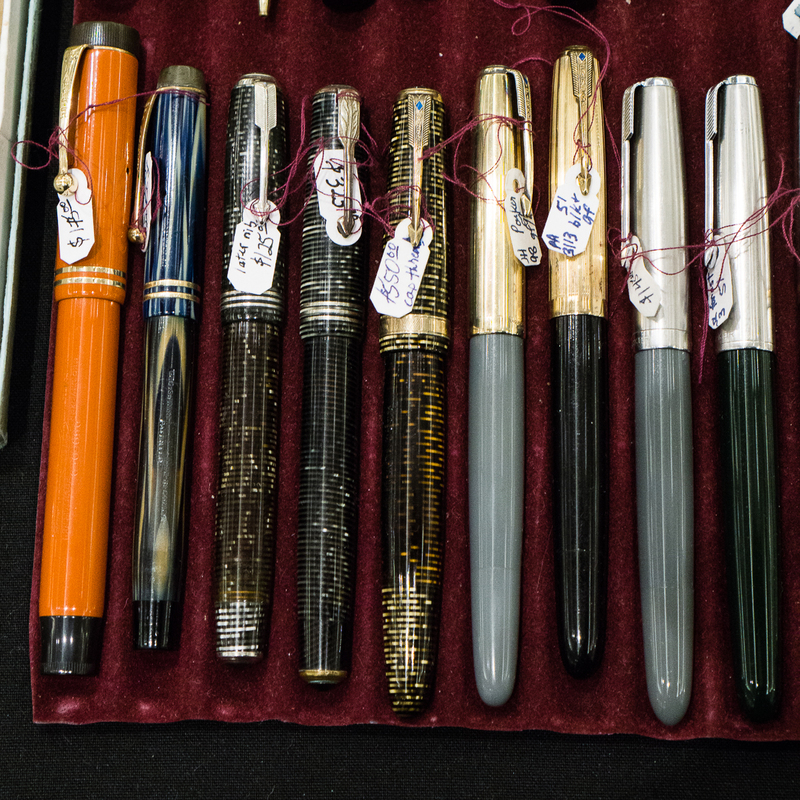 Rick Propas always has arrays of vintage pens at his table. 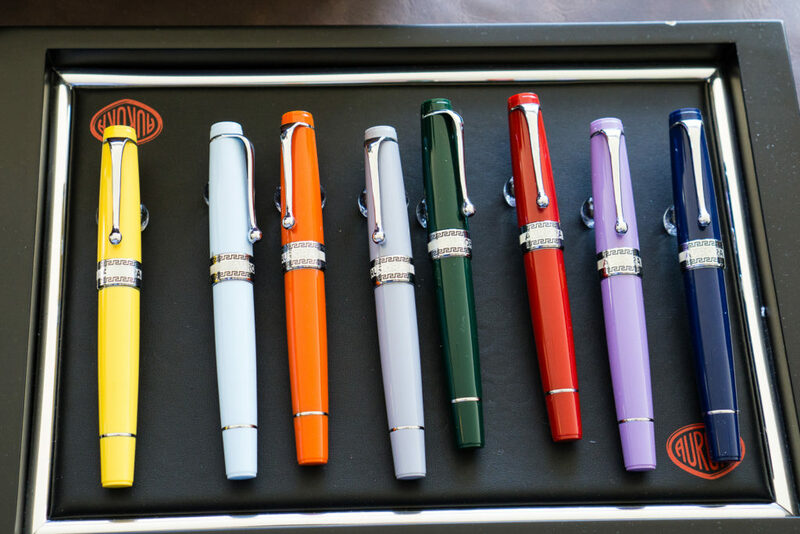 Majority of the pens pictured are the Pelikan 100 in different finishes. 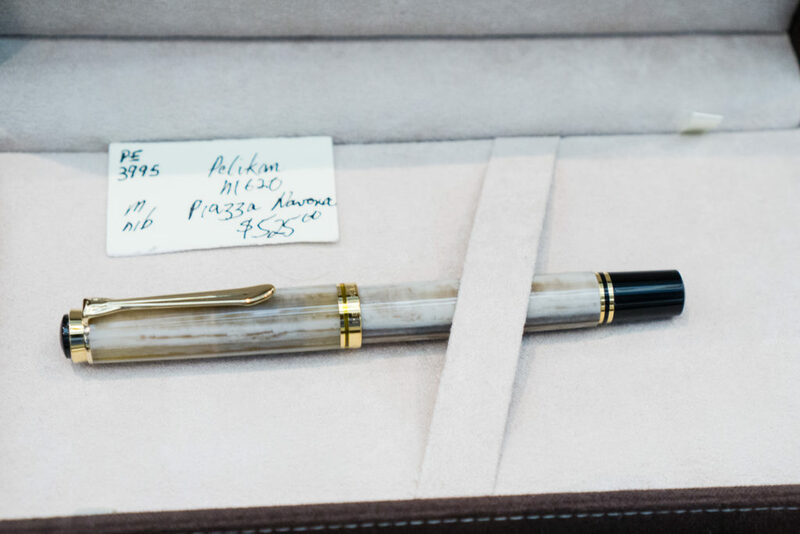 One of the special edition Pelikan City Series pens, the M620 Piazza Navona. 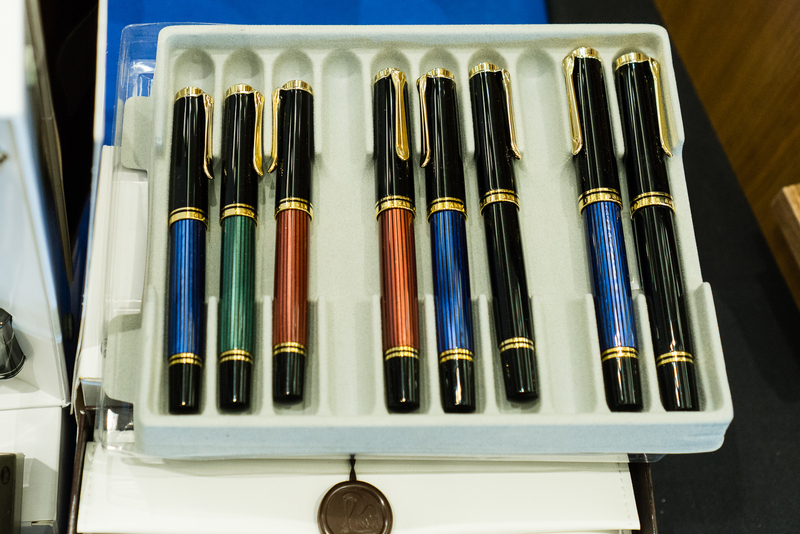 These are sought after by Pelikan collectors. 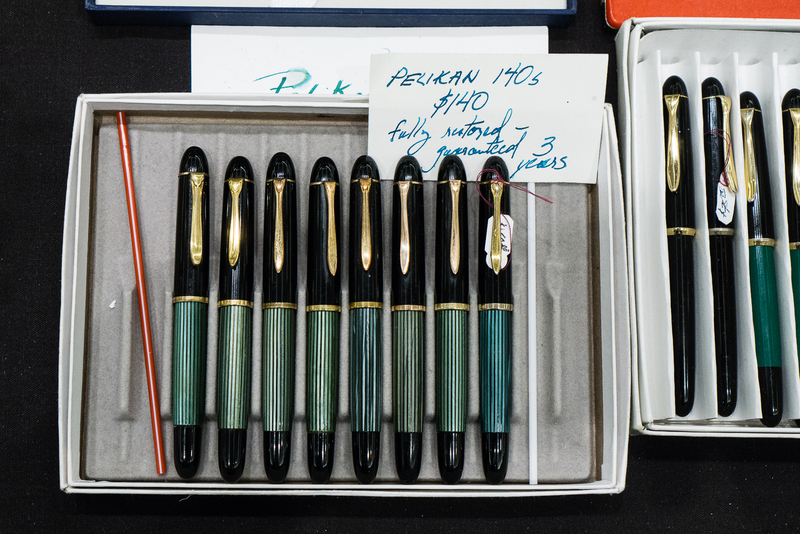 A few vintage Pelikan 400NN sets on the left, a Pelikan M800 Blue Striated, and a Pelikan P&K 30 set on the right. 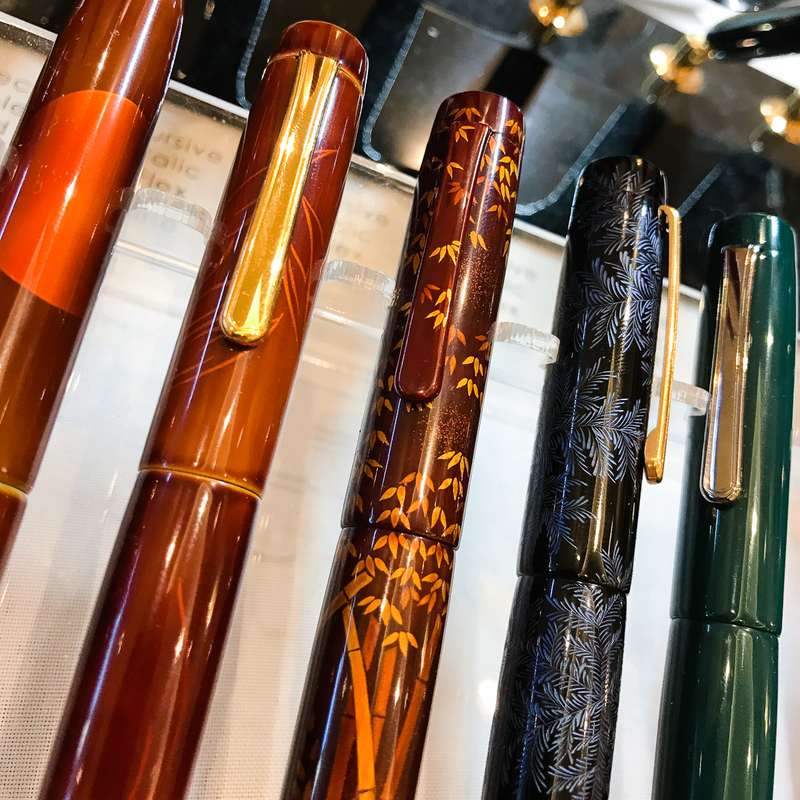 Classic Fountain Pens aka nibs.com came back to the SF Pen Show this year and had several Nakaya pens on display. 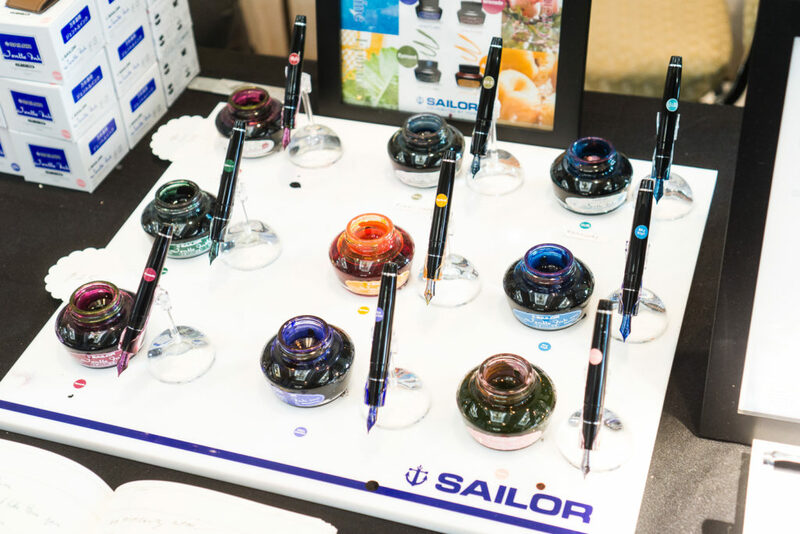 There were testers with their different nib sizes inked up for people to try out. 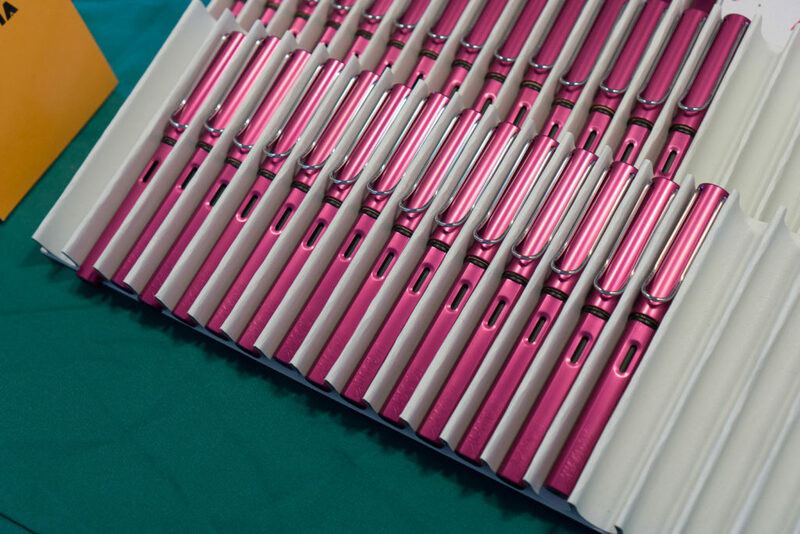 Jonella set the table up on Friday and was there to answer questions, and take in orders of their pens all weekend. 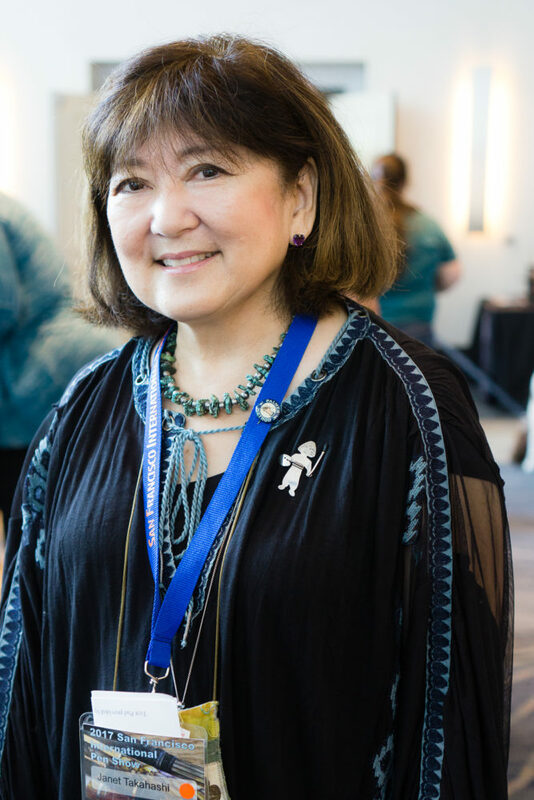 I’ve known her since my 2014 LA Pen Show experience (Pen Posse OPM). 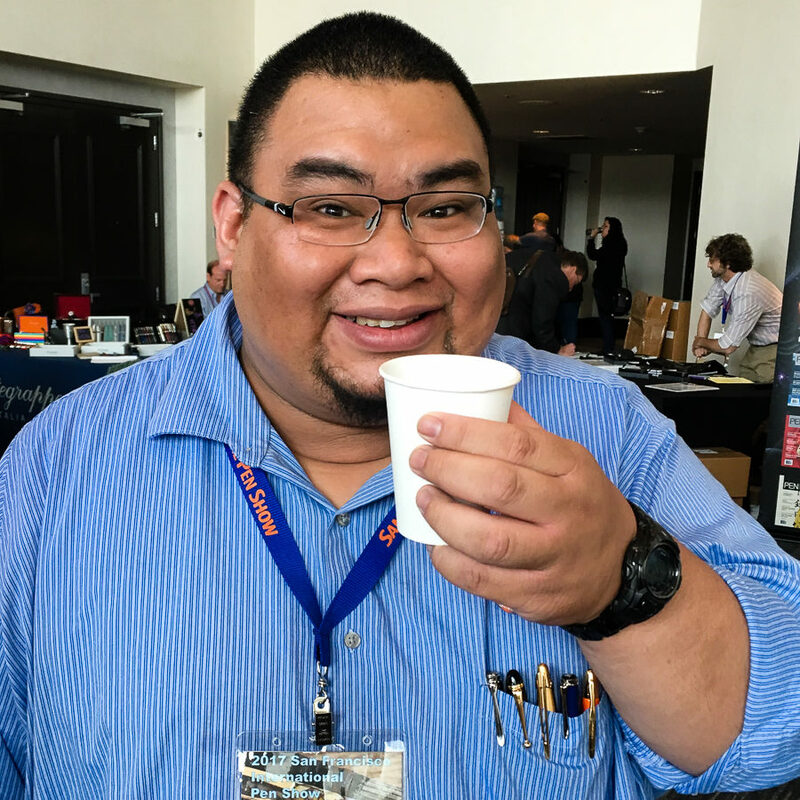 Here’s Matt Armstrong of The Pen Habit blog came back to the show! And once again, he helped the Vanness Pens team at their table. 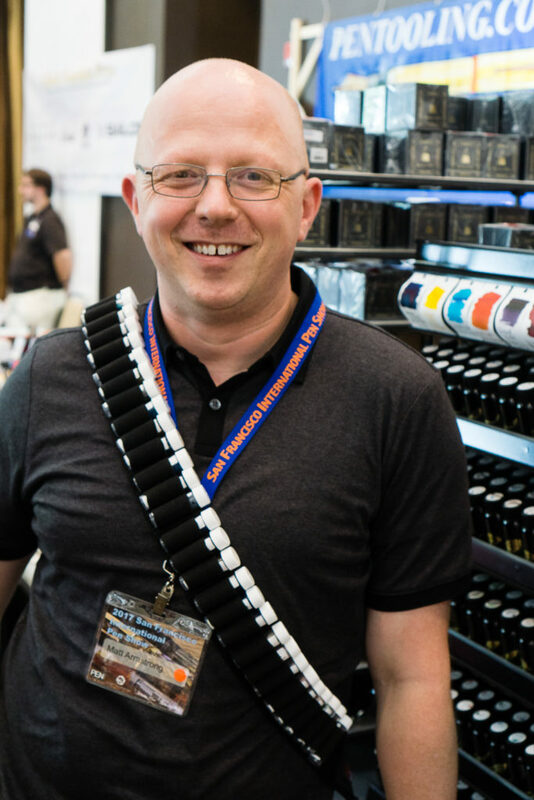 Matt and his bandolier of ink samples! 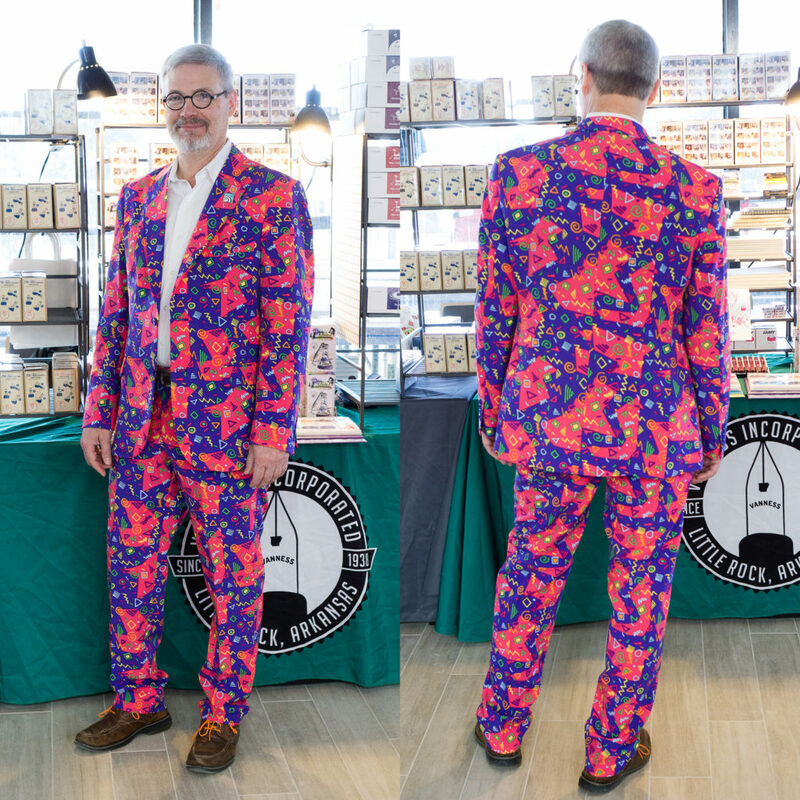 He’s ready for either an ink battle or a barrage of ink questions at Vanness Pens. 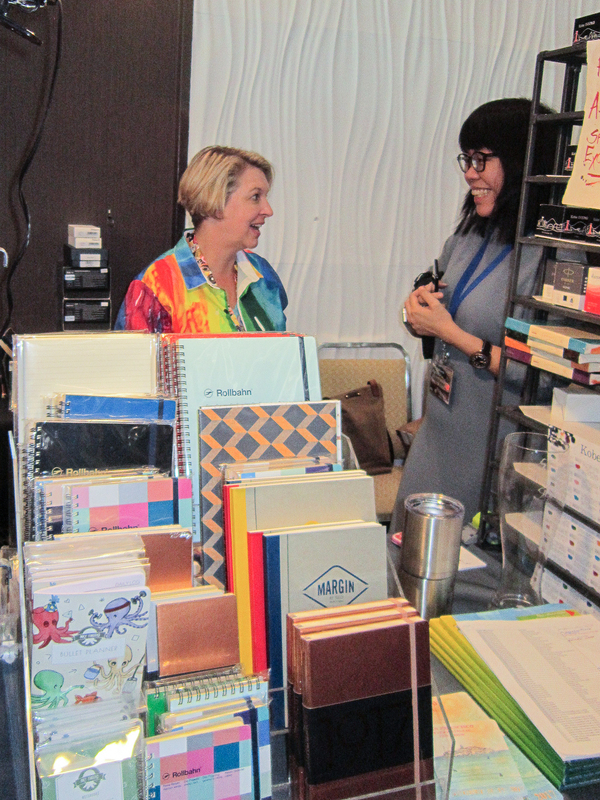 Lisa Vanness and Leigh Reyes during a light moment behind the Vanness Pens table. Photo by Gary Naka. 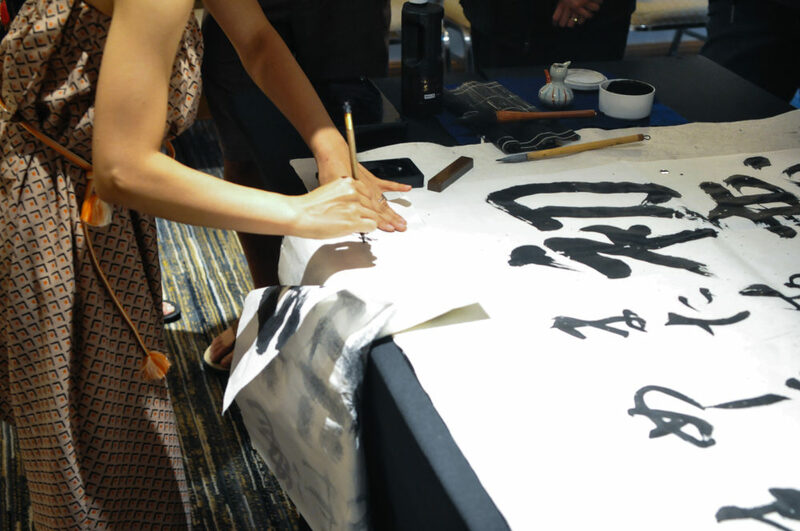 Kick A$$ Calligrapher Nik Pang was at the show as well. He was selling nib holders and was writing people’s names. 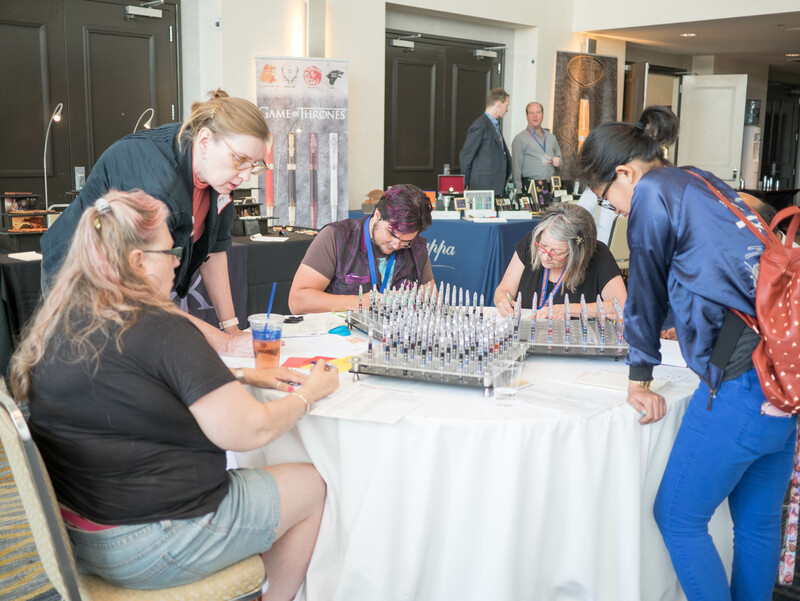 As I walked out of the ballroom to do more pen show duties, I saw more people testing out the Ink Stations. A few more show attendees ink testing. This was inside the Grand Salon room. 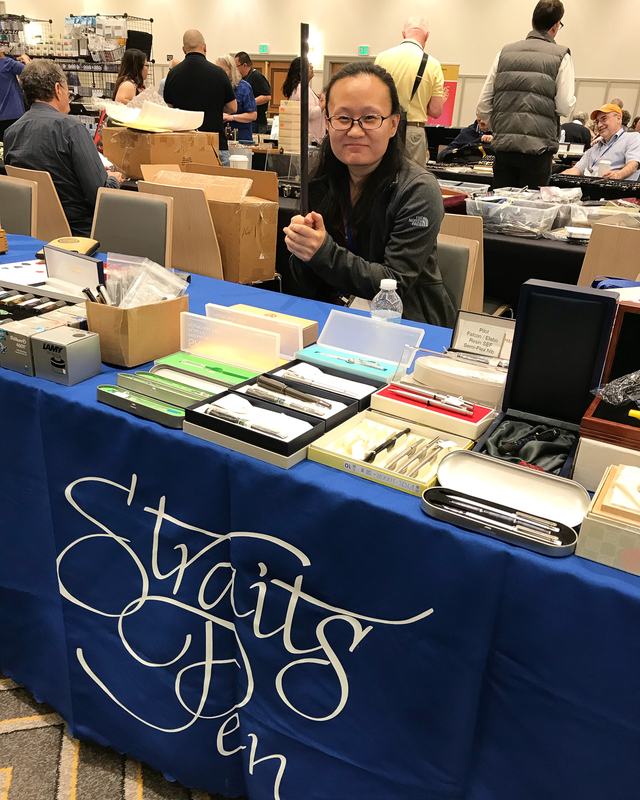 One of the SF Pen Show’s sponsors is Straits Pen represented by Sunny Koh. He brings in a lot of pens and inks from Asia. 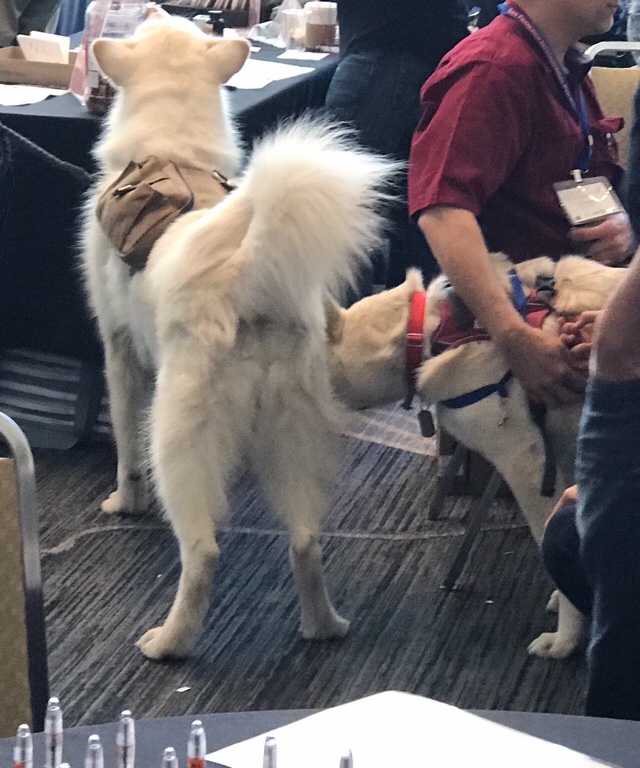 I caught him having a snack by the registration desk with a friend. Pen Posse: Sunny Koh and Don (Sorry Don!) getting ready to snack on a hard boiled egg. Friday’s show went on, met more awesome friends during the day. 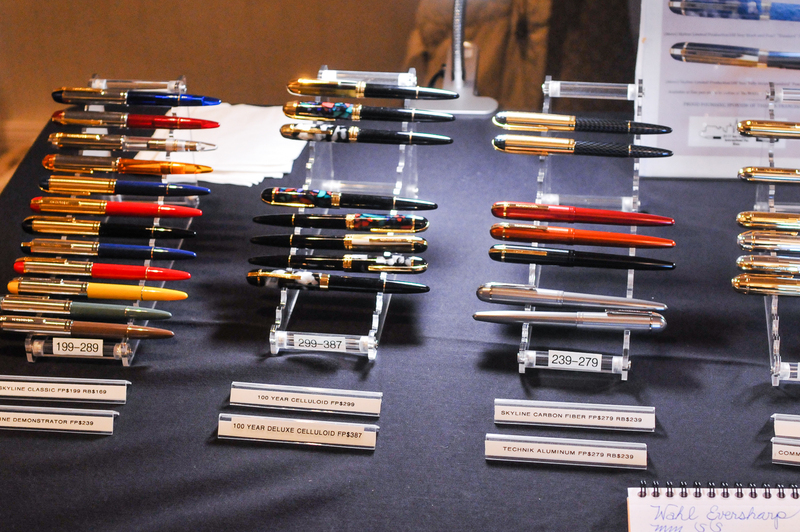 The show ballroom closes down at 5:00pm and the Pen Collectors of America (PCA) held a pen auction at 5:30pm. I registered and got paddle 27 but I eventually didn’t go and just hung out with people. I gave my paddle to a pen posse friend and apparently paddle 27 was very active. Haha! 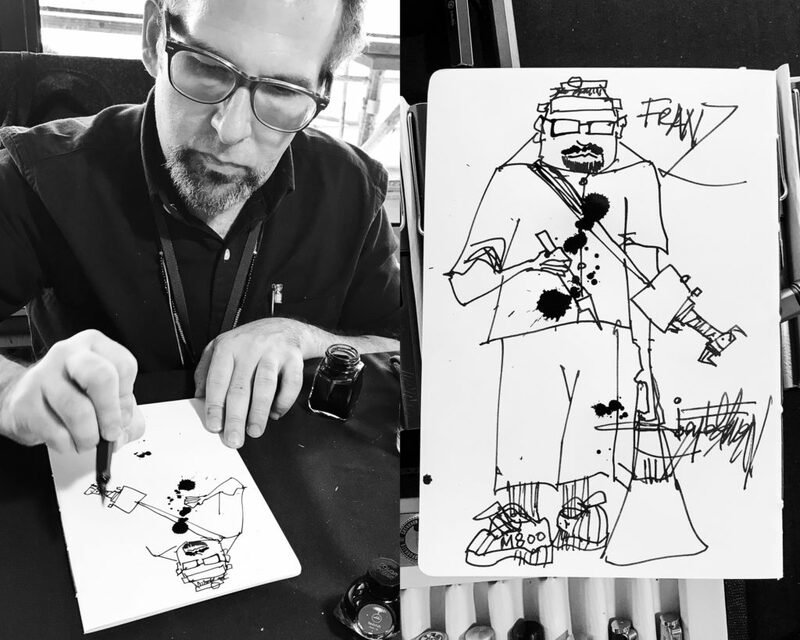 One of the reasons why I did not go to the auction was that I realized that I missed my reserved time with The Nib Smith, Dan Smith. So I waited to be the last person he’d help for the day and I picked up the only pen on my pen show list. The Fabulosa! I mean, the Aurora 88 Nebulosa. 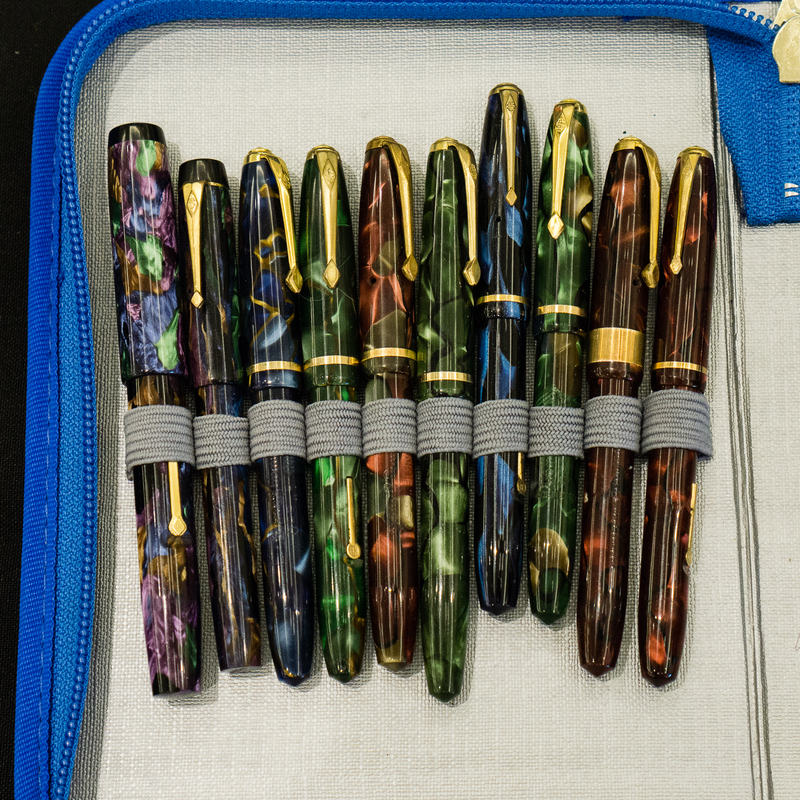 Show and Tell: I rarely share my haul at pen shows but that Nebulosa is yummy! After a fun first day, a large group of us went to the Pen Posse favorite, Amici’s East Coast Pizzeria for dinner. It was a quick 5 minute drive from the hotel. 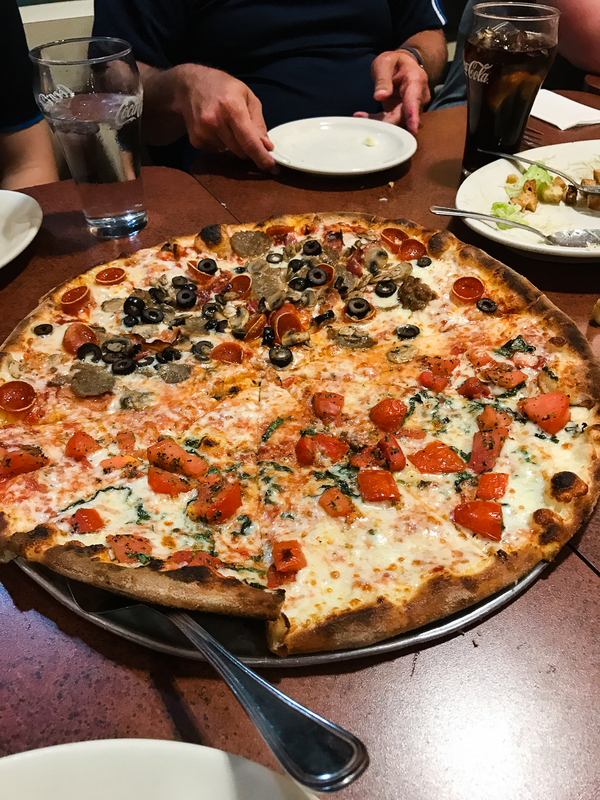 I only got to take this one picture of the pizza before we devoured… ate it. 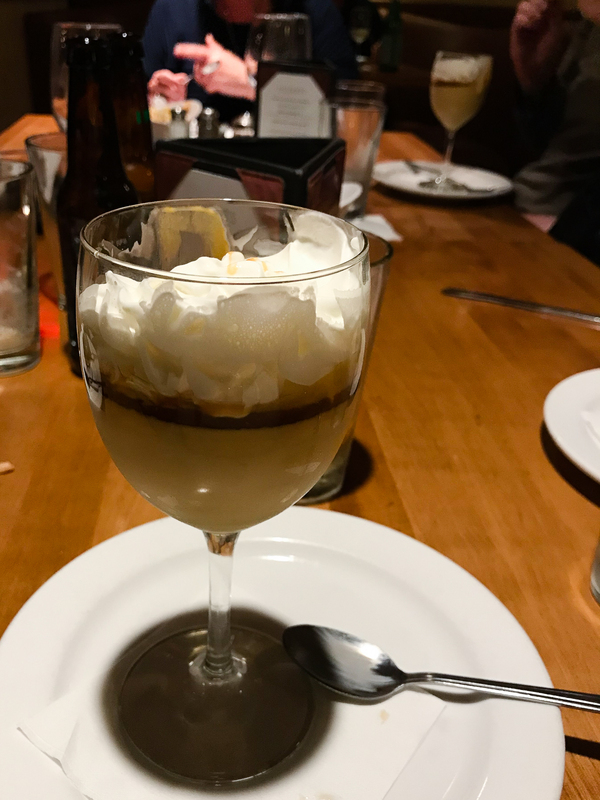 After dinner comes my favorite part of pen shows. Back at the hotel bar, it’s hanging out with the people you saw at the show. Sharing the items bought, and telling the stories of the day. 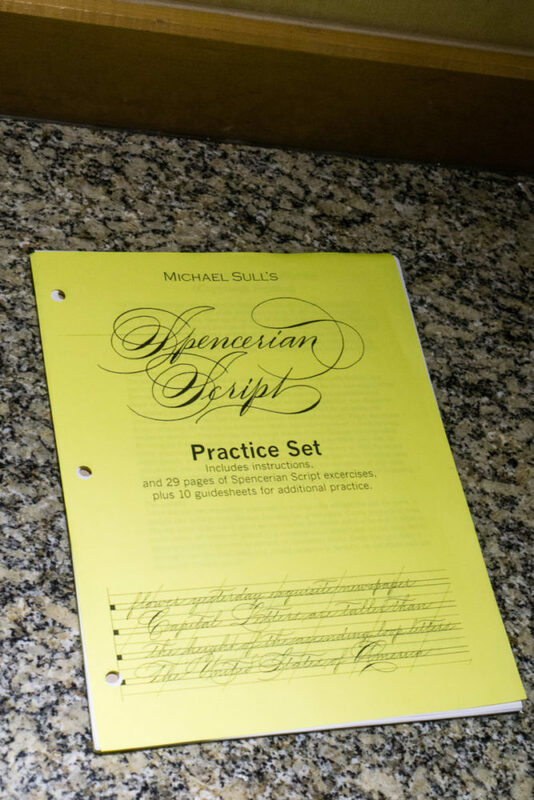 As Eleanor said before, it’s Pen Shows After Dark! 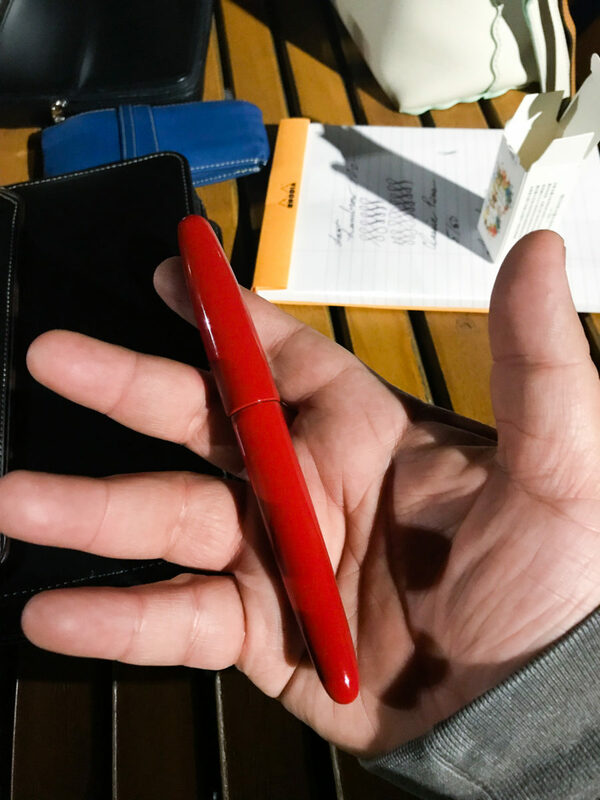 At the Bar: Pen Play! 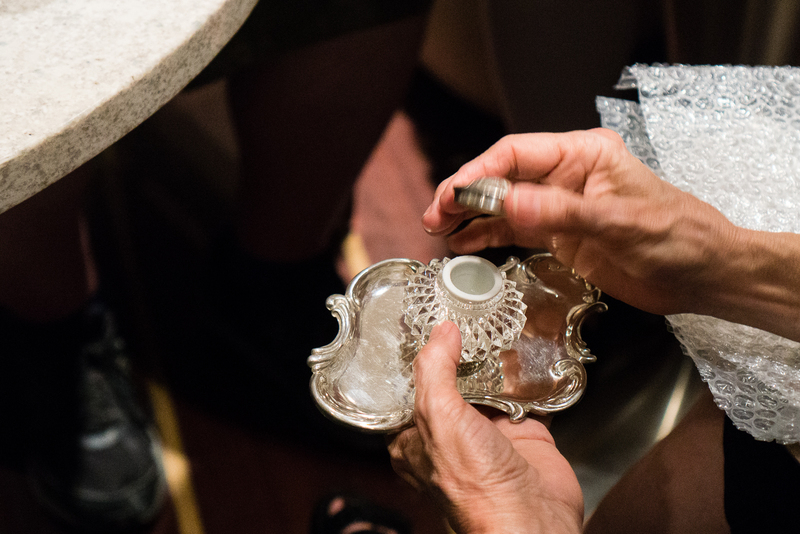 At the Bar: Someone bought an inkwell. Neat! 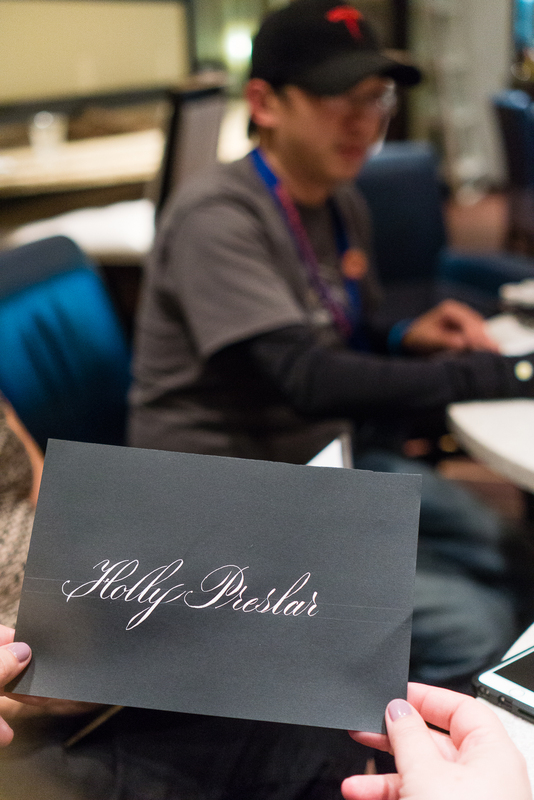 At the Bar: Nik Pang wrote Holly’s name down as the group was talking. 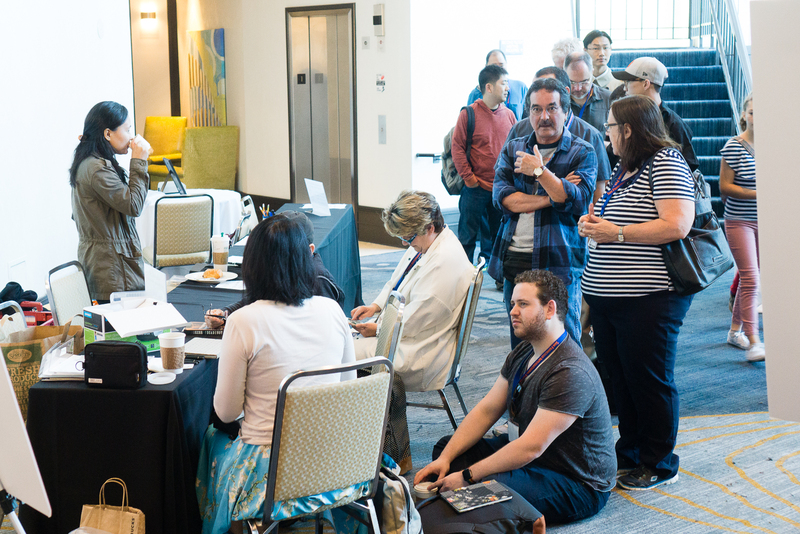 On Saturday, the ballroom once again opens to vendors to setup at 7:00am, and the All-Access Pass Holders are let in at 8:00am. The General Public was admitted at 10:00am in the morning. After a late night of pen-joyment, I sleepily got ready for another fun day. Pen shows are the only events that I would look forward to going to bed in the wee hours of the morning and then wake up WAY earlier than when I have to go to work. It’s what I call Pen Show Time Zone (PSTZ) and I love it. 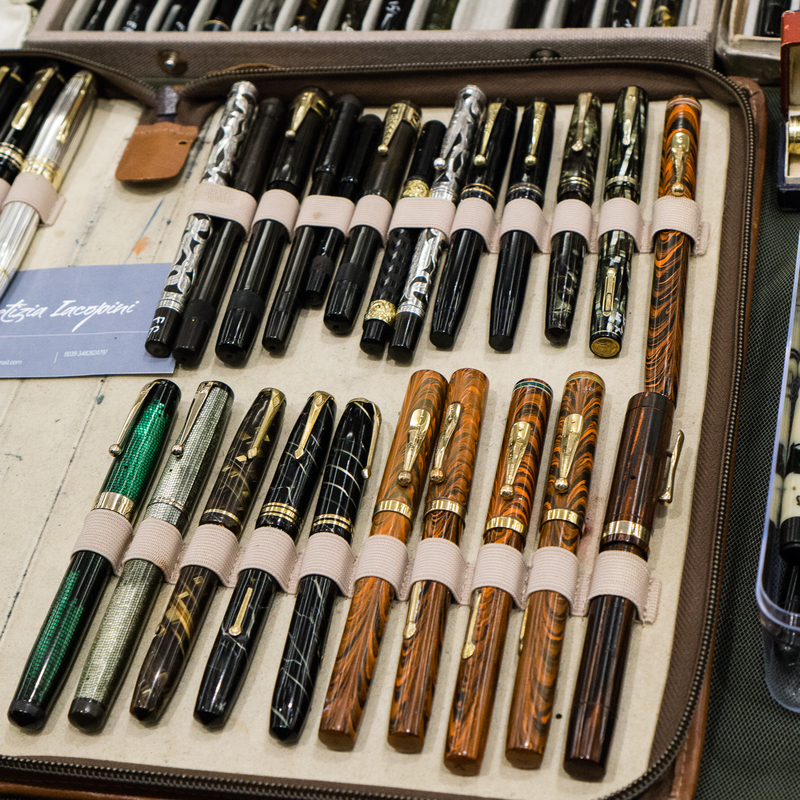 Typically, Saturday is the busiest day for the pen show and is the day when the most number of people attend. 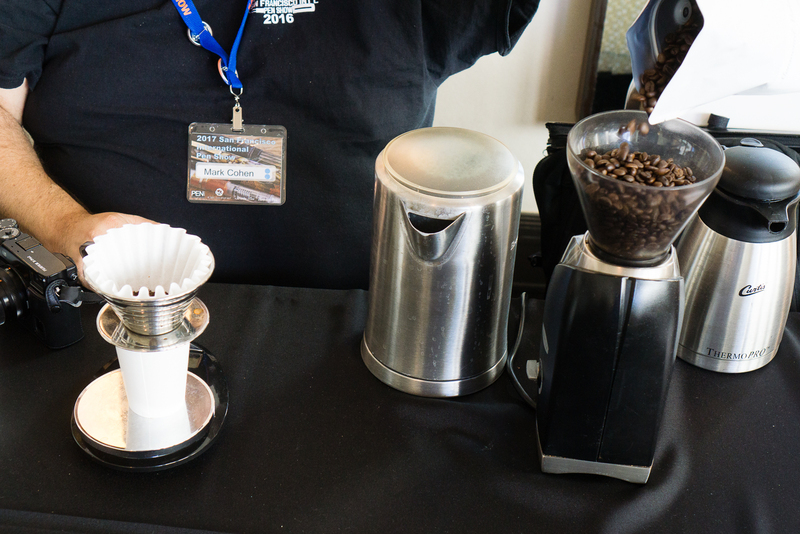 This year was no exception and with all the events jam-packed, it definitely was a busy show day. I arrived around 7:00am once again for the registration desk and for the classes and seminars being held on Saturday. When I arrived, there were already a few people in line for Mr. Mike Masuyama’s sign up sheet. Masuyama-san did something different this year in that he asked the registration desk to do the sign up for him instead of it being at his table. So the sheet was brought out at 8:00am for people to write their names and phone numbers. 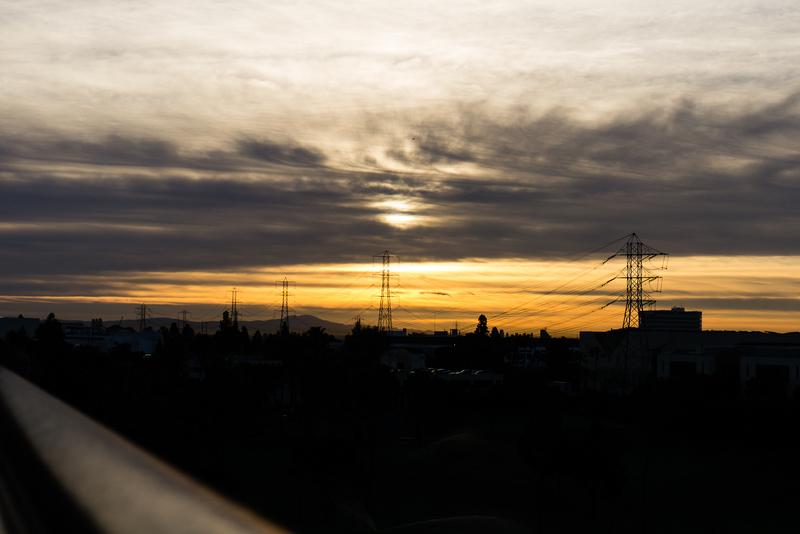 The photo below was around 7:45am and good thing I got to take it. The Saturday Masuamaya-san line. A few of these people were in line for all 3 days. 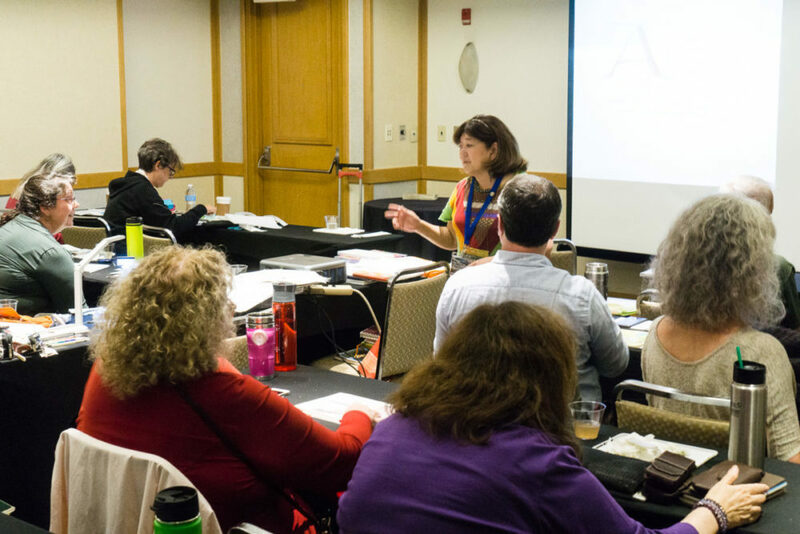 For Saturday, there were a combination of 2 paid classes and 3 free seminars. 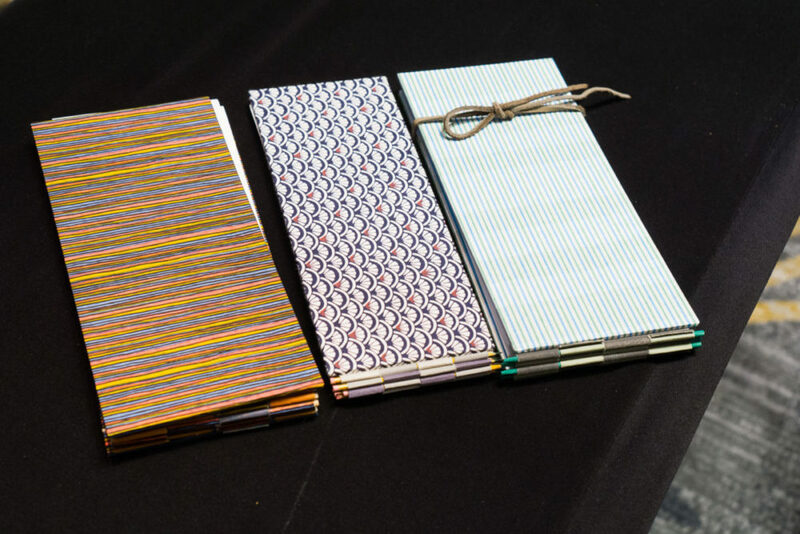 Here are examples of the special edition books that Virginia designed for the pen show. You can add or remove pages as you go. 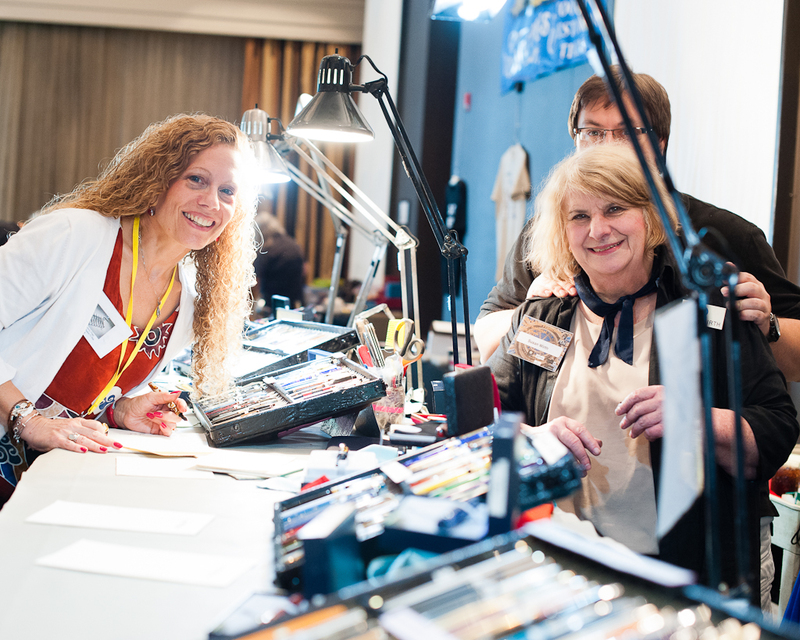 Something new for the pen show this year was that there were volunteers each day to do calligraphy demonstrations. 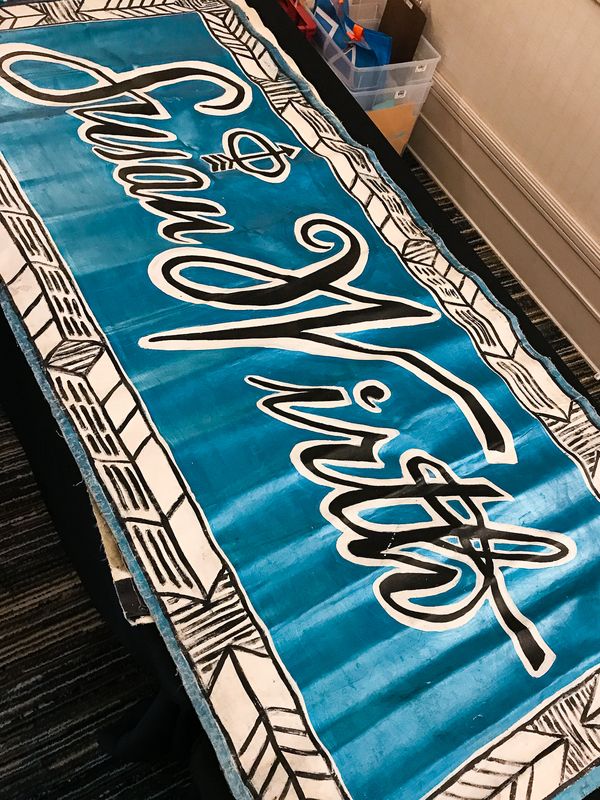 The volunteers came from The Pacific Scribes Guild, and Friends of Calligraphy Guild. Their tables were located at the foyer across the registration desk so I got to check them out and two ladies wrote my name. 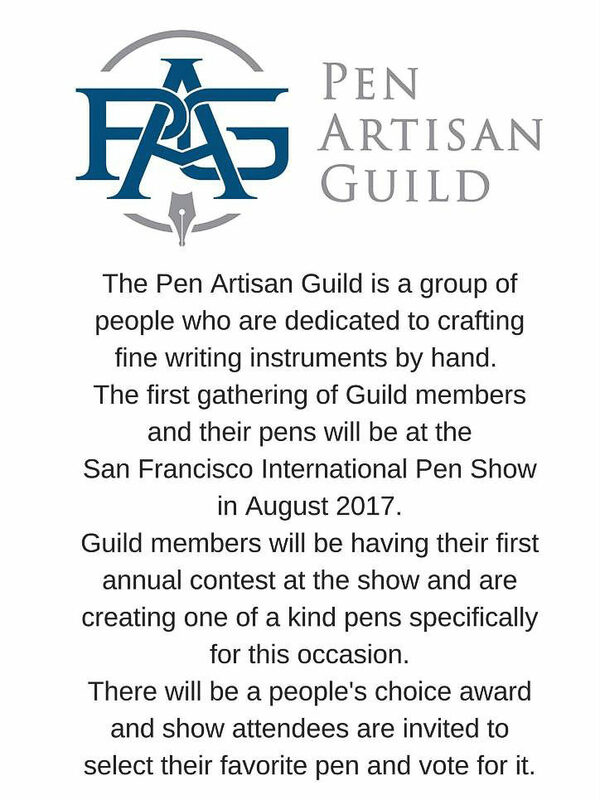 Another new event for the pen show this year was that the Pen Artisan Guild held their first annual contest for guild members and created one of a kind pens for the contest. 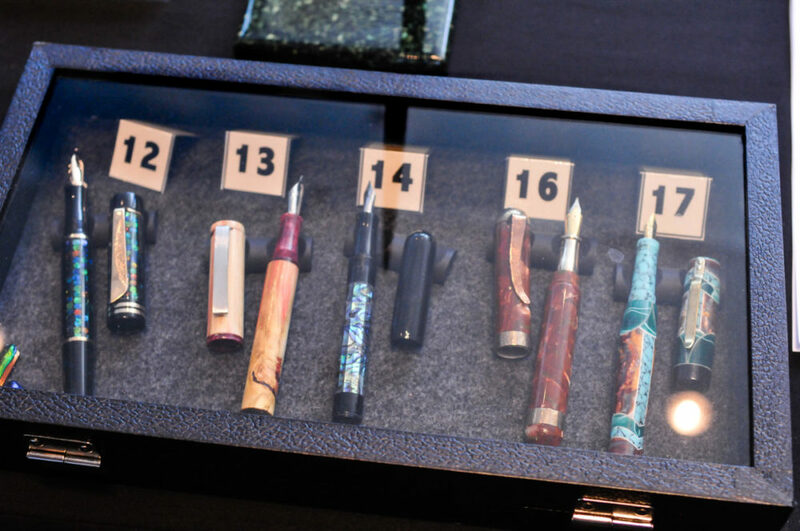 Show attendees had the chance to vote for the pen they like. 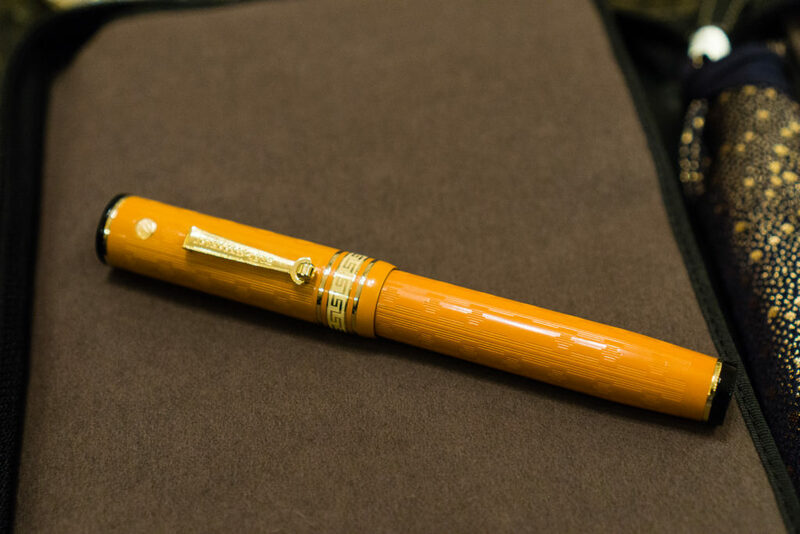 And The People’s Choice Award went to pen number 11, by Jonathon Brooks of the Carolina Pen Company. 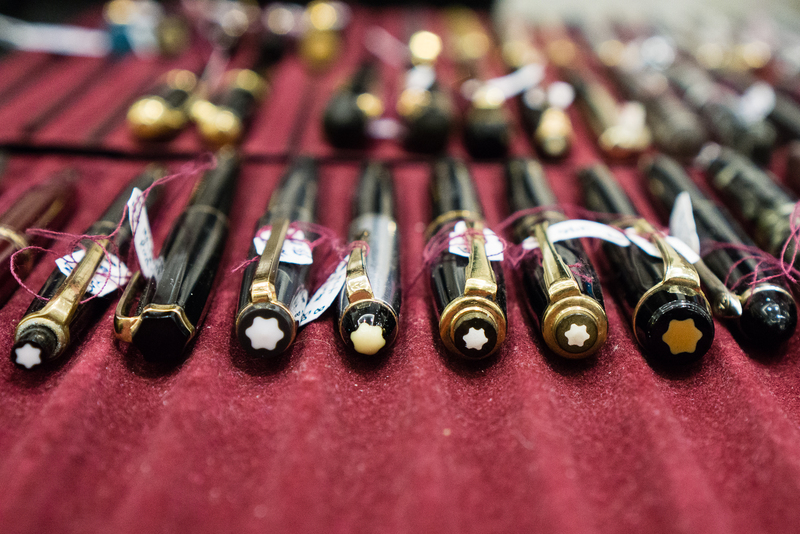 Photos of the guild pens are courtesy of Ricky Chau. At 10:00am. the General Public was let in to the show and it definitely got busier. Here are Ricky Chau’s photos of the ballroom around that time. Getting crowded. John Strother assisting a customer at his table. 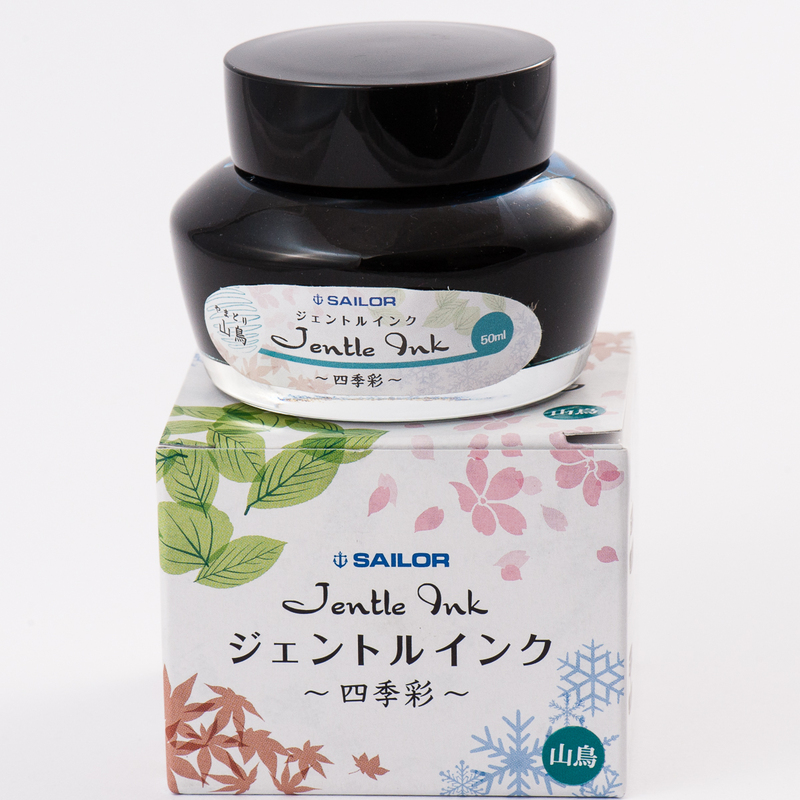 Sailor’s table was selling their inks. The Montblanc table was marked by Wolverine, errr Hugh Jackman’s photo. Dale Beebe and John Martinson in the foreground, Vanness Pens table is busy in the back left. Do you see Matt’s colorful fishing vest? 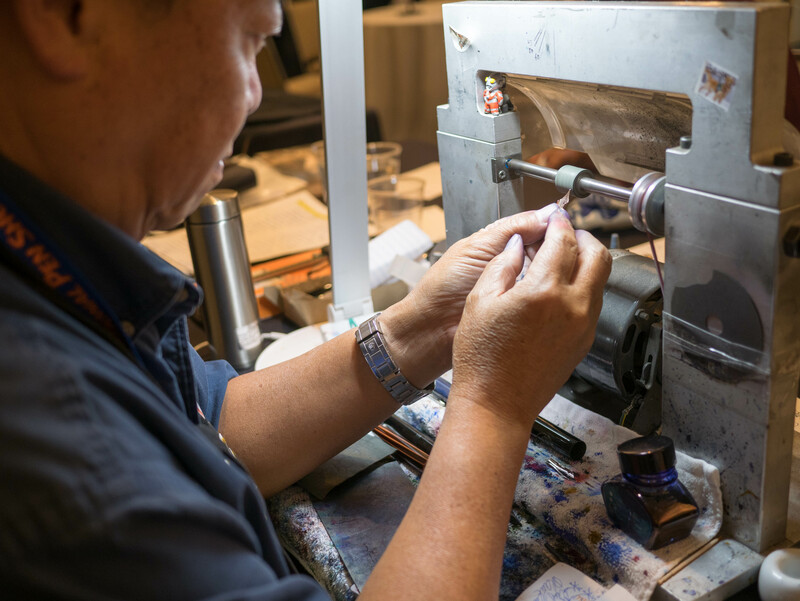 Amidst the busy ballroom, some calm was found by people at the ink testing station table. 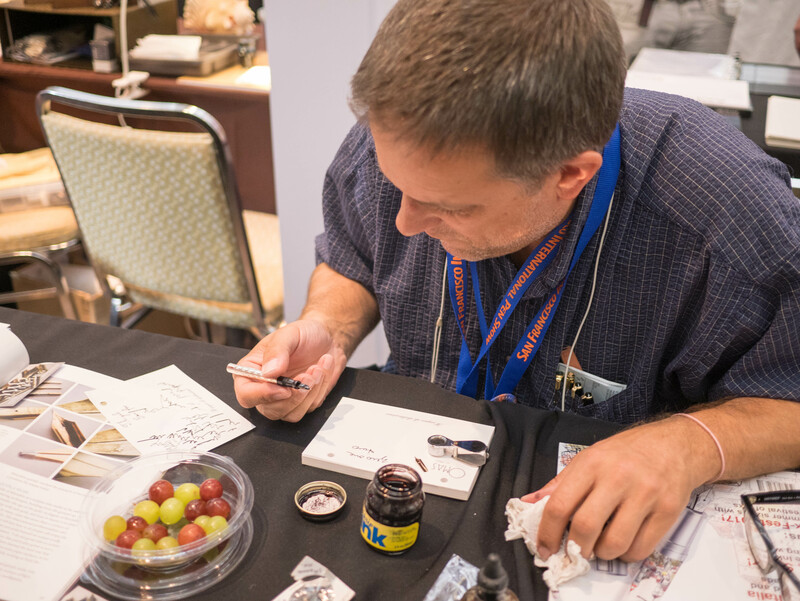 Jim Rouse setting up nibs for a customer at at the ever popular Franklin-Christoph table. Lisa Anderson helping out a customer at the Anderson Alley. 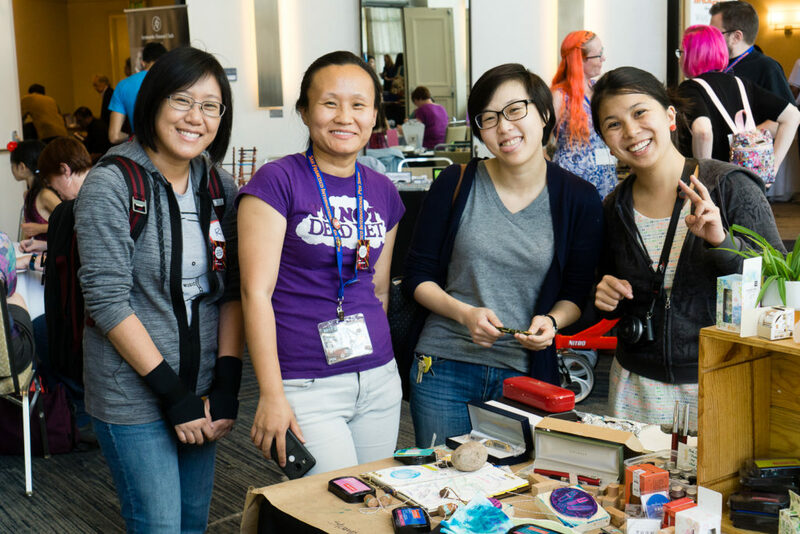 What is the Pay-It-Forward table you ask? 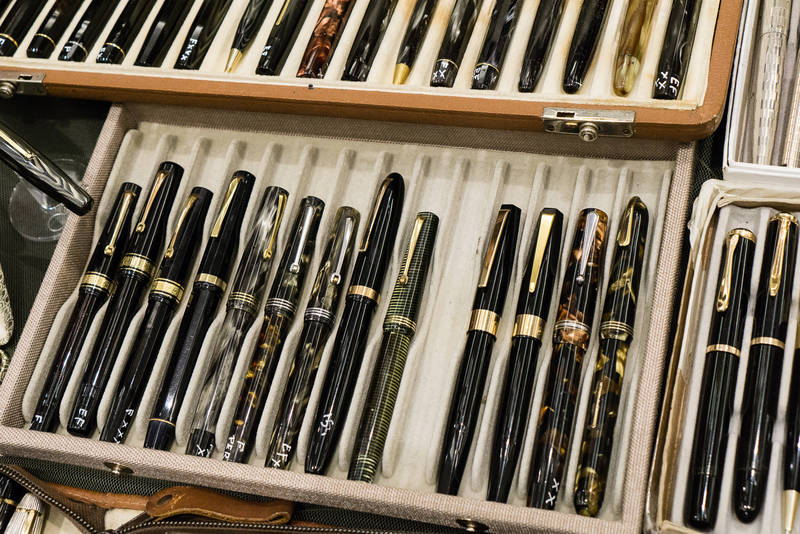 Well, it is a table at a pen show fully motivated by kindness, happiness, and a great love for writing instruments. 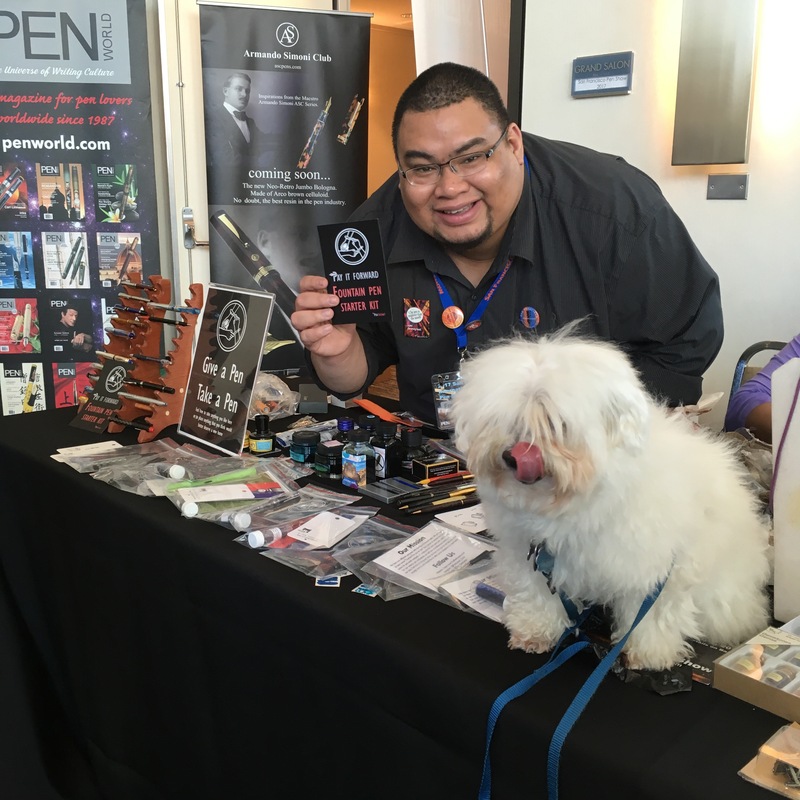 The PIF table was originated by Oscar, The PENthusiast, and a smattering of other generous pen folk at the 2017 DC Pen Show. If I am not mistaken, this idea was inspired as well by Rachel Goulet of The Goulet Pen Company. 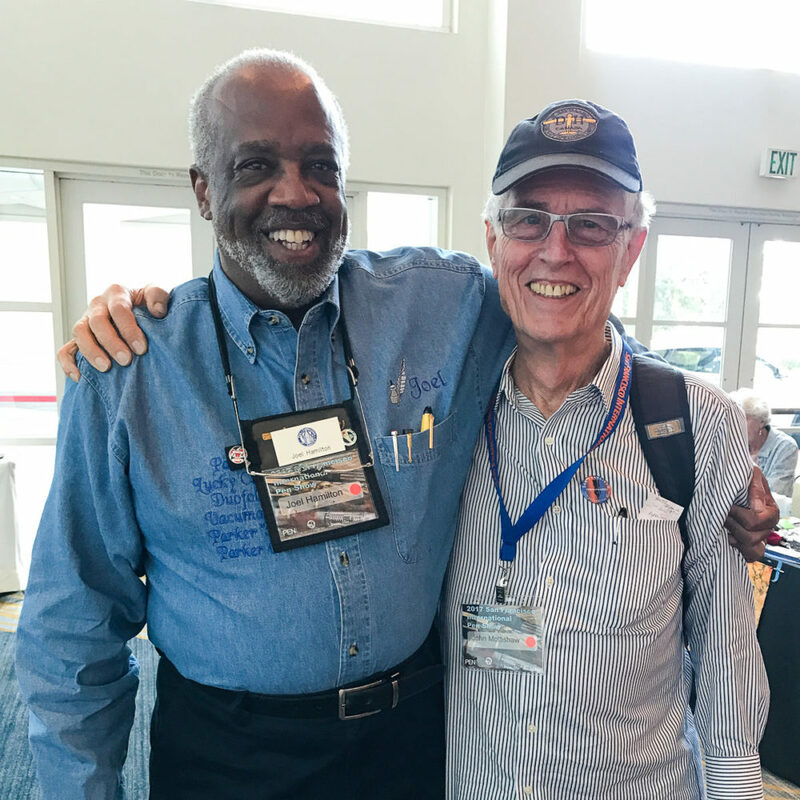 The PIF mission at pen shows is twofold. 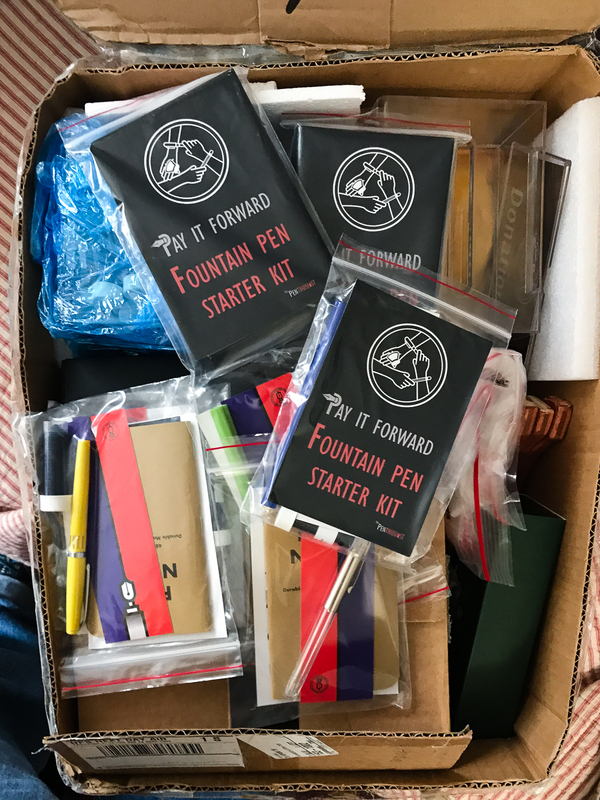 First is to create and give out Fountain Pen Starter kits to newbies young and old. 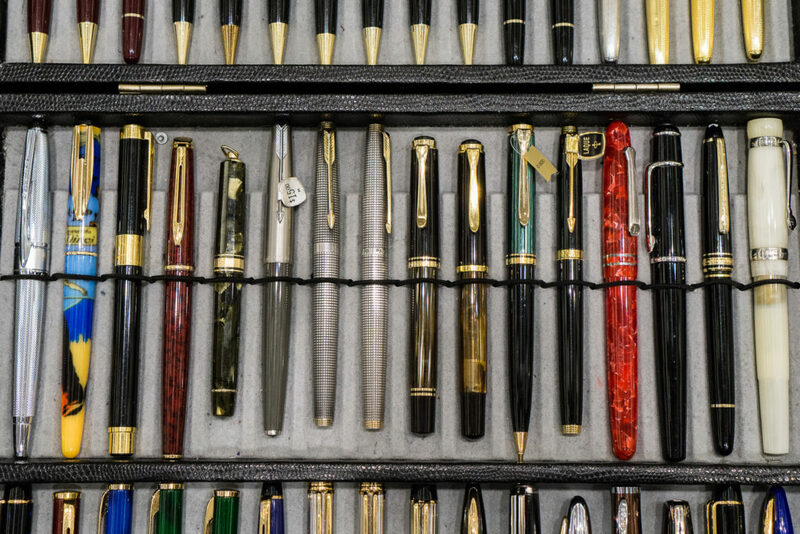 Second is to provide an avenue for experienced pen people to donate items that are no longer loved, and to give these items a second chance to be loved by another home. Items encouraged to be donated are pens, ink bottles, notebooks, and other stationery related things. 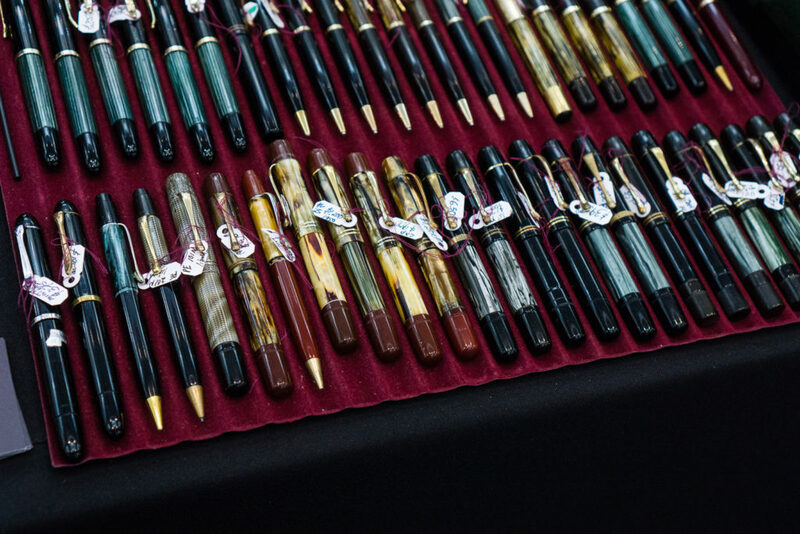 Monetary donations are also welcome either at the pen show or the PENthusiast’s website. Right before the 2017 D.C. 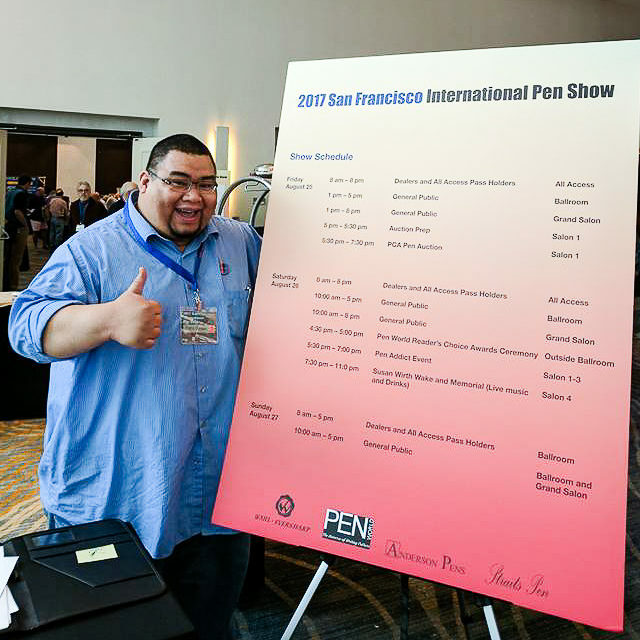 Pen Show, I reached out to Oscar to come to SF with the PIF table. But due to schedule issues he couldn’t make it. He did send a box full of PIF supplies for us to host at the show. 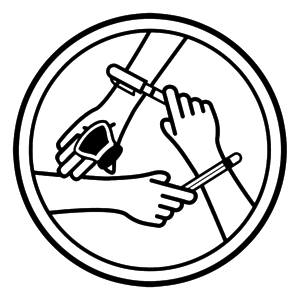 We then put a call out on a blog post, and at the SF Bay Pen Posse group to ask for donations at the show. Let me tell you, a lot of people have come up to me and donated new pens, used pens, mostly full ink bottles, notebooks, and other items. 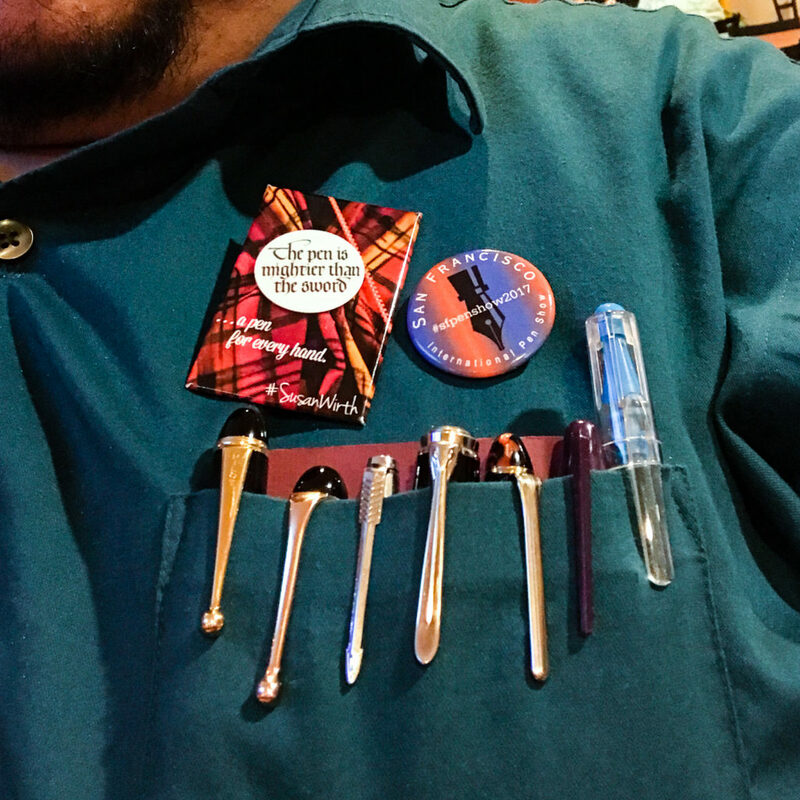 Since Thursday night I’ve had items given to me for the table and I am floored with the generosity of the pen community. I decided to have the PIF table up by noon on Saturday and Sunday at the show. The table was located right before the ballroom so a lot of people stopped by, asked questions, and eventually left happy. 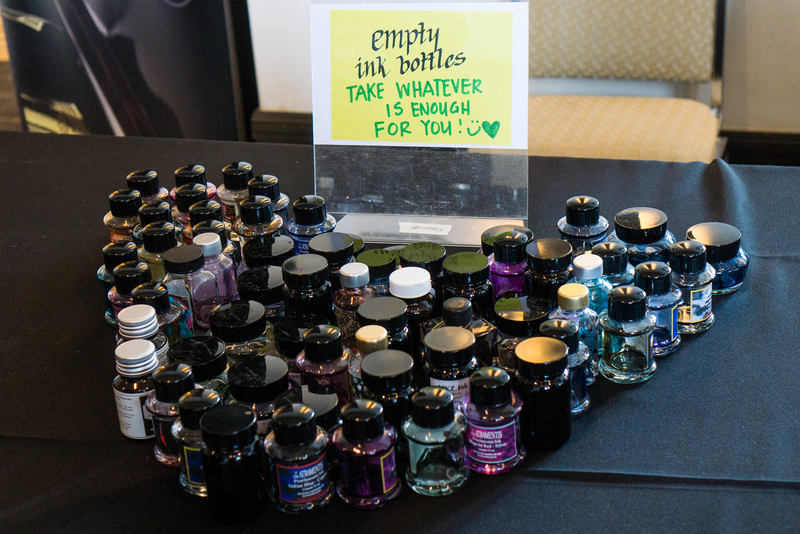 Because of all the pens and inks given at the table, we didn’t really use all of the supplies that Oscar sent. 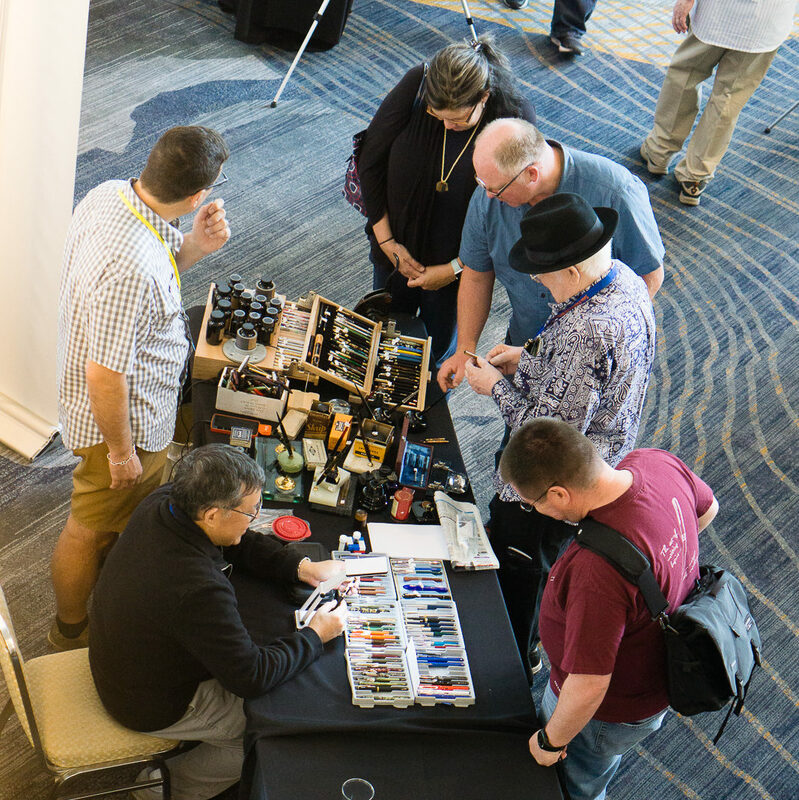 Which is great because the next planned pen show appearance of the PIF table will be at the Colorado Pen show in October. I did make a big blunder that I should be burned at the stakes for. Out of all the excitement and busy-ness, I did not write down the names of the people who donated items during the show. I do remember and know a lot of the people who donated but at the risk of forgetting anyone, I shall just say a big… THANK YOU FOR YOUR GENEROSITY! You all know who you are and your kindness is deeply appreciated. 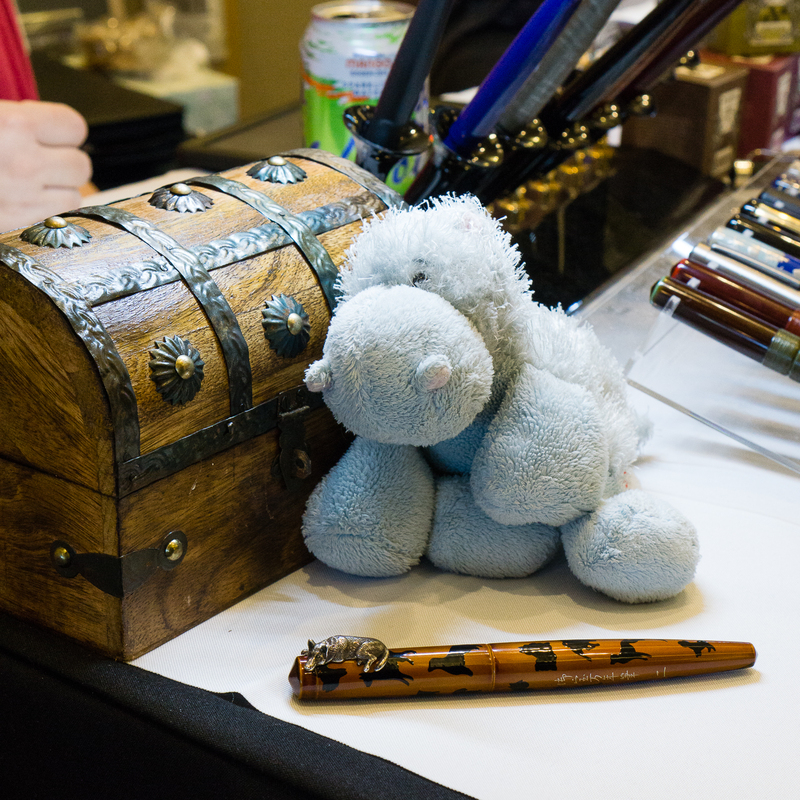 During both days, a lot of people asked about the Give A Pen, Take A Pen racks. I explained that it doesn’t have to be exactly give and then take. 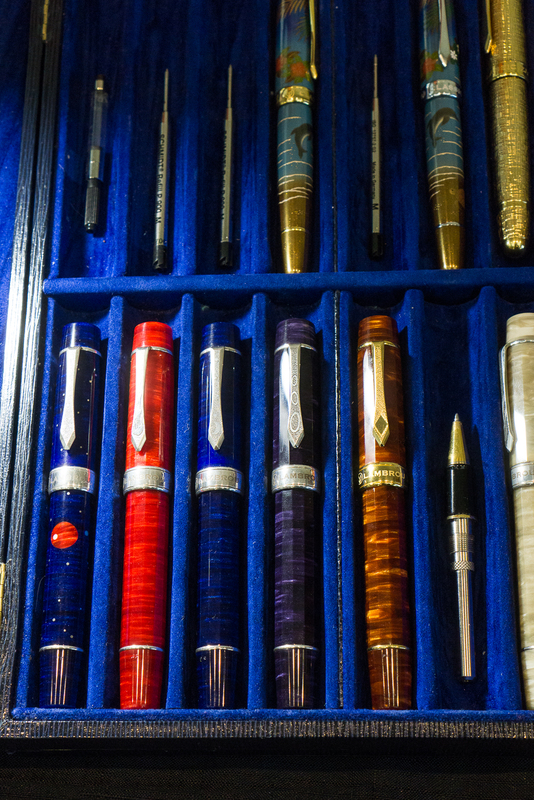 If there was a pen (or two) that they would like to have, they may just take it. Now if they have a pen that they don’t love anymore, they may just leave (give) it on the rack for someone else to possibly love it as well! Another one. An awesome person was looking at the Give A Pen, Take A Pen and placed this beautiful pen on the rack. 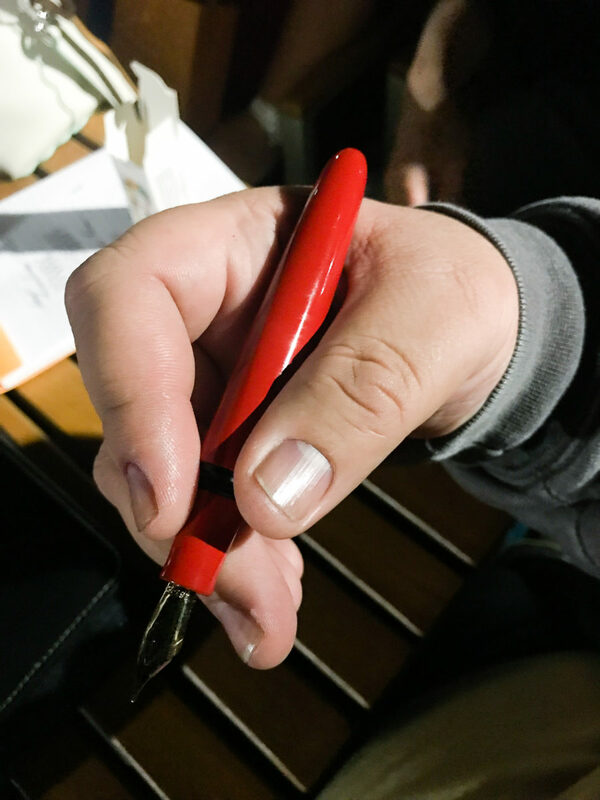 He made the pen himself and wanted to donate it. I’m glad I got to take a photo of it because someone had taken the pen not even five minutes after. To the awesome gentleman who left this pen and if you are reading this, please let me know your name for I missed it during the show. On Sunday morning, Lisa and Mike Vanness came up to me and asked where the Pay-It-Forward table was. They had a crate full of empty ink bottles that they’d like to donate. I told them it’s not set up yet but we can definitely place them at the table for people to take. Et voila! Thank you! Bottle organization, and Signage courtesy of Christina. Thank you! In the photo below, the gentleman on my right is Mr. Ron L. and the lady behind him is his daughter. 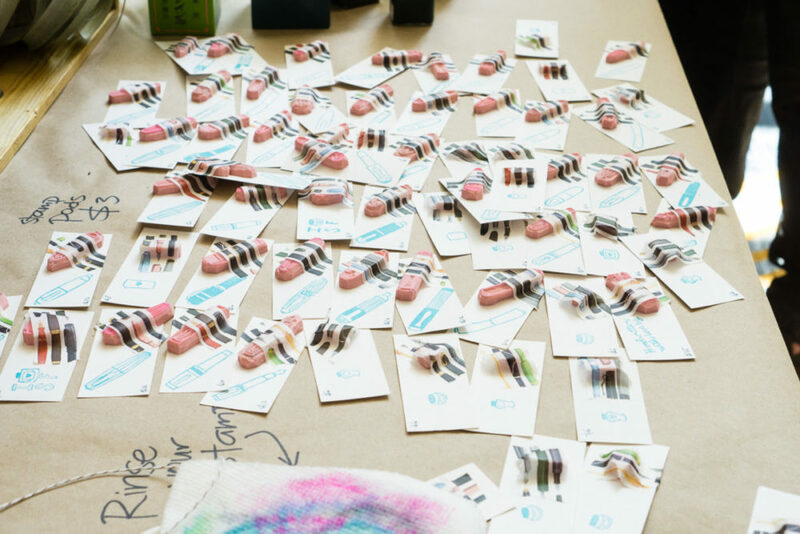 They helped sort out the donated pens and placed them in the starter kits with ink samples as well. 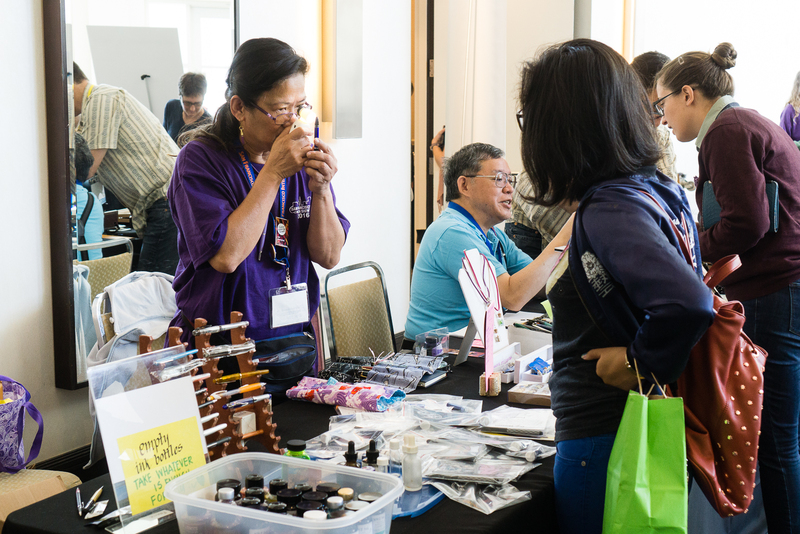 Their efforts truly helped us out at the PIF table and made it possible to provide more kits to people on Saturday and Sunday. Thank you Ron! 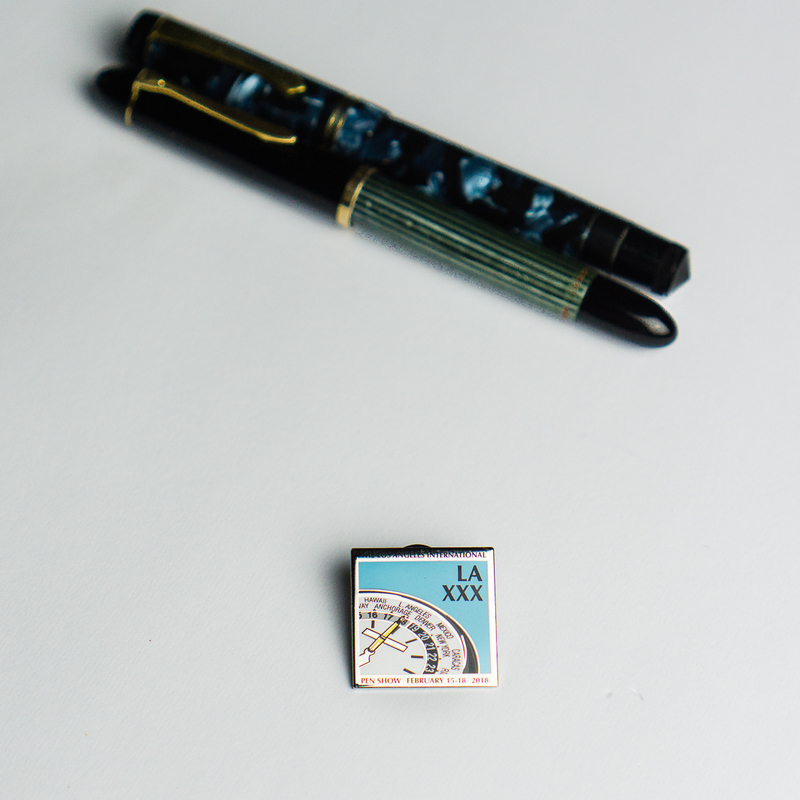 You are a gem for the pen posse, the pen world, and to myself. Photo courtesy of Christina L.
I also would like to give special thanks to another person who helped out at the PIF table. None other than my mother, Edna or as she placed on her name badge, “Franz’s Mom”. She helped me out at the table on both Saturday, and Sunday. She was such a pro talking to the newbies at the show. 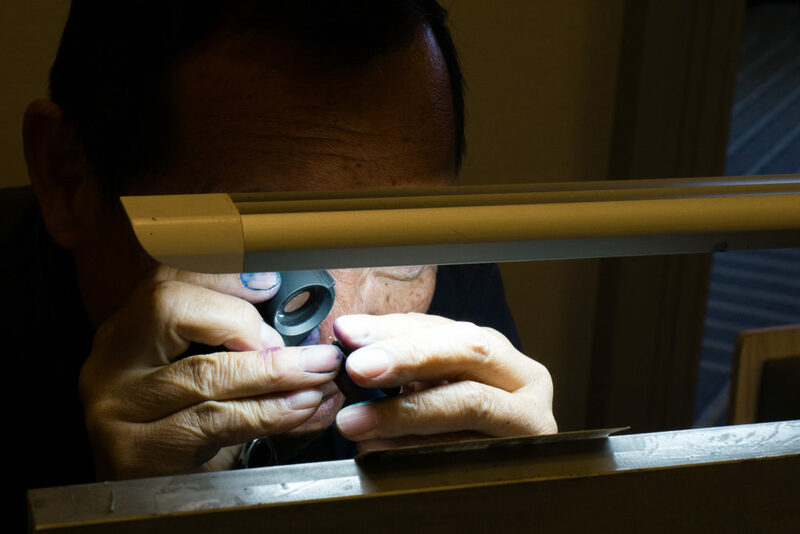 Here she was on Sunday checking out at a nib with her loupe. 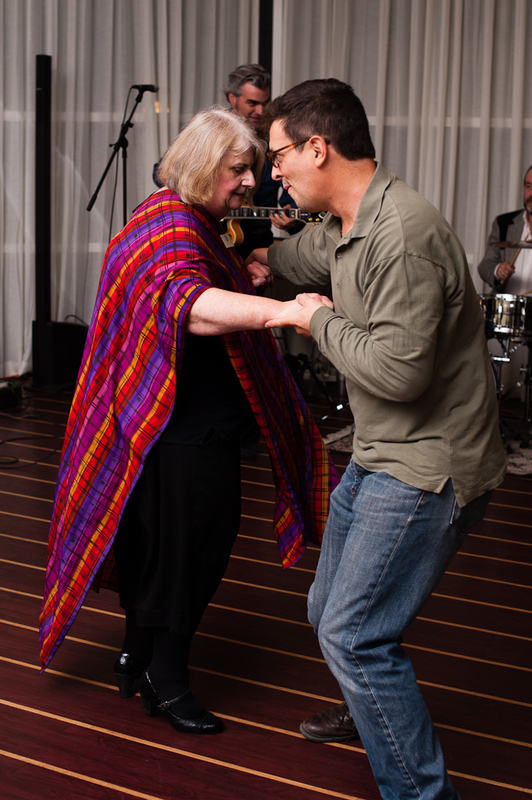 Edna getting “loupe-y” for a newbie at the PIF table. She was rockin her purple SF Pen Show shirt from last year as well! This Pay-It-Forward initiative by Oscar and company was such a great idea and I am glad to provide help as well. 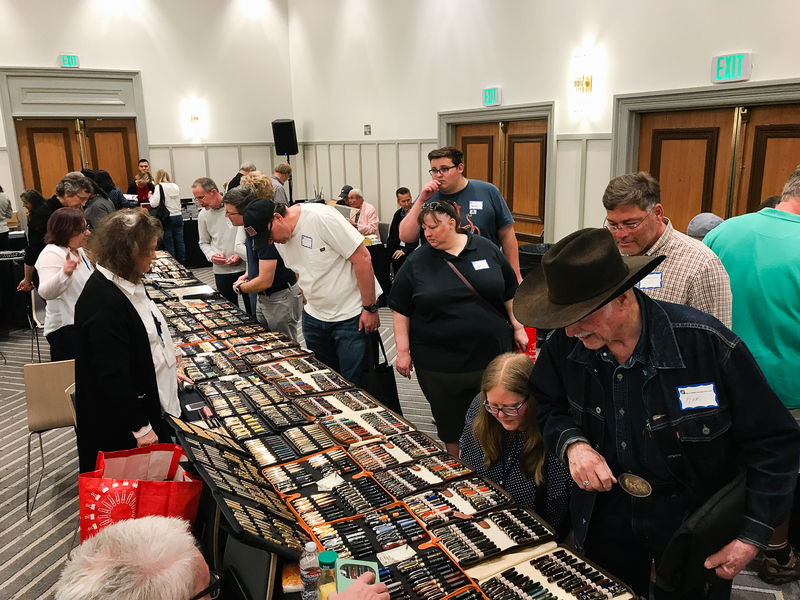 The PIF table was such a success at the show and we are planning on how to make it a much better experience for show attendees next year at the SF Pen Show. With that, thank you for reading this far and I hope you are enjoying it! 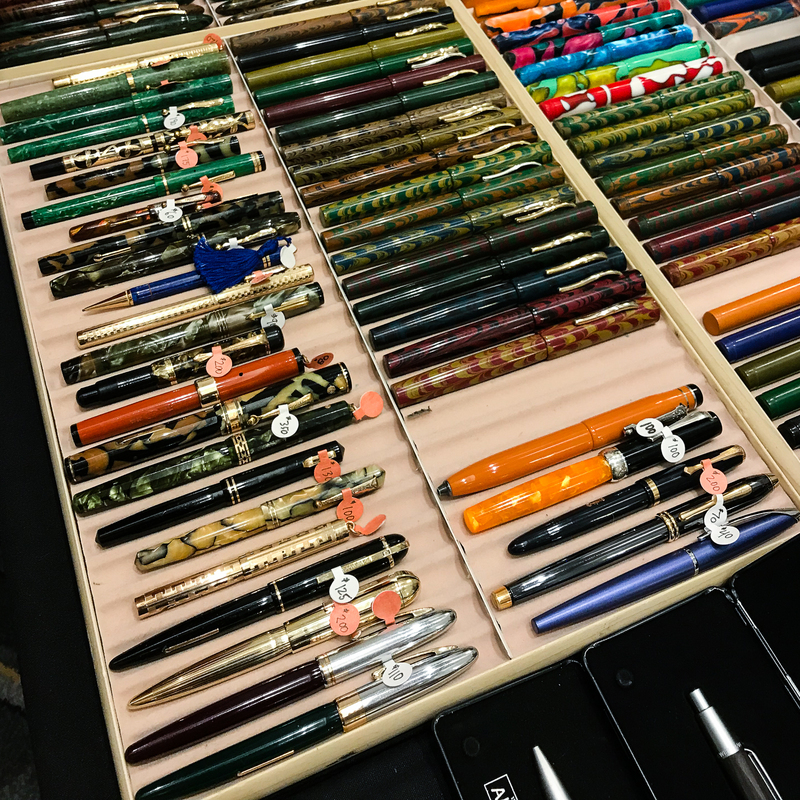 The report for the rest of Saturday, and Sunday pen show will be published on Friday, September 15, 2017 and will be found on SF Pen Show Report Part 2. 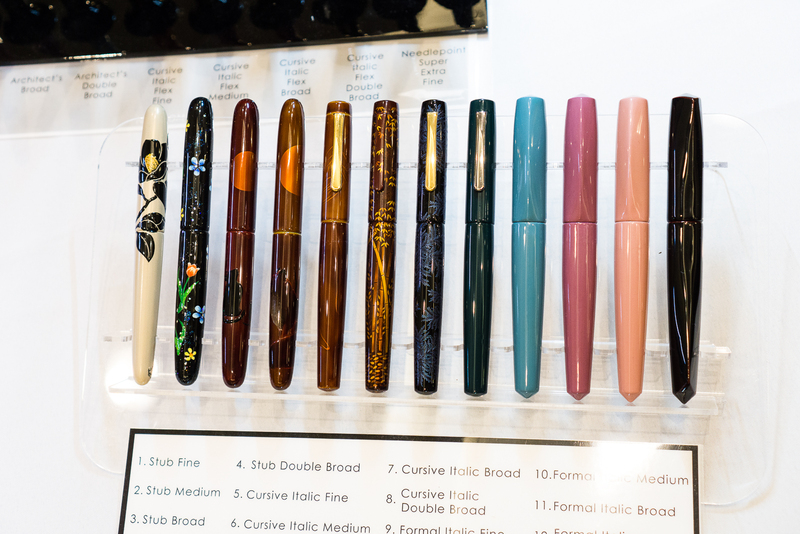 The San Francisco Pen Show took place from August 25-27. This is the second in a series of recaps. Check out one from my dog’s POV here. It’s a little funny to go back and see what I thought I wanted to buy as of last, last week… Allegedly an Aurora Novum, but I saw zero of those at the show. Oh well! 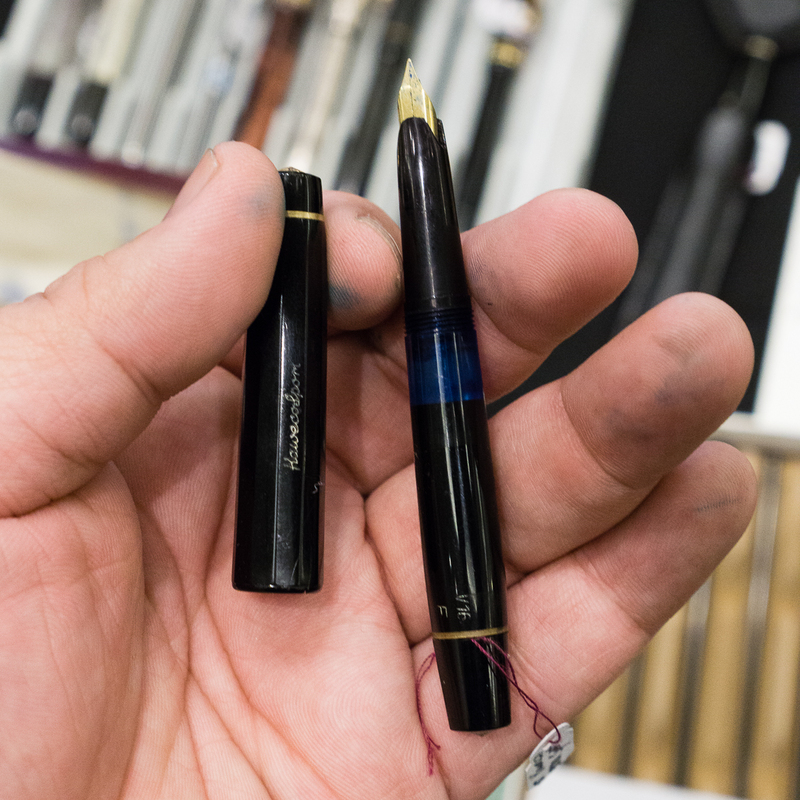 The Omas Arco materials have long been on my wishlist — last year at the show I asked around, but ultimately everything was out of my budget. 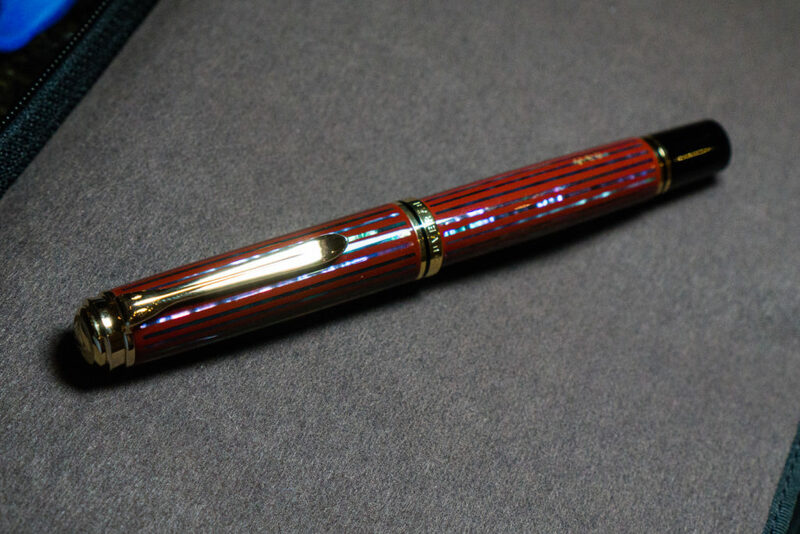 This year, I found this one at Peyton Street Pens within the first hour or two of the show at a competitive price (and for reference, my budget for an Arco pen wasn’t significantly higher this year than last!). Teri was kind enough to hold it for me while I agonized over the price and dragged various friends back to her table to see it. In the end, I decided I’d regret not jumping on it… and I’m glad I didn’t, it’s a joy to use and to look at. Above are another two pens I picked up on Friday, both from friends. 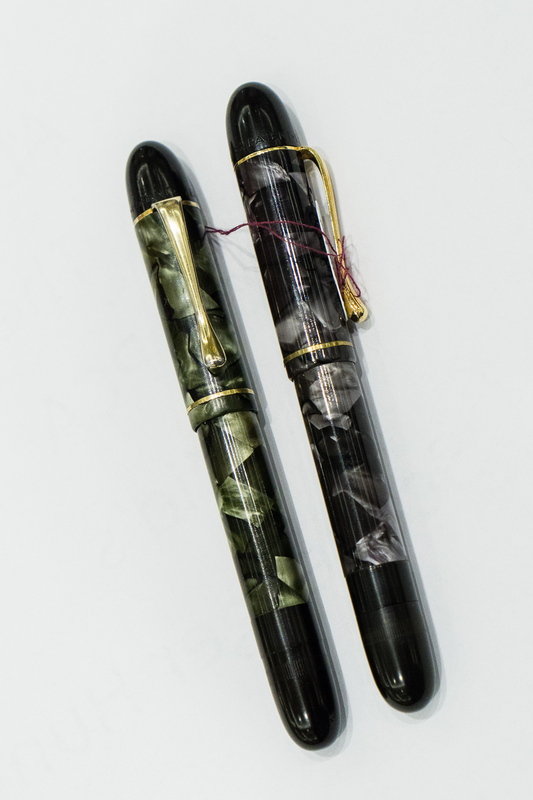 The back pen is from Leigh Reyes, a glass-nibbed Spors pen from wartime Japan. Yep, that crazy material is vintage. 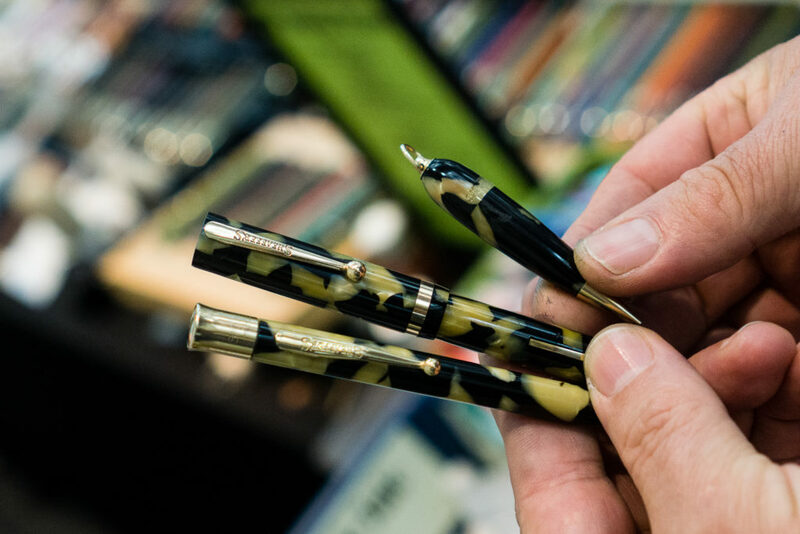 The front pen is a E Faber “Permapoint”, from a fellow SF Pen Posse member and SF Show dealer, Gary Naka. 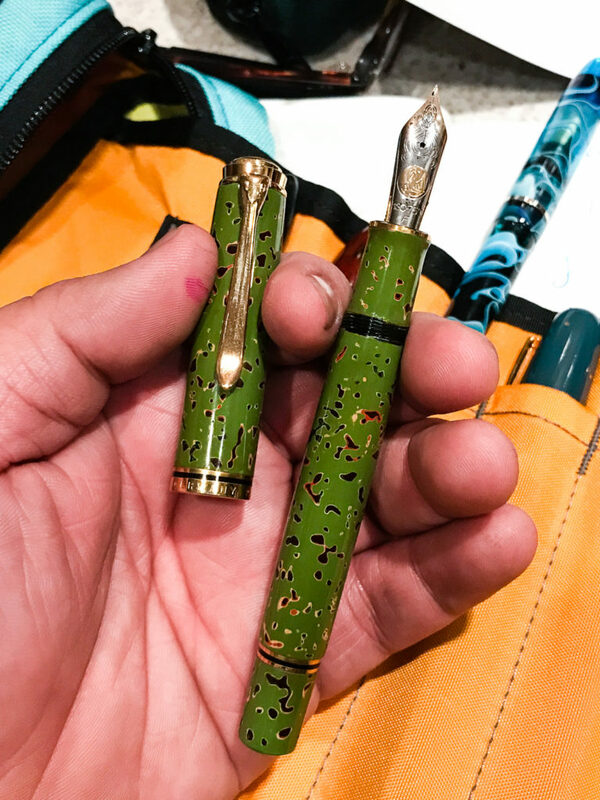 It’s a pen I’ve been eyeing for months, and he finally restored it and was willing to part with it — yay! I love the unique finishes on both pens, vintage pens are so cool. I also had the brown pen ground to a fine CI by Dan Smith, so in addition to being cool looking, it’s quite fun to write with. 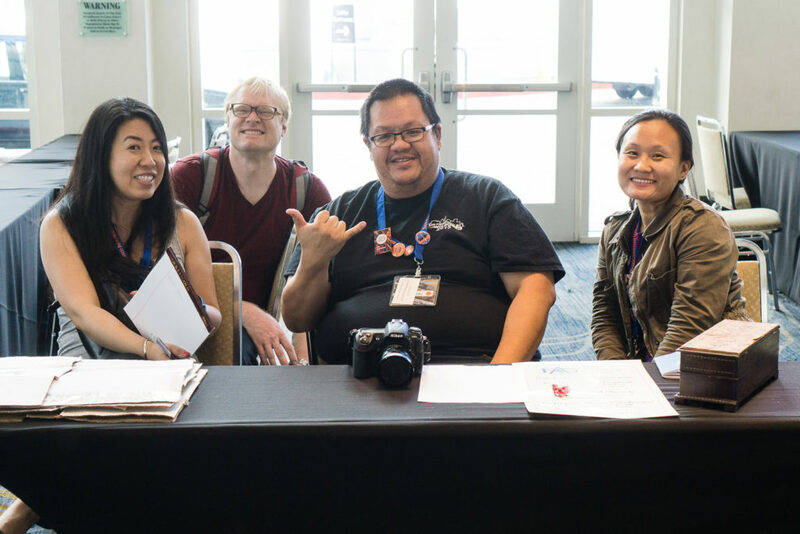 This show was also the first time I worked one-on-one with a nibmeister, and I was lucky enough to work with both Dan Smith (above) and Mike Masuyama (below). They have very different styles of working (see their different set ups), but both produced great nibs for me! 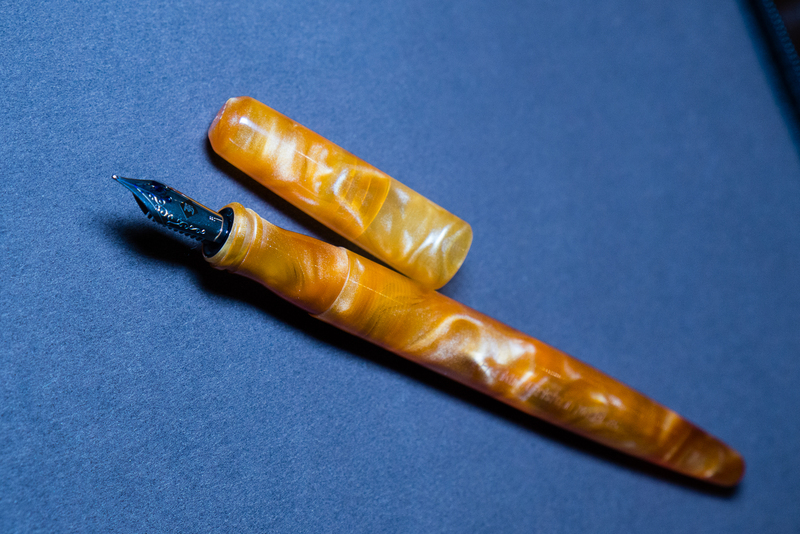 The grind I was most nervous about and most excited about was a formal italic on my Nakaya Decapod Twist, medium nib. I tried a friend’s formal italic several months ago and loved it — but they are notoriously sharp, and most people were surprised I wanted one, including Masuyama himself. I’ve had a few days with the nib now, and I really enjoy writing with it. Yes, it’s sharp — but I haven’t caught paper with it and writing with it feels… like it will keep me awake? I don’t know how to describe it, but it’s fantastic. 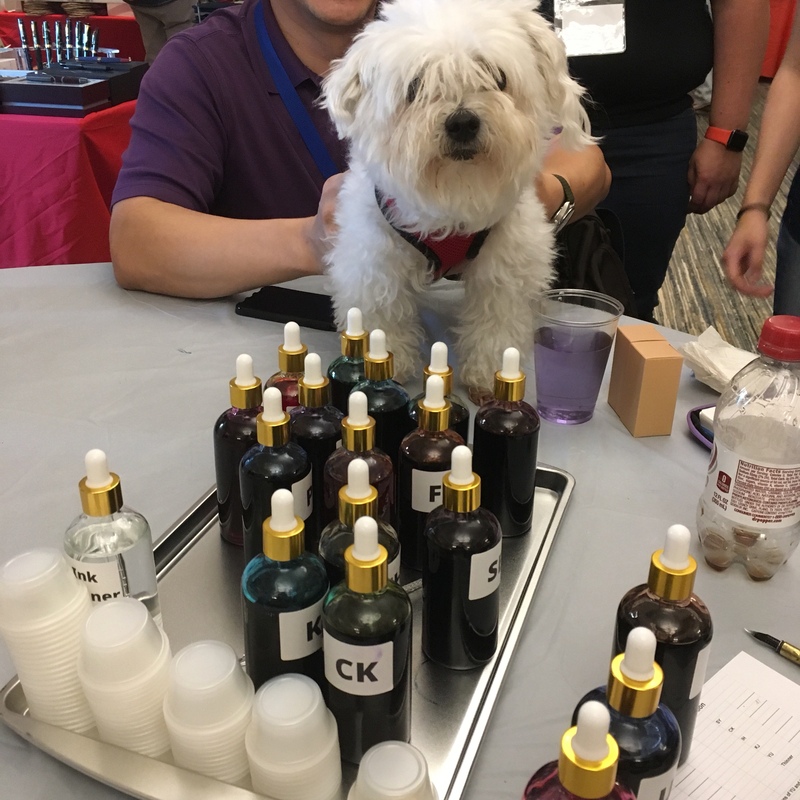 This year the show featured some new inks in the ink testing stations, and even a new model of ink testing stations for shimmer inks (though I failed to capture a picture). 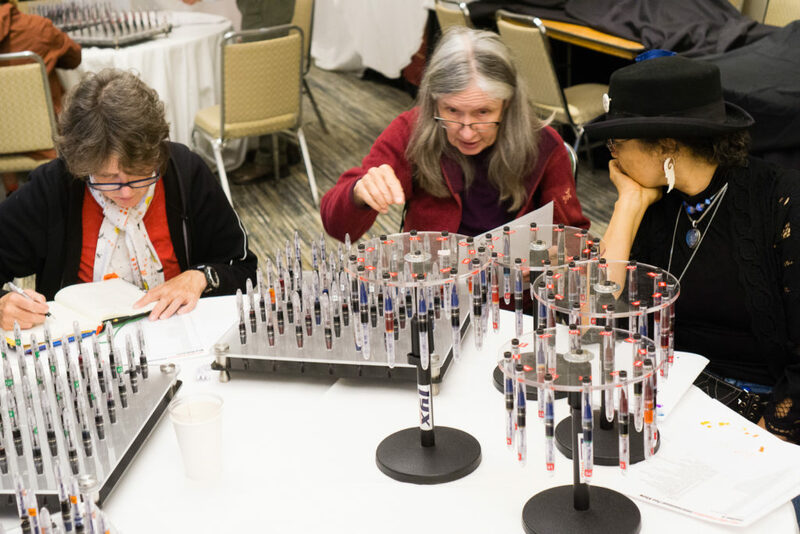 I didn’t spend much time with the ink testing stations this year, but they were consistently quite popular! Loot and new shiny pens aside, the show has always been a place for friends new and old to connect and discuss a shared passion. 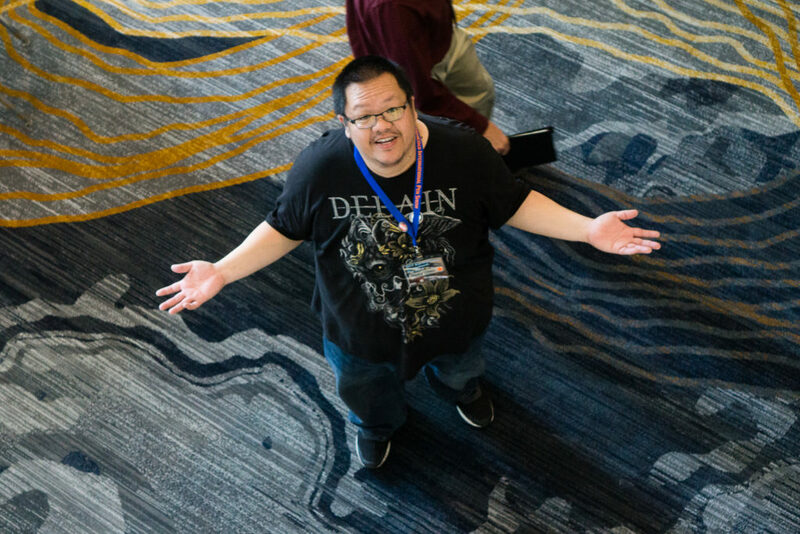 This year I met many people I’d talked to online for the first time, which is always a little strange for me (I’m kind of awkward :P) but was overall a great experience. 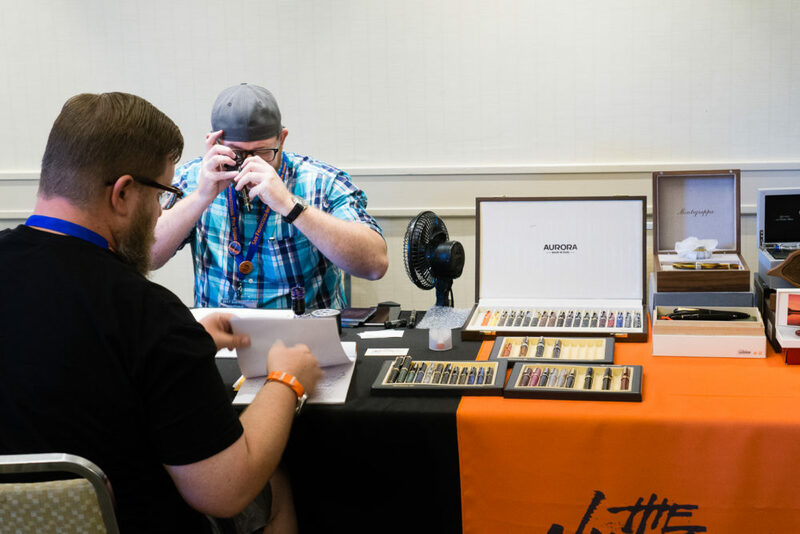 I also like to think I did a good job of introducing folks to each other — in the picture above, Todd (one of the show organizers, a local Pen Posse regular, also known as farmboy on FPN) helps a friend replace a broken nib, on the spot, no tools needed other than a shred of paper towel. He’s super cool like that. 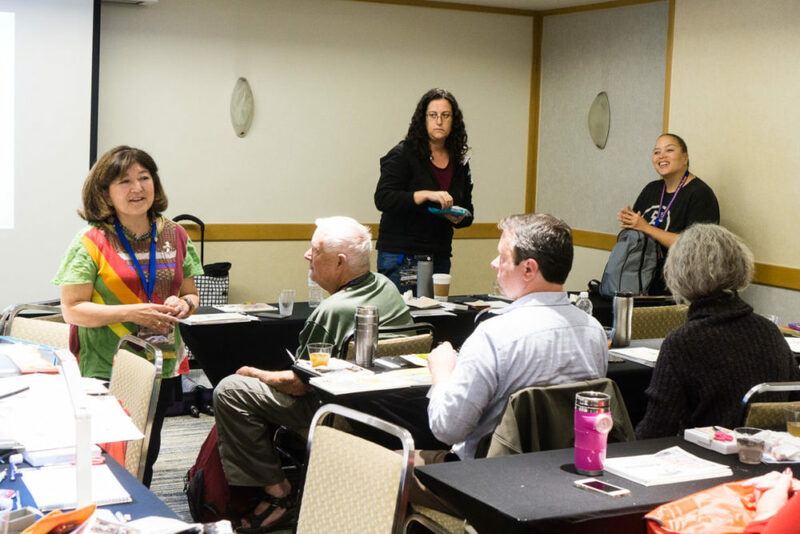 No show would be complete without classes, seminars and meet ups! 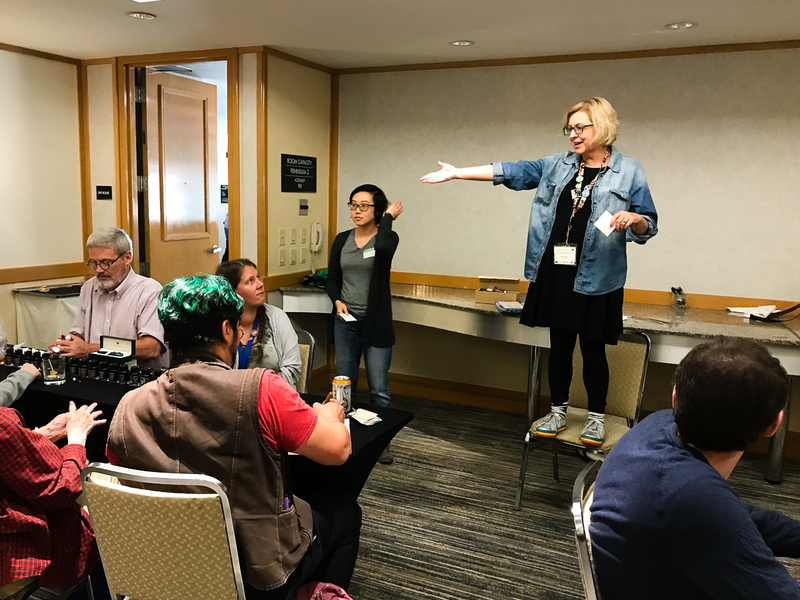 This year Pam and I hosted a repeat of the Planner Meet-up, which I thought went very well — we met ladies (why are there no men who show up?) 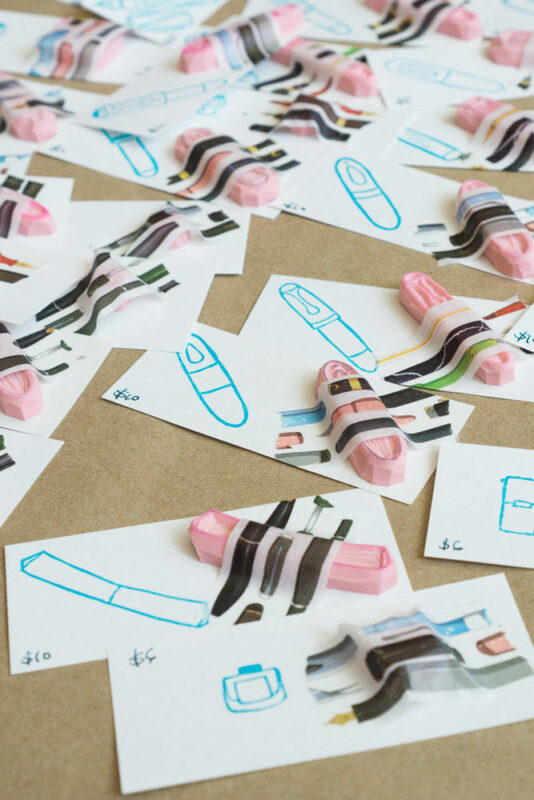 from around California and shared washi tape, planner layouts and took a look at different brands and designs. 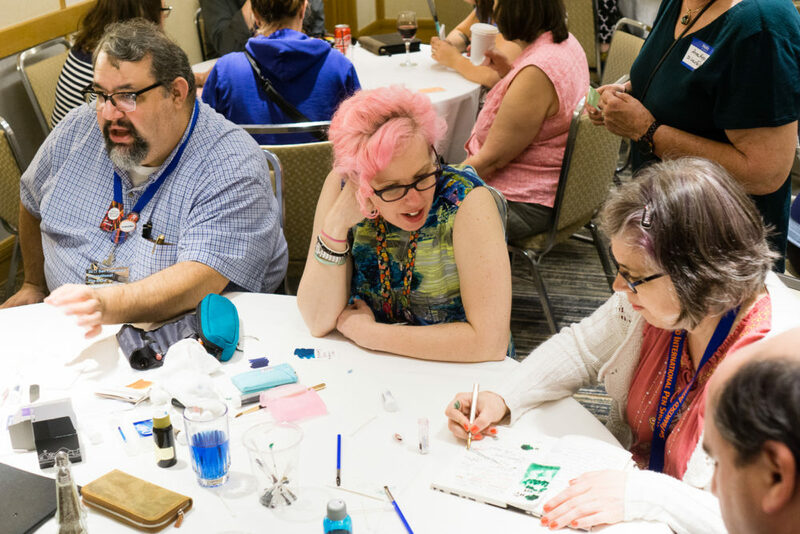 I also attended Leigh’s workshop on Creative Uses of Fountain Pen Ink (picture above) where she shared some of her tips and techniques for “making a mess” and getting artistic with materials one already has… not that I really needed more help making a giant mess. 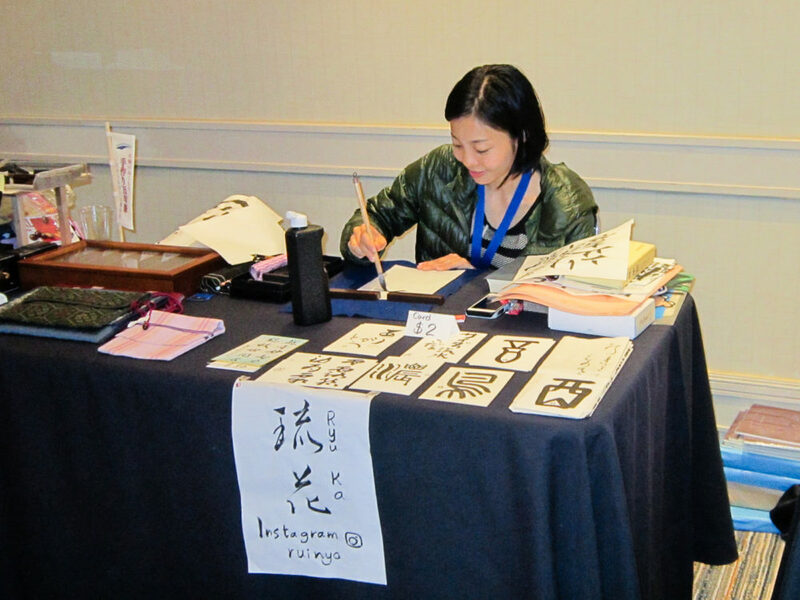 And lastly, I attended the Hanko Making class lead by Rui Saito, who wrote part of my Chinese name for me in her beautiful calligraphy. 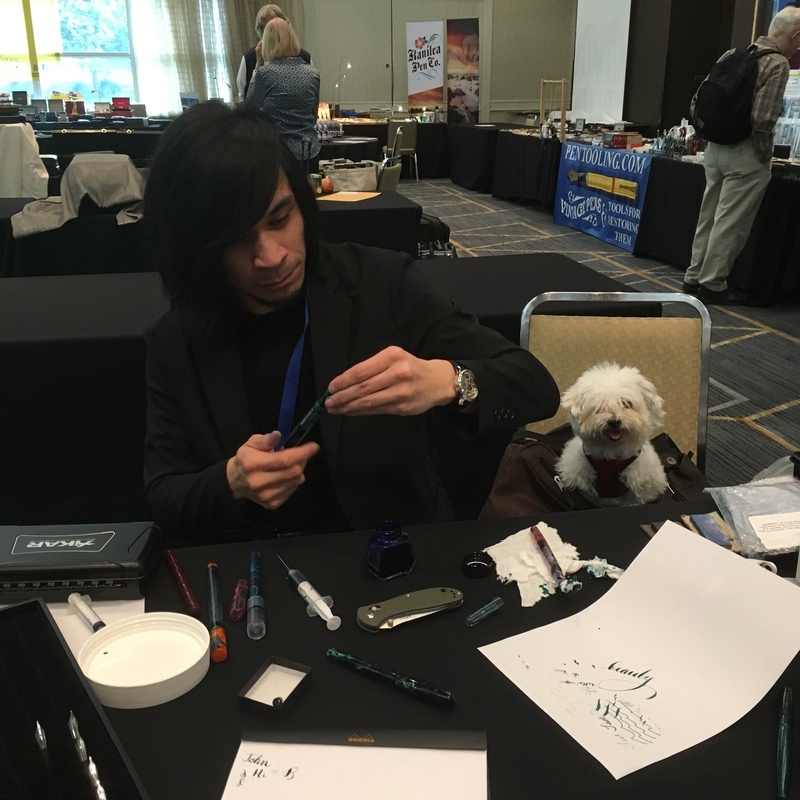 There will be many more pictures to come of the pens and inks I picked up, and maybe a little bit of house cleaning to help my wallet recover… But in the meantime, thank you so much to everyone who came to the show and said hi! And to those who I haven’t met, I hope to meet you at a future show! Sometimes I loathe to admit it, but this hobby is great because of the social aspect — sharing a love of shiny objects (and journaling, plannering and making ink blobs) while spending uncomfortable gobs of money. What else could a girl ask for? This post features Moogle as a guest poster. 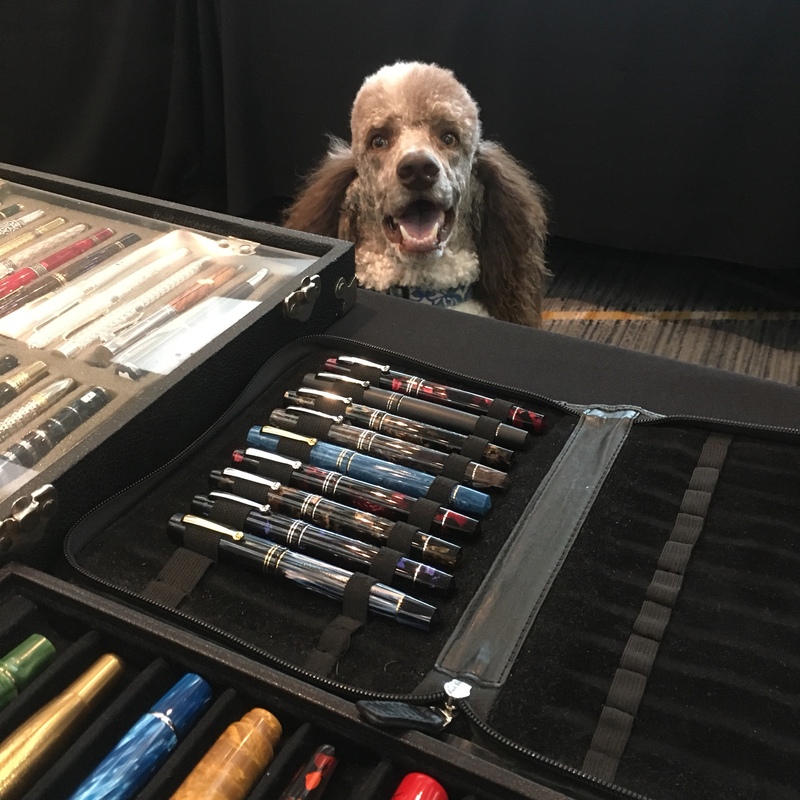 He was excited to make it to another pen event, so he joined us at the San Francisco Pen Show on Saturday! 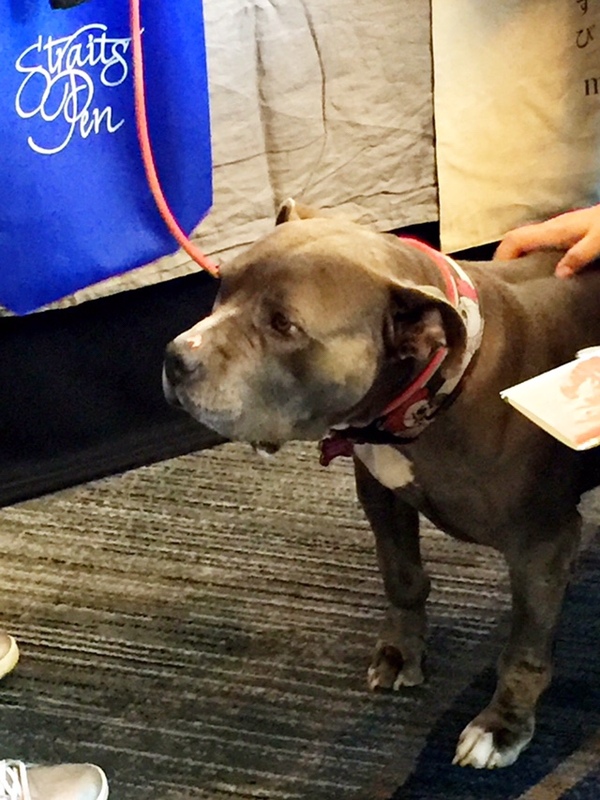 Both the show and the hotel, the Pullman are dog friendly. I started the day out keeping an eye on my human’s table. 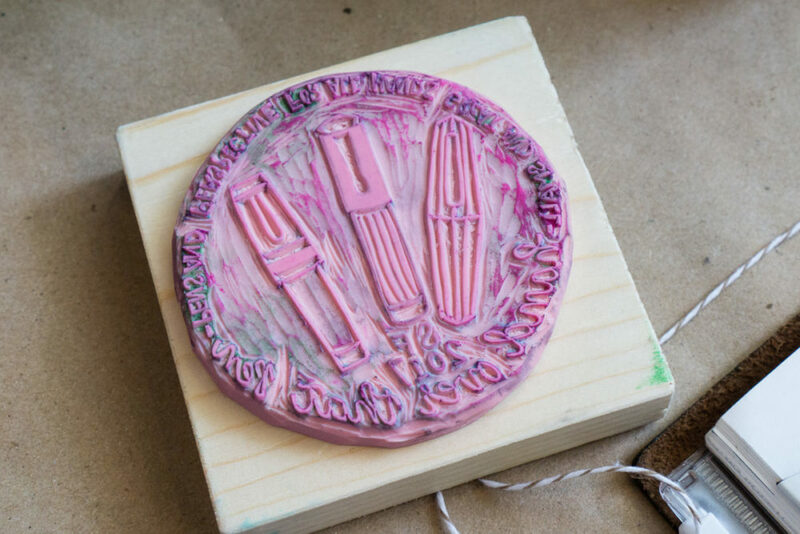 She was selling hand carved stamps and washi tape. Neither tasted good. Eventually I gave up and just went to sleep behind her table. I got to meet a lot of new people! 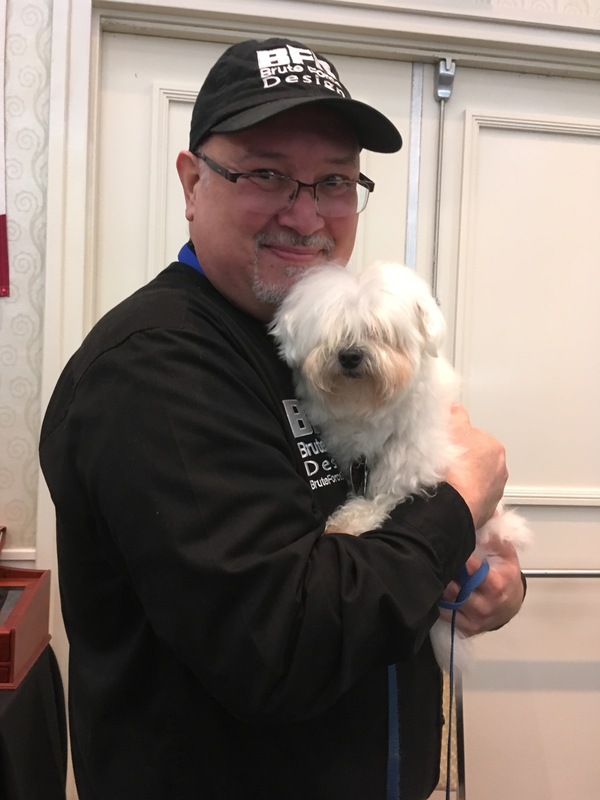 They all wanted to pet me — the pen show should be renamed “Moogle’s Spa Day”! 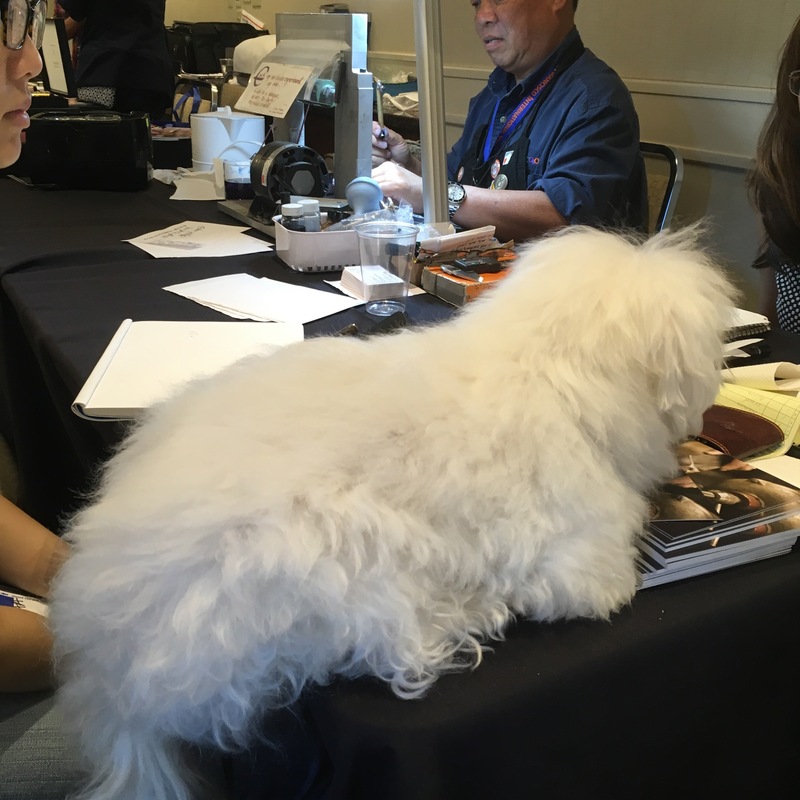 Below was me being a dog loaf on Mike Masuyama‘s table while Pam (left) was hanging out. Masuyama-san and his wife told me all about their dog! Maybe I’ll meet it one day. I also spent a couple hours at the front desk. 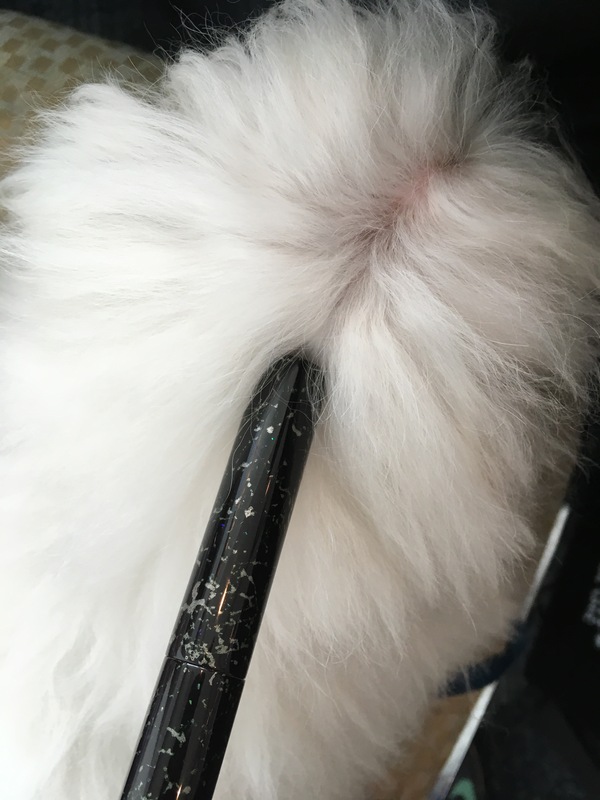 Next year I think I’ll set myself up — “Pet me to relieve stress from blowing through your pen budget!” One of my human’s friends bought a cool urushi and raden pen from the Carolina Pen Company… here it is on my head. And here I am with Franz at the Pay It Forward table! We were giving away starter kits and assorted items people had dropped off. Unfortunately, no dog treats. Did I mention I got lots of petting and cuddling? Here’s Troy from Brute Force Designs carrying me! 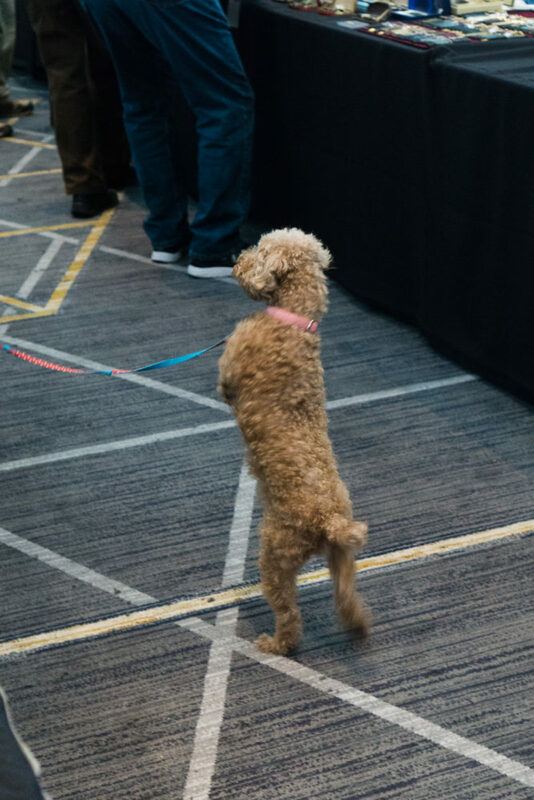 I didn’t get any pens (my human doesn’t give me an allowance…) but I had a great time meeting people, being pet and sniffing the carpet for dropped food. I’m looking forward to 2018!